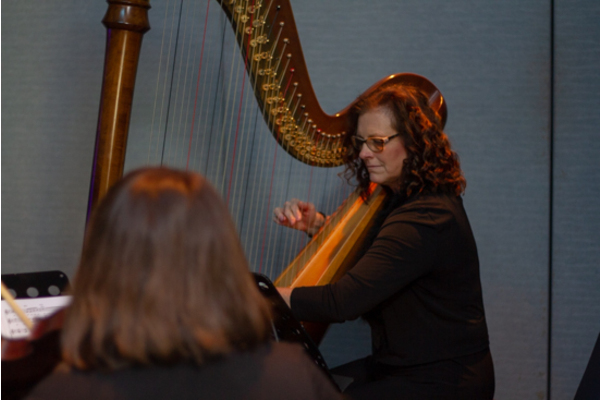 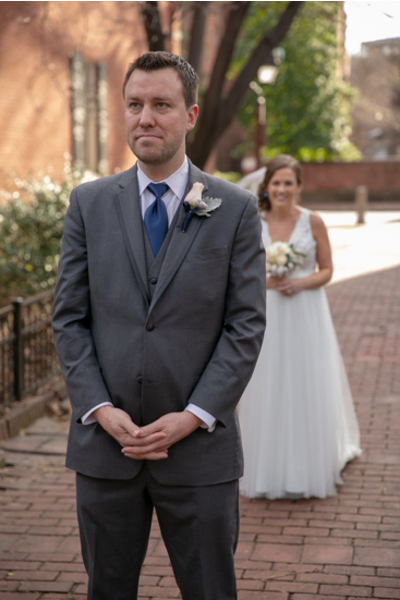 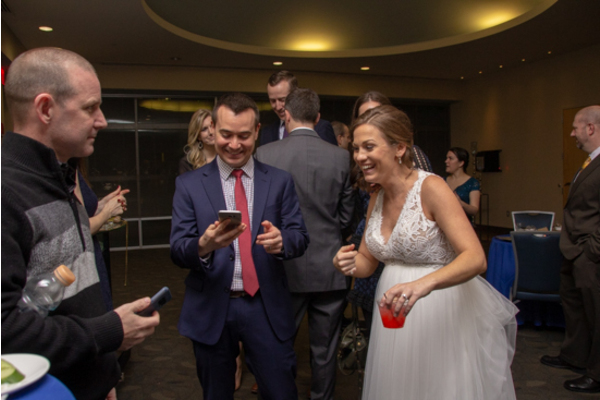 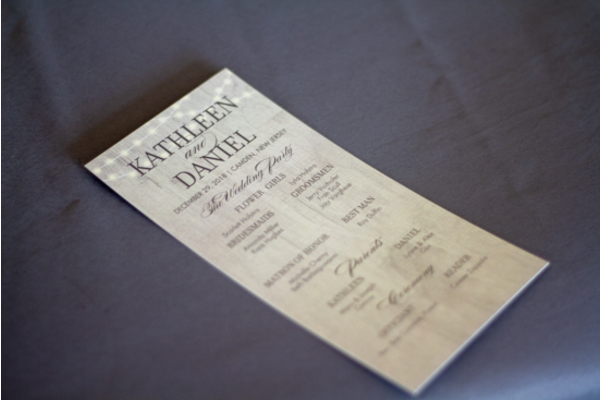 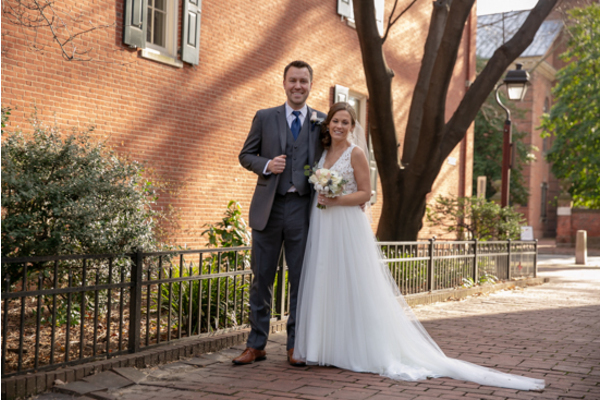 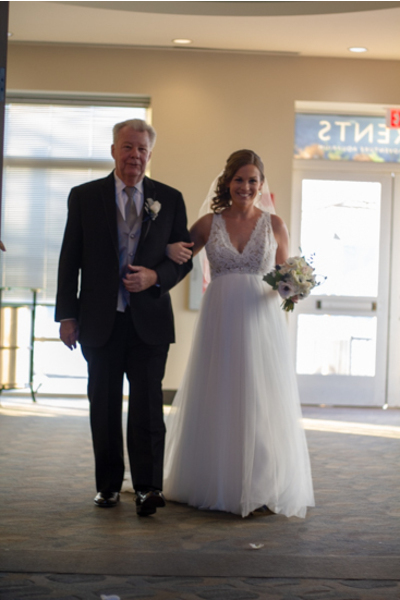 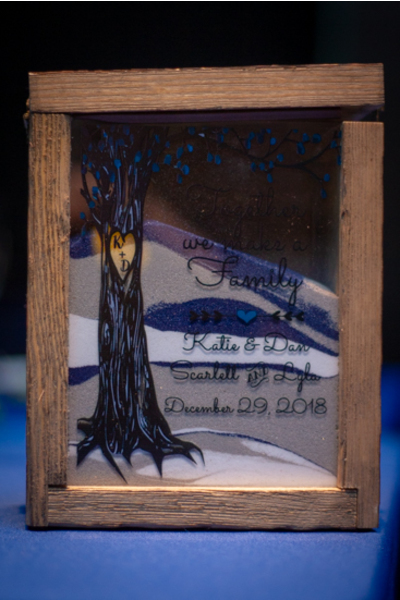 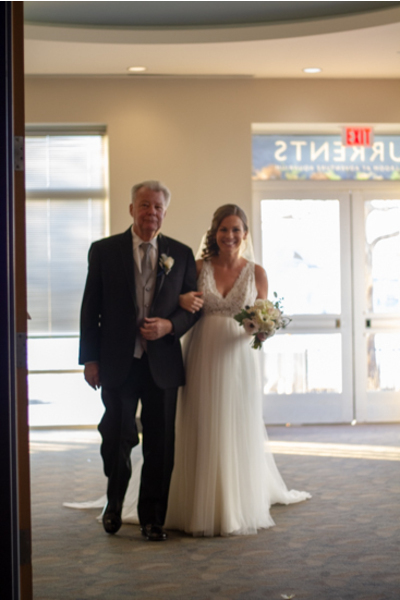 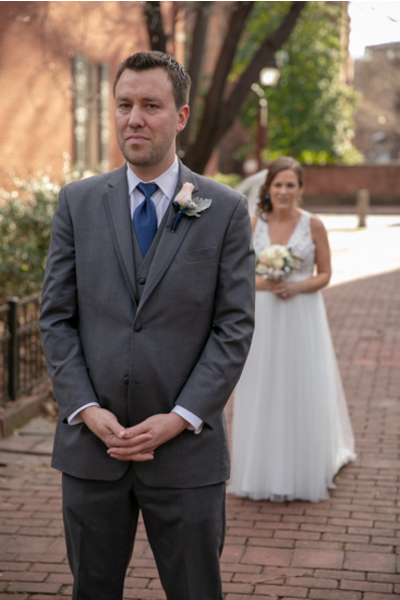 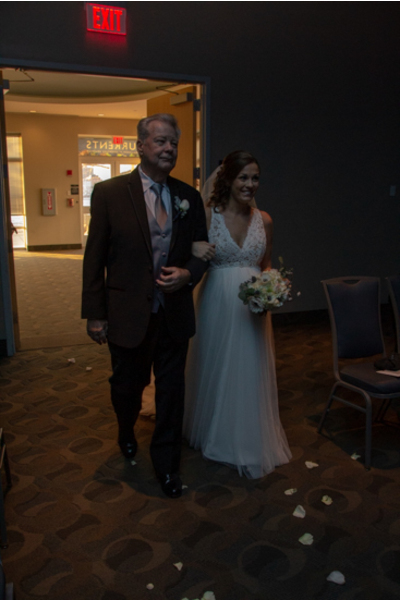 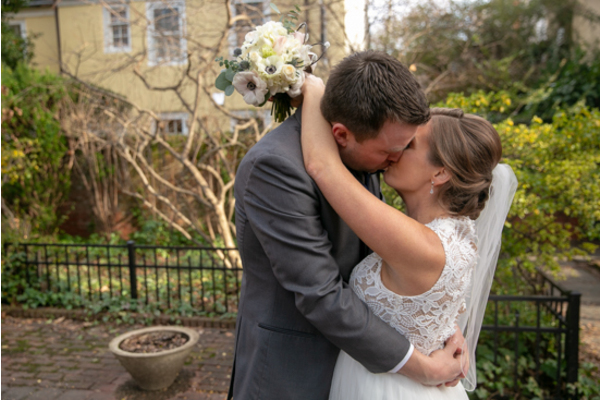 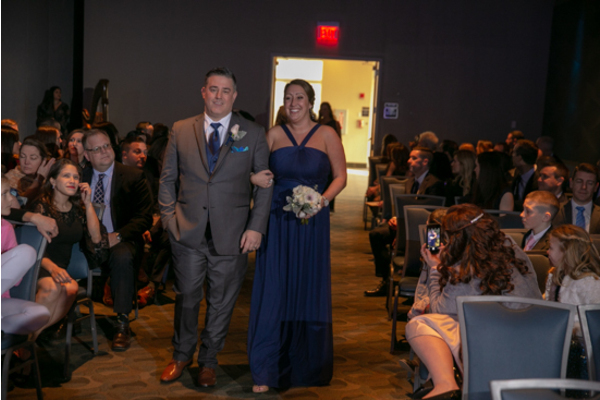 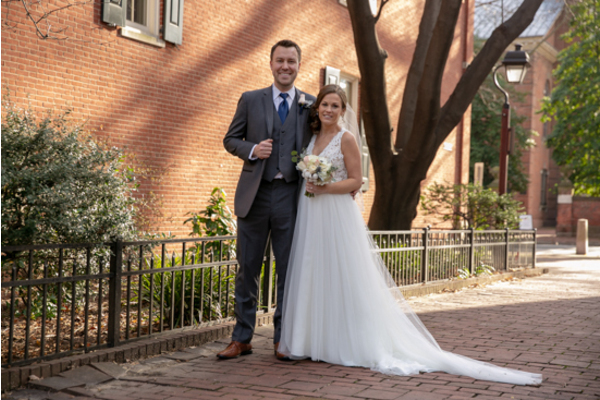 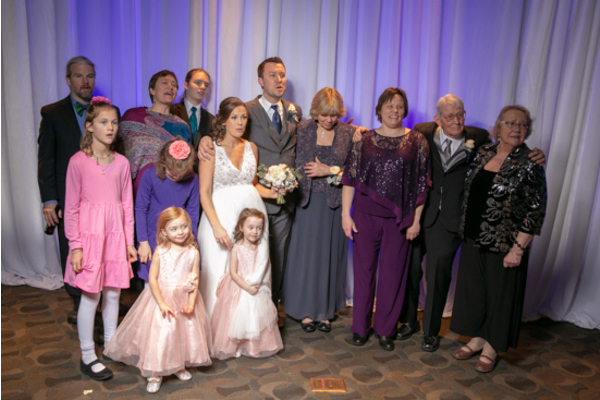 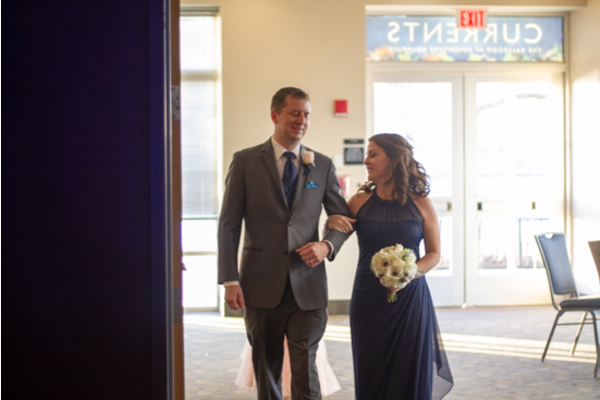 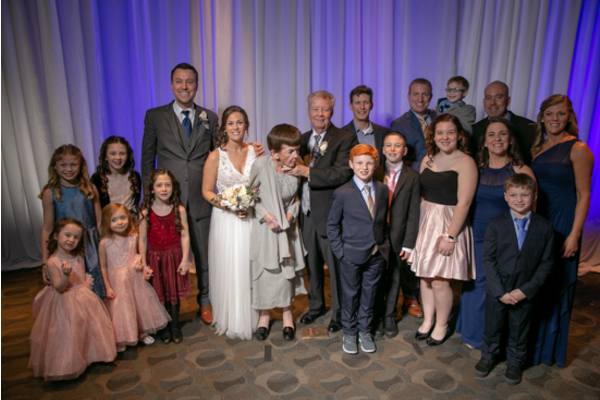 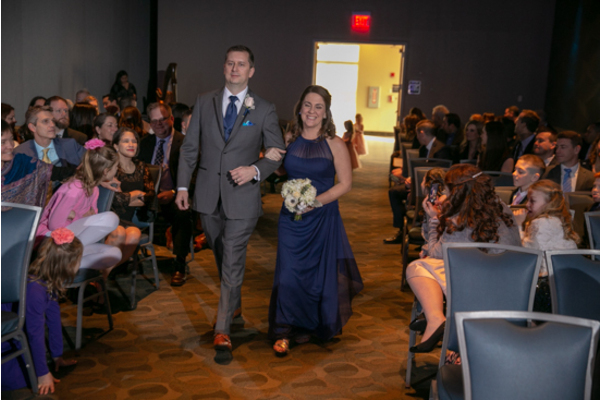 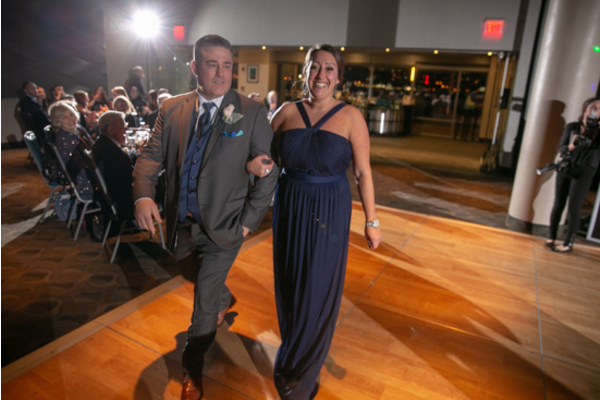 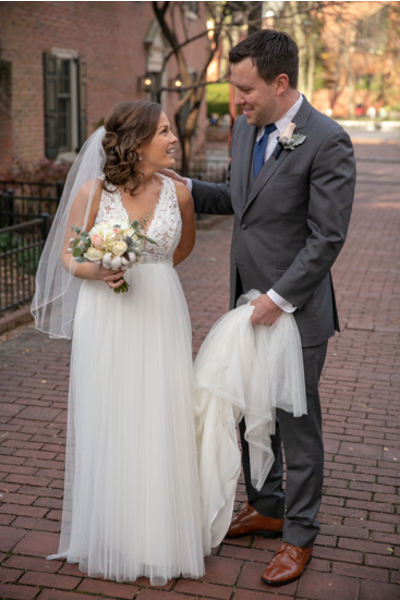 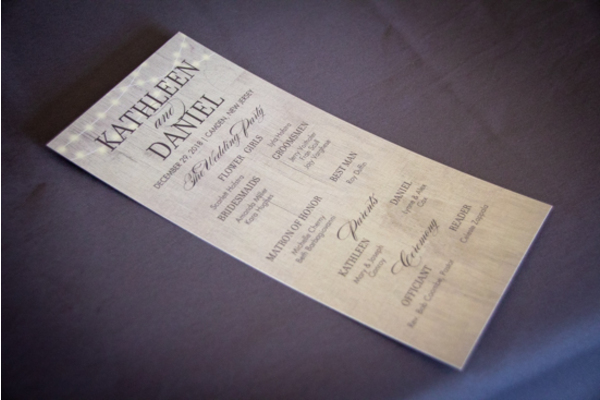 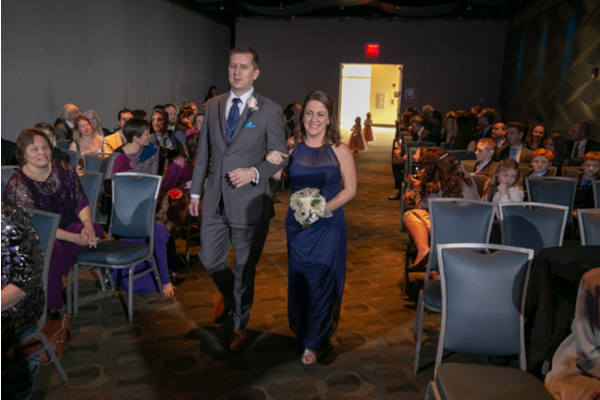 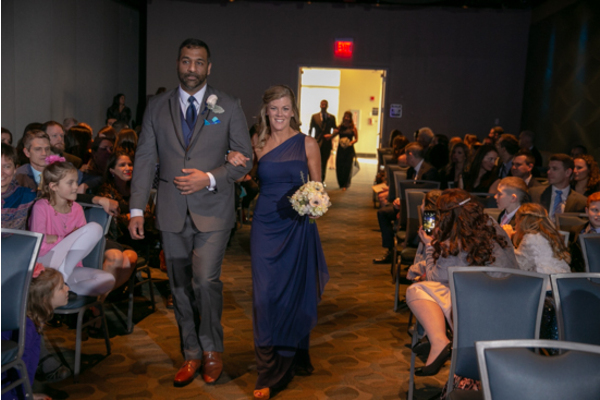 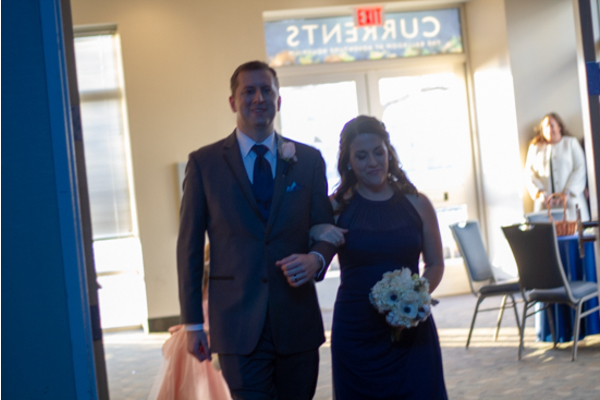 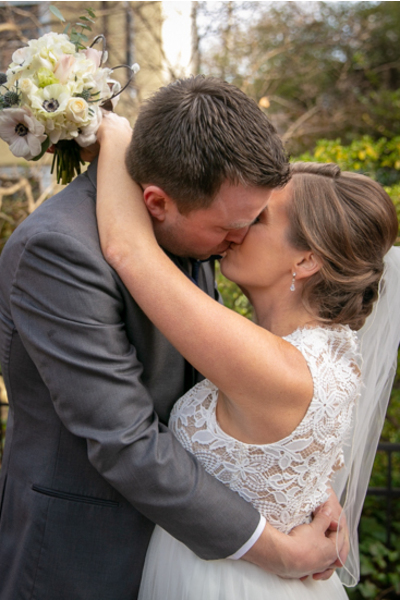 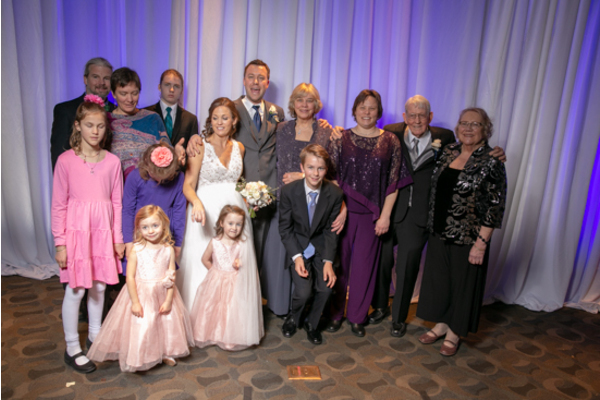 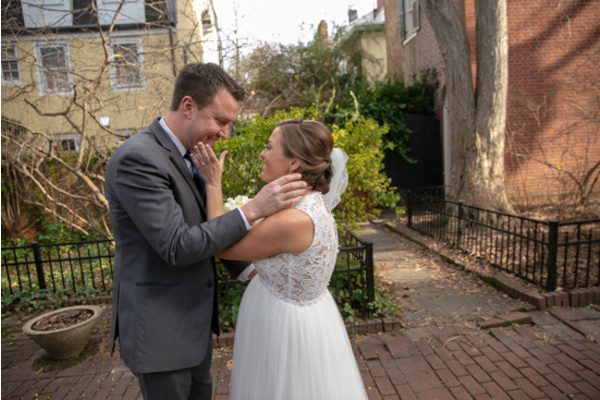 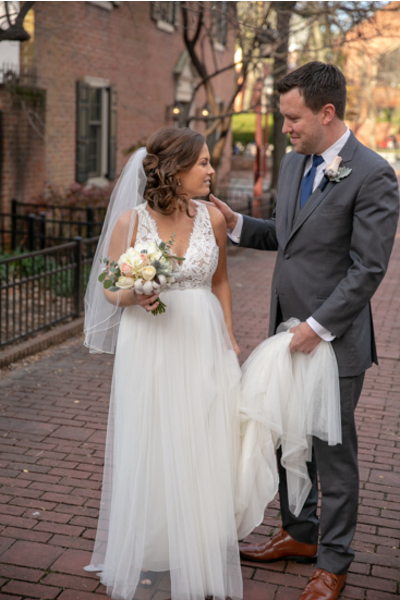 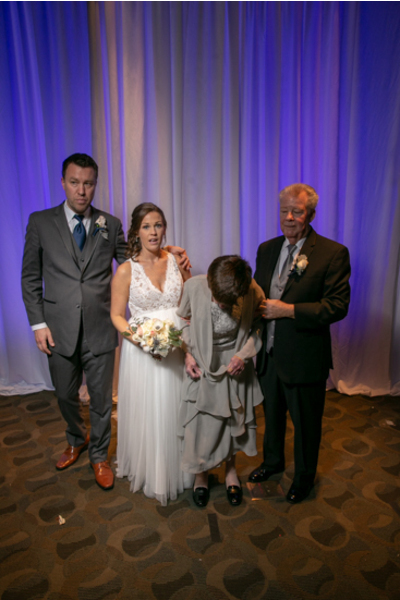 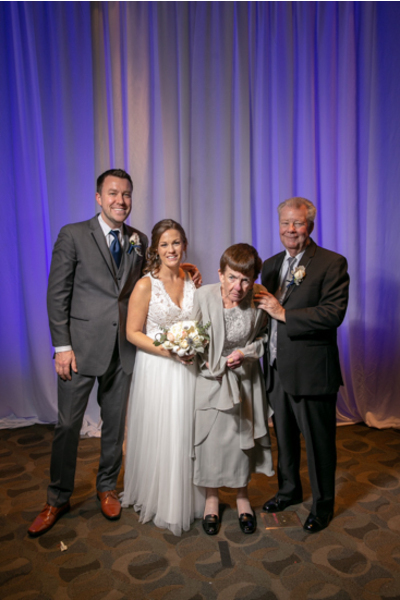 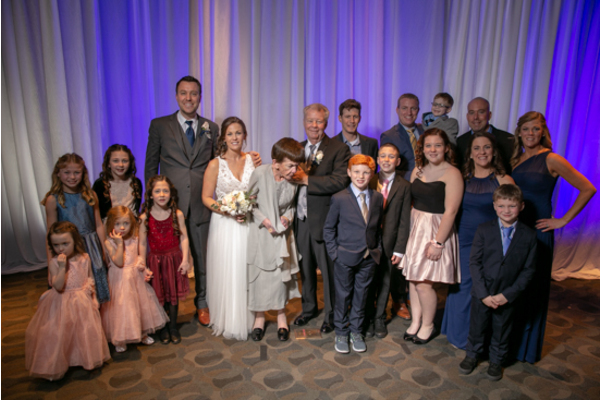 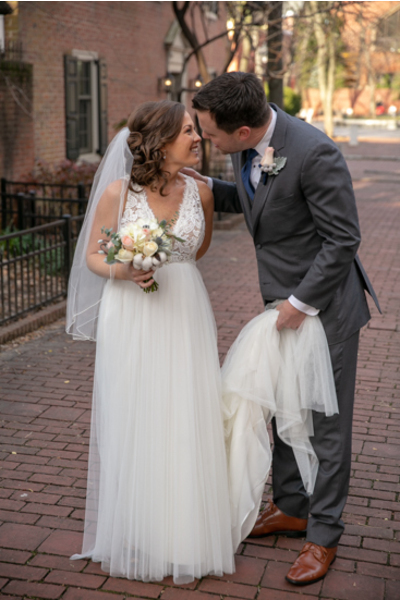 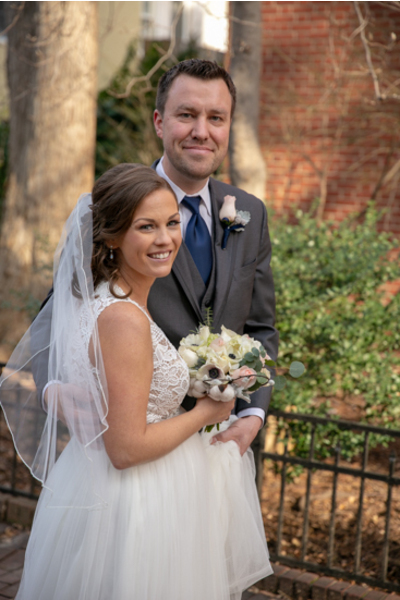 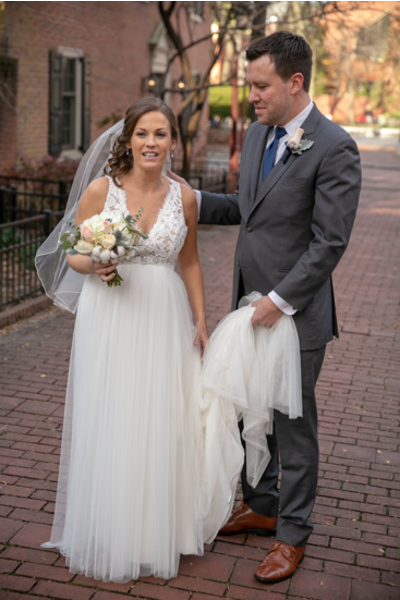 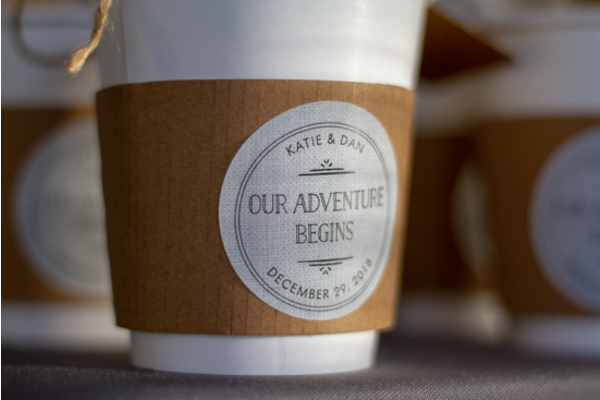 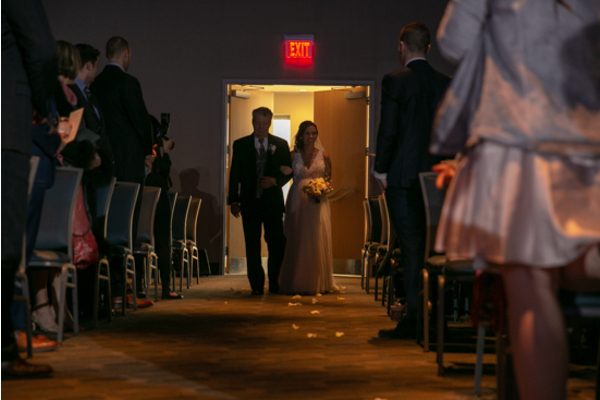 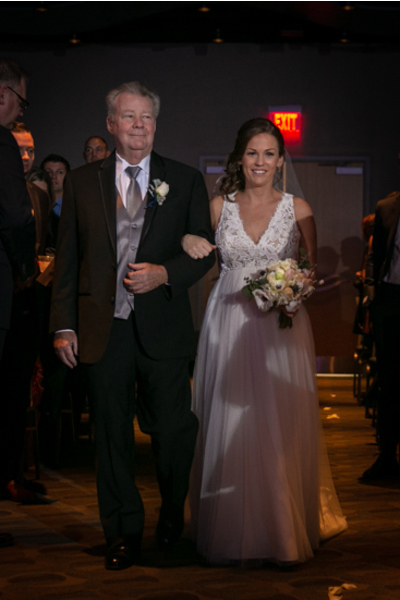 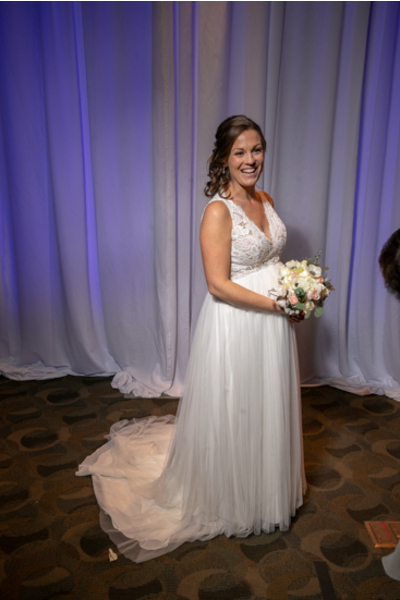 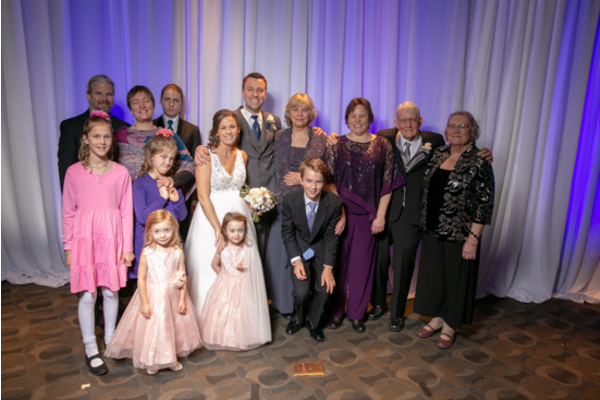 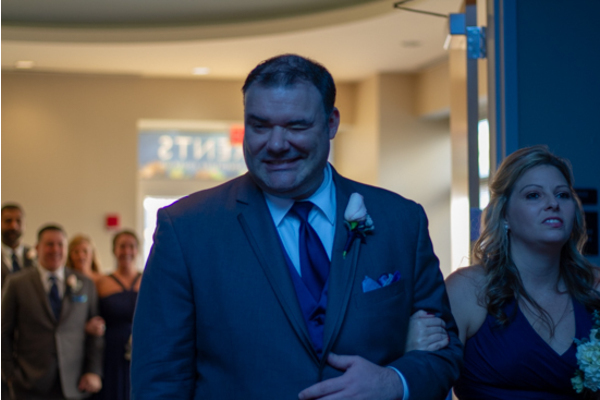 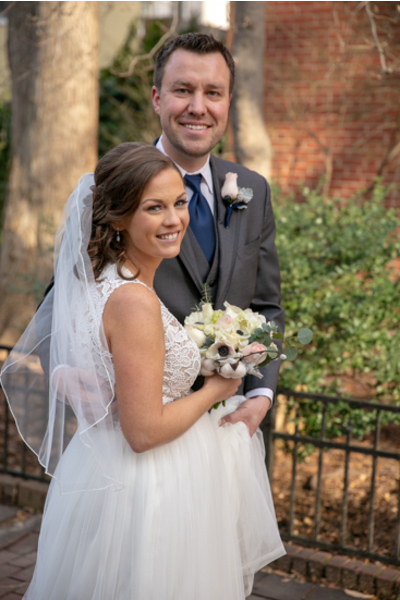 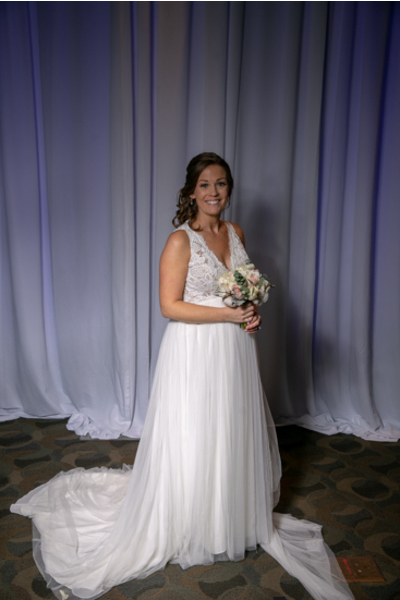 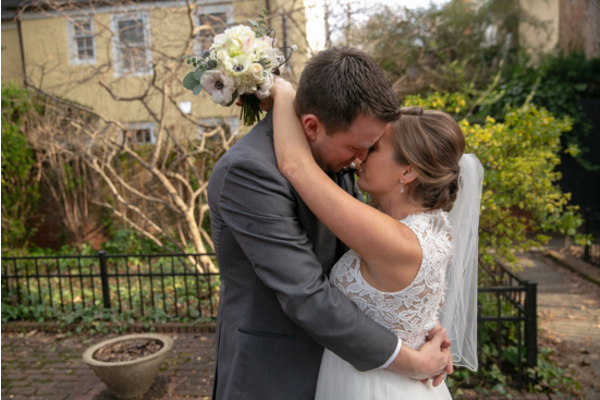 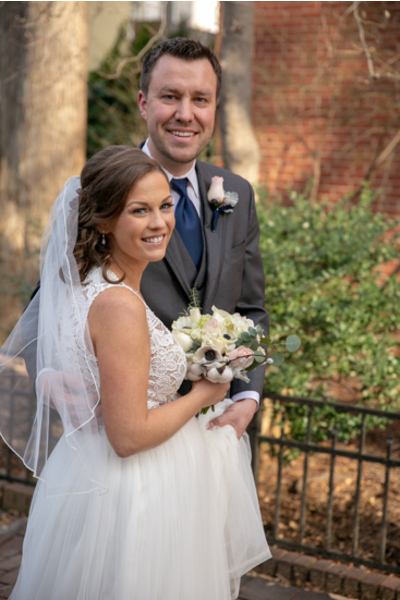 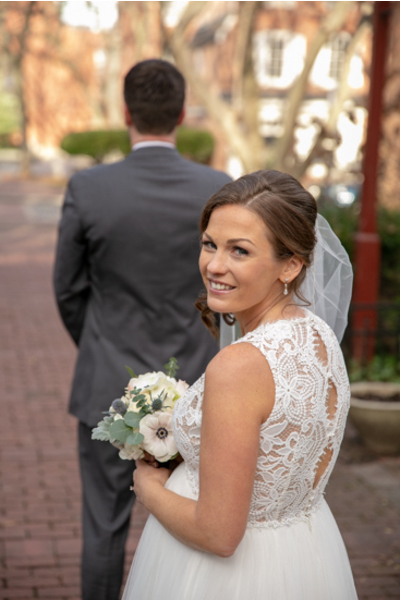 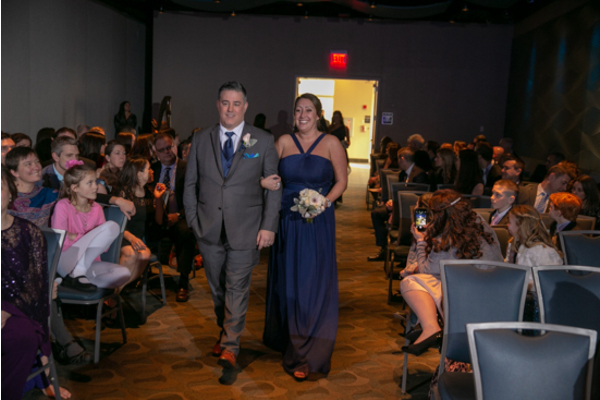 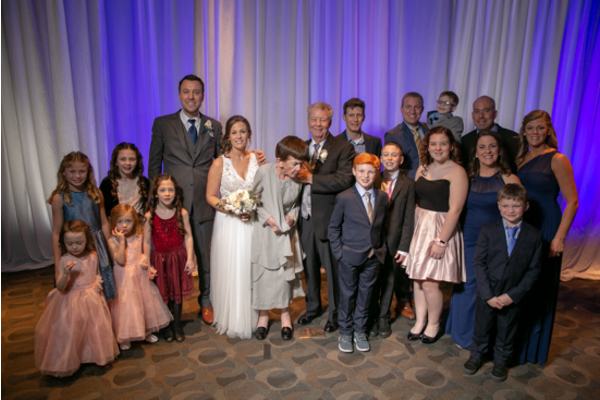 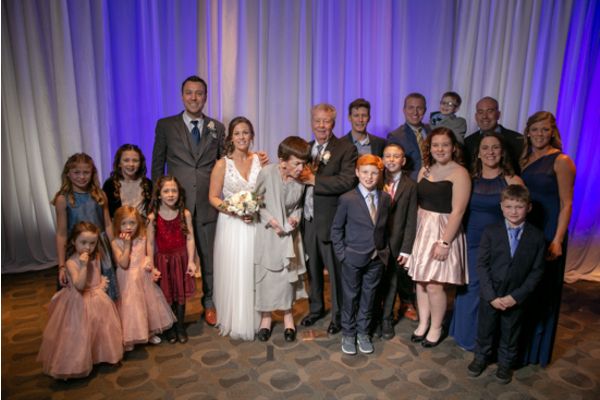 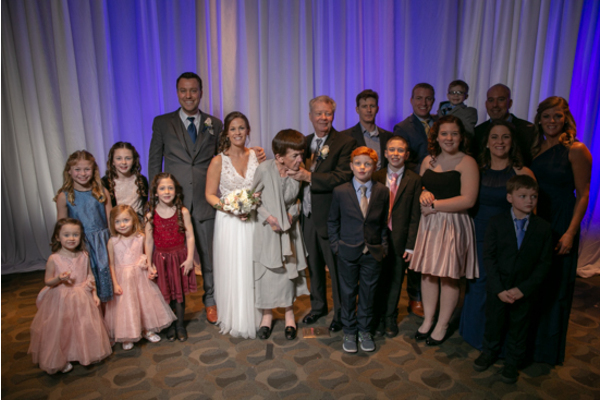 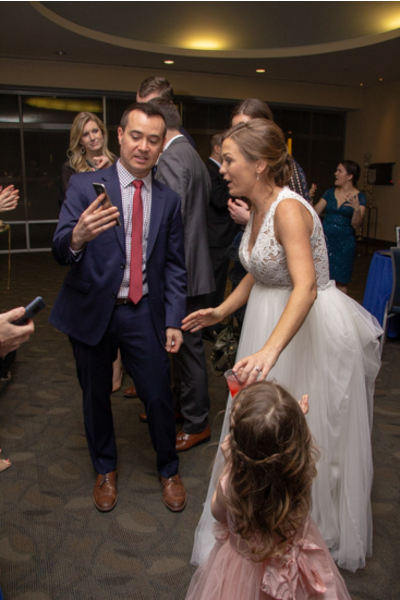 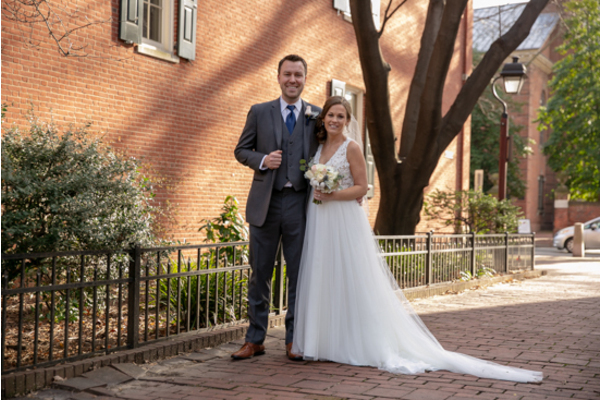 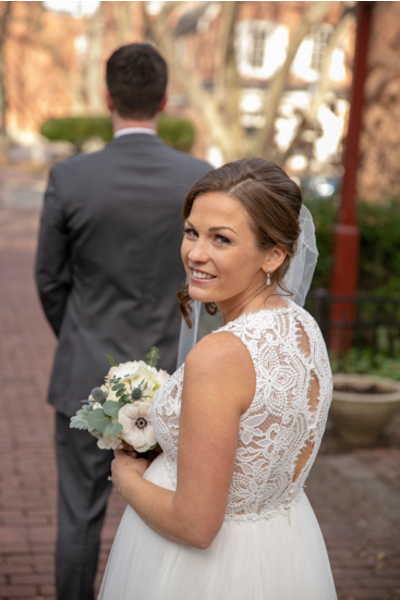 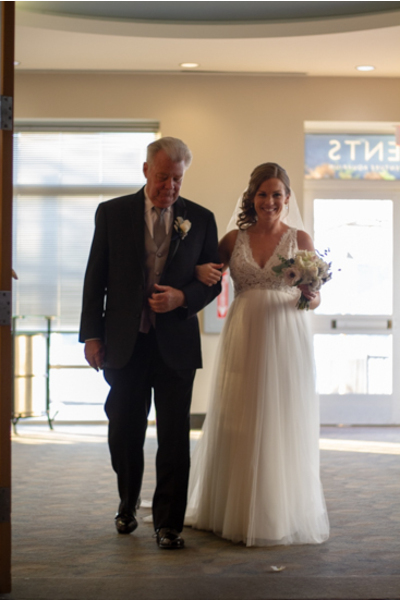 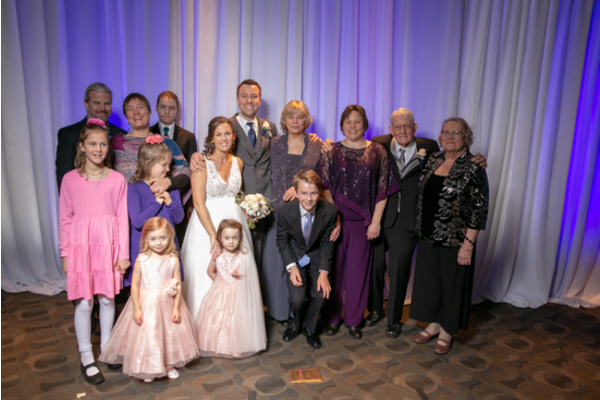 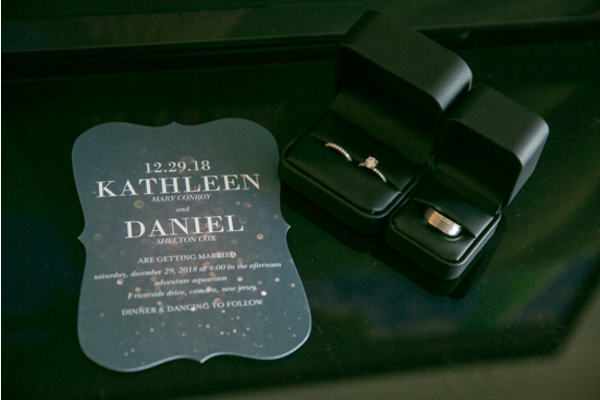 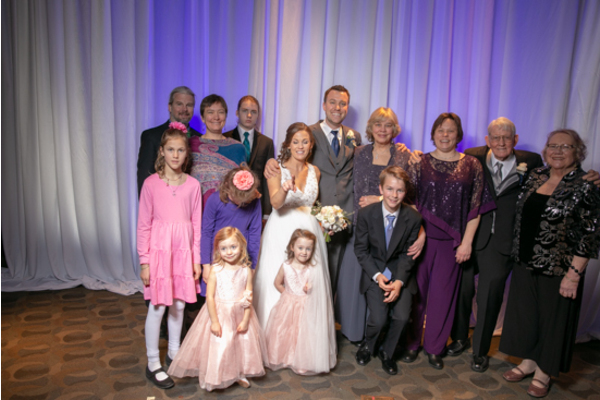 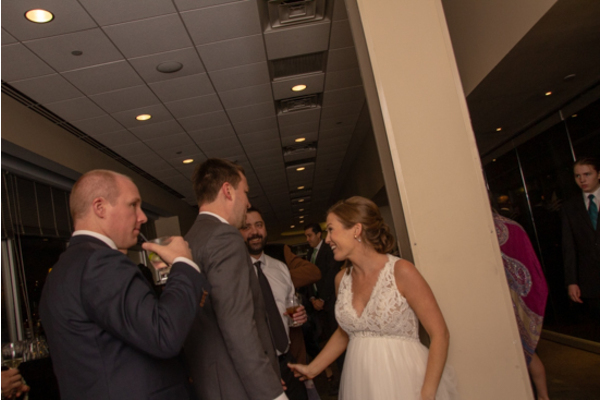 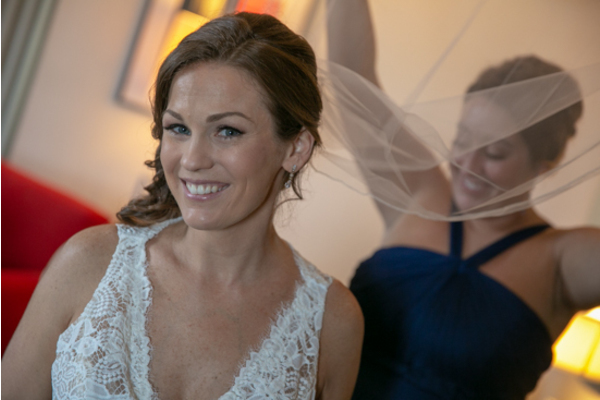 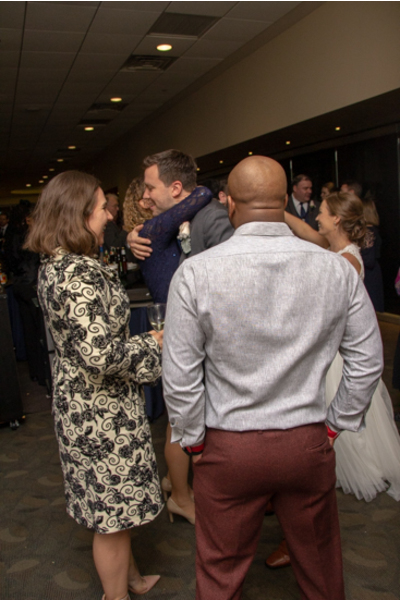 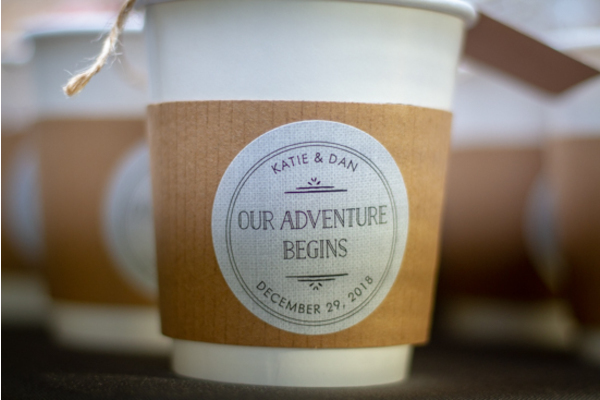 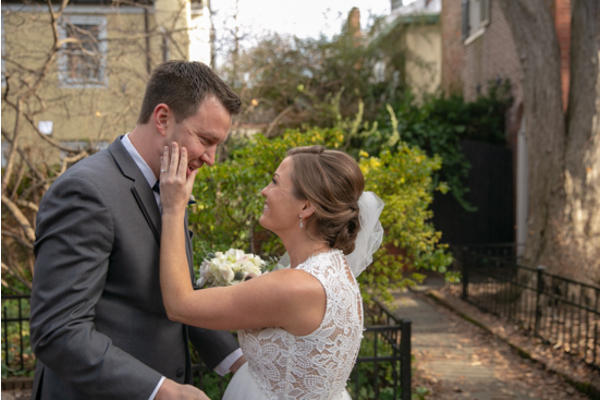 Congratulations to Katie and Dan on their recent marriage! 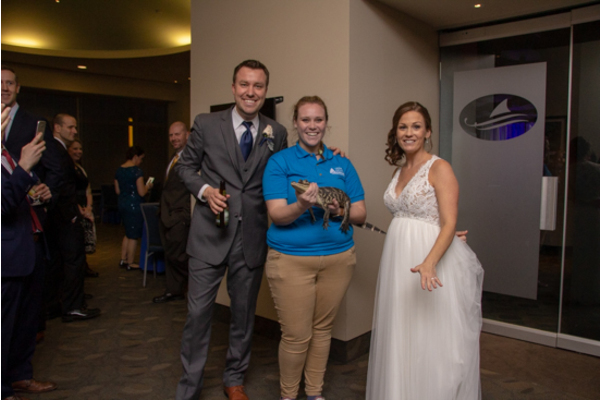 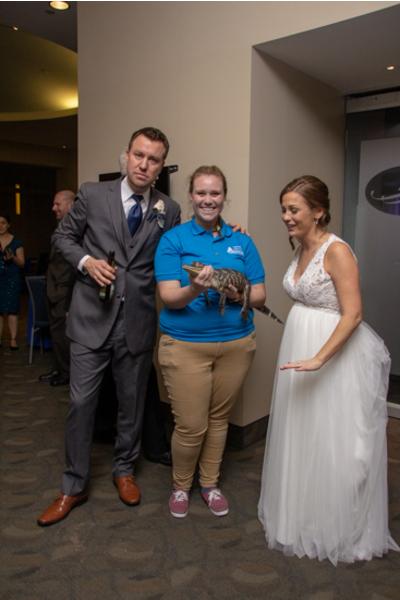 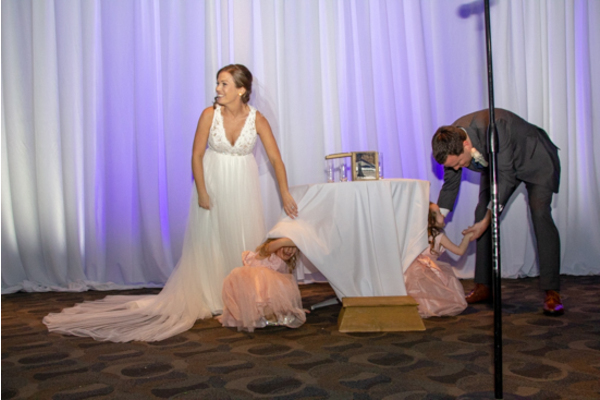 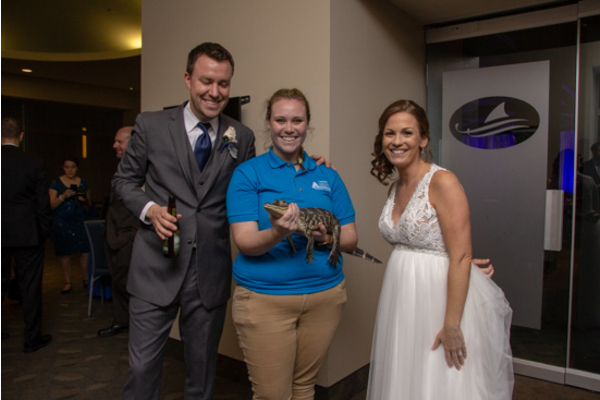 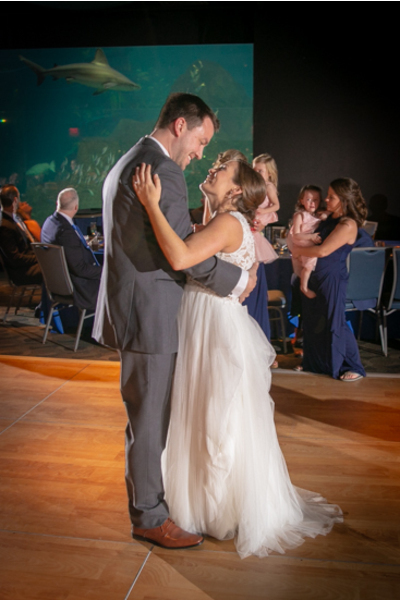 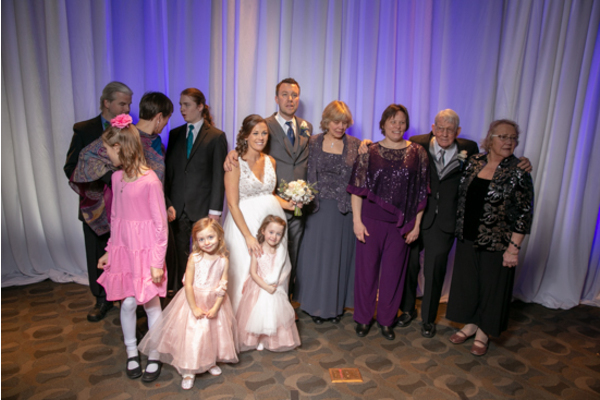 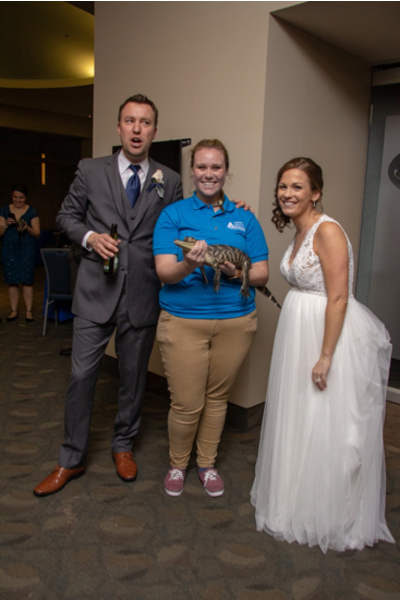 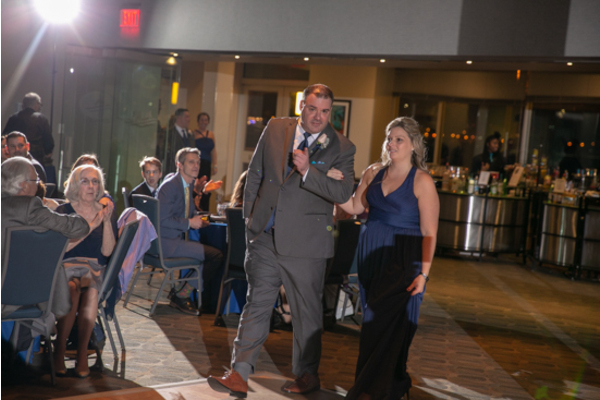 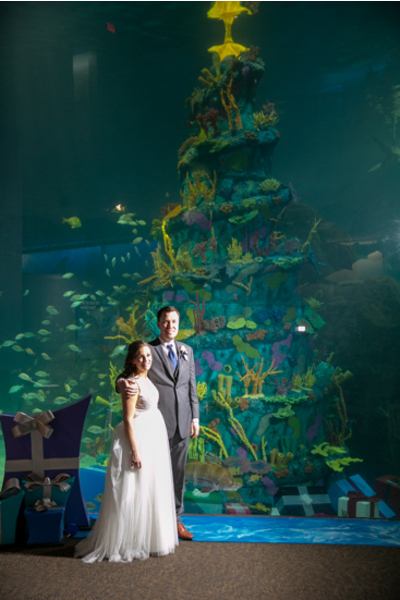 They celebrated their fun wedding at Adventure Aquarium. 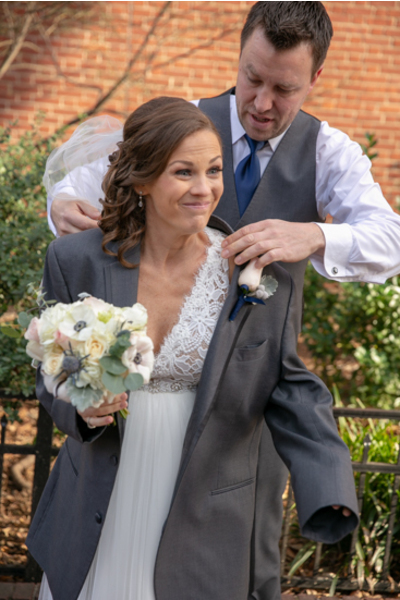 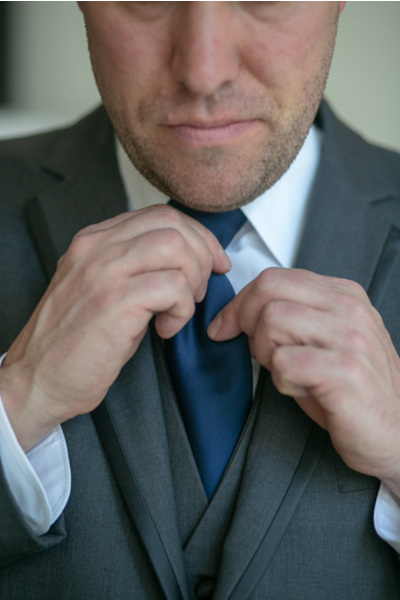 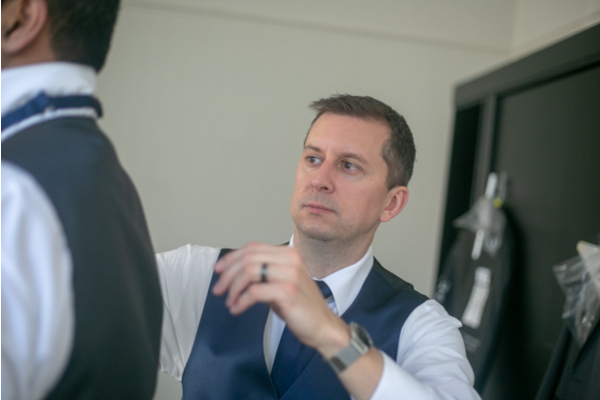 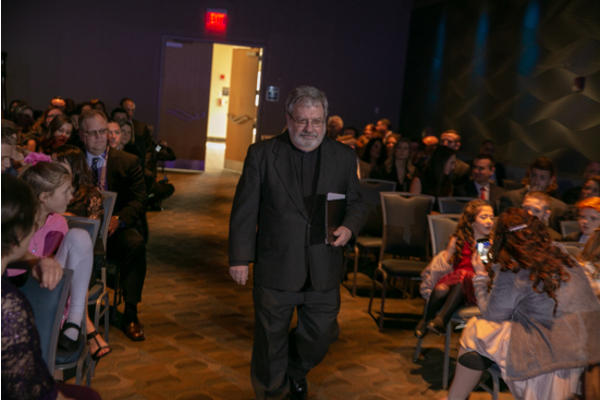 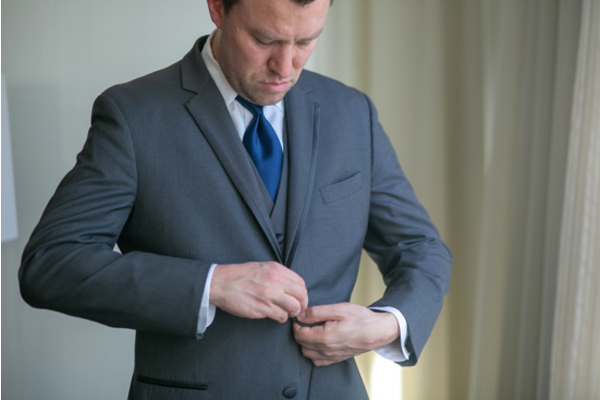 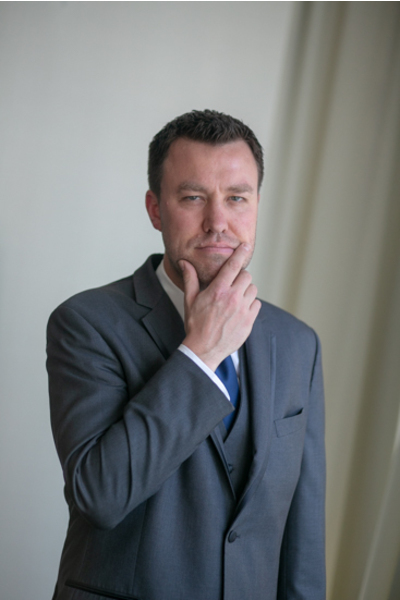 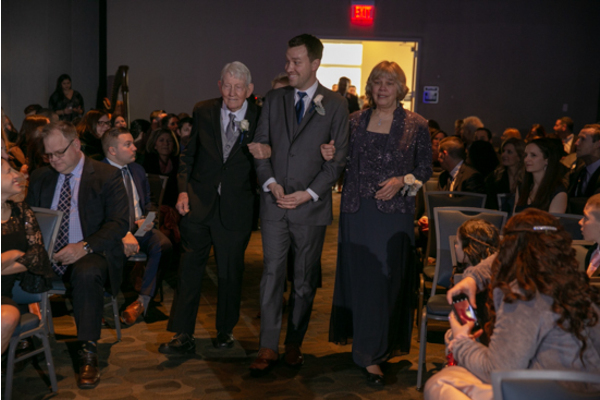 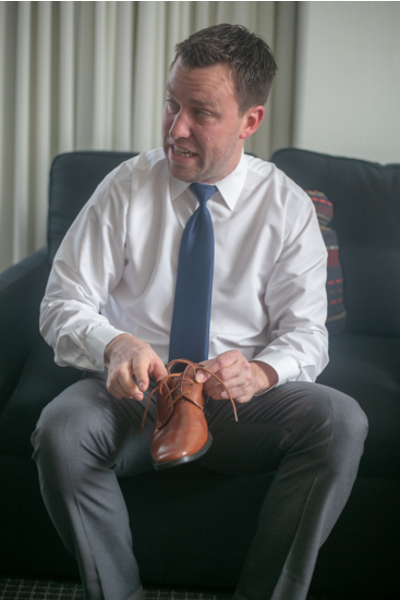 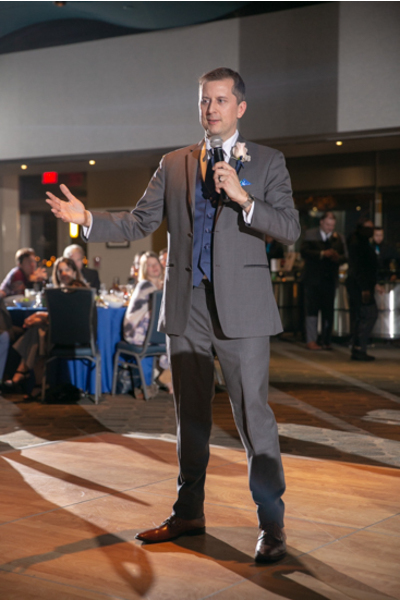 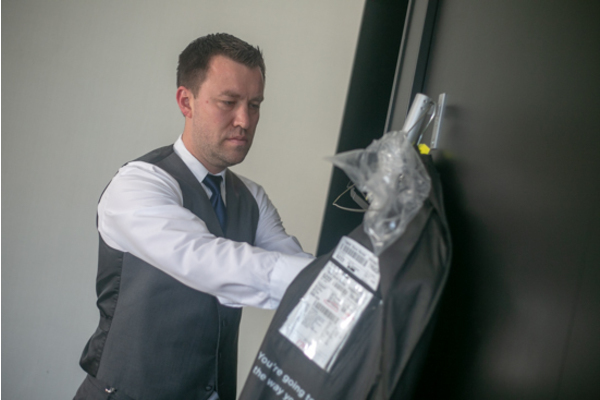 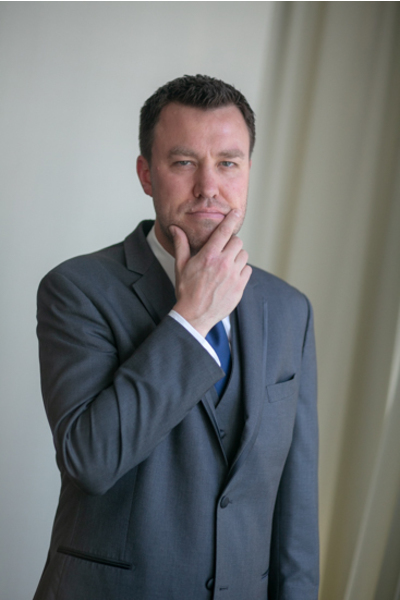 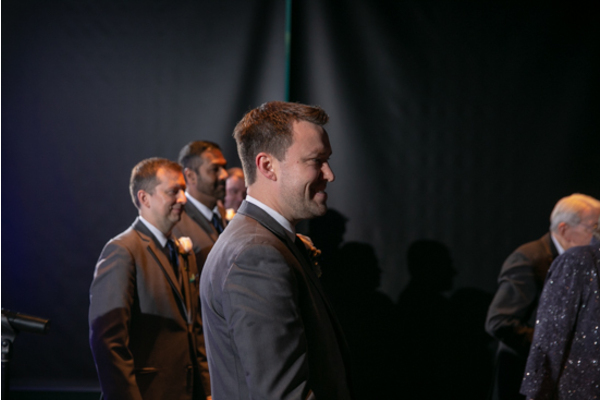 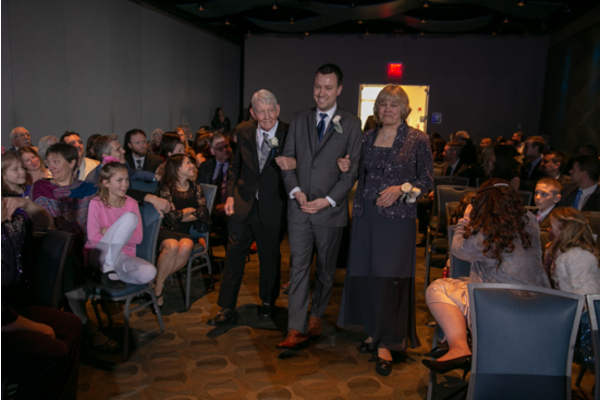 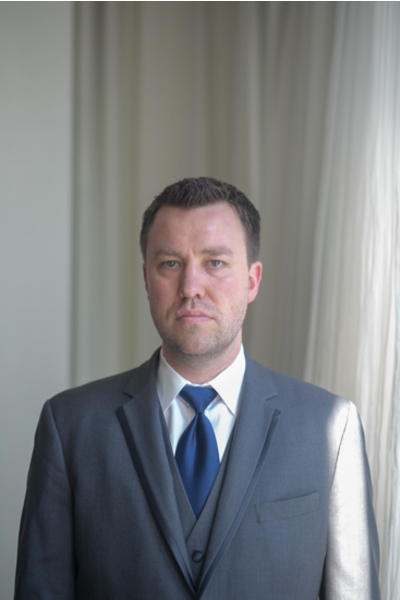 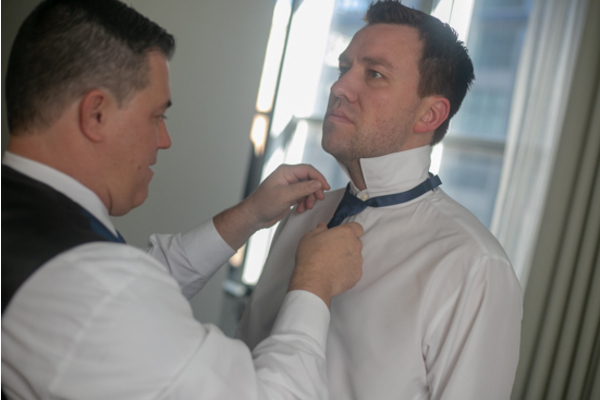 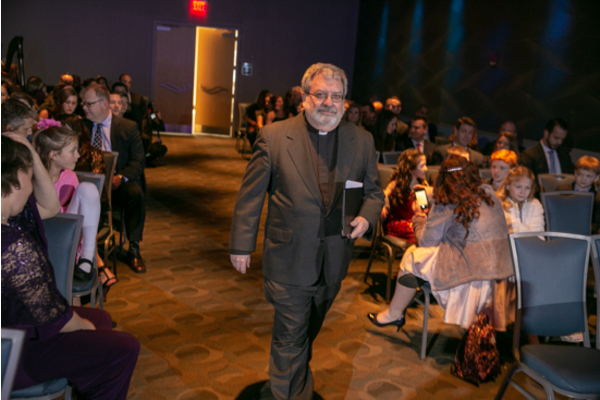 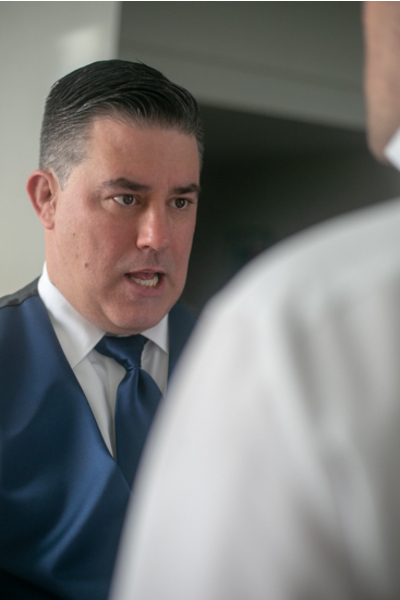 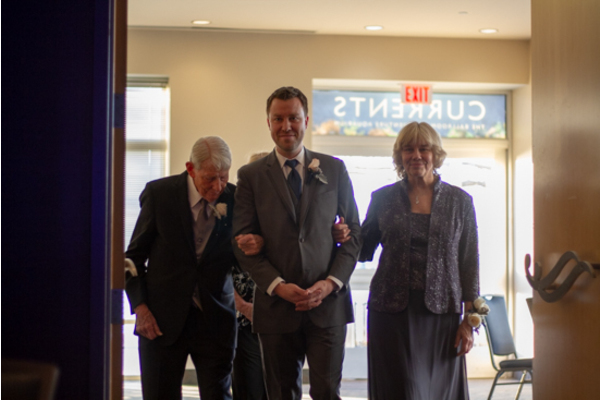 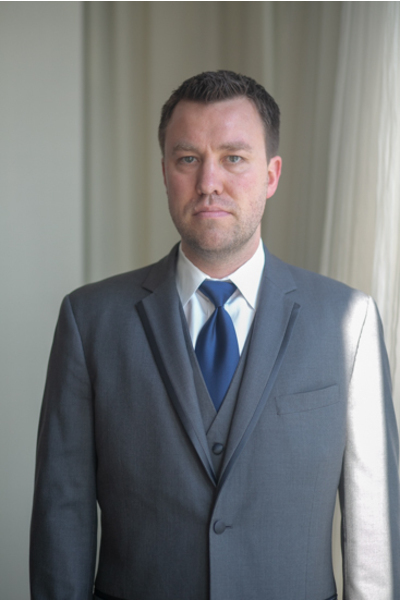 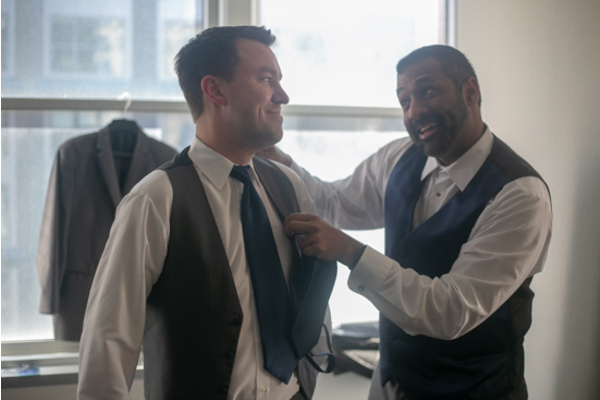 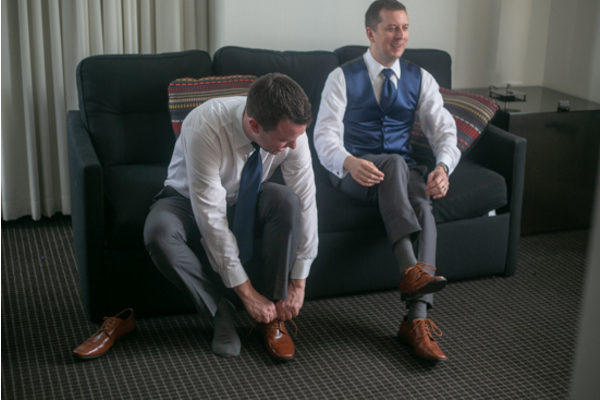 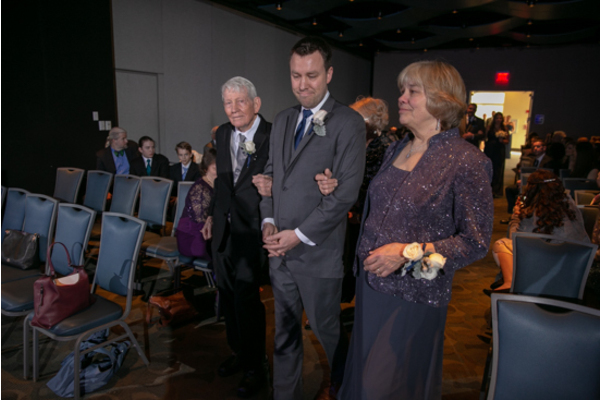 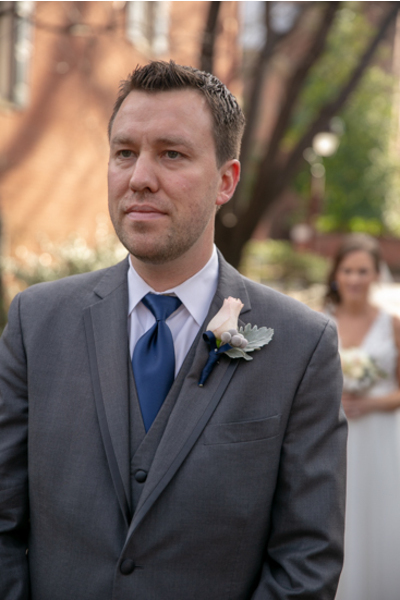 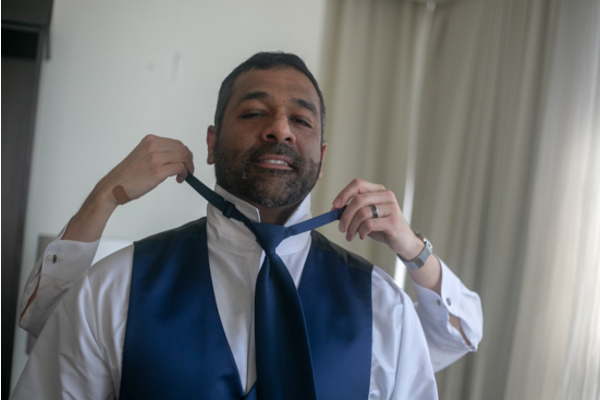 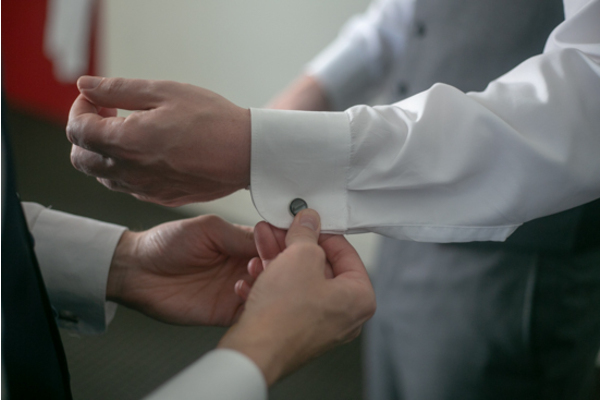 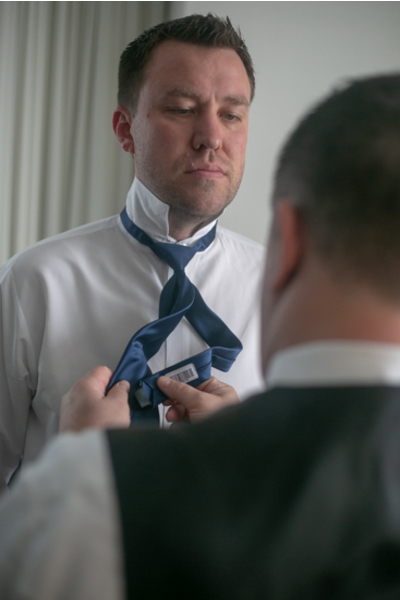 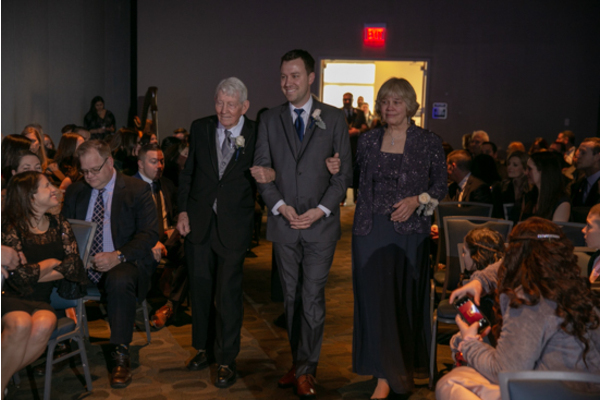 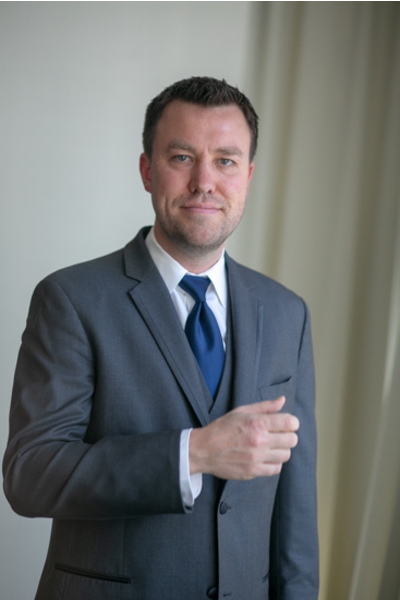 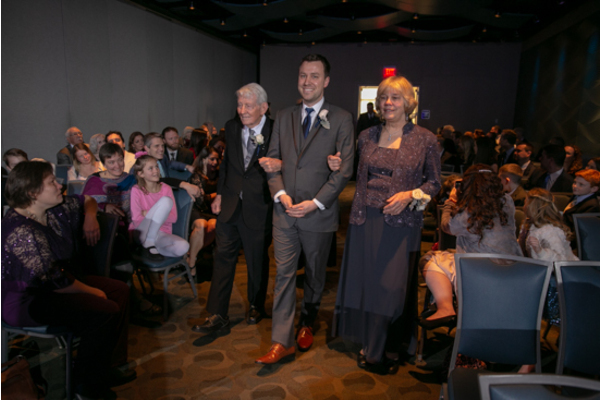 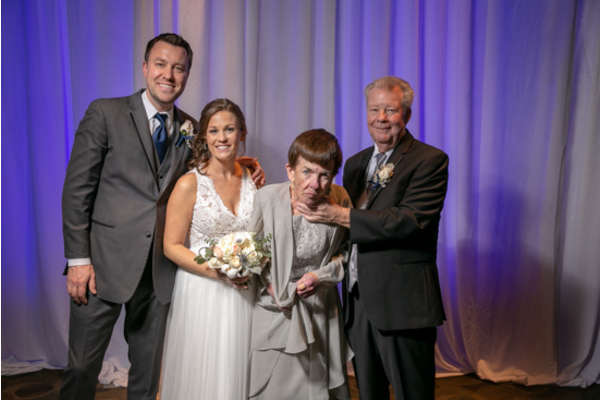 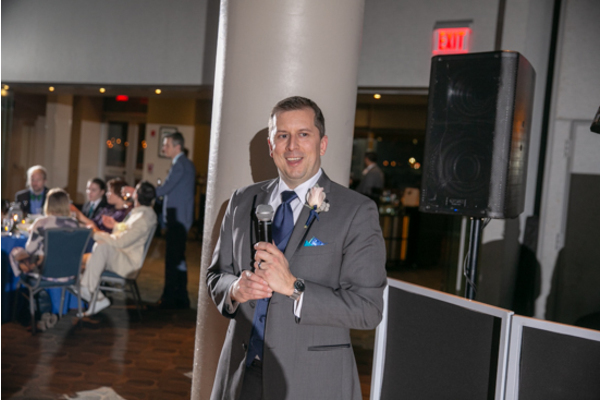 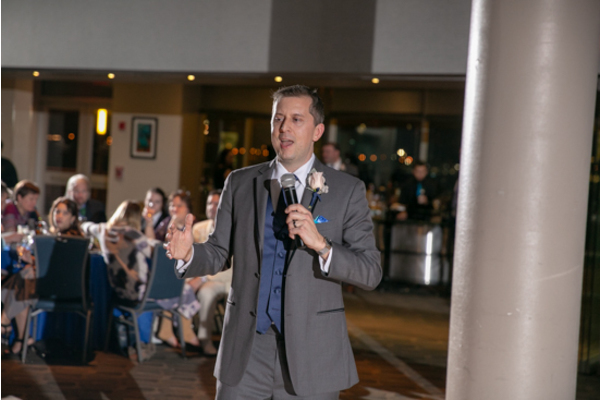 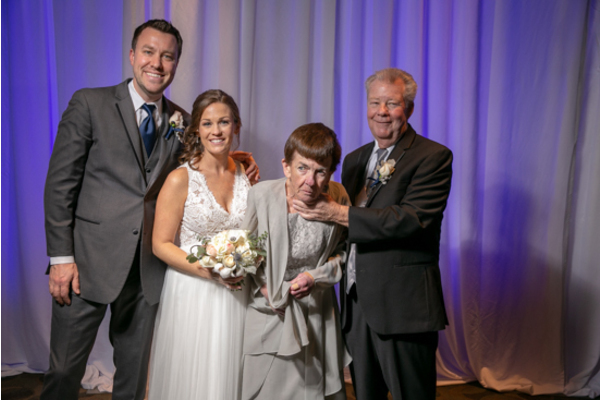 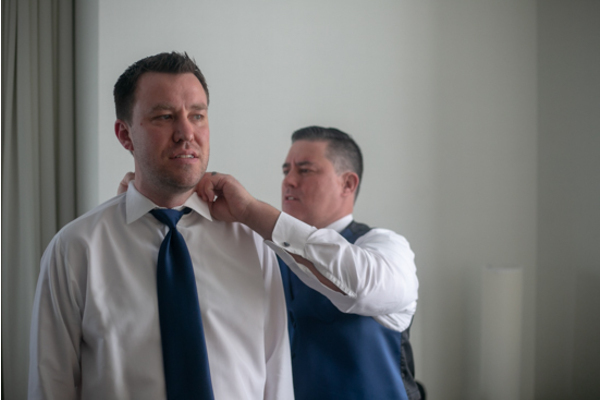 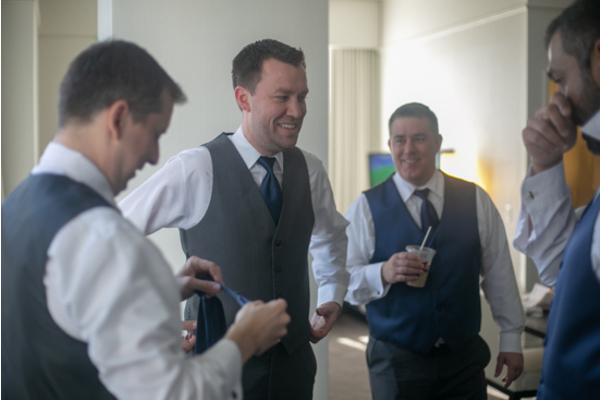 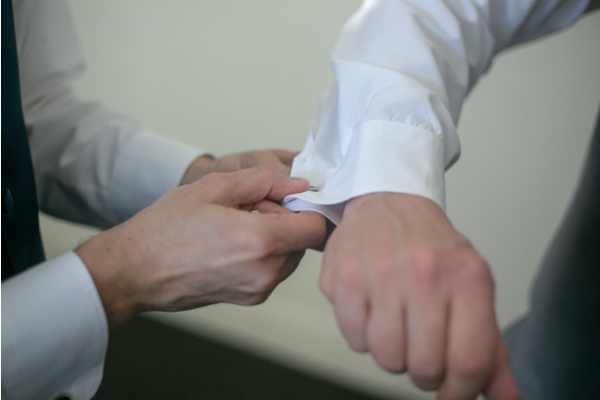 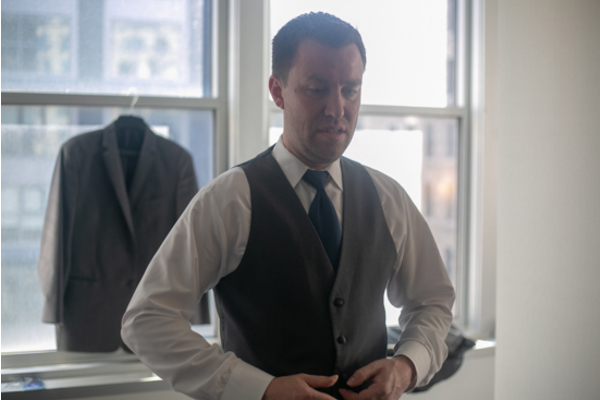 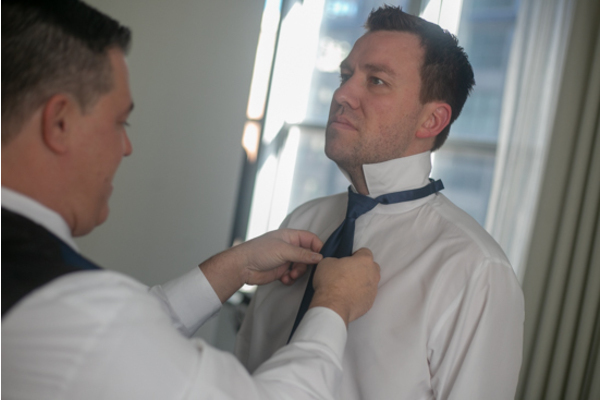 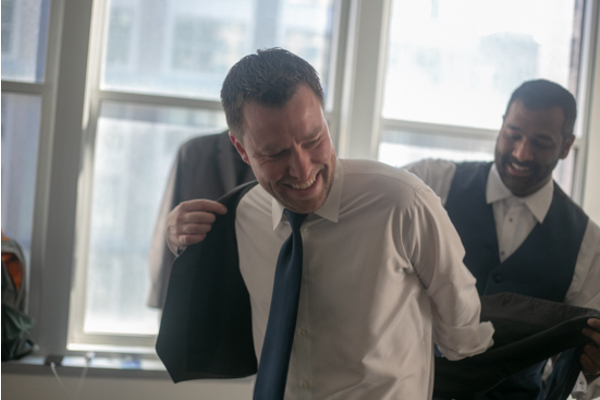 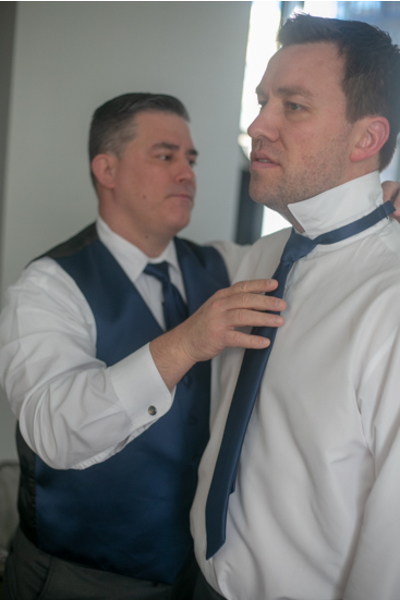 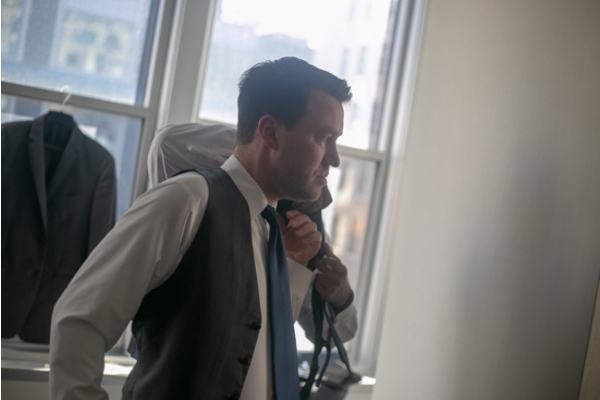 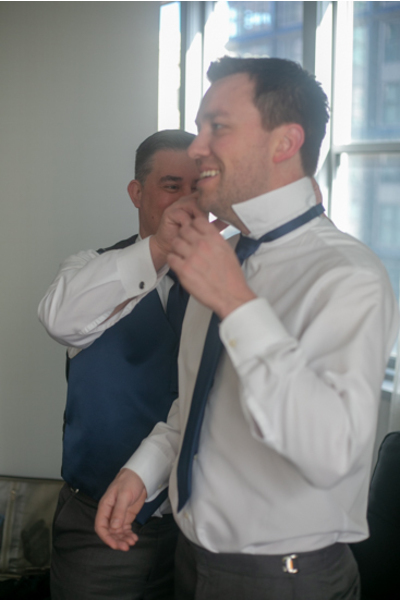 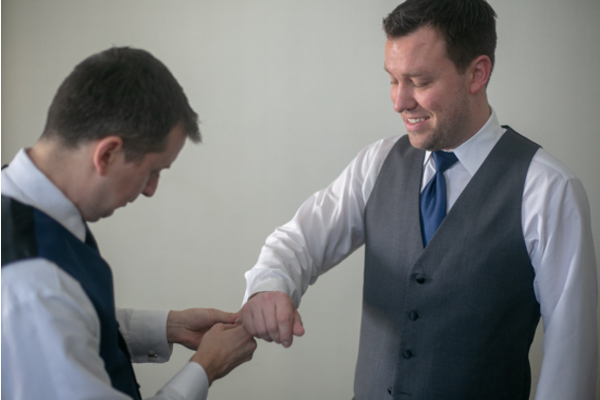 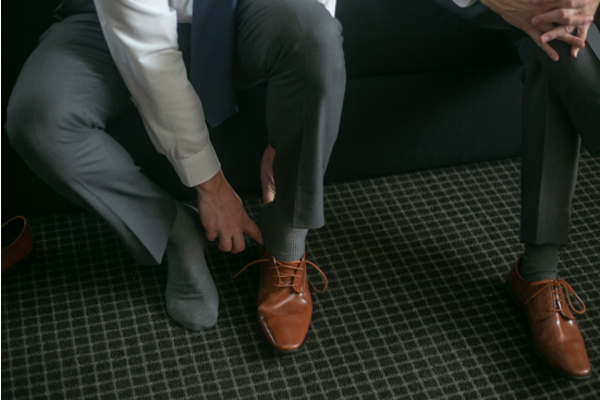 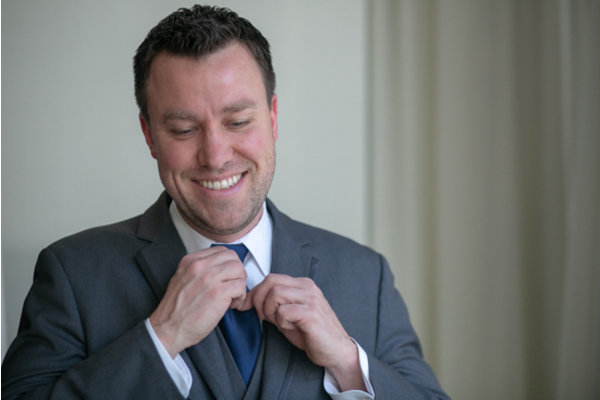 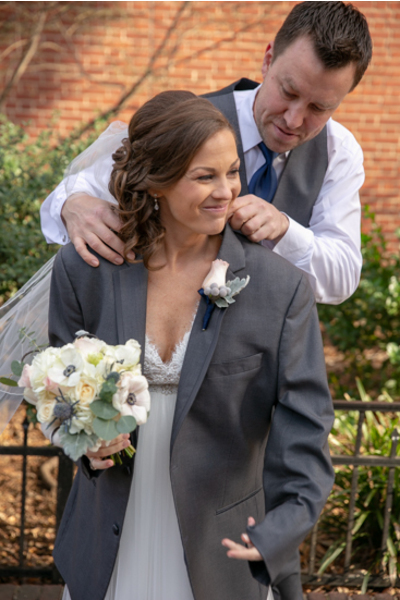 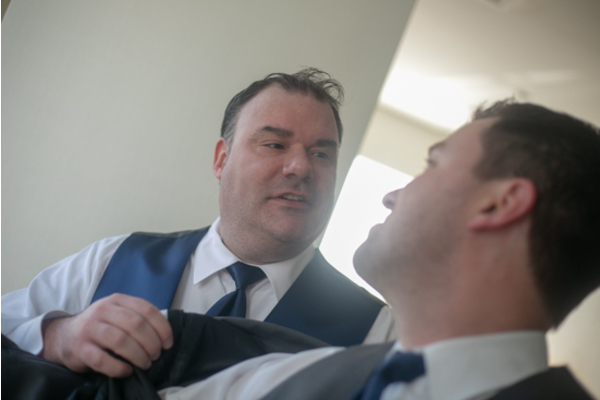 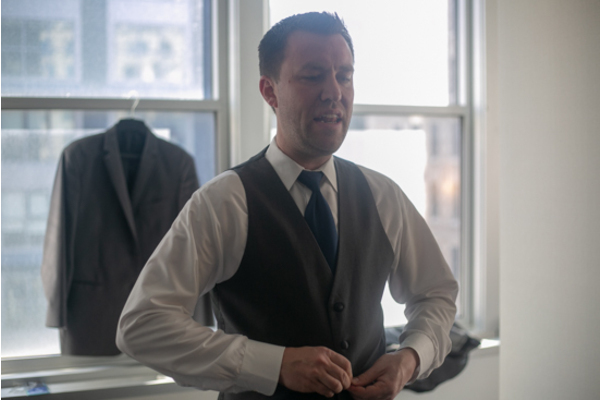 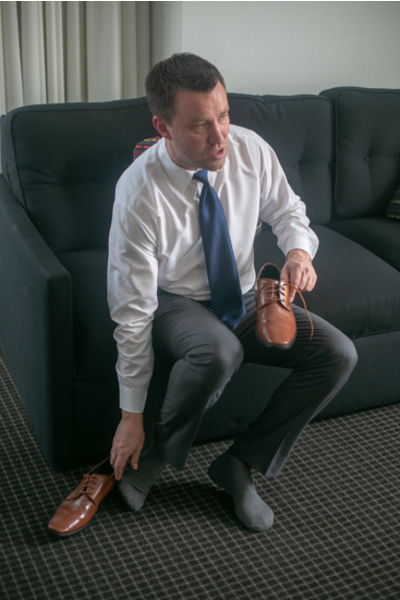 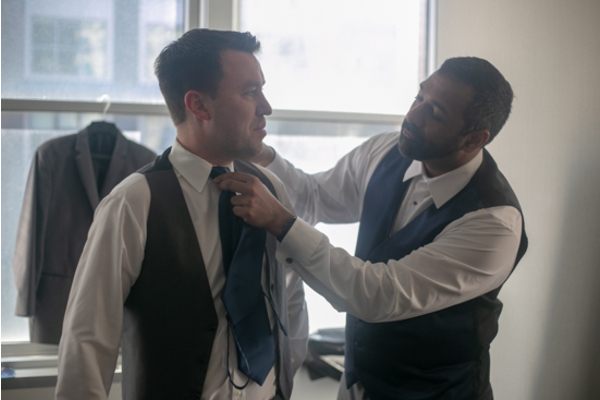 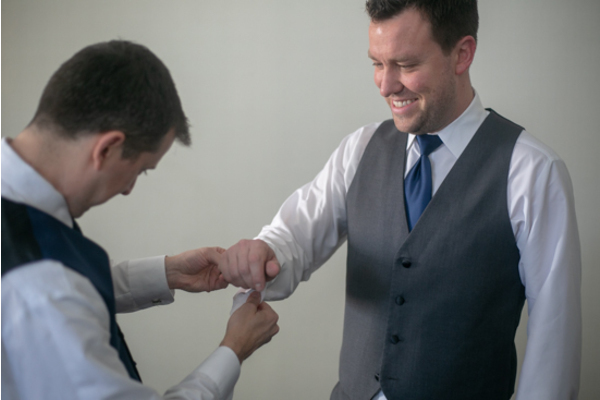 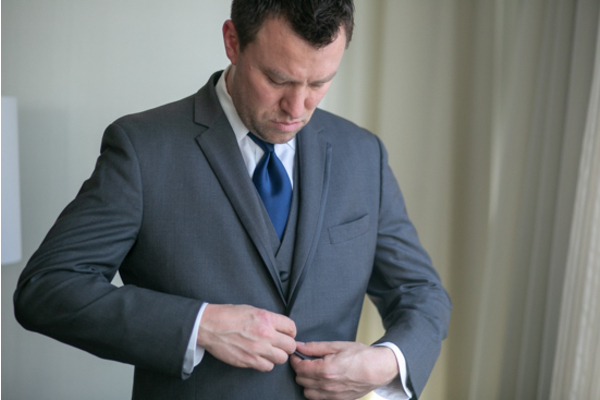 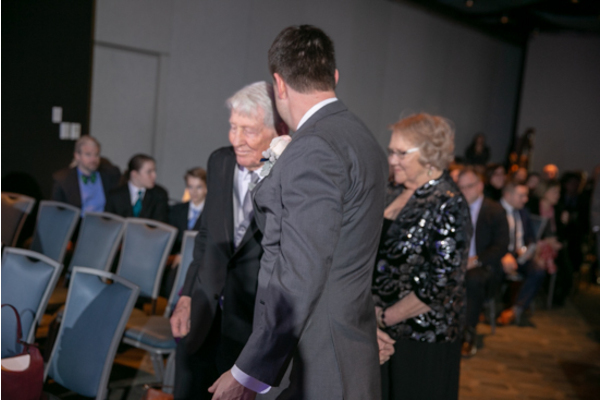 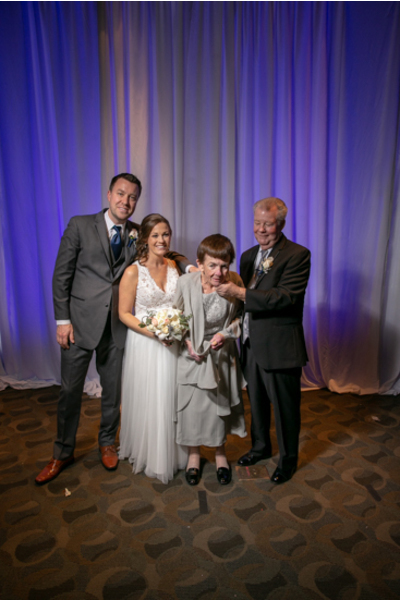 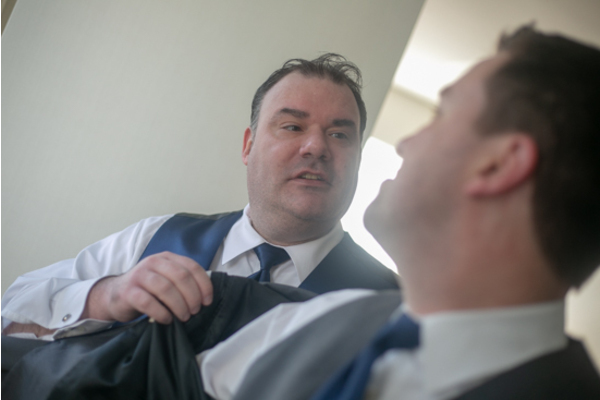 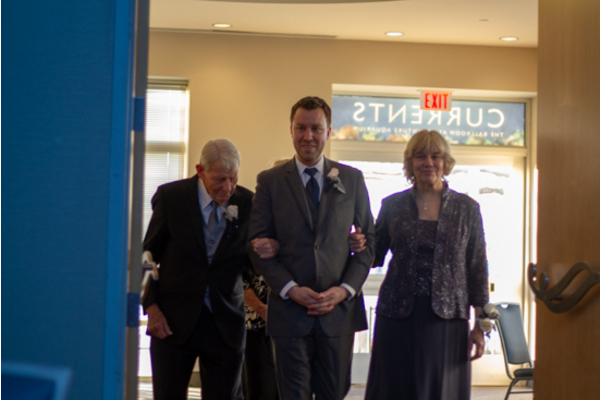 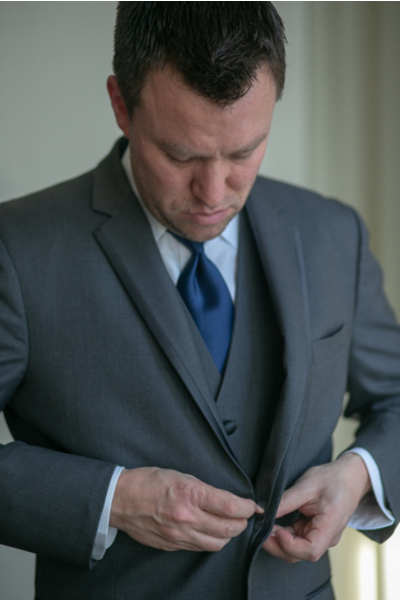 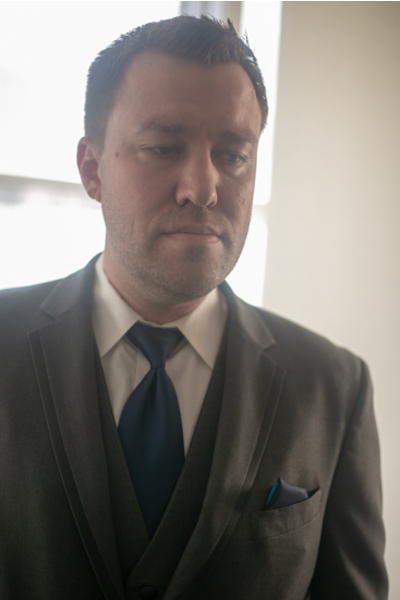 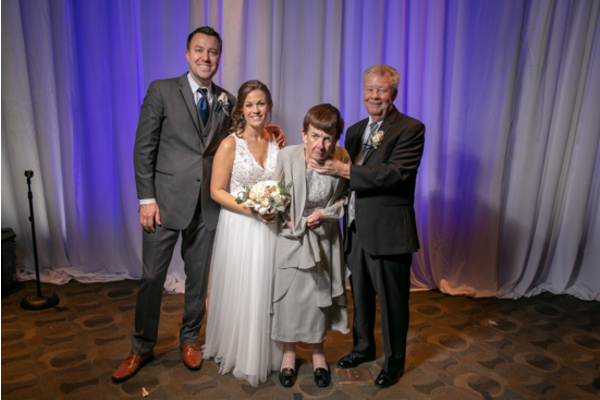 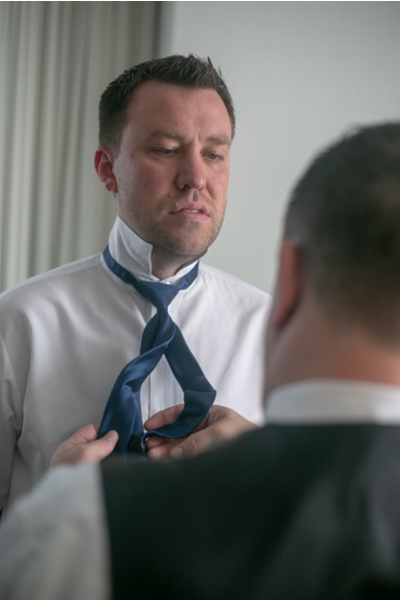 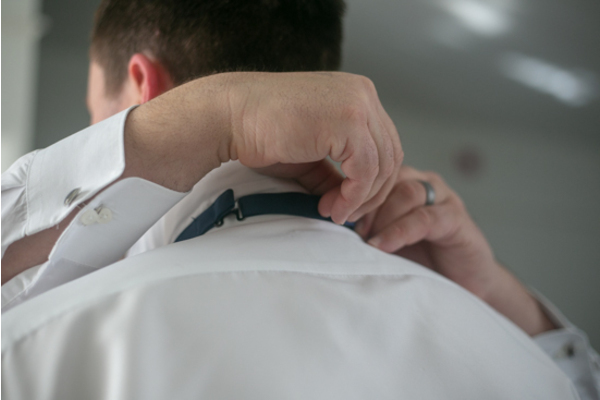 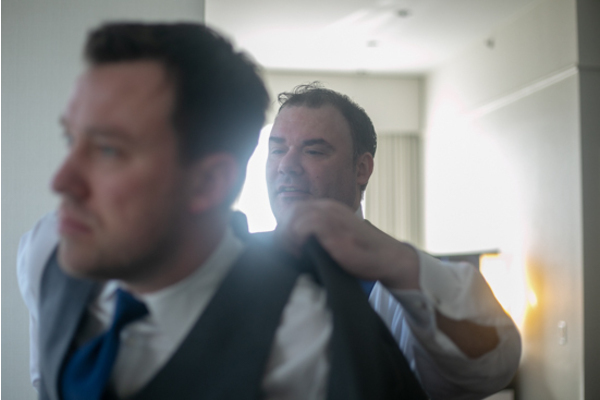 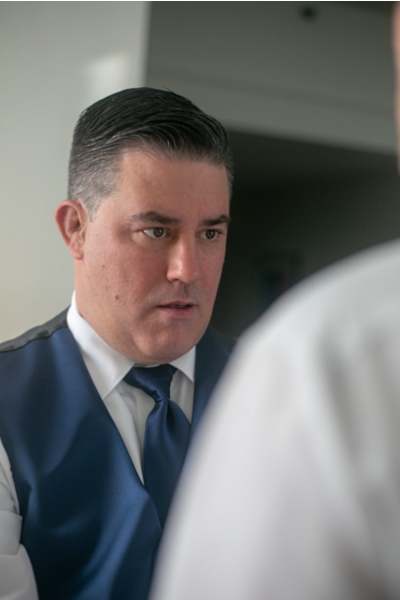 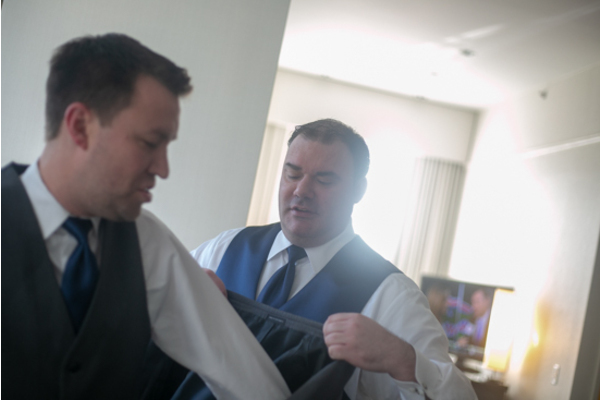 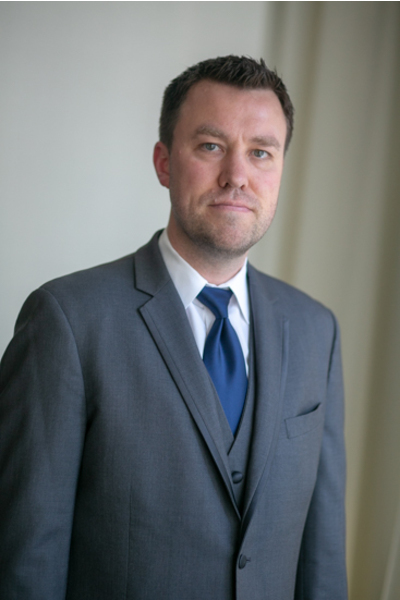 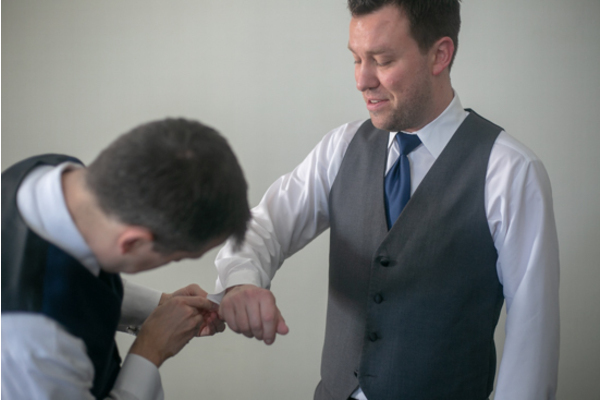 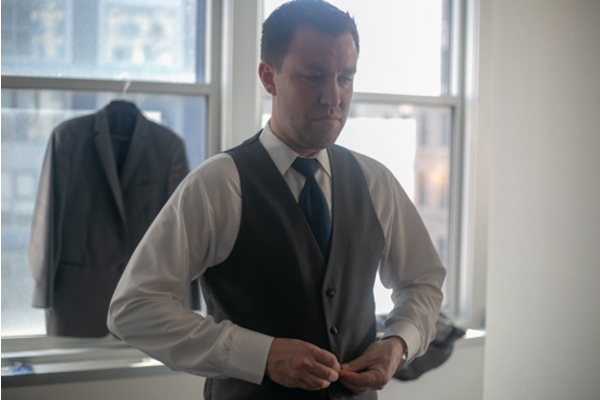 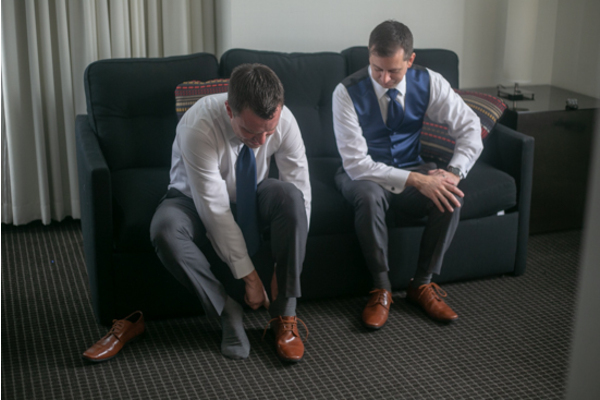 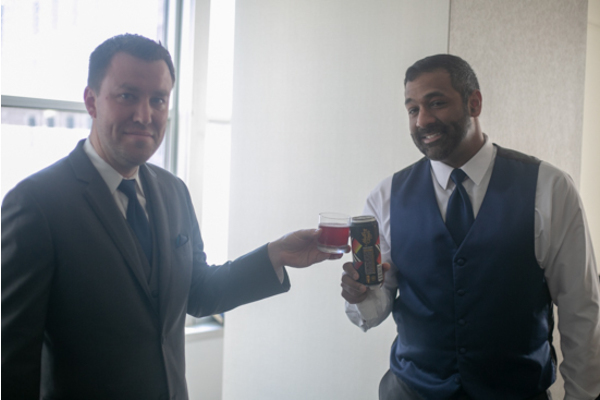 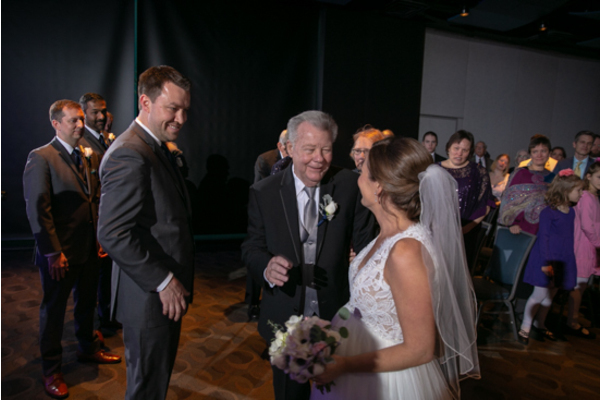 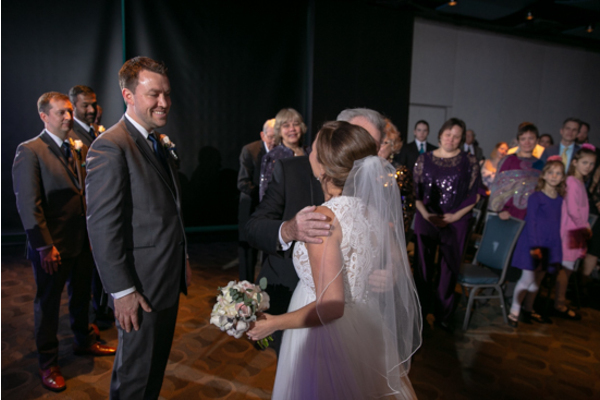 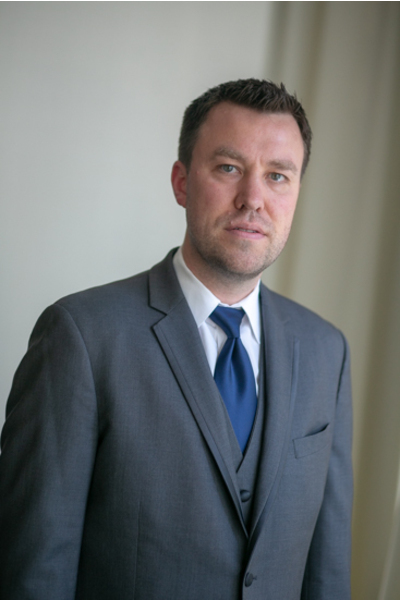 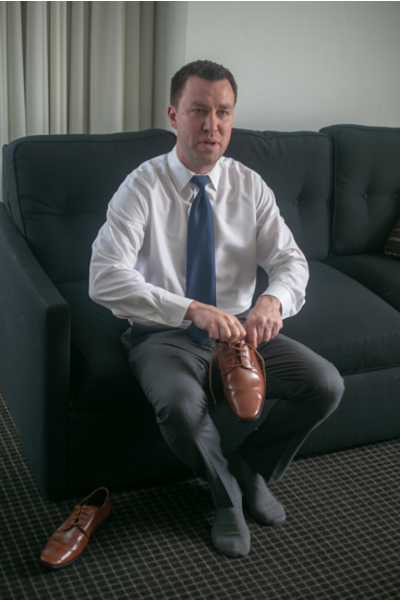 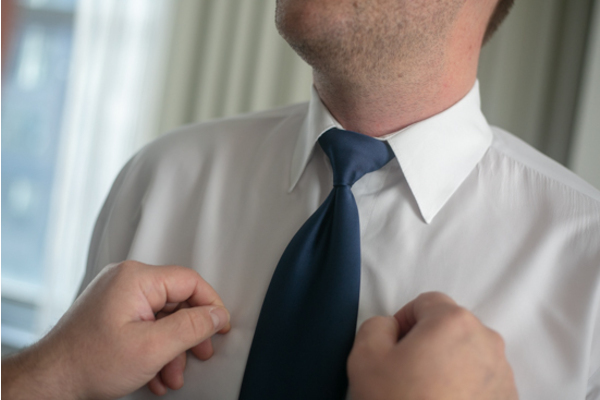 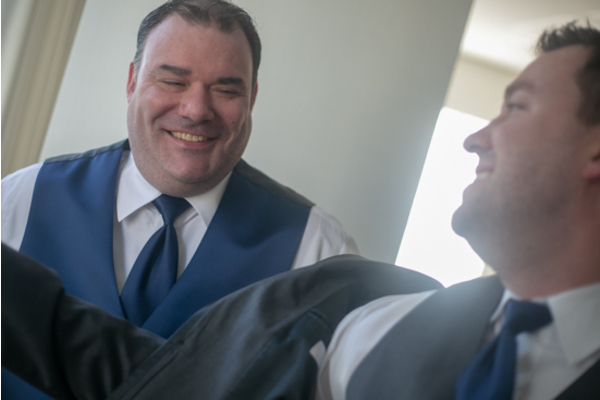 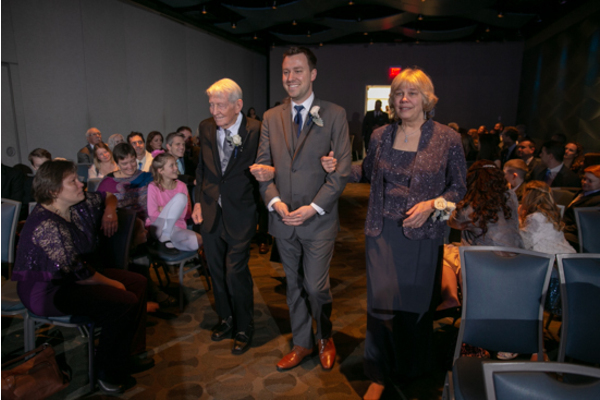 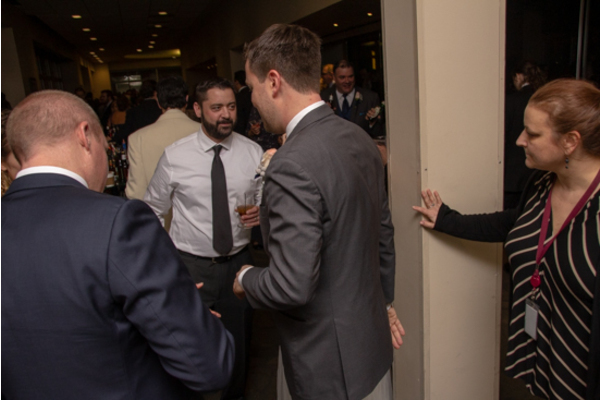 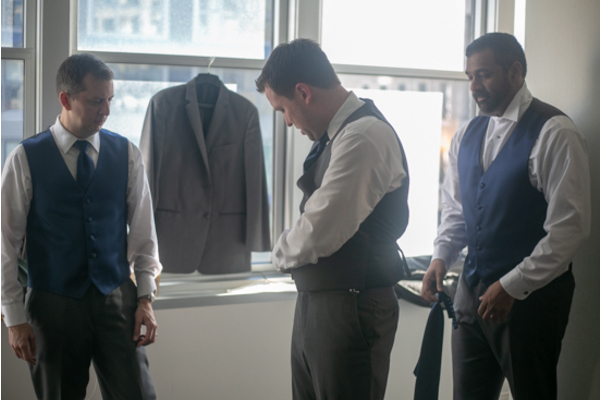 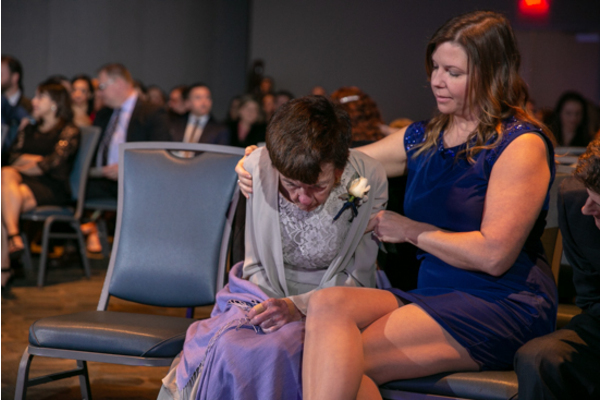 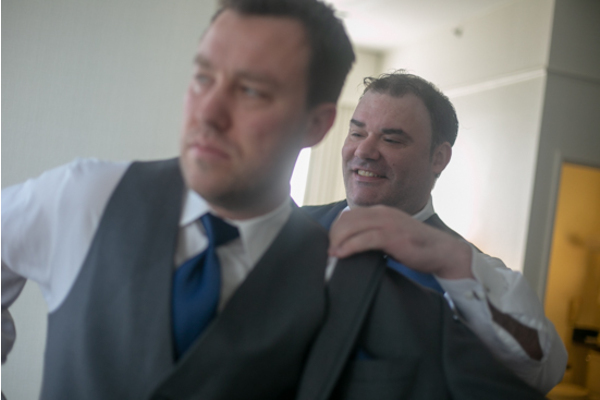 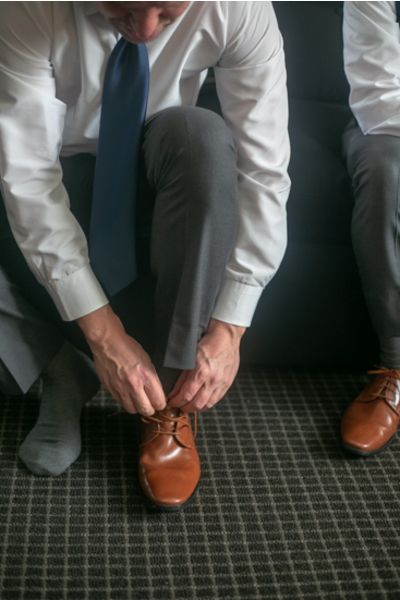 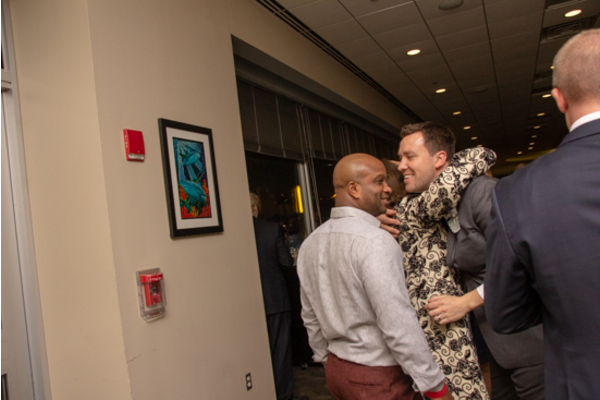 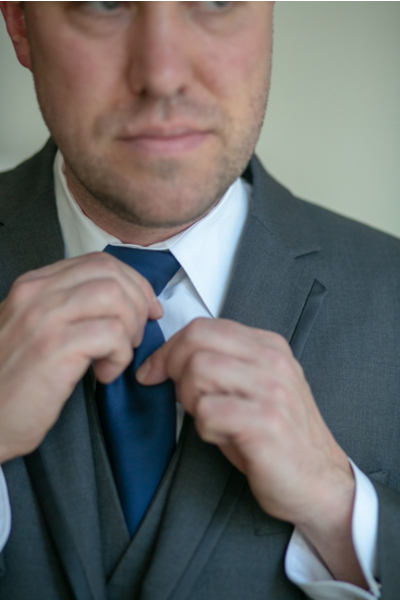 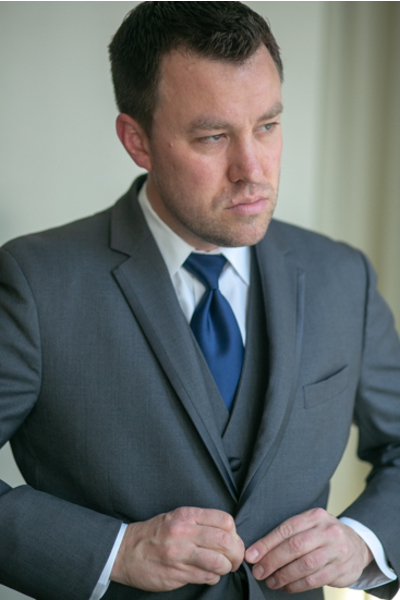 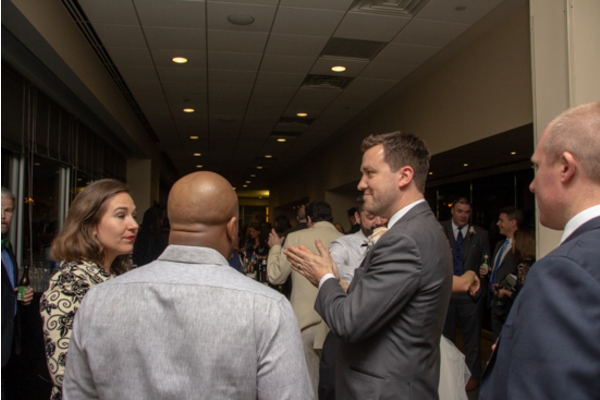 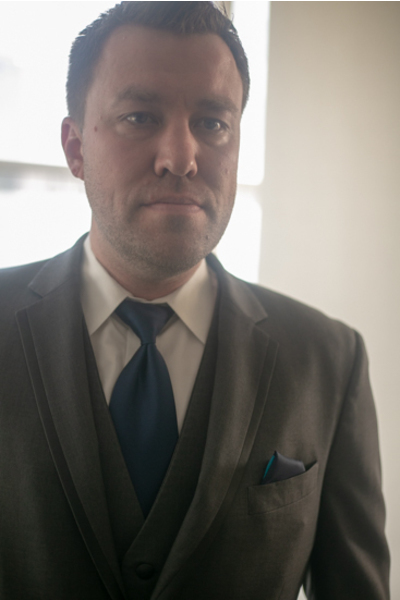 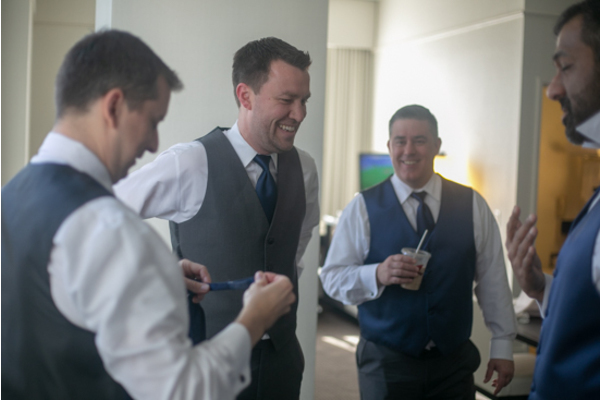 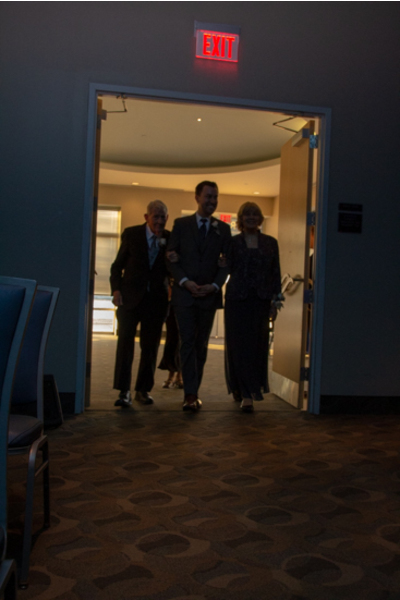 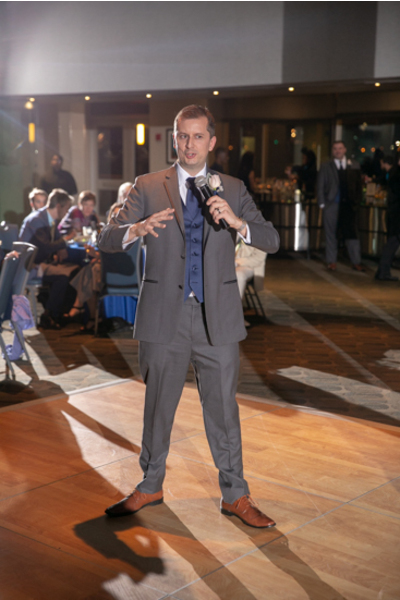 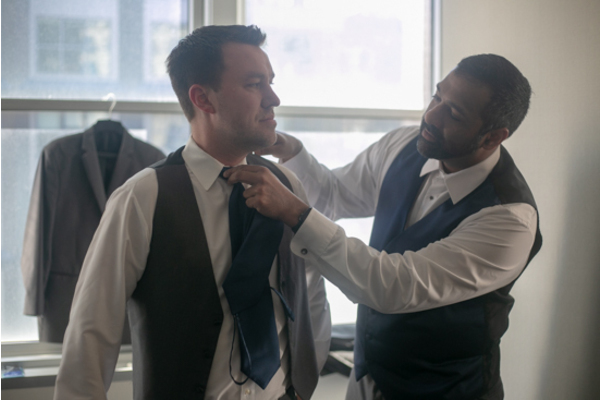 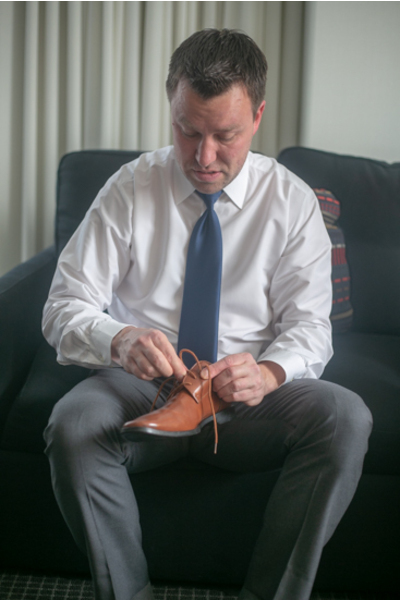 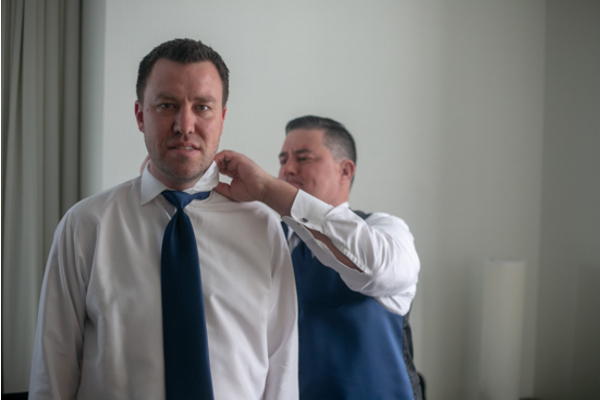 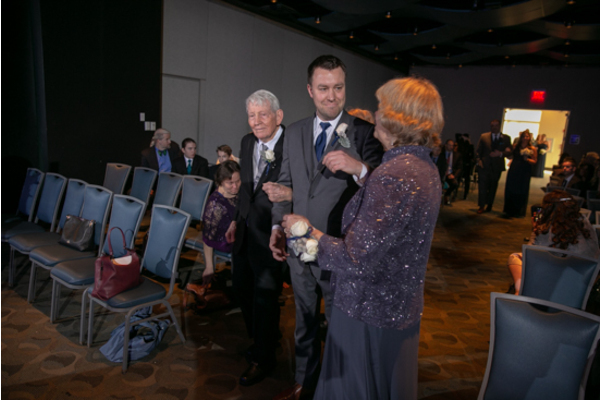 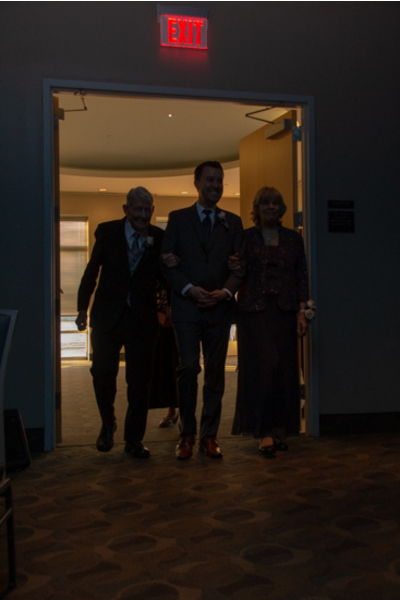 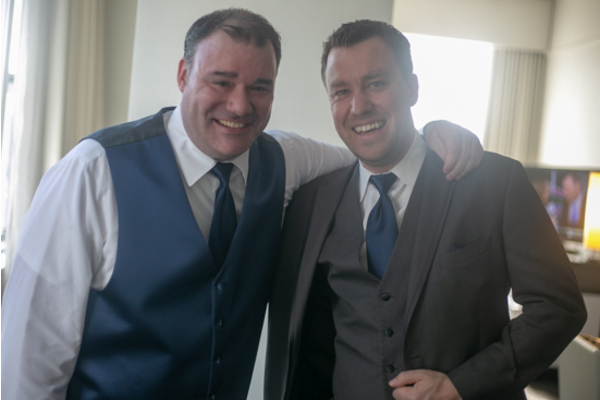 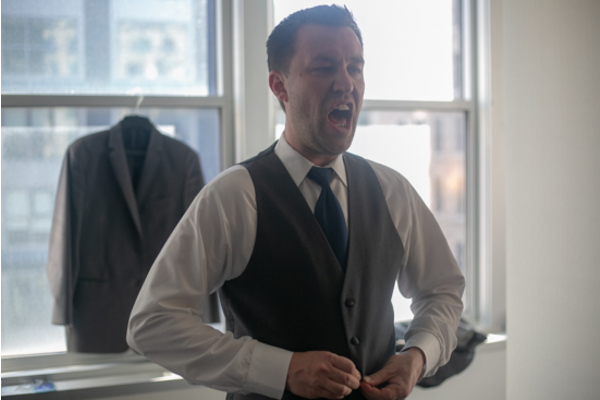 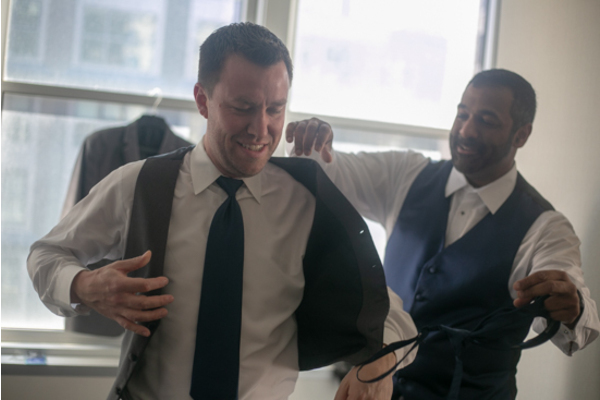 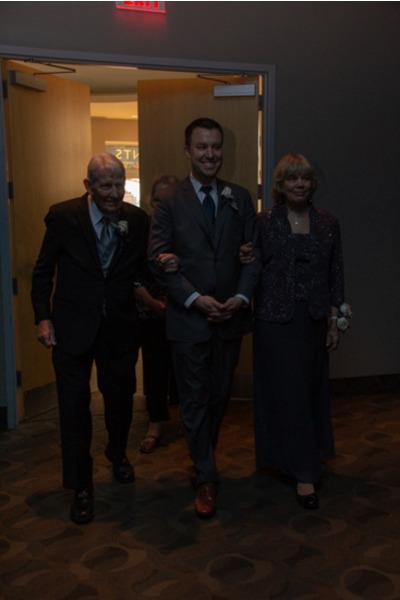 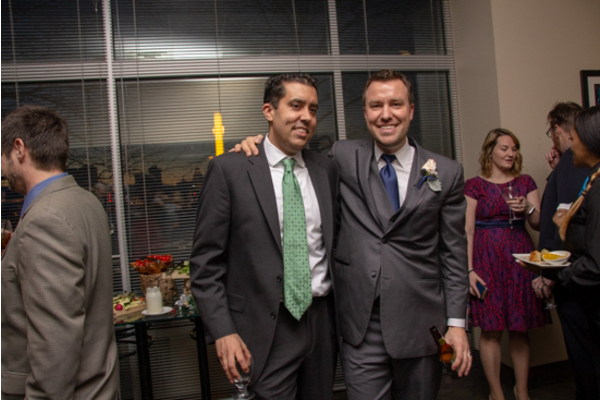 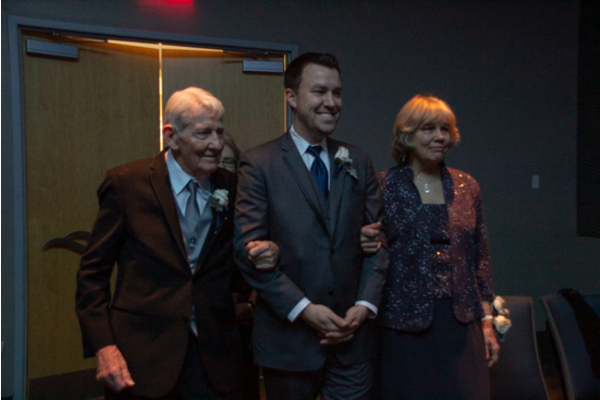 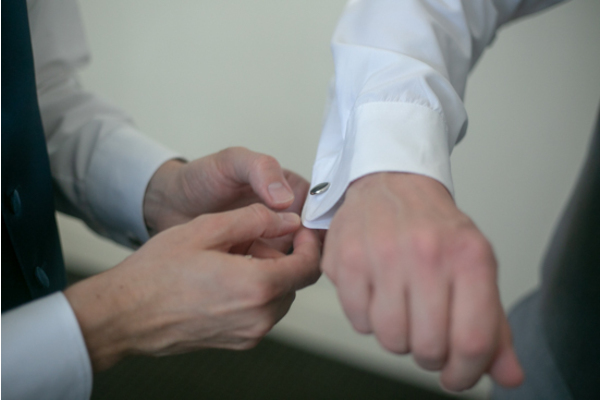 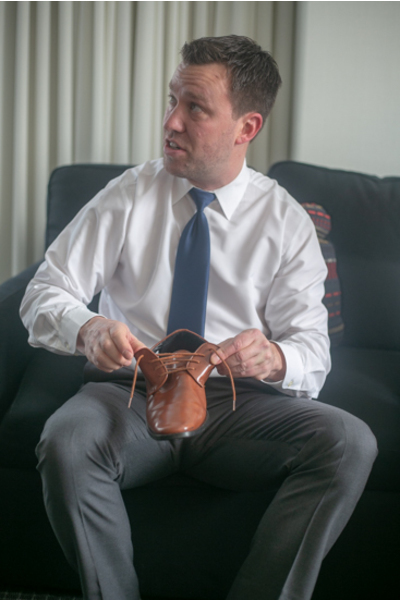 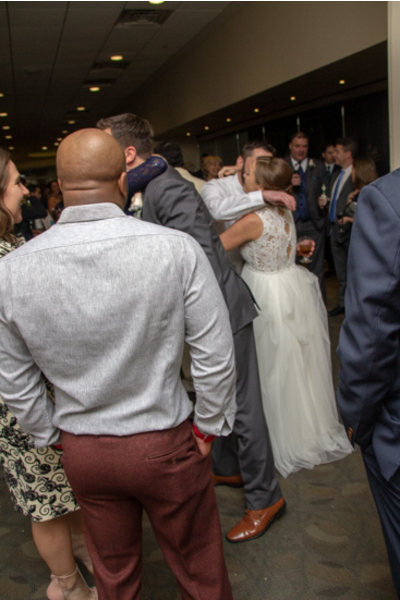 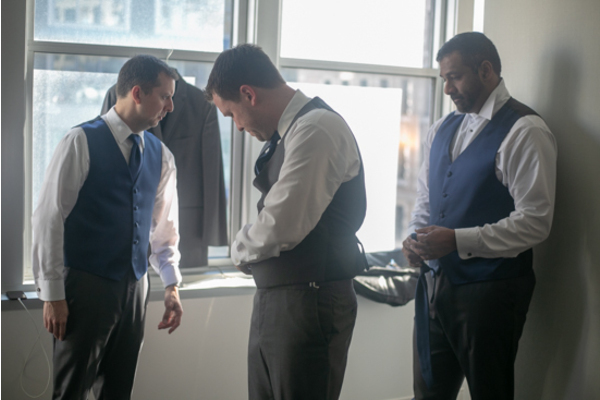 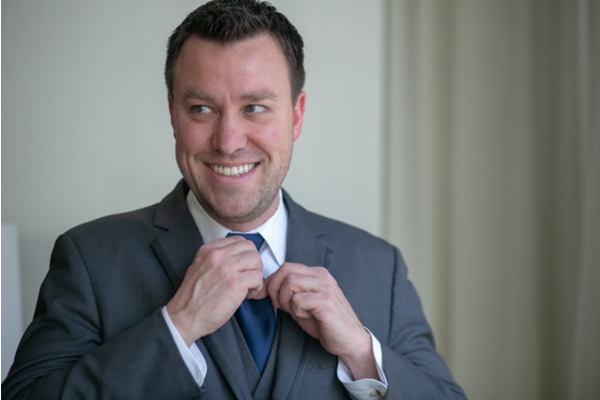 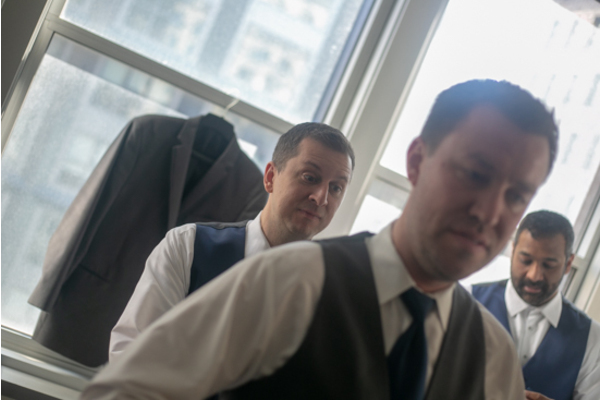 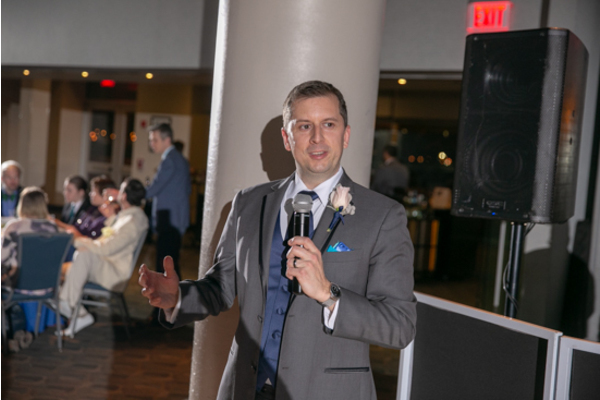 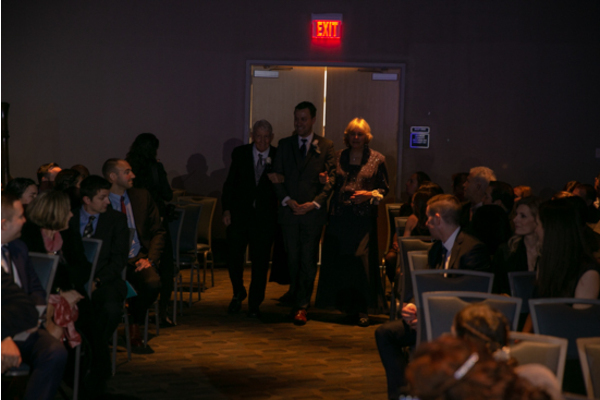 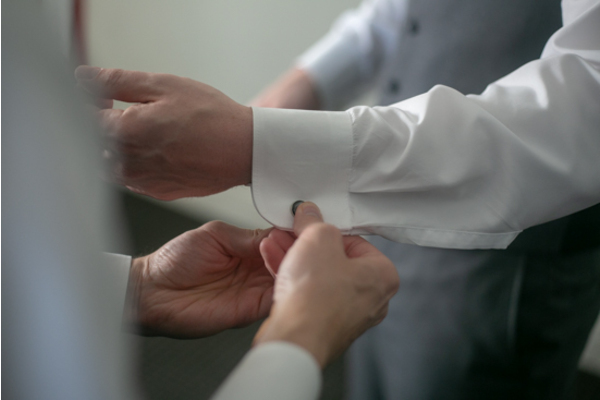 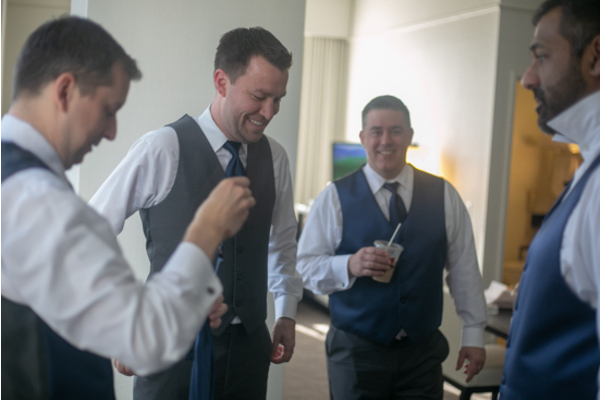 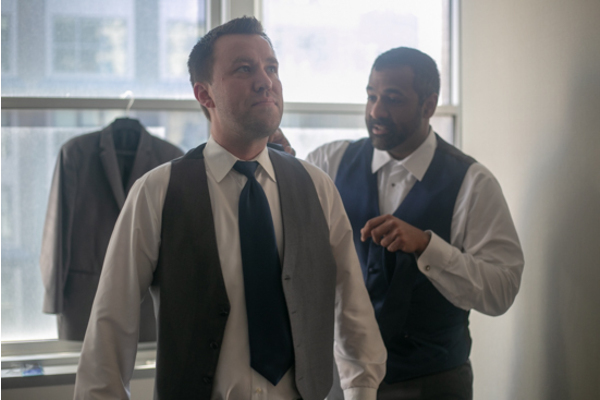 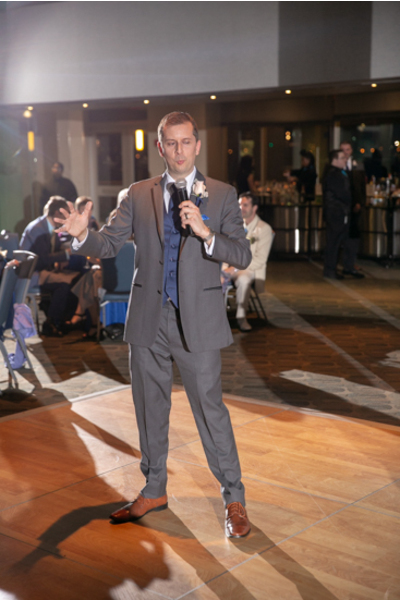 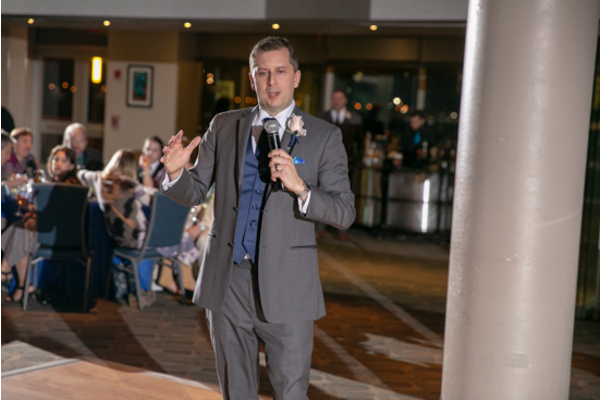 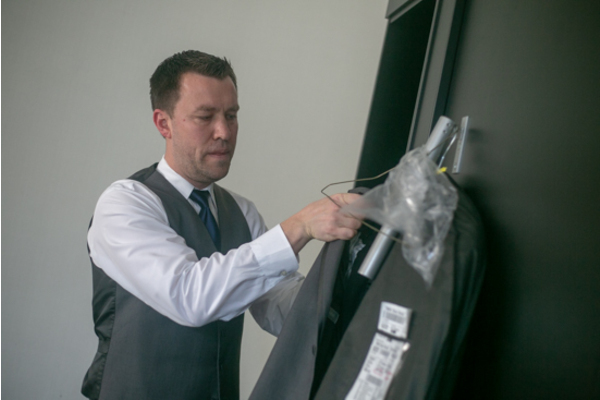 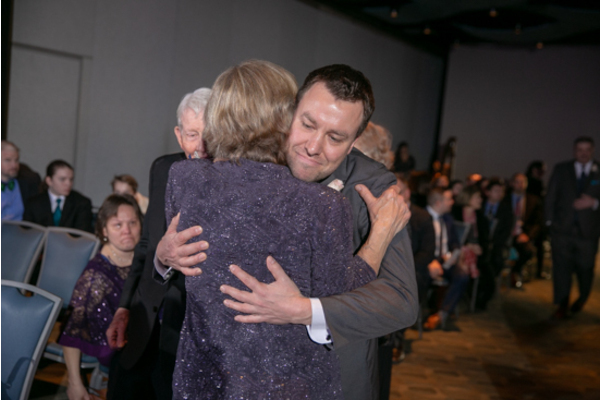 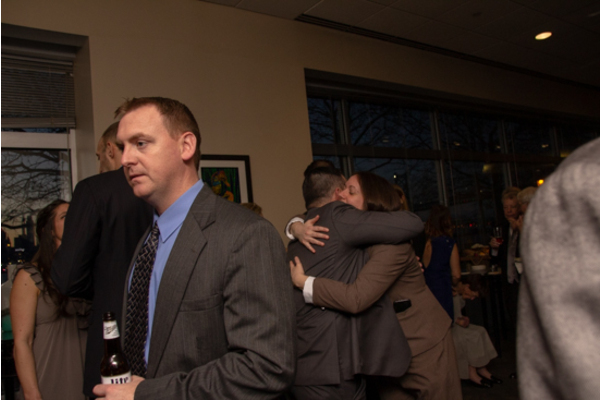 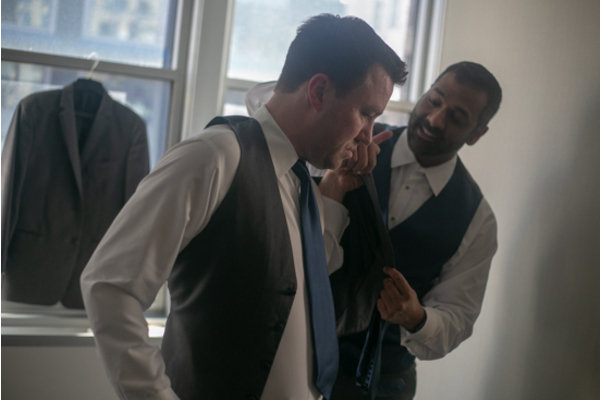 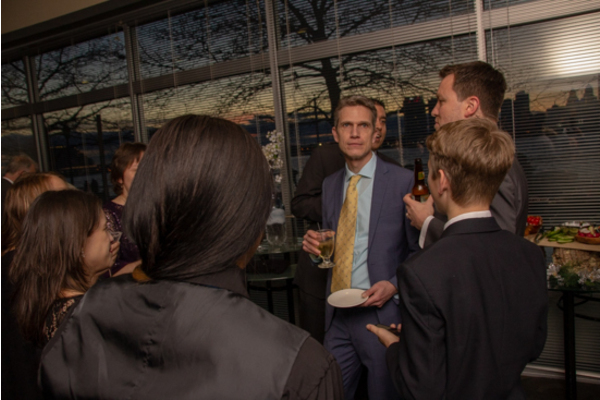 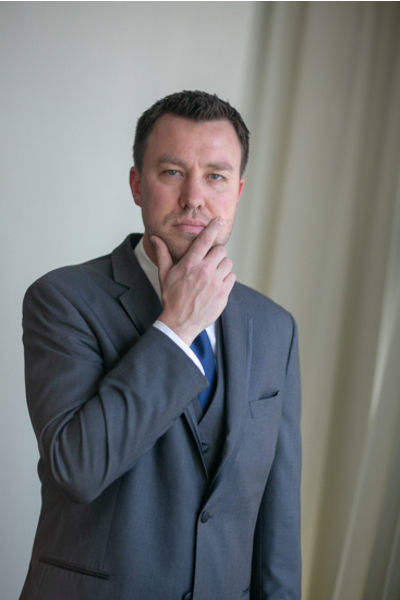 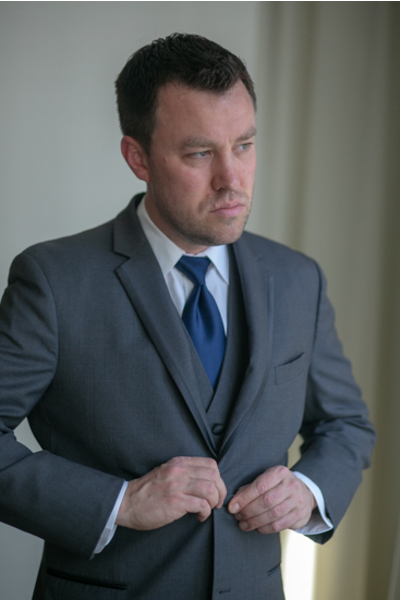 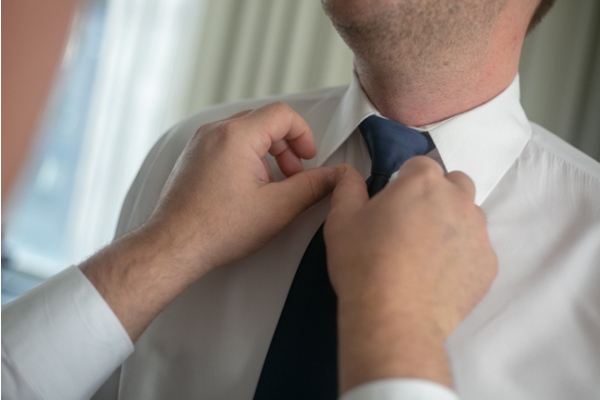 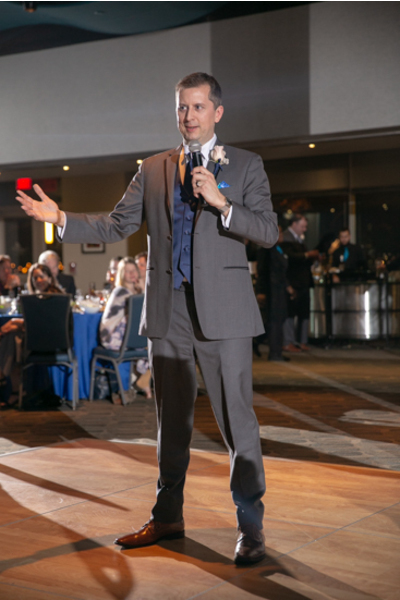 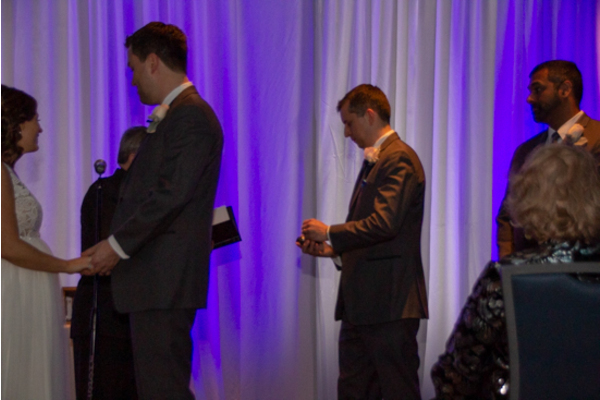 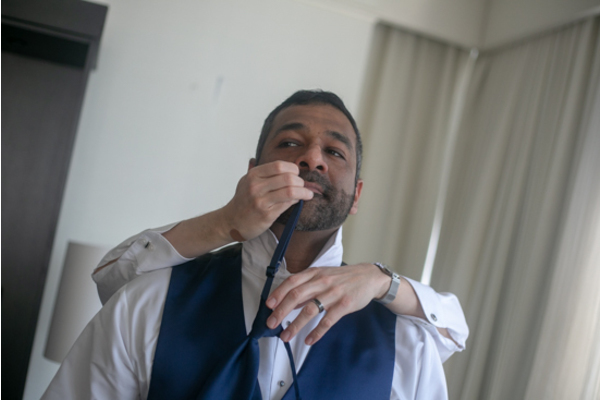 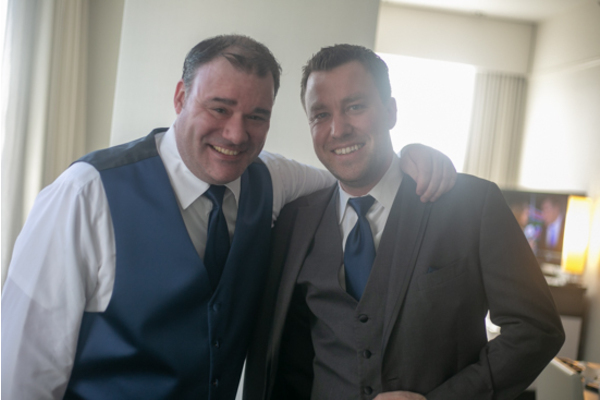 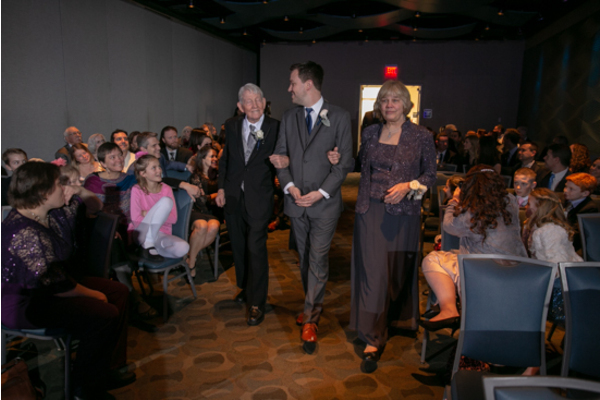 First, Dan put on his navy tie and gray suit with the help of his best man. 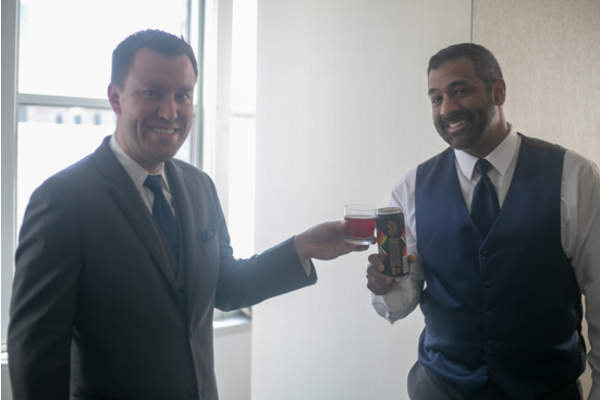 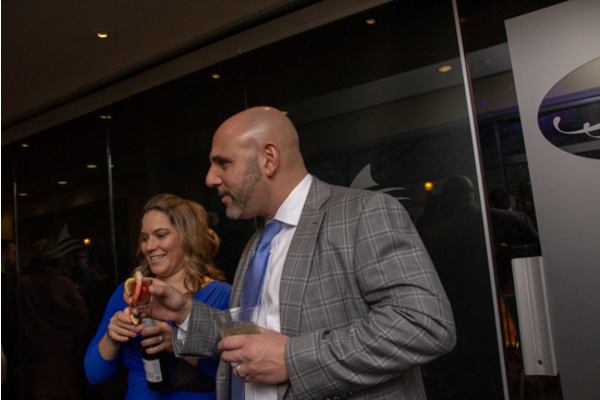 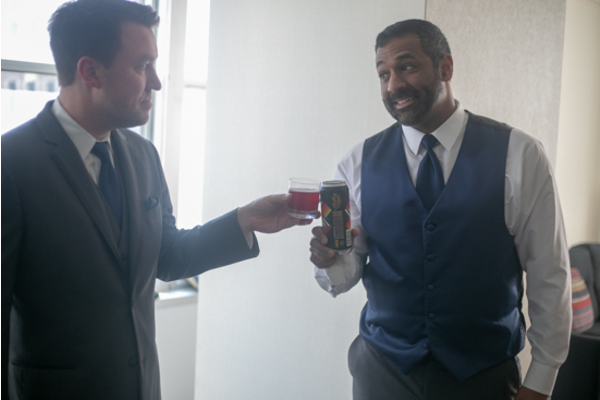 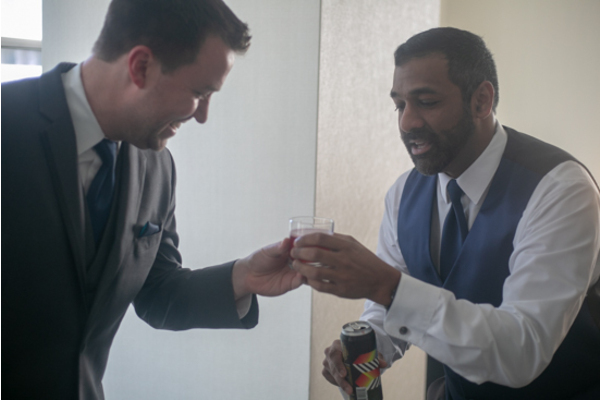 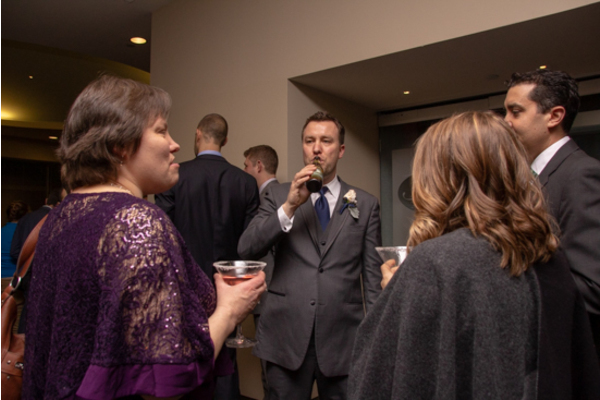 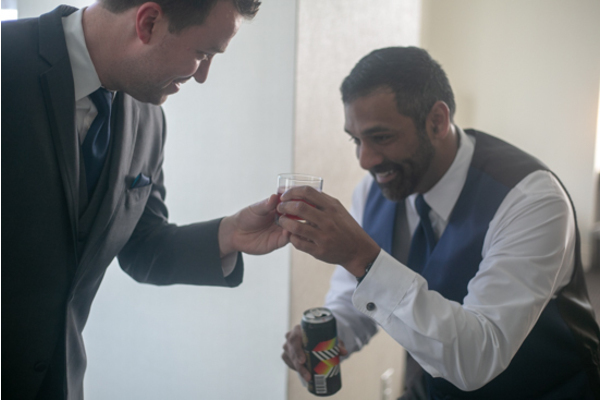 With his drink of choice in hand, he toasted to the rest of the perfect day ahead! 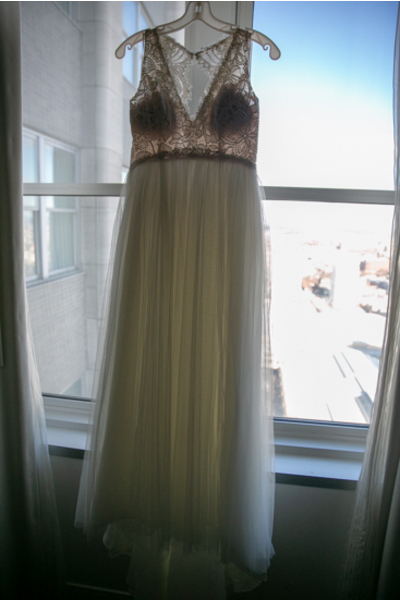 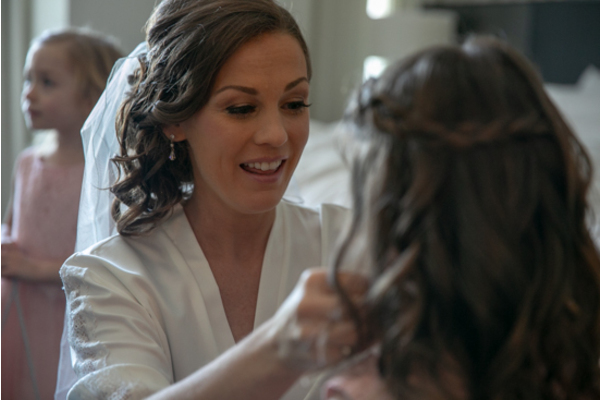 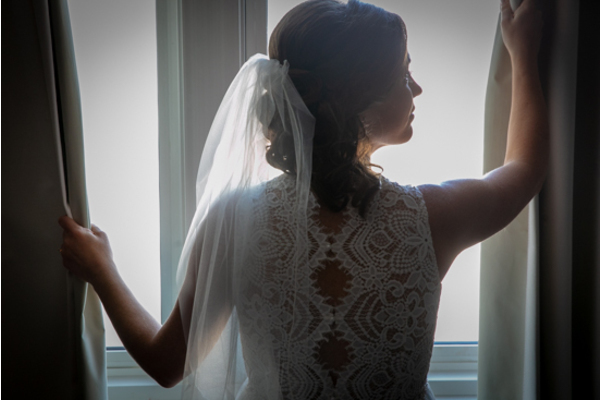 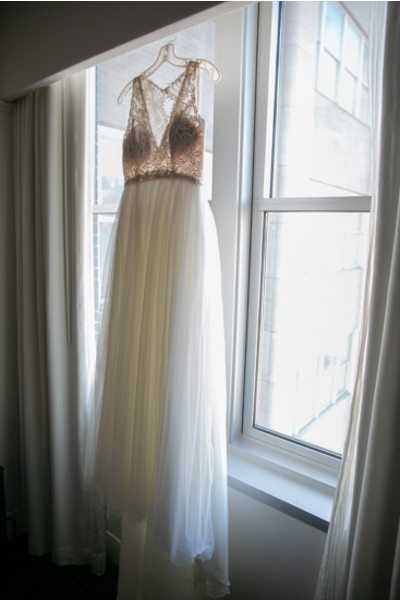 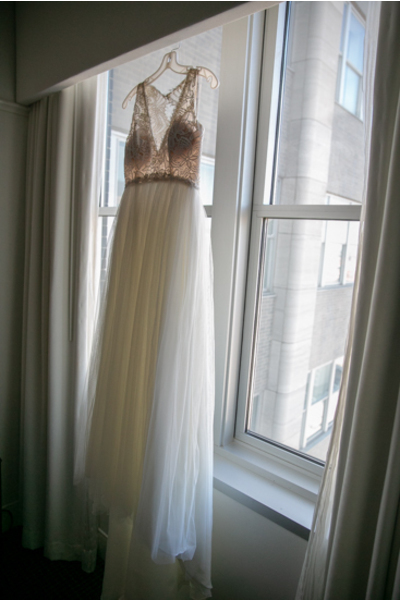 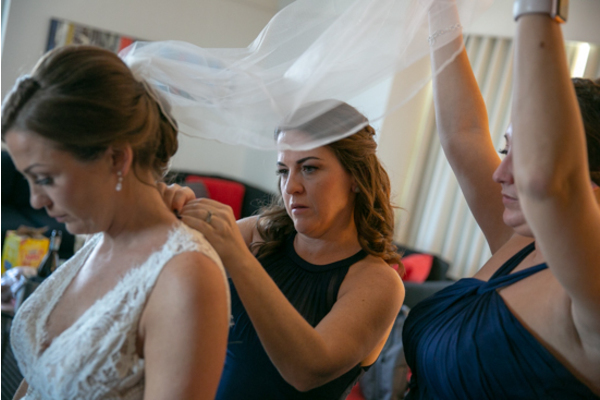 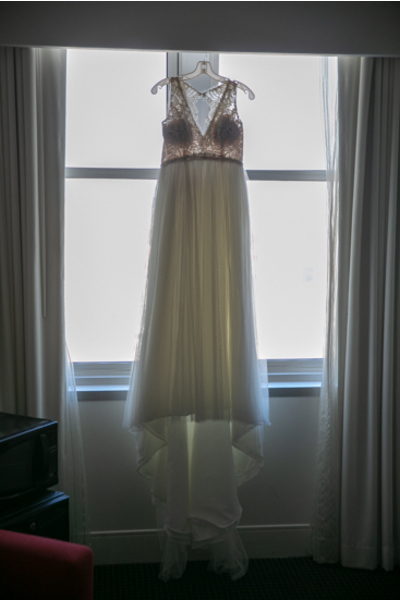 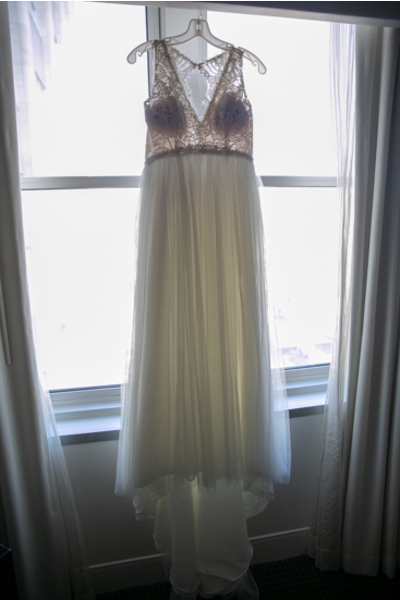 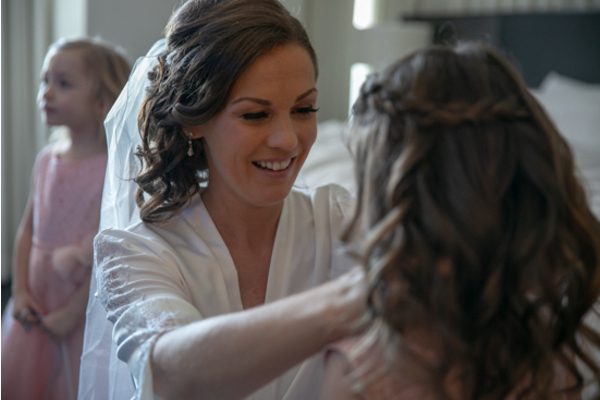 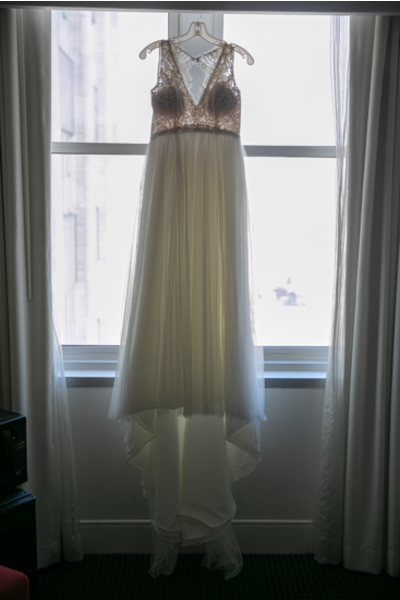 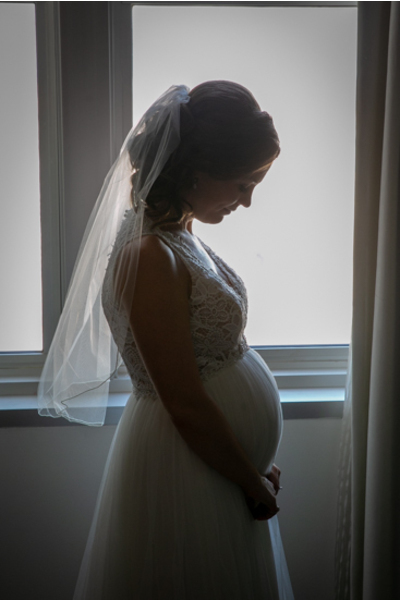 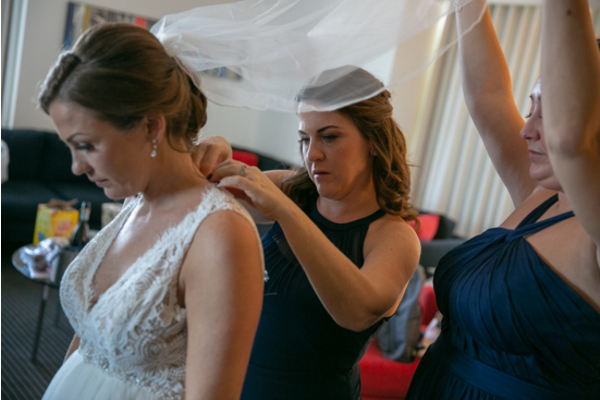 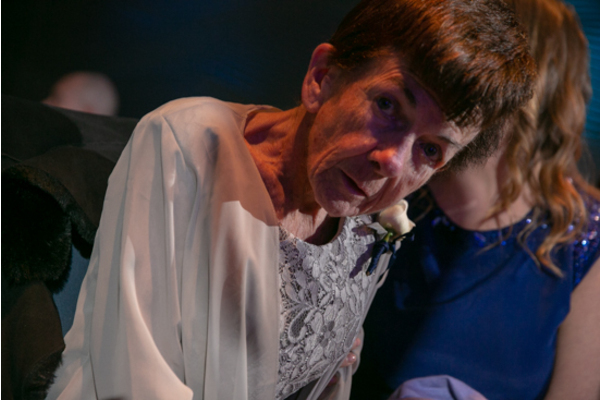 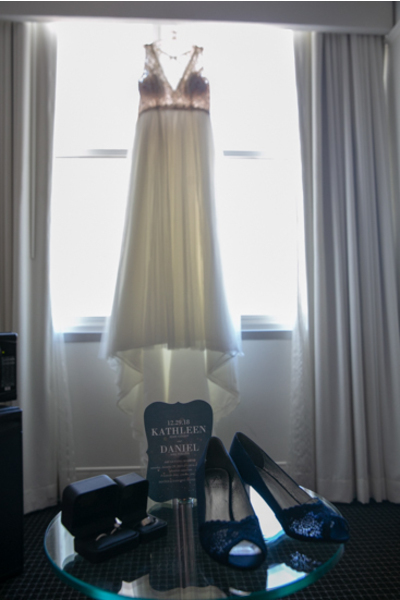 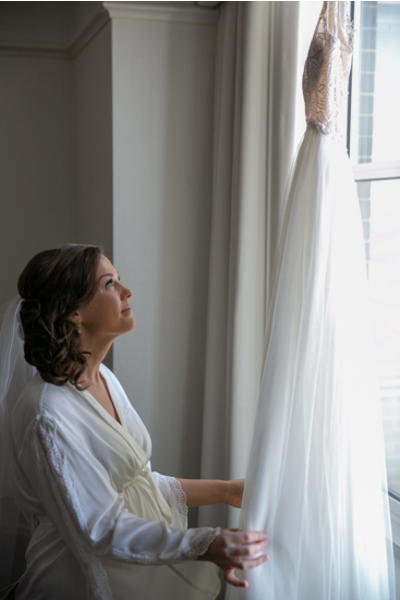 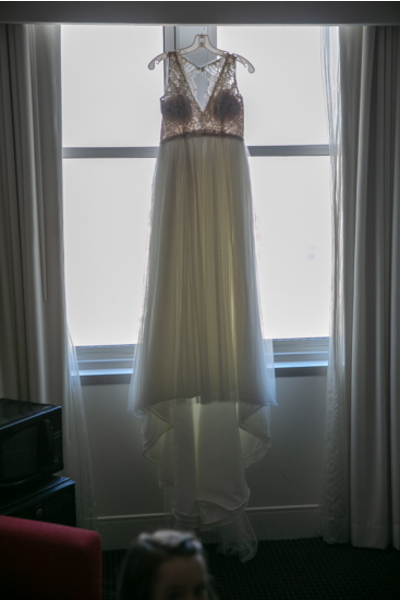 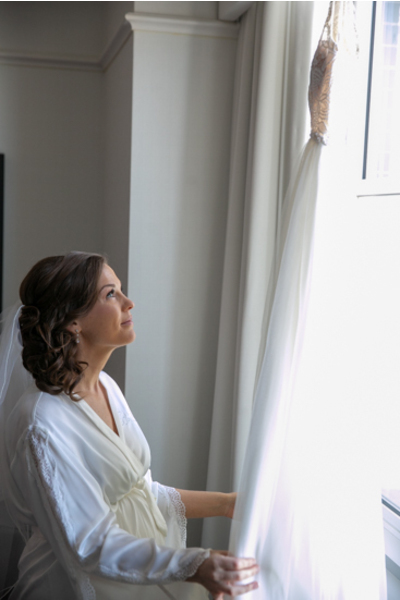 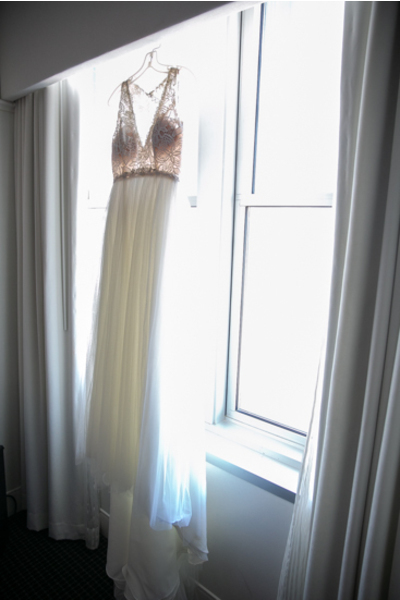 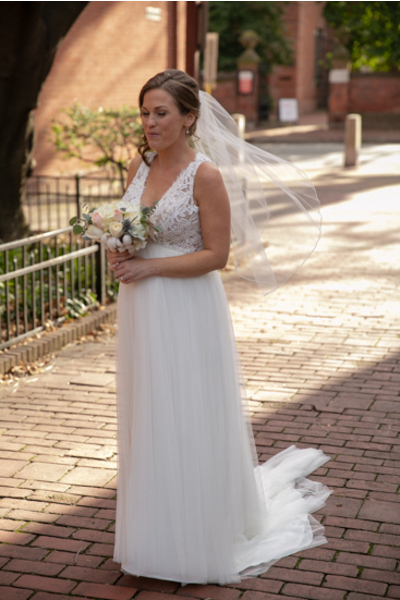 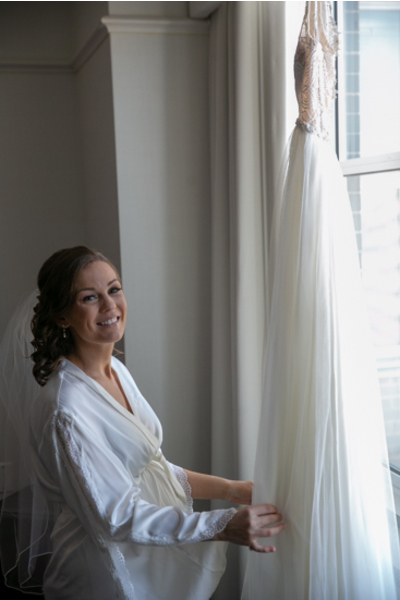 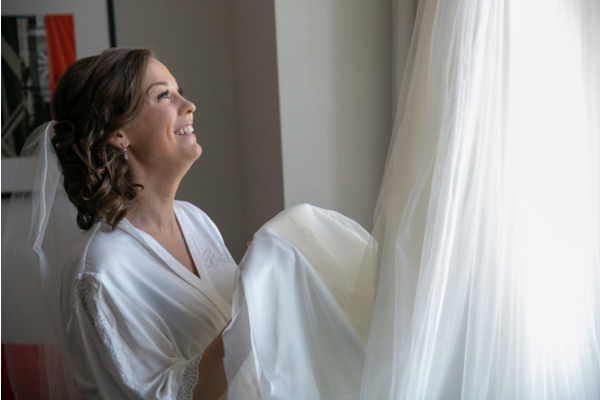 Meanwhile, Katie wore a stunning white silk robe as she admired her wedding dress hanging from the window. 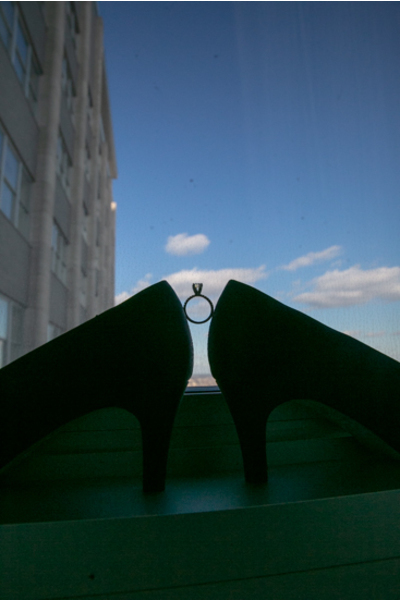 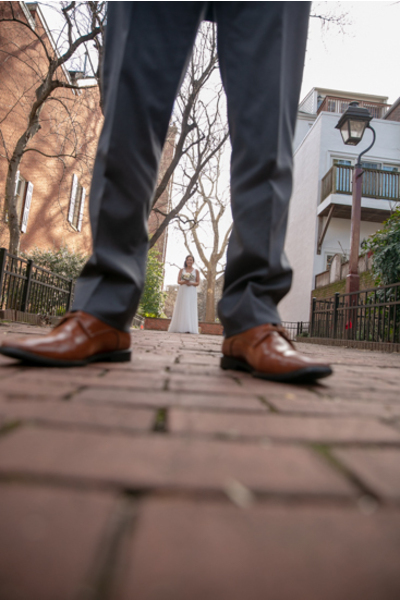 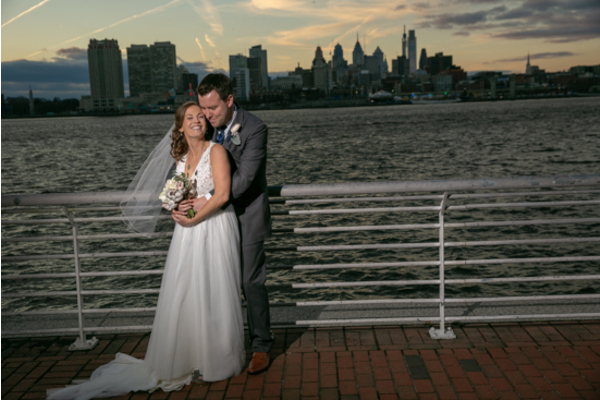 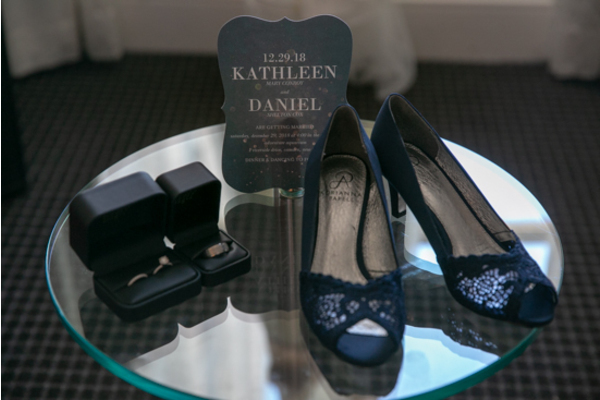 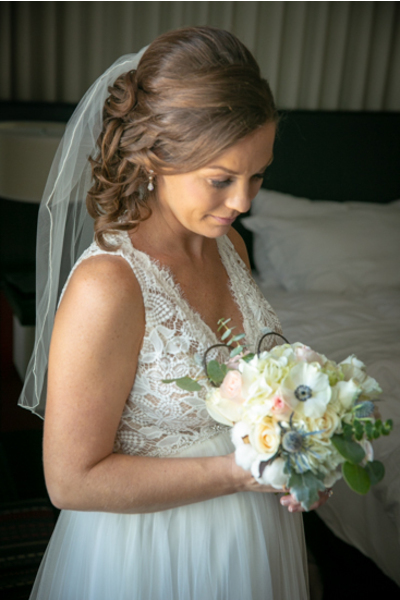 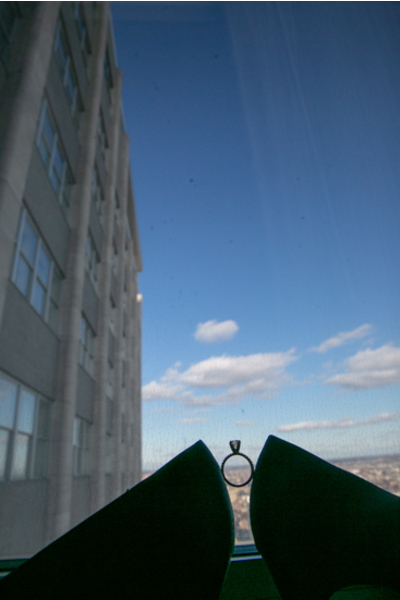 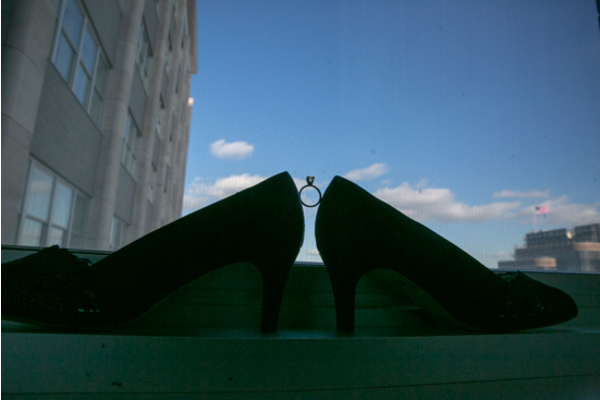 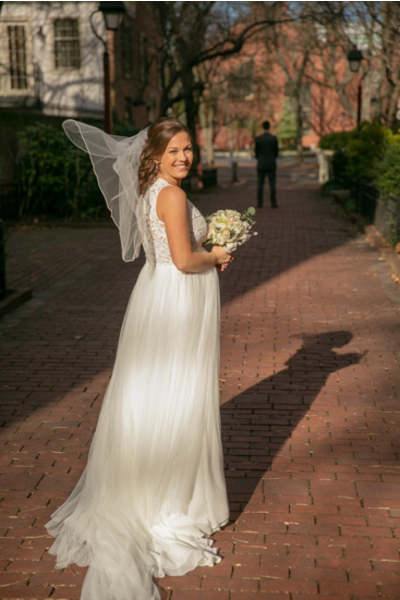 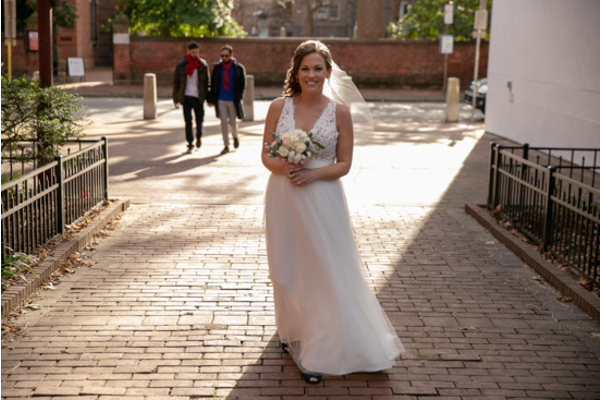 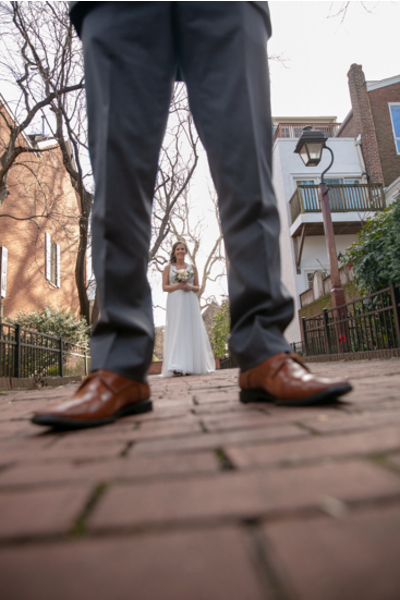 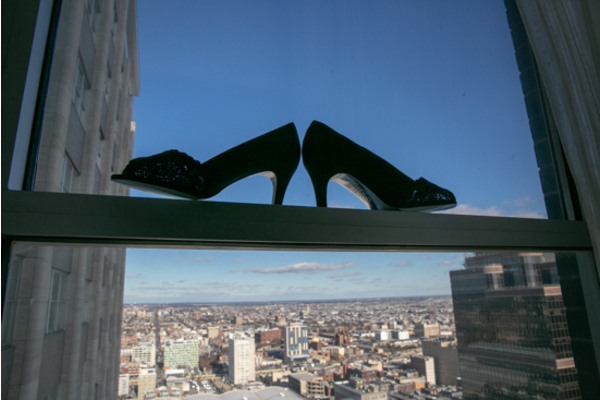 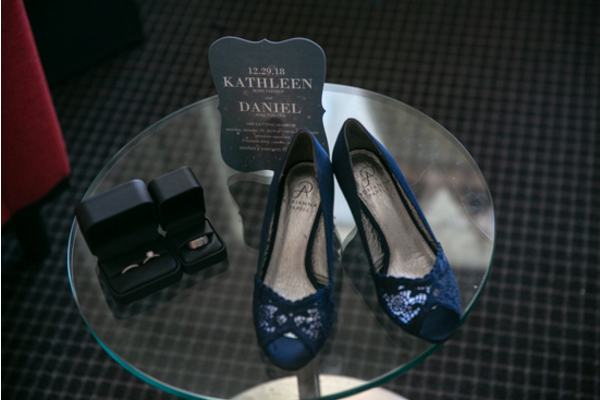 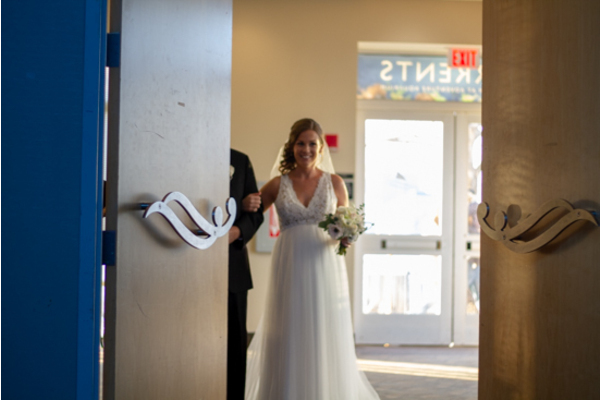 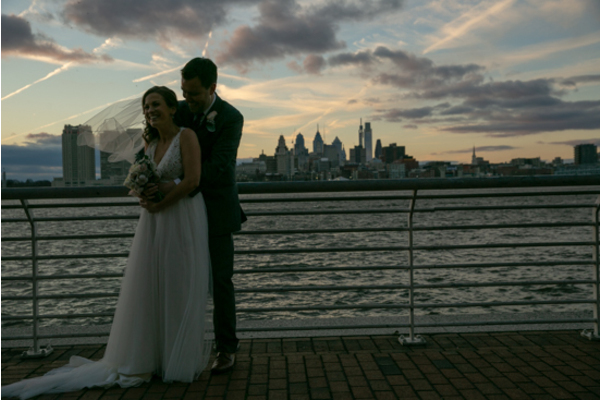 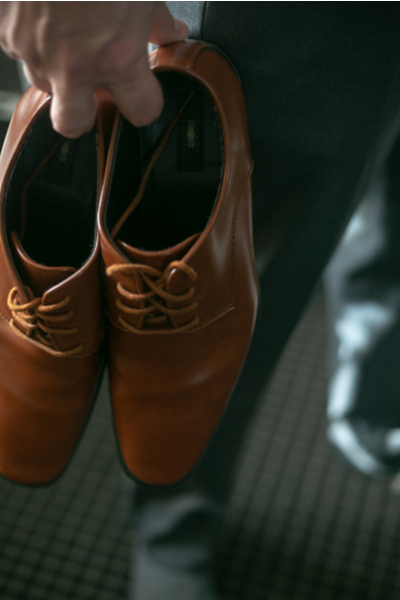 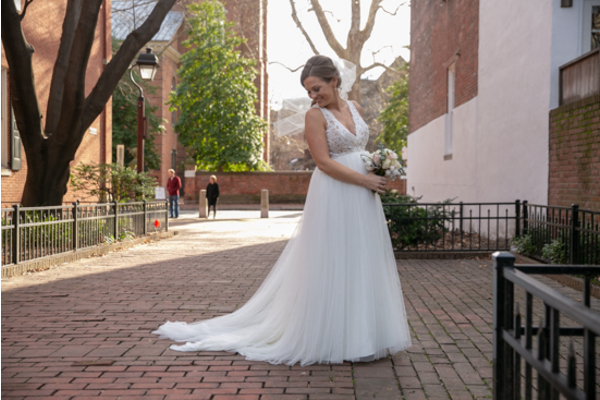 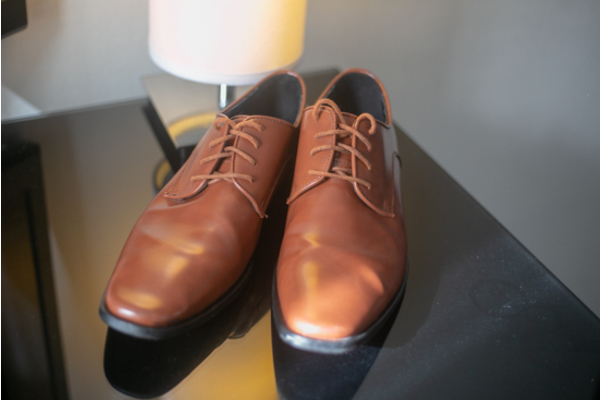 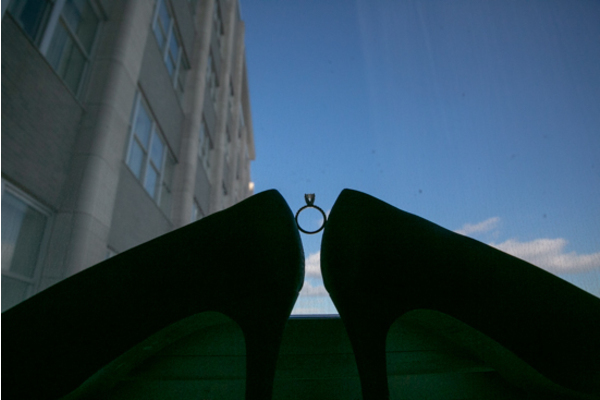 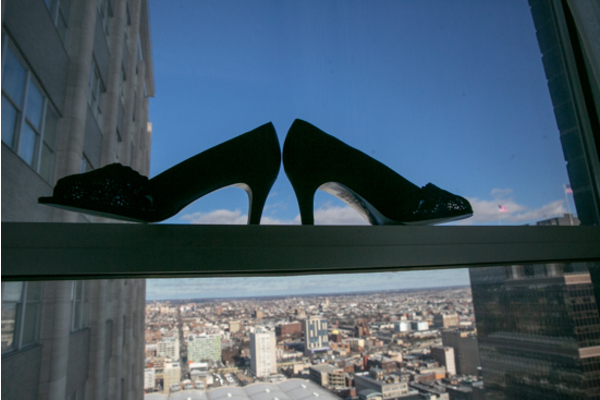 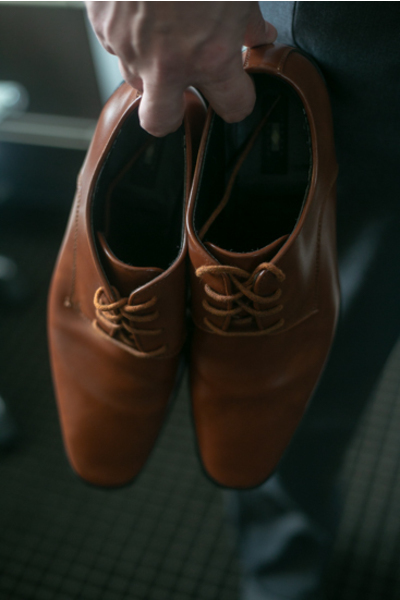 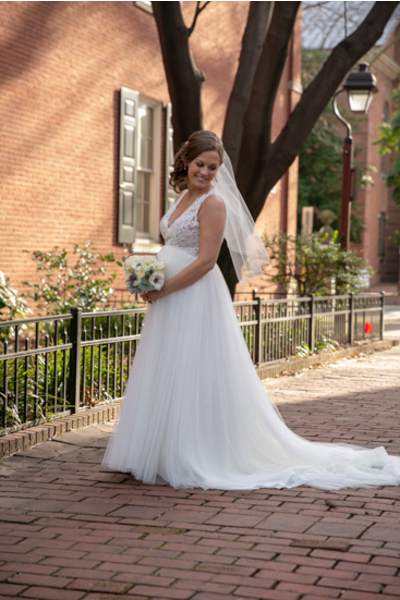 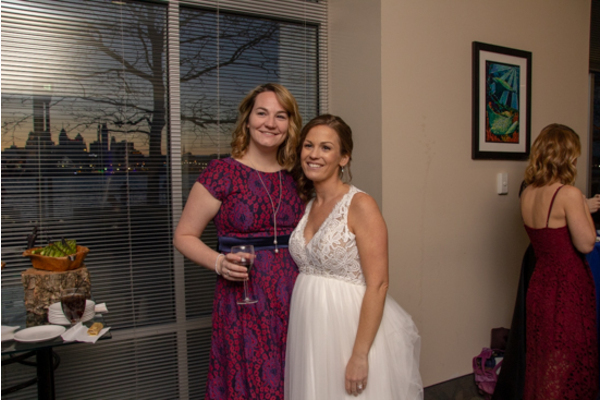 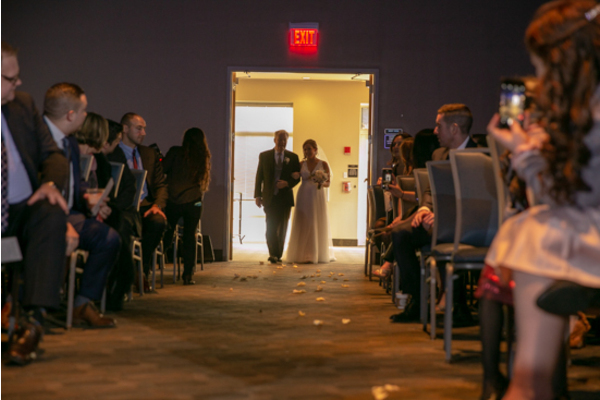 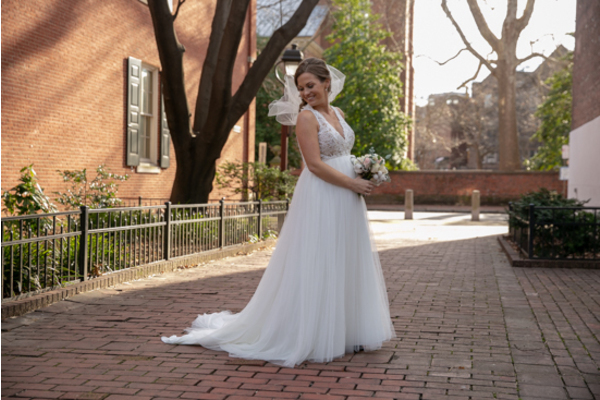 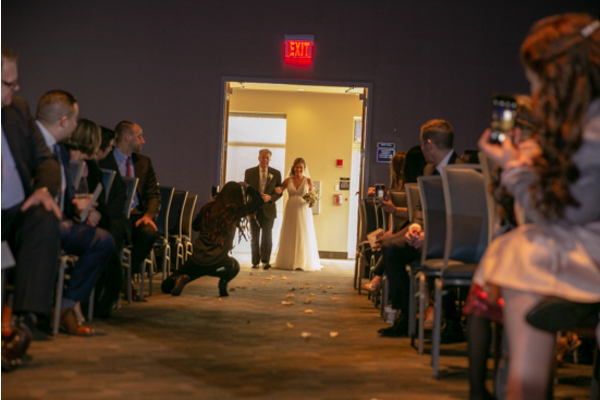 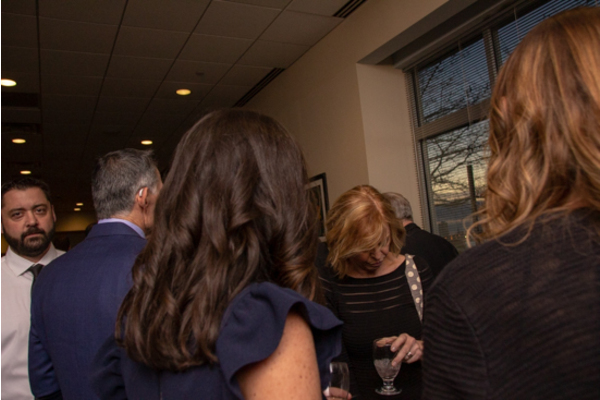 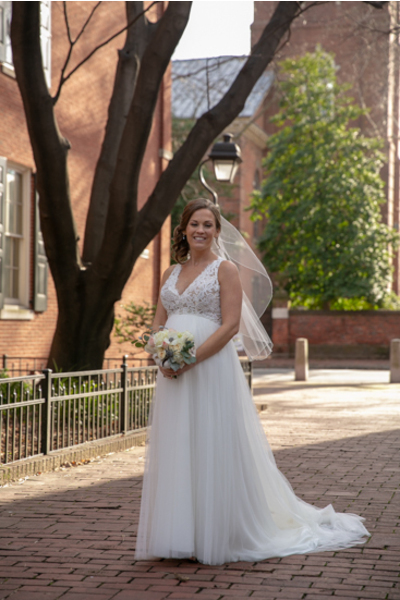 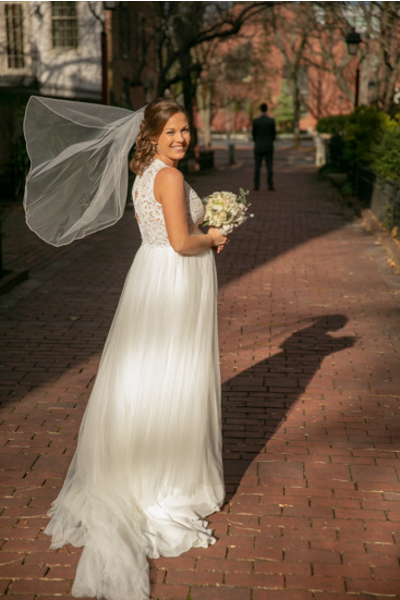 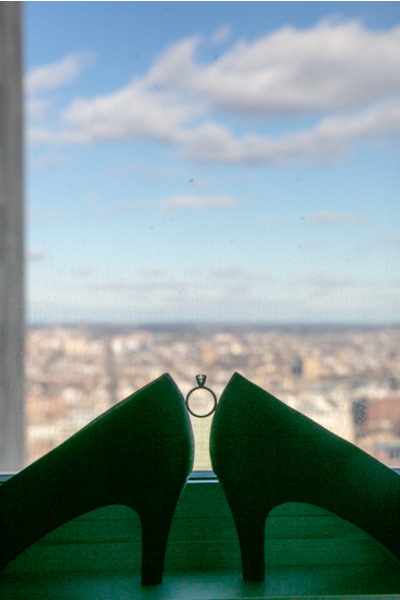 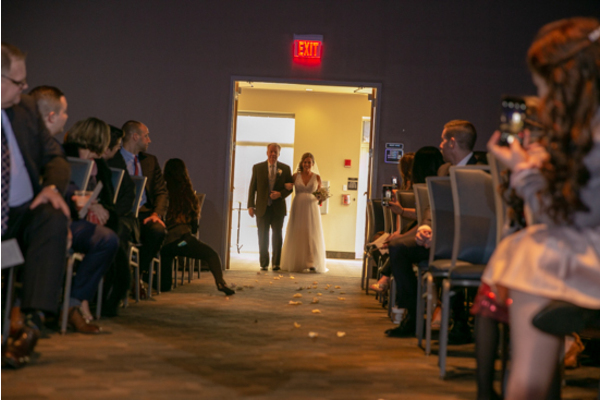 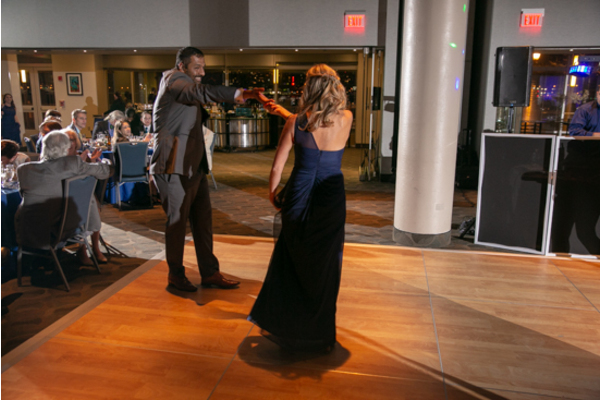 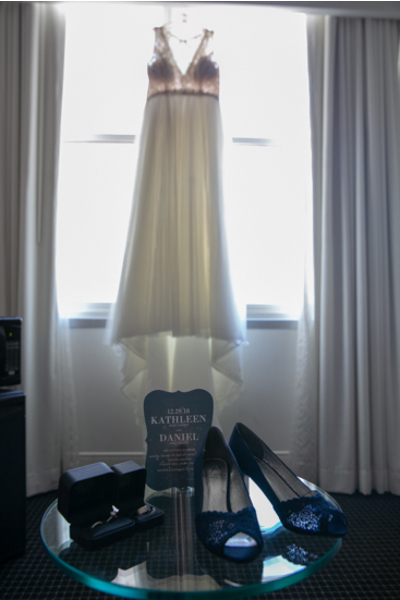 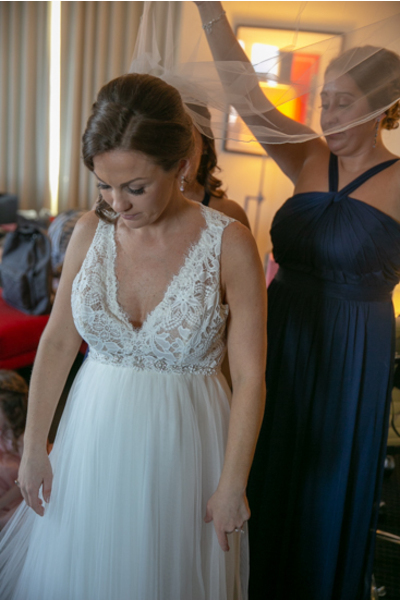 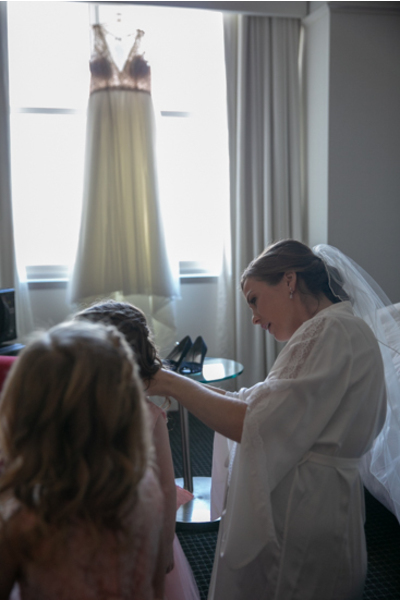 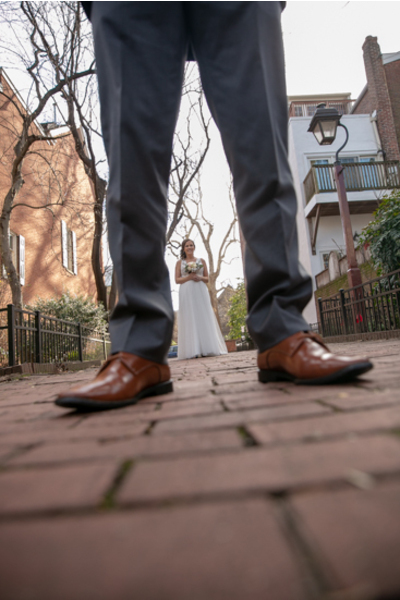 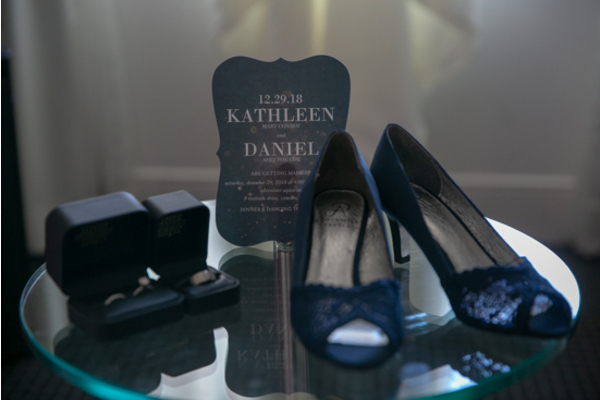 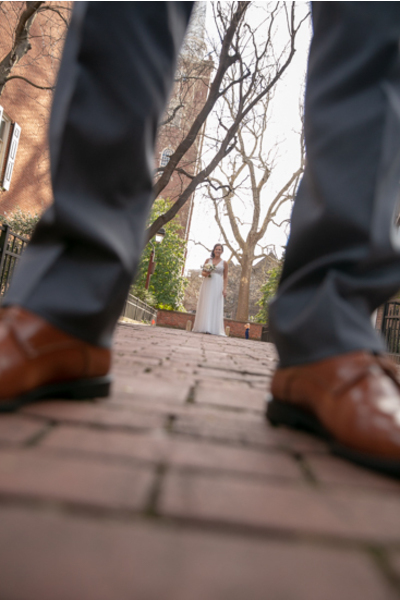 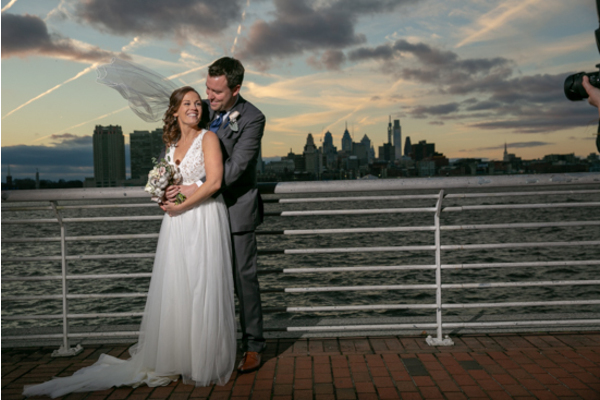 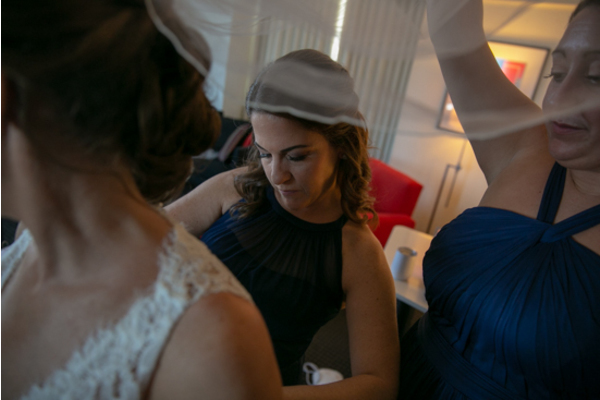 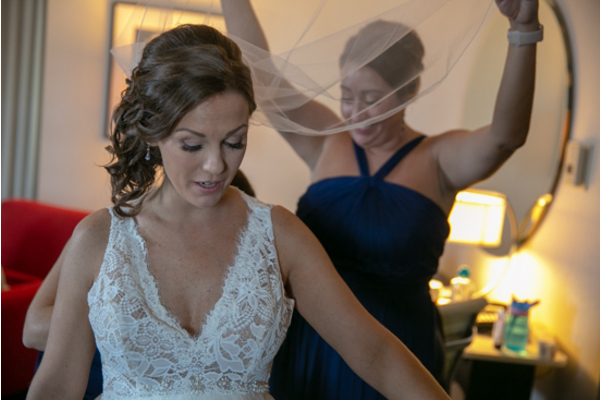 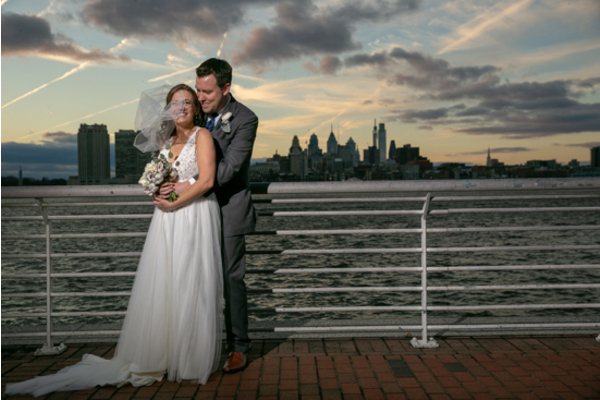 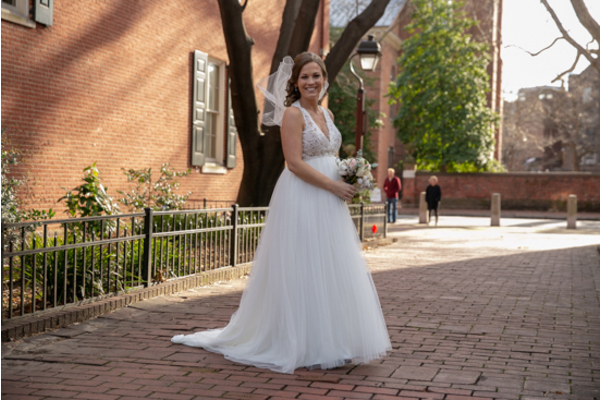 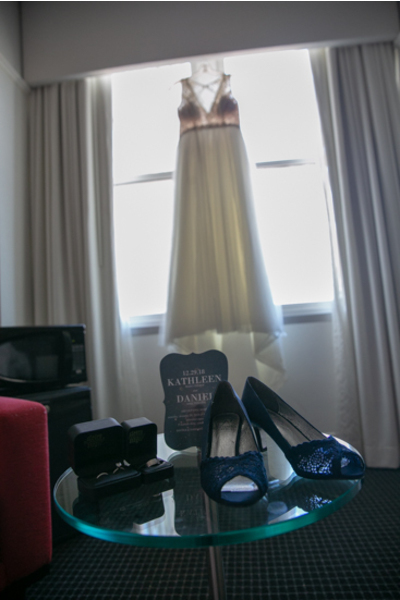 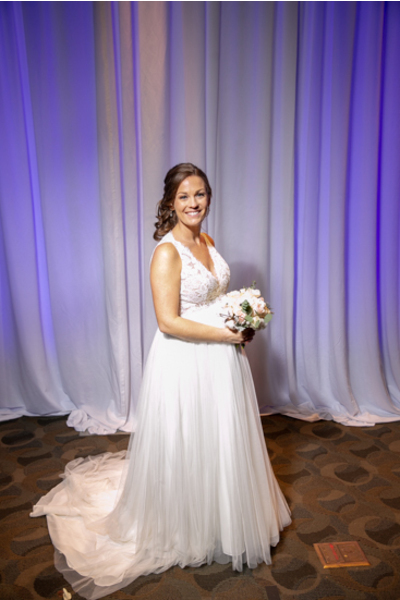 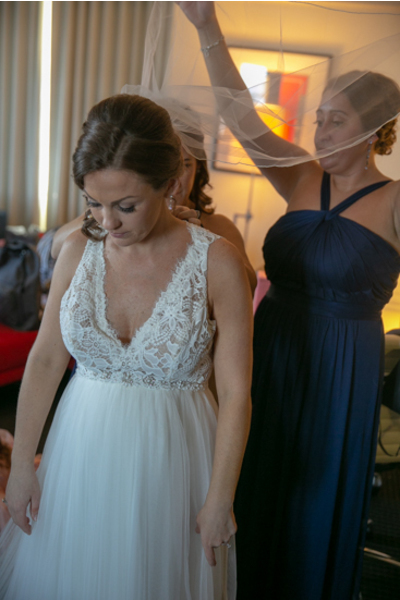 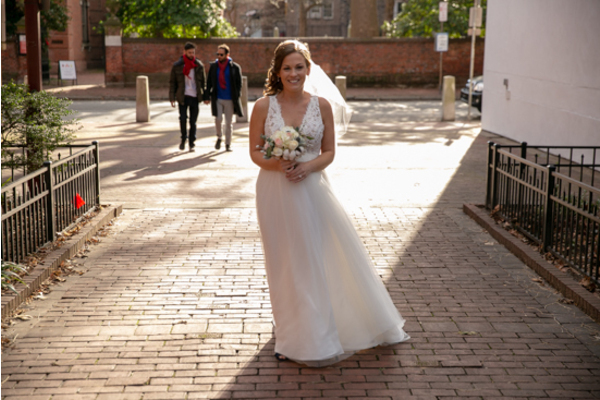 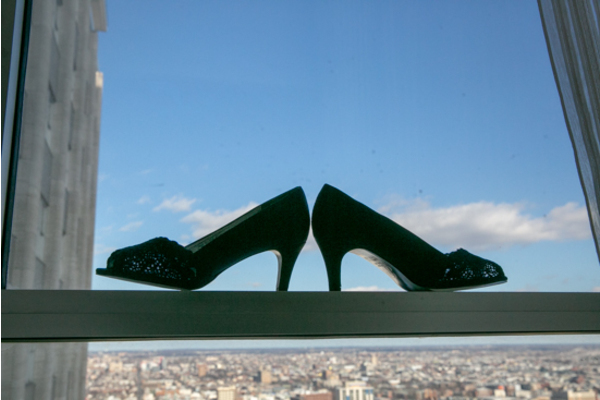 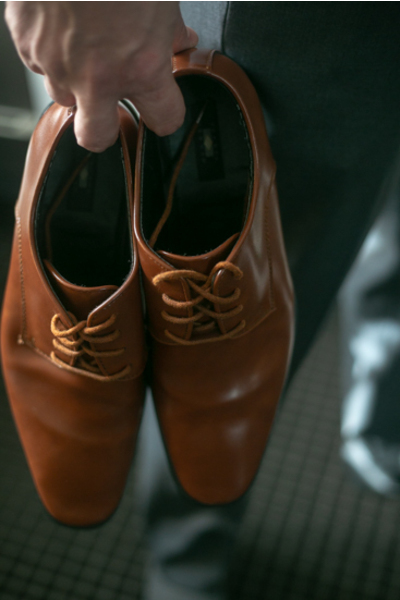 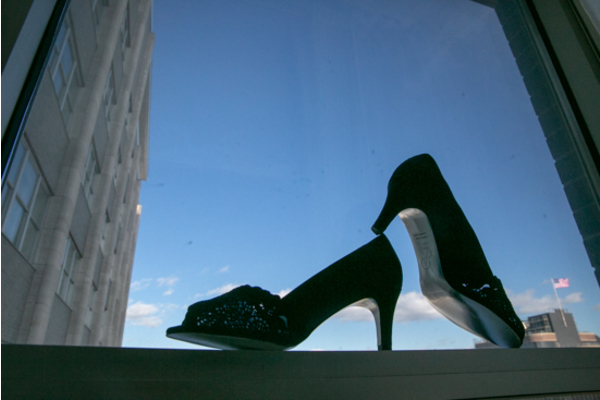 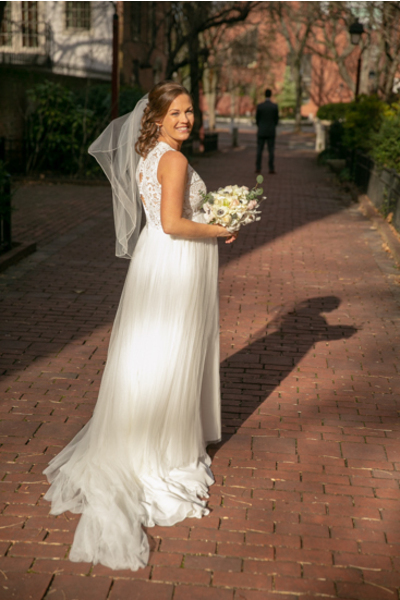 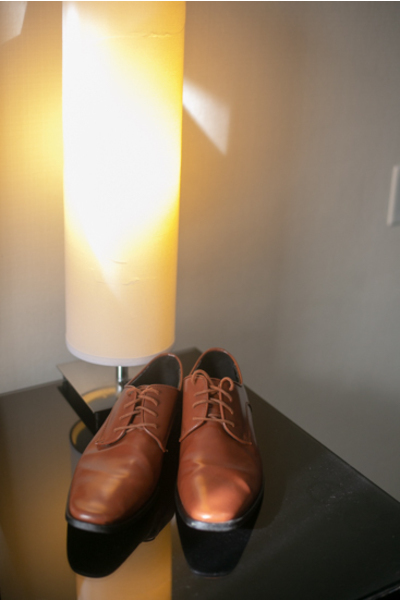 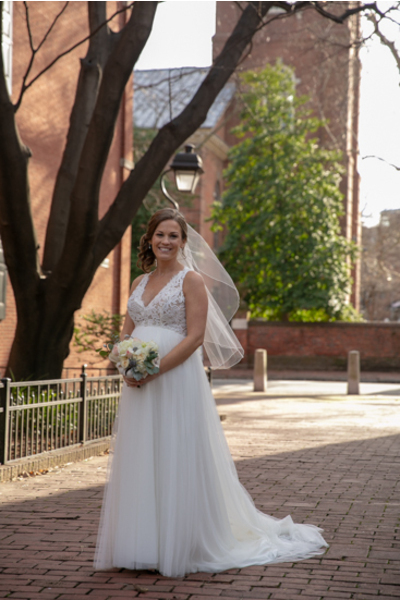 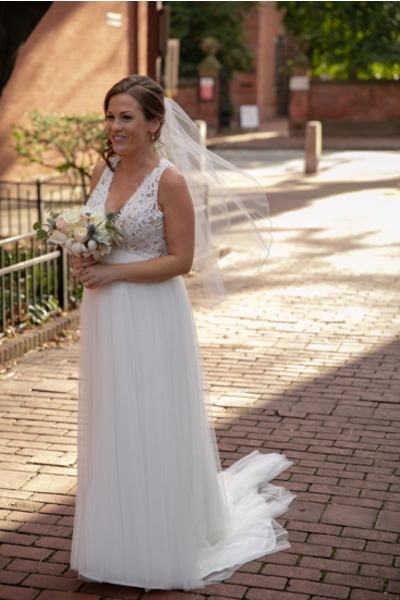 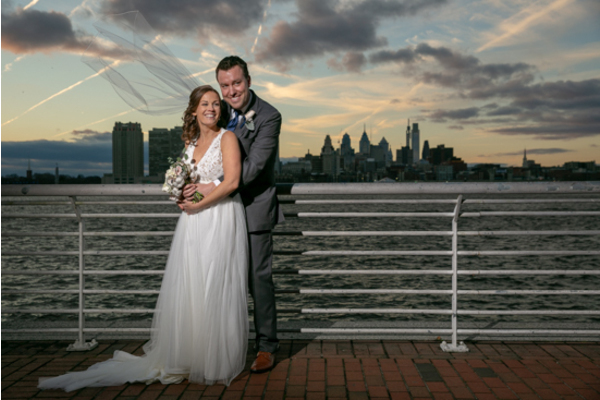 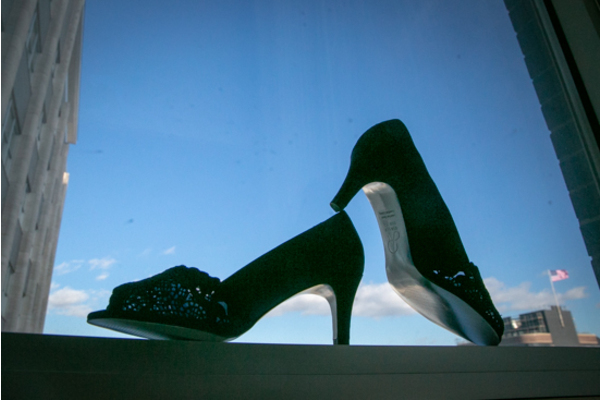 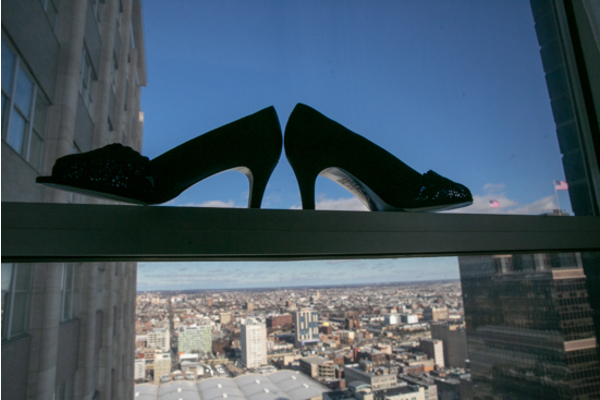 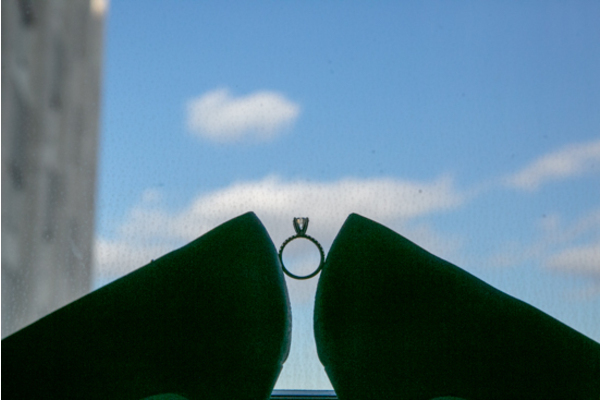 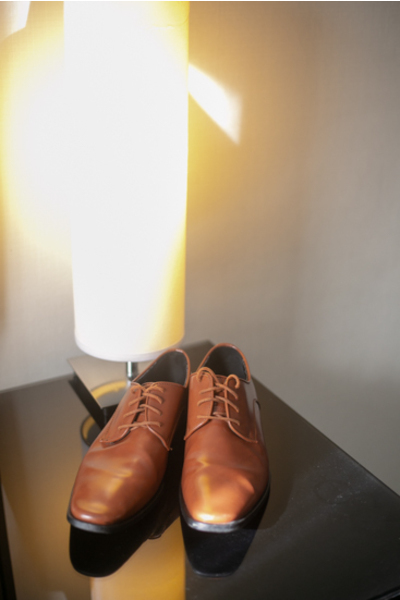 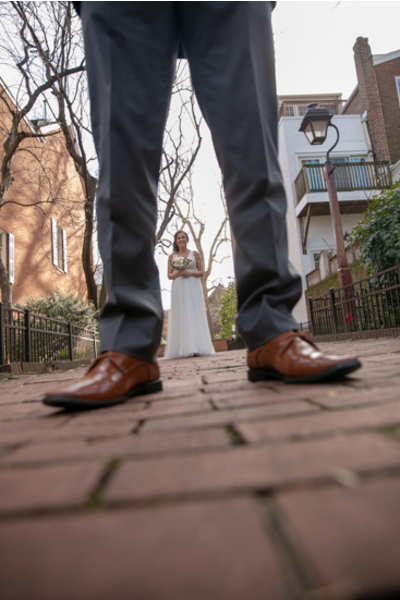 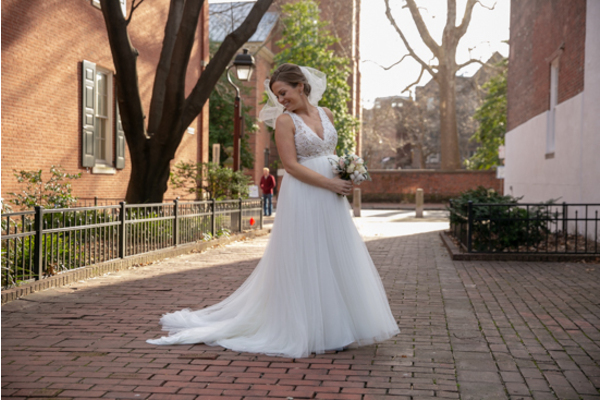 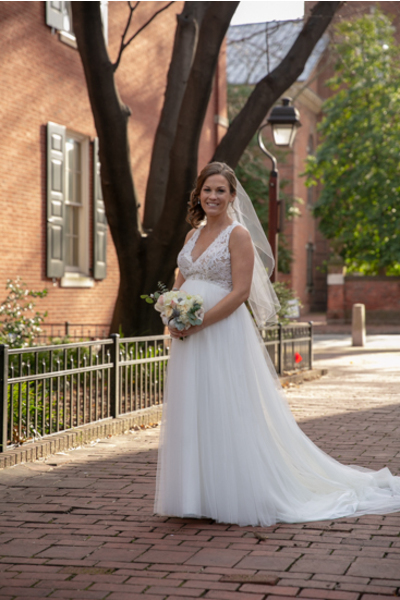 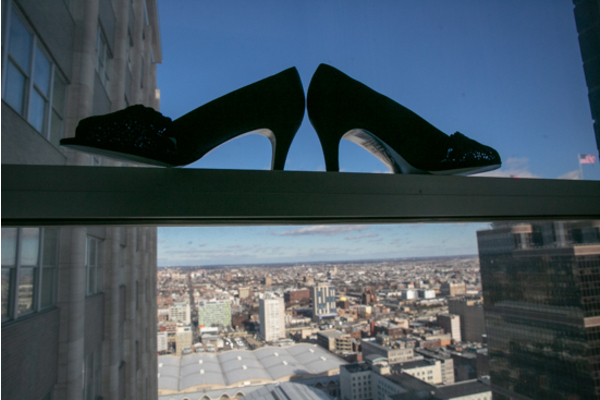 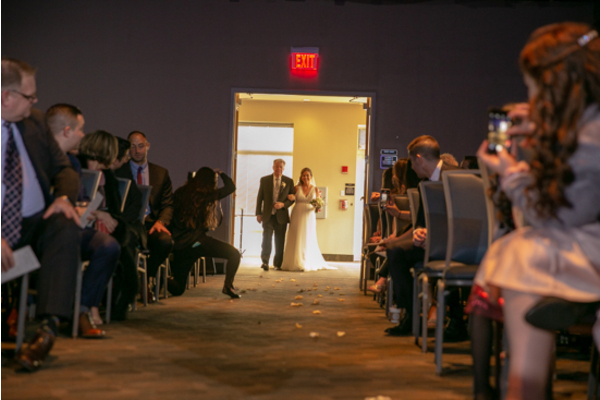 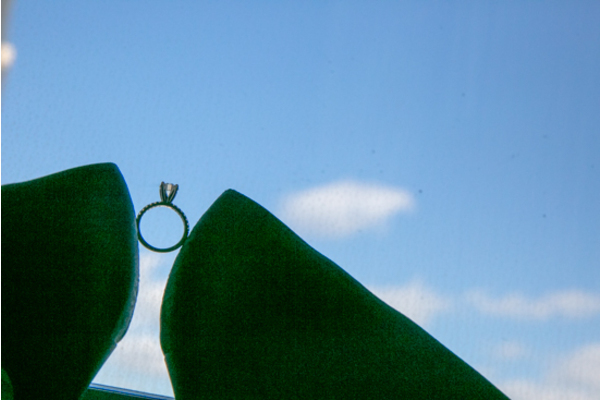 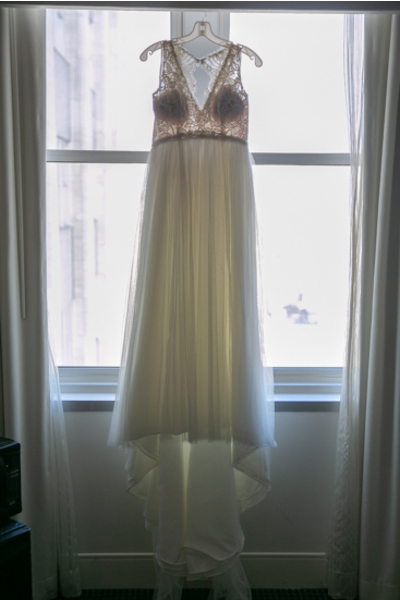 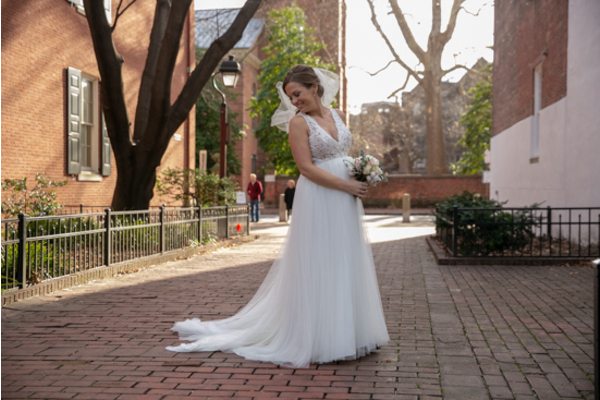 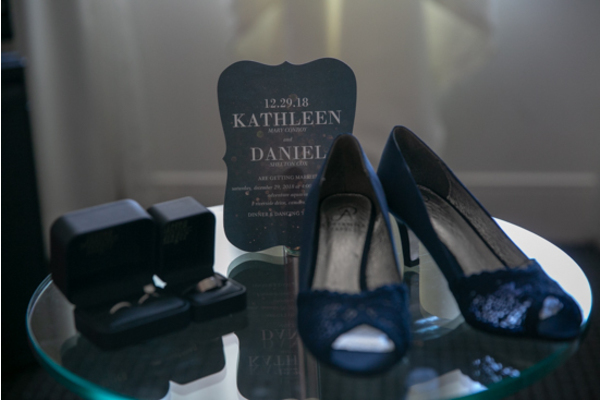 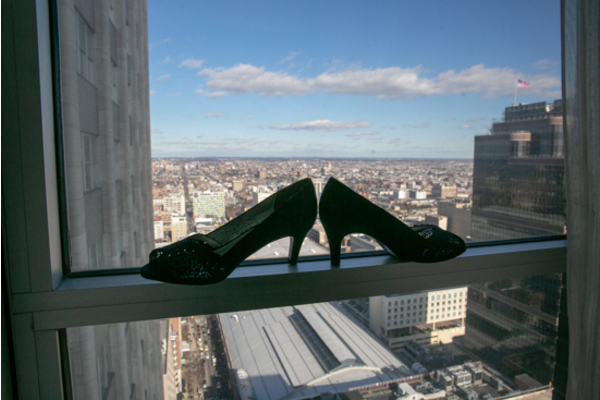 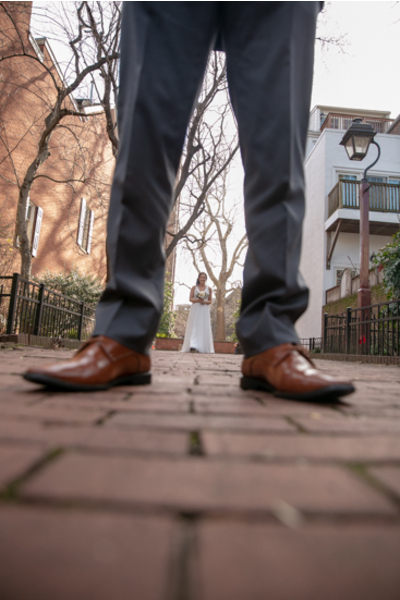 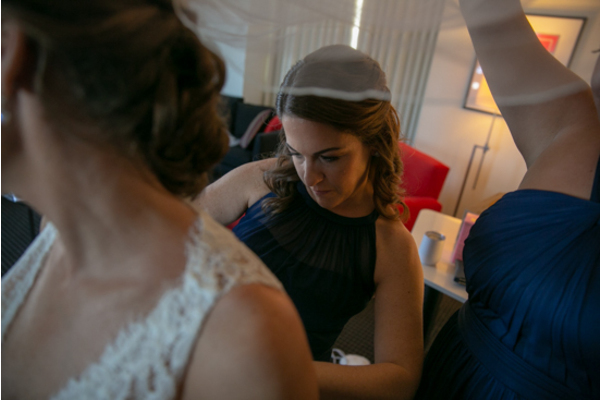 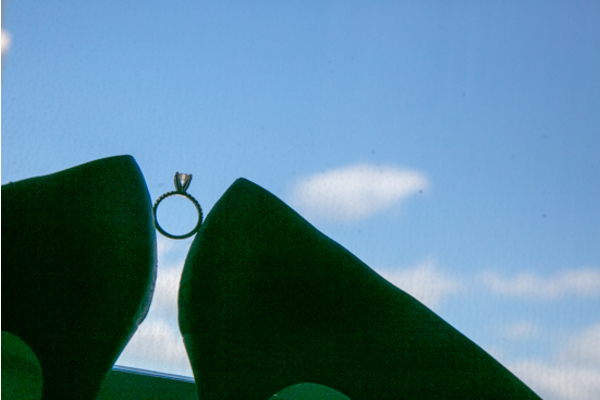 In addition, her gorgeous heels were captured by our NJ Wedding Photographer on the windowsill with the city landscape in the background! 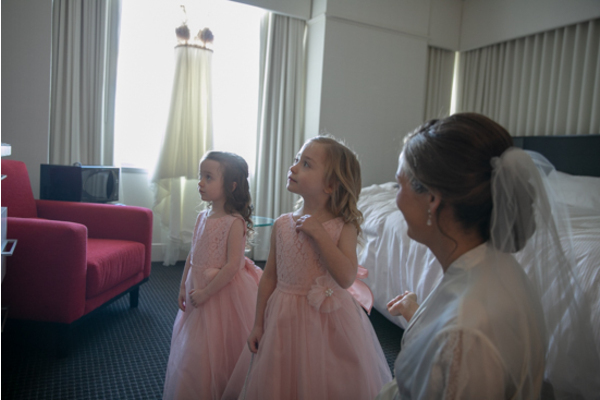 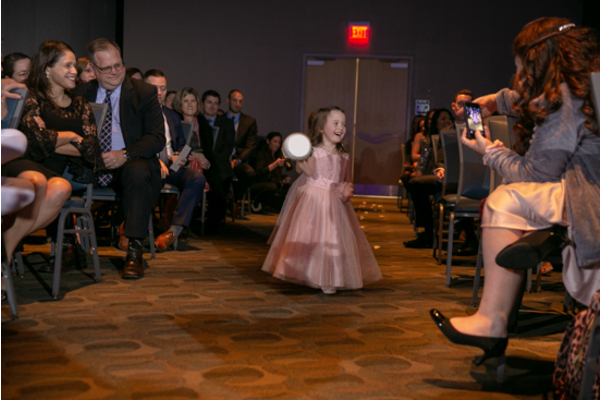 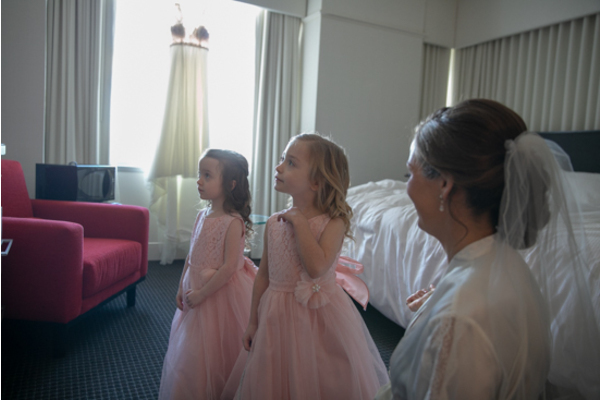 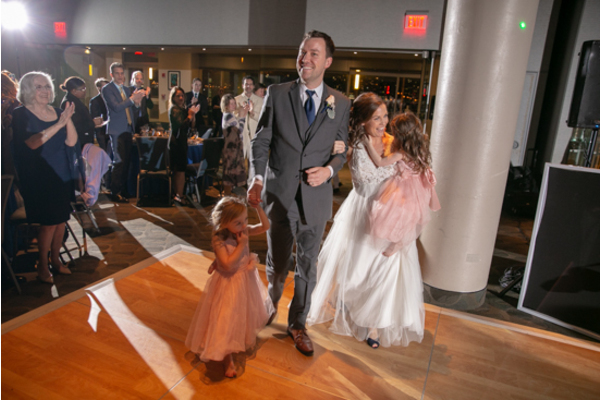 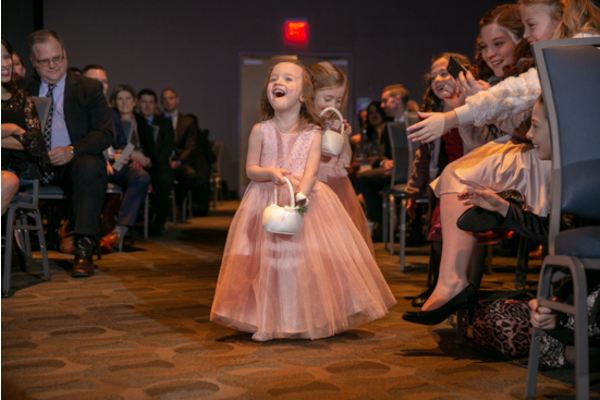 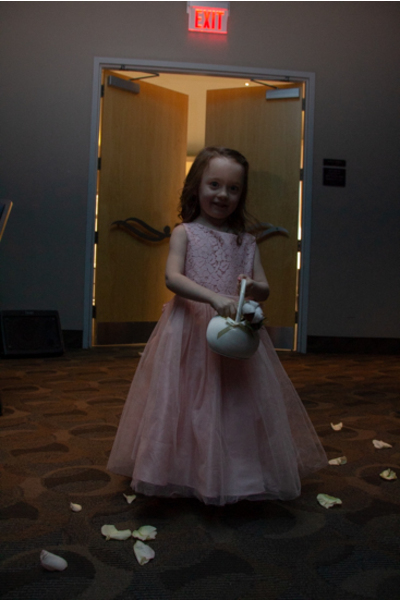 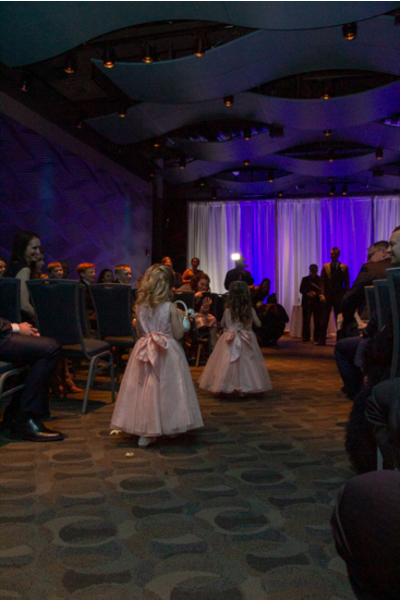 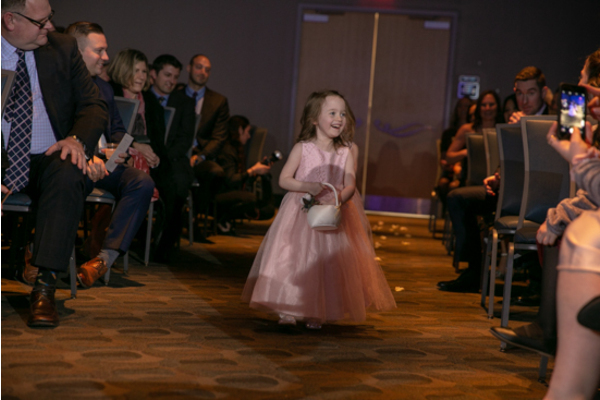 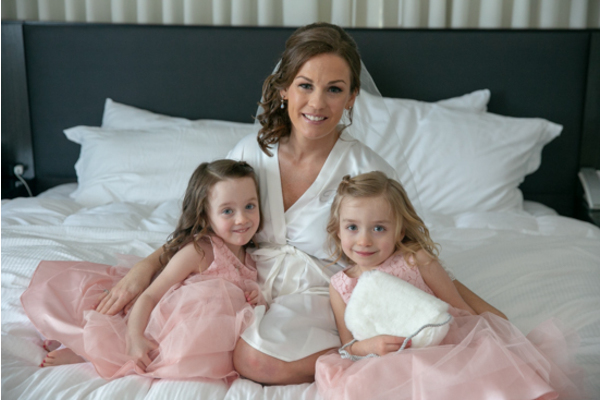 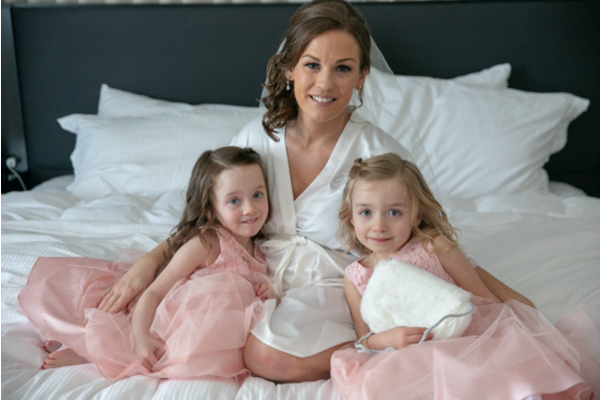 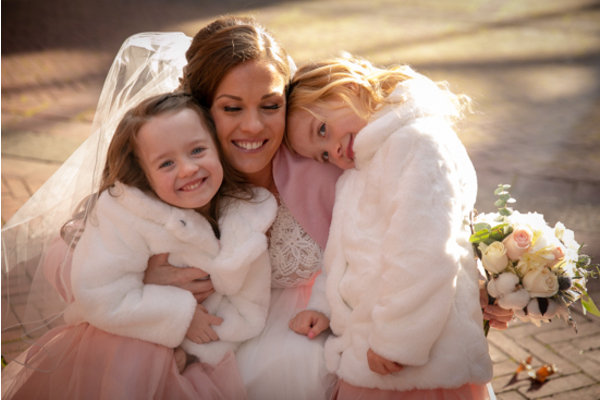 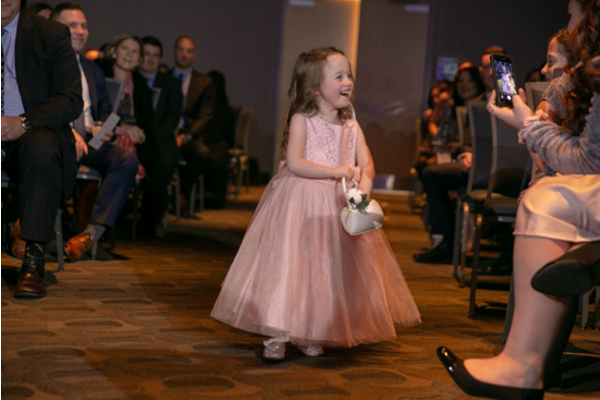 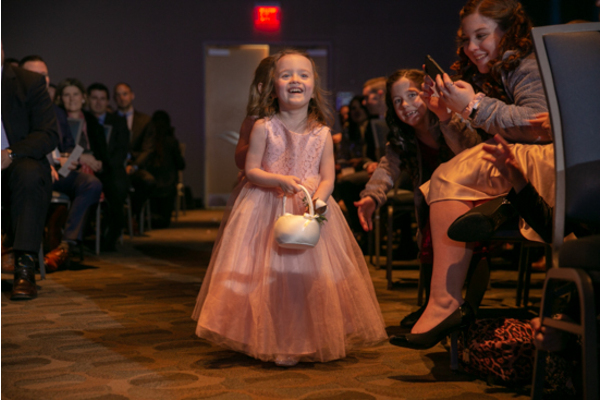 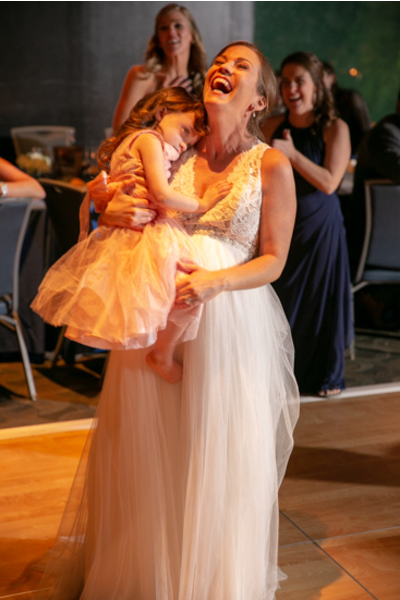 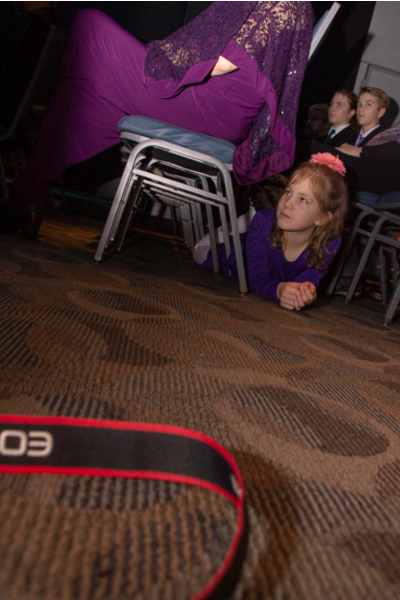 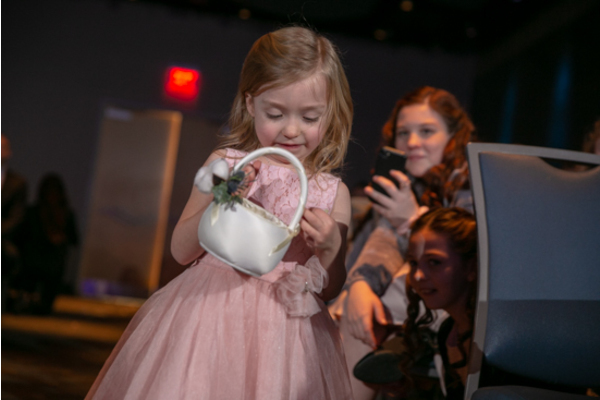 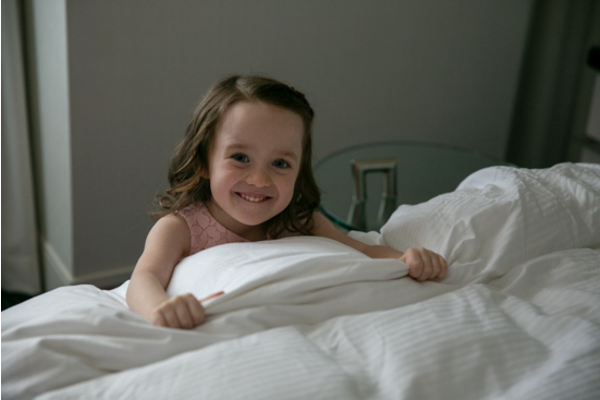 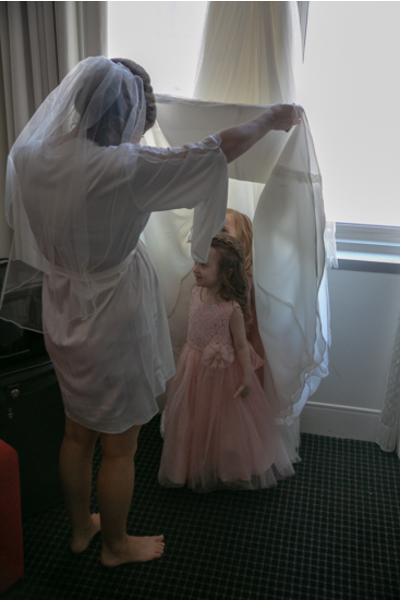 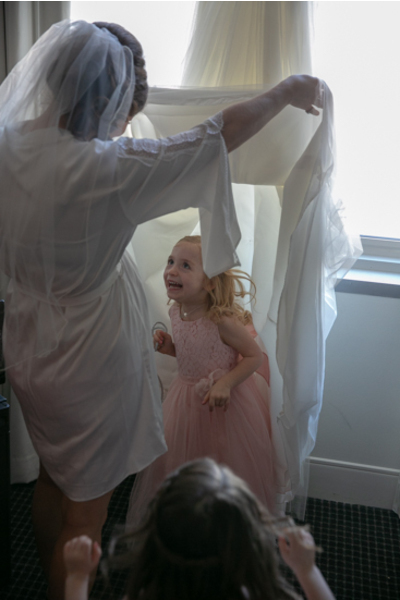 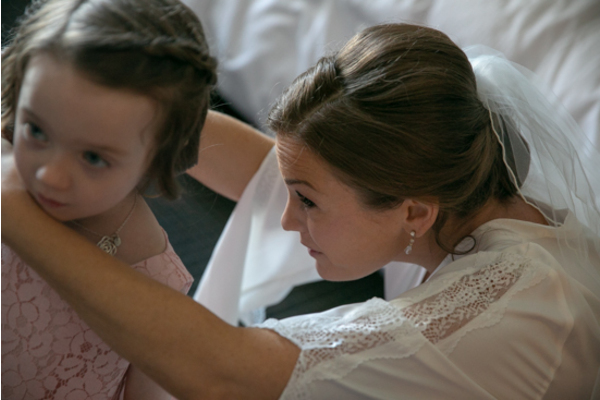 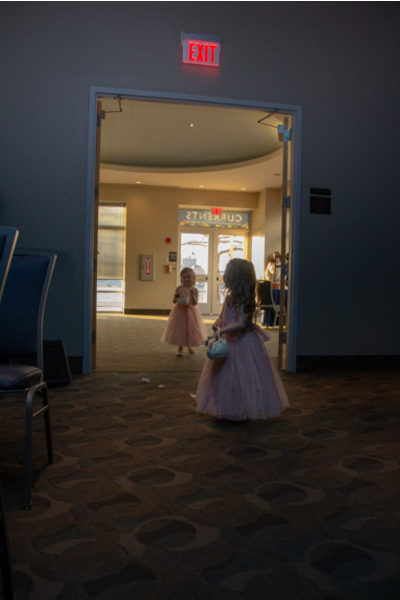 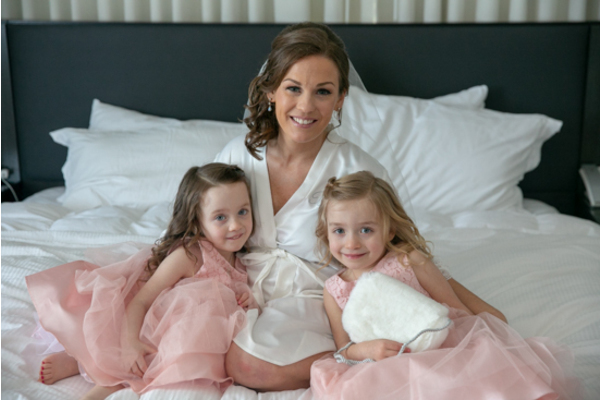 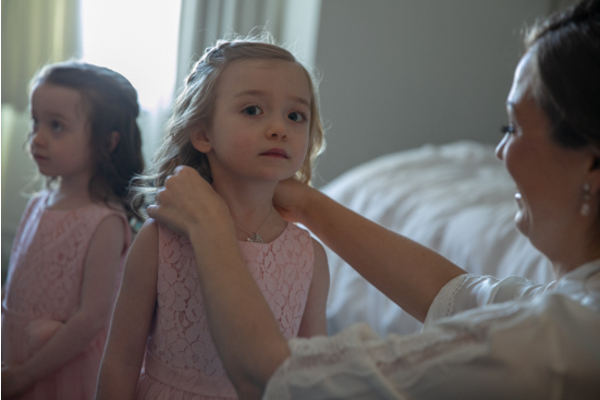 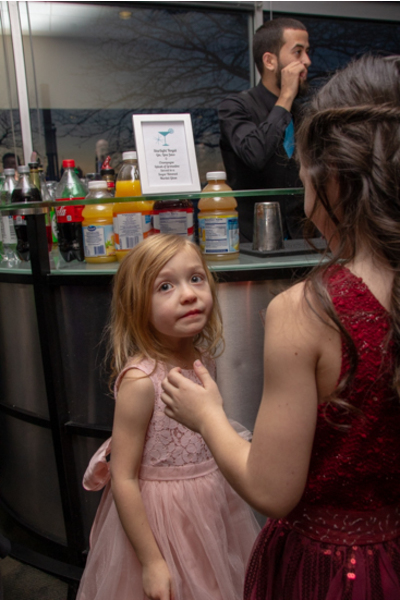 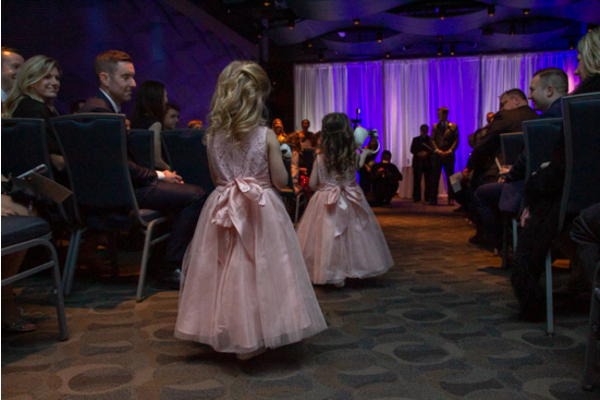 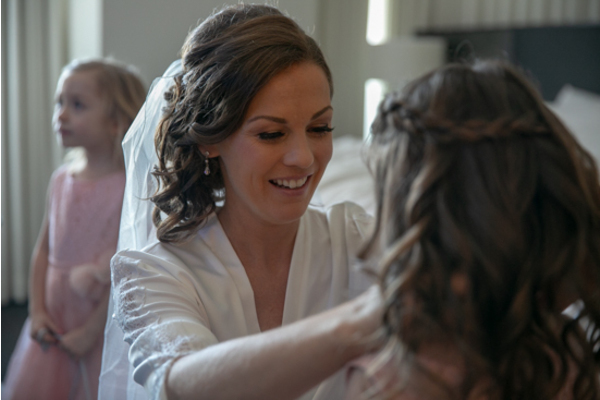 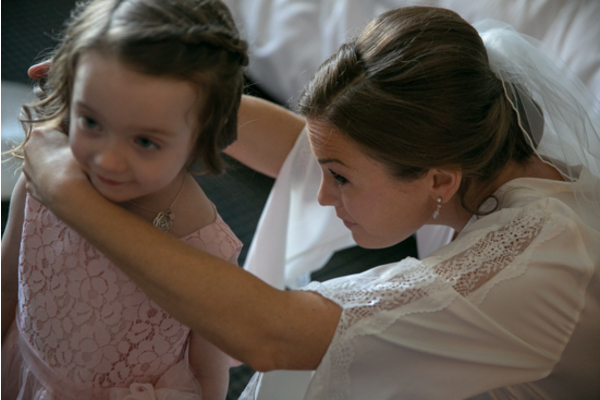 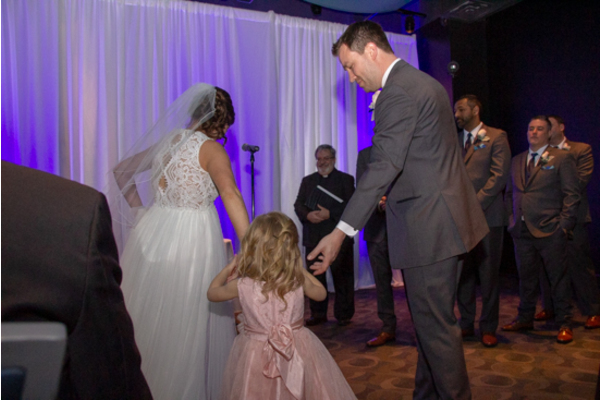 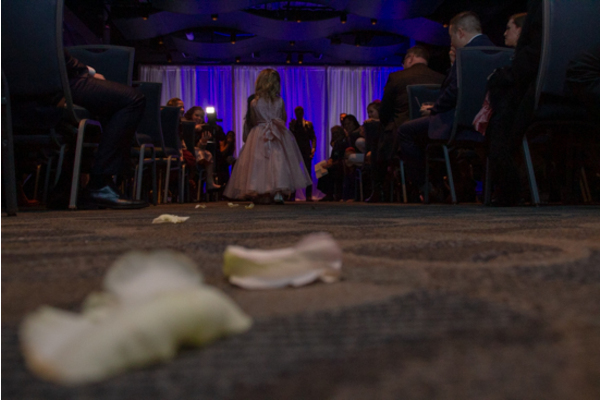 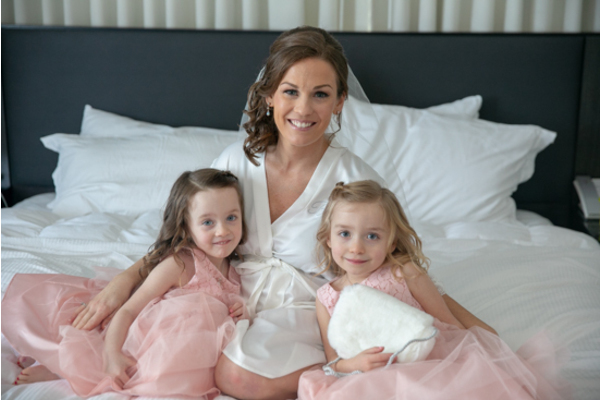 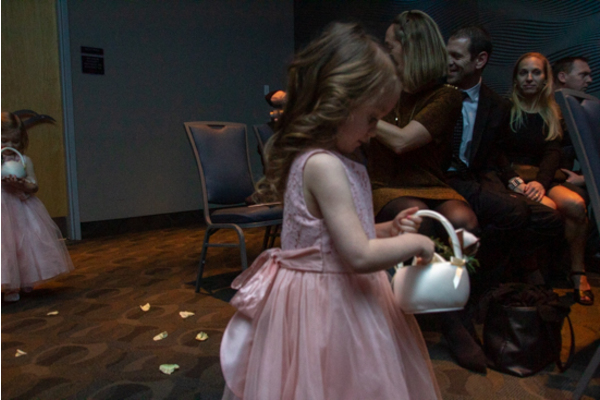 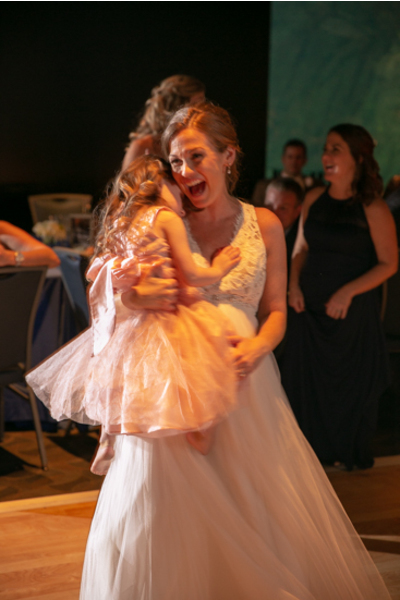 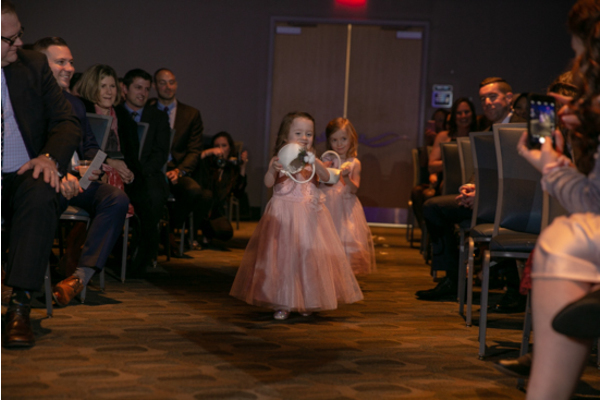 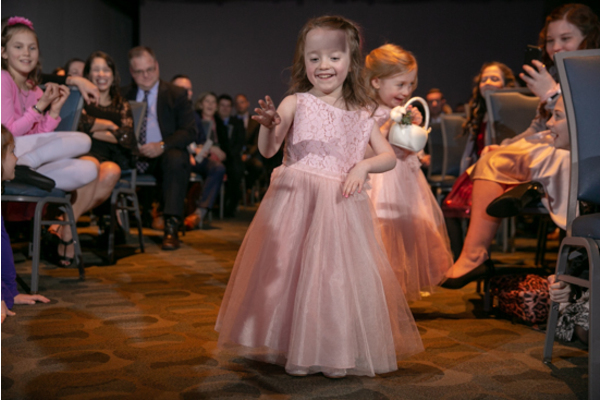 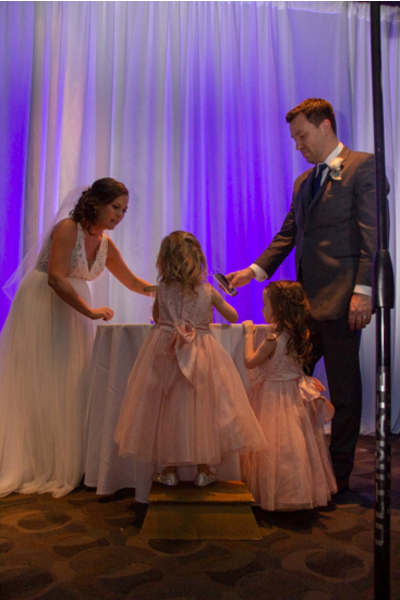 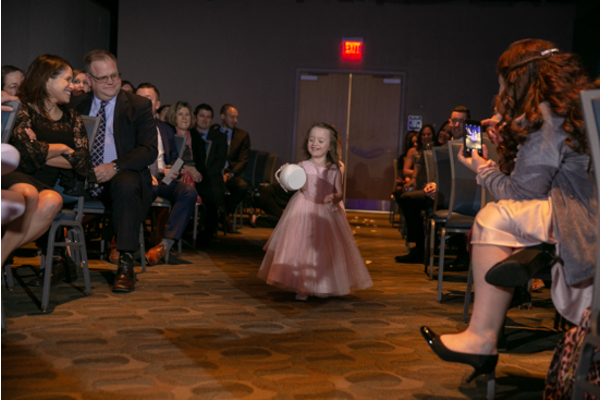 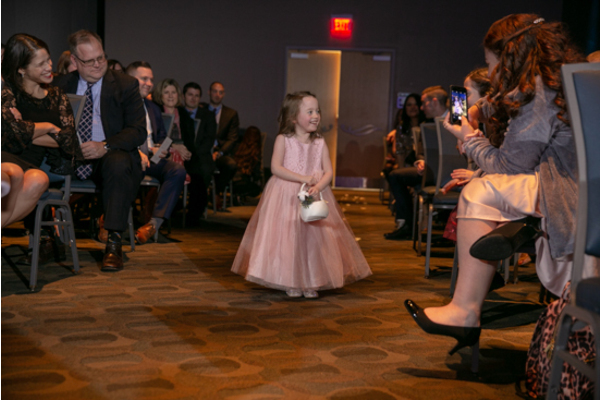 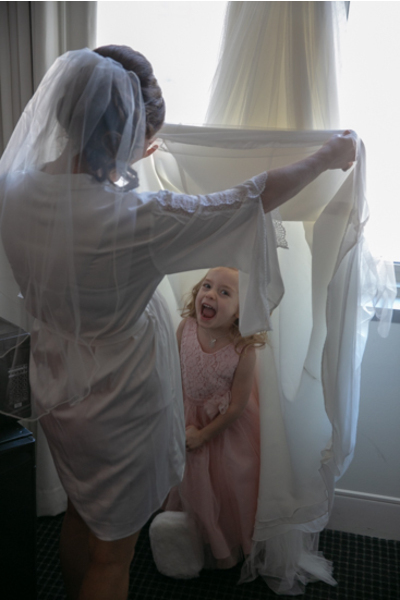 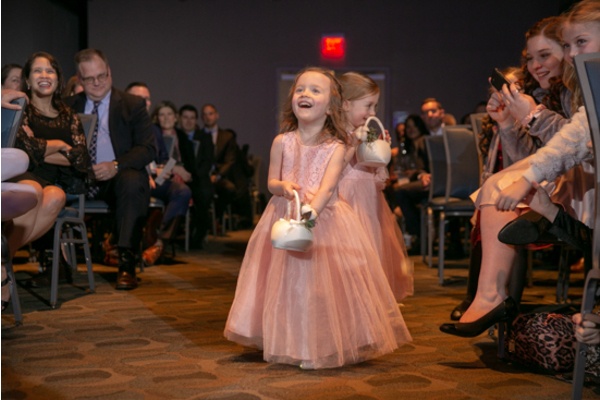 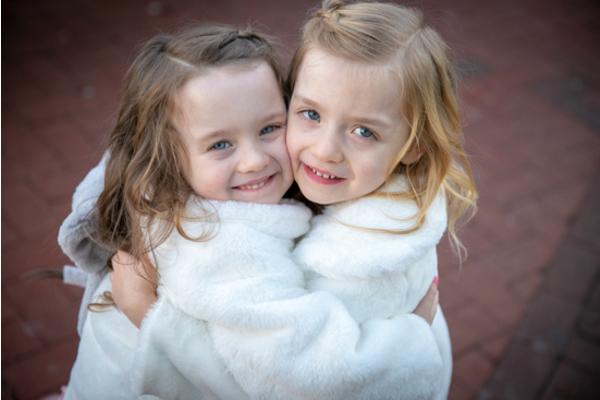 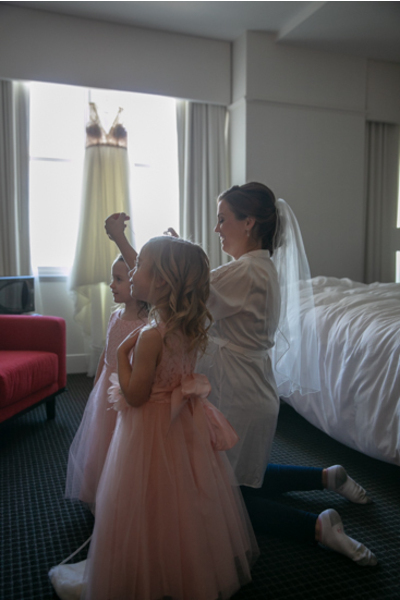 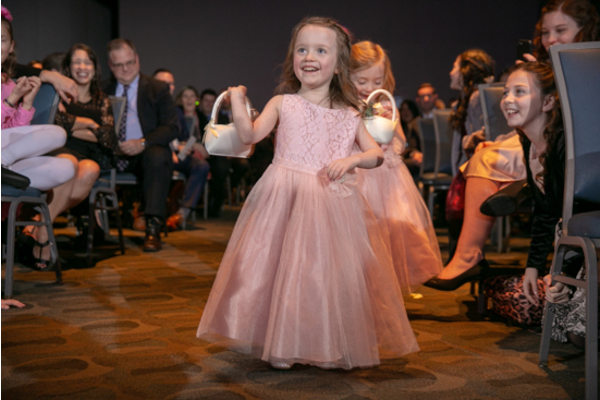 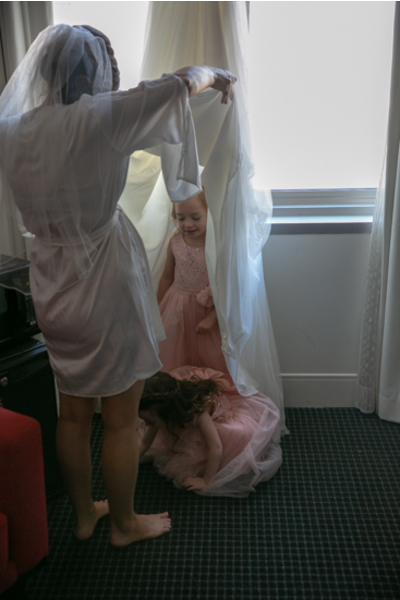 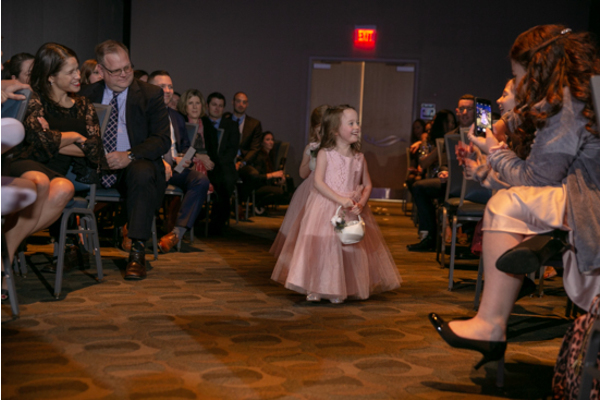 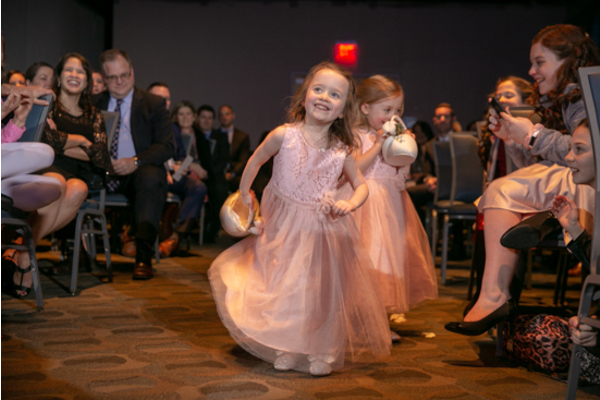 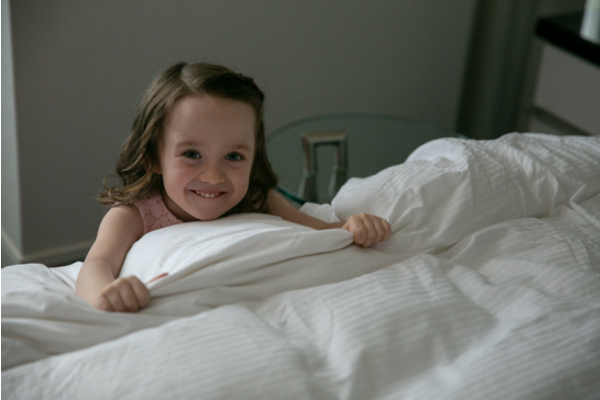 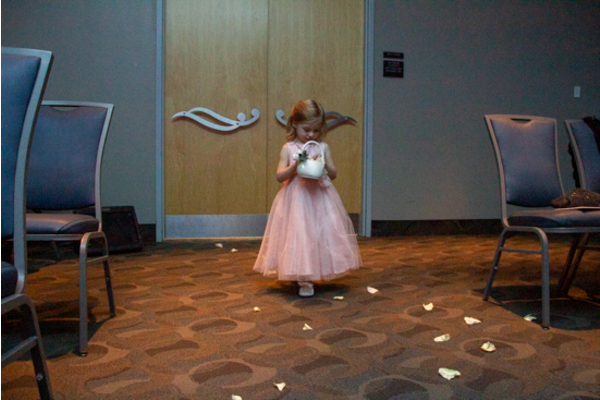 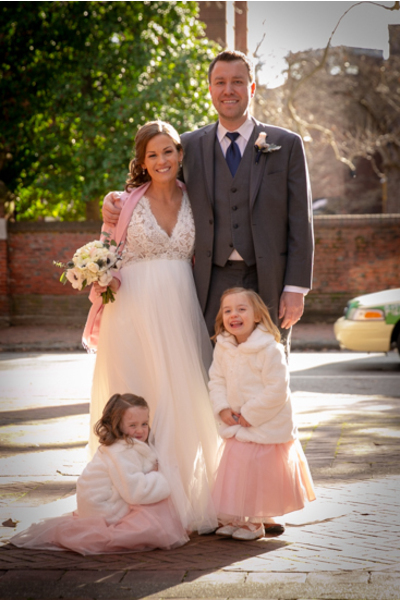 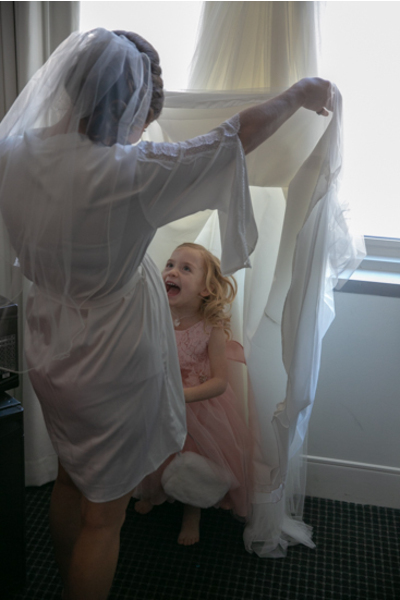 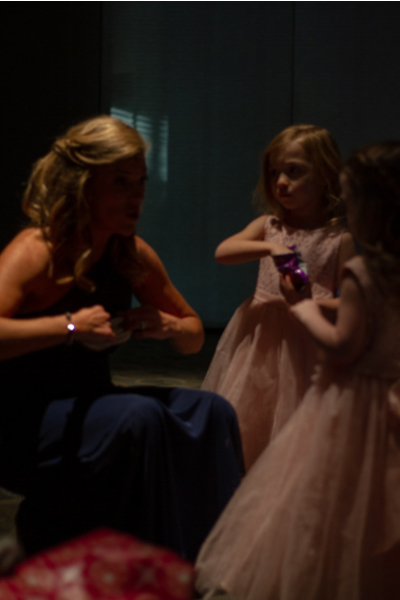 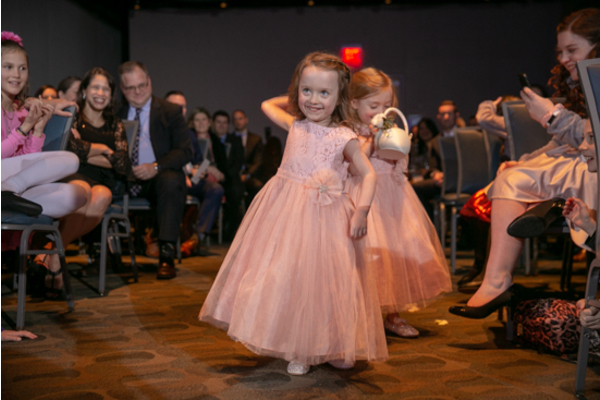 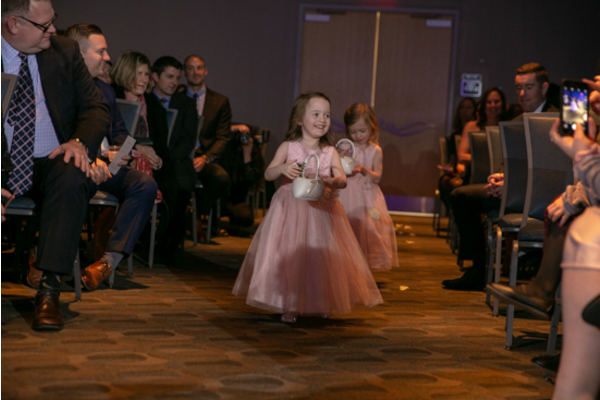 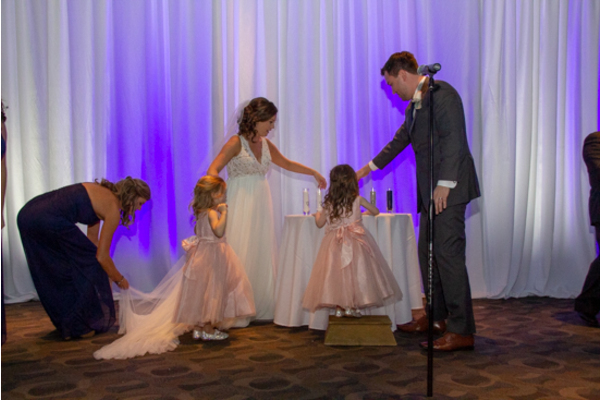 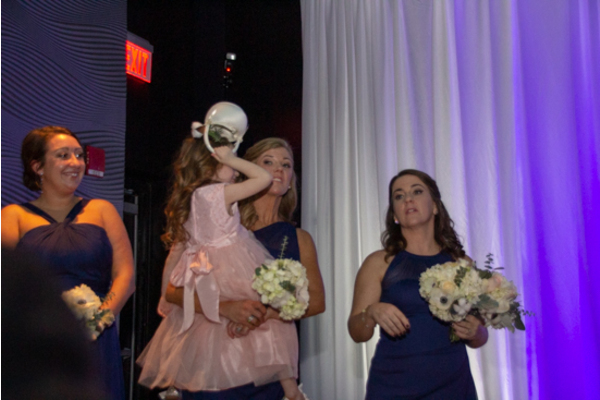 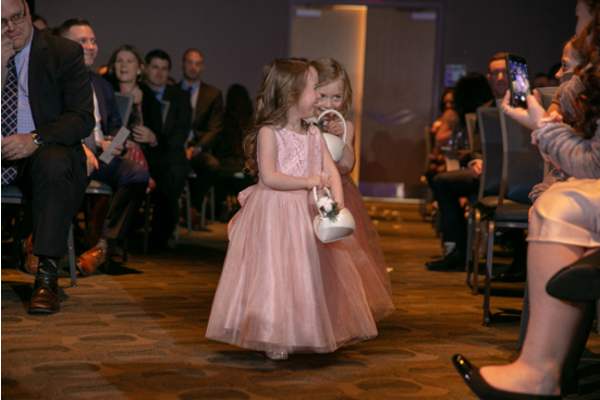 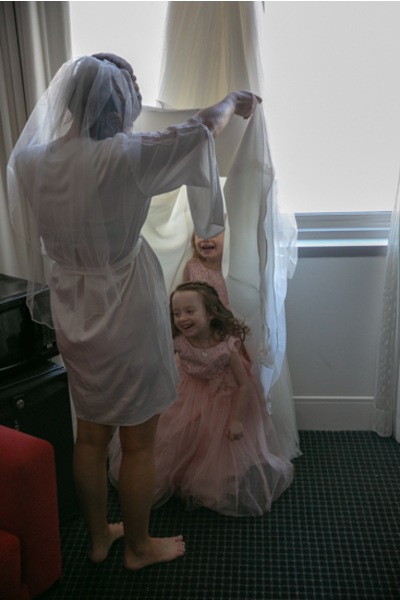 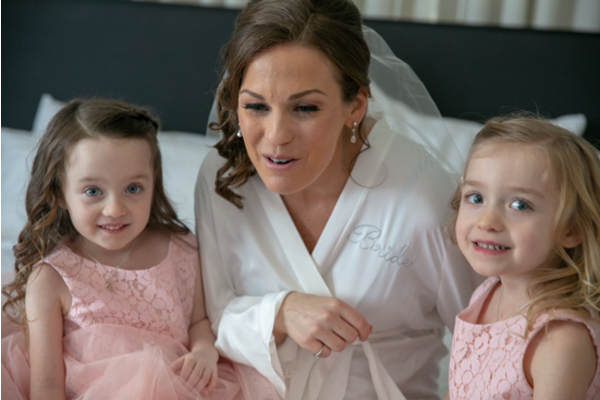 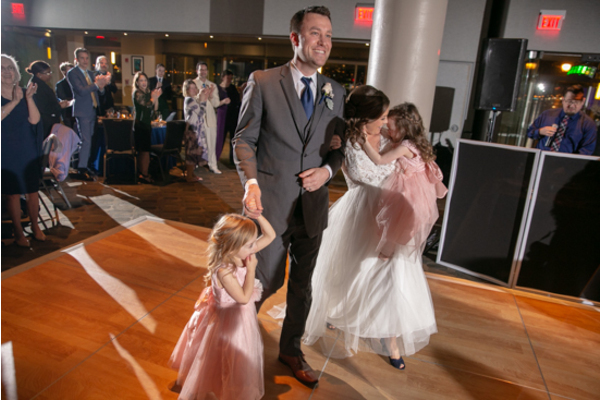 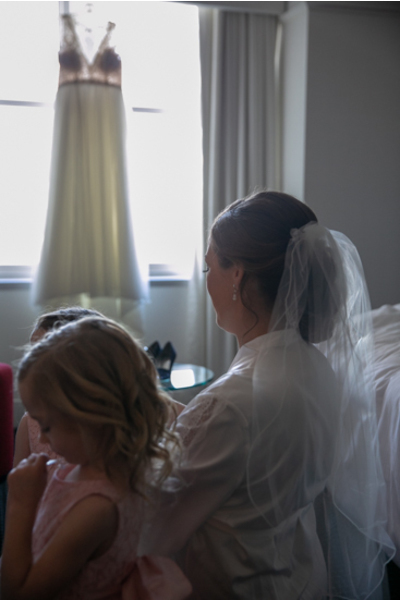 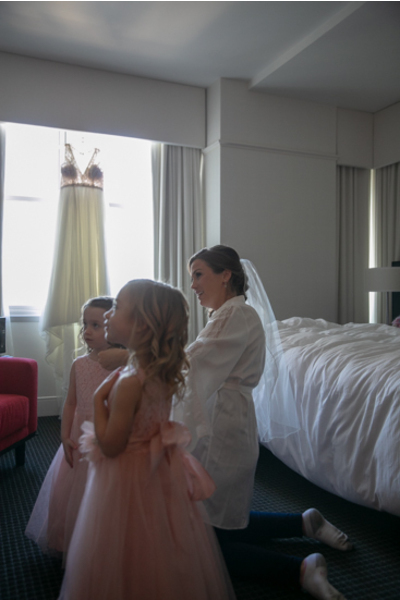 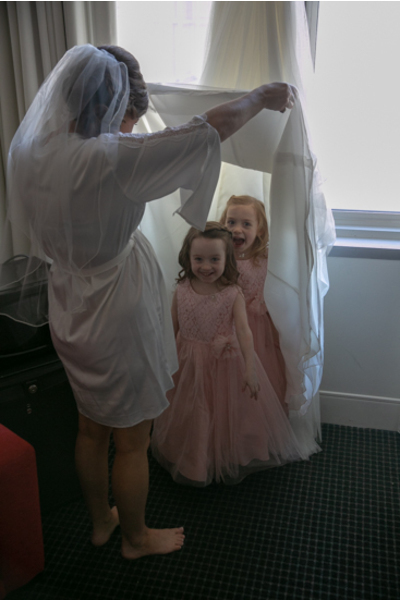 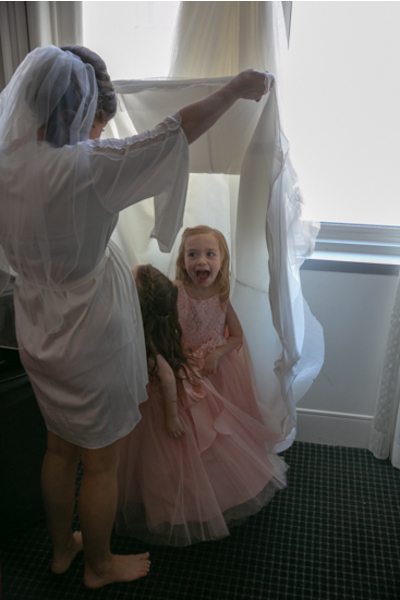 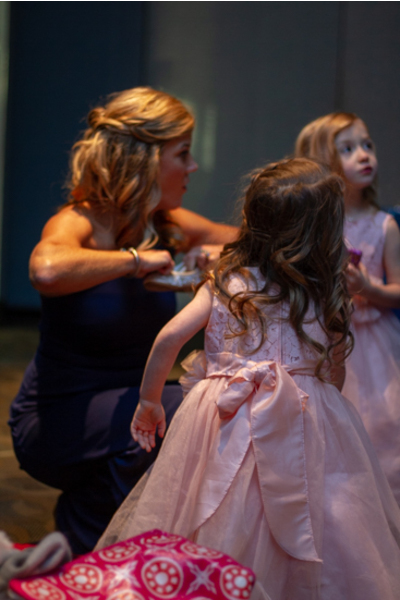 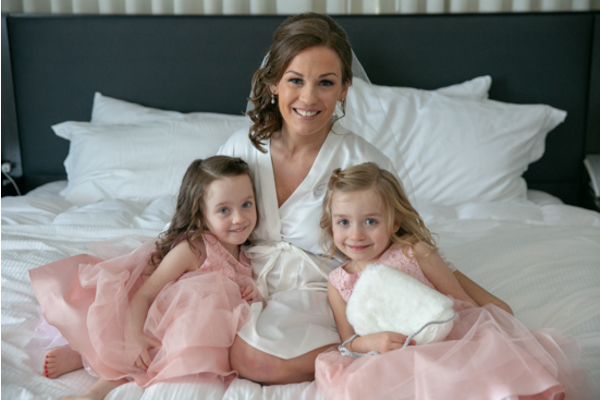 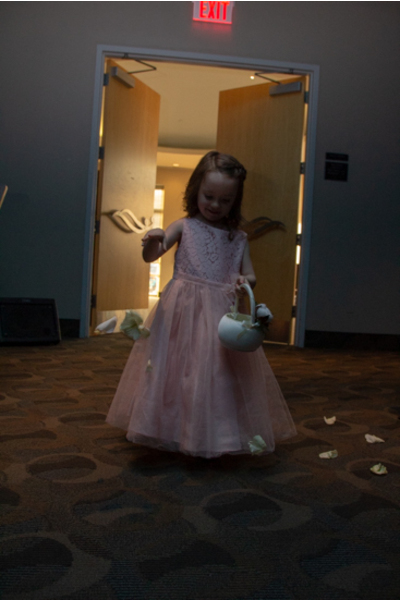 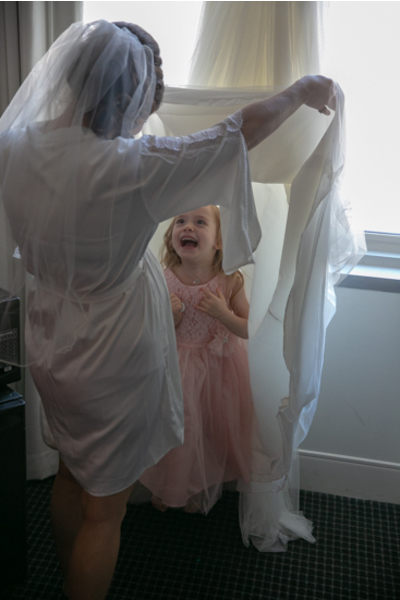 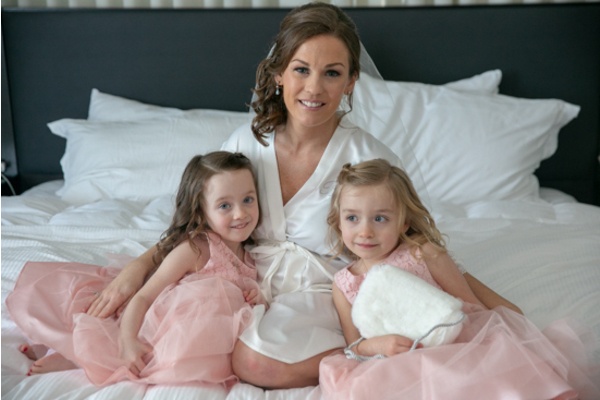 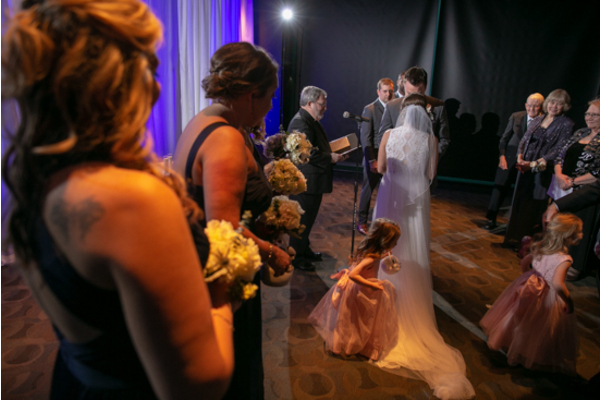 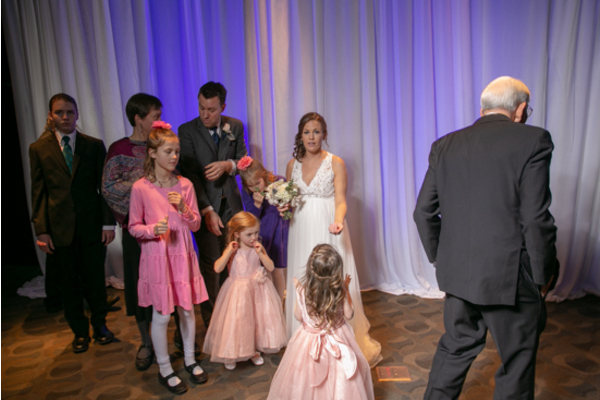 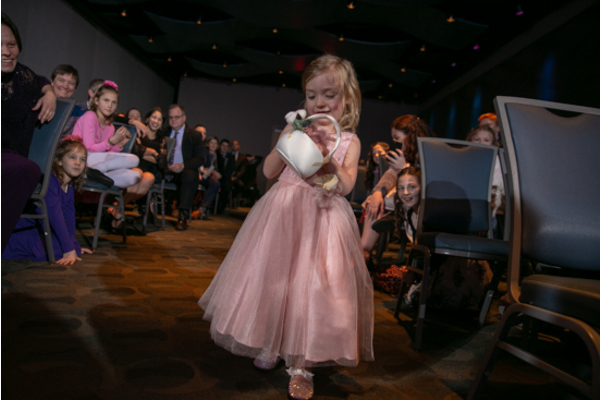 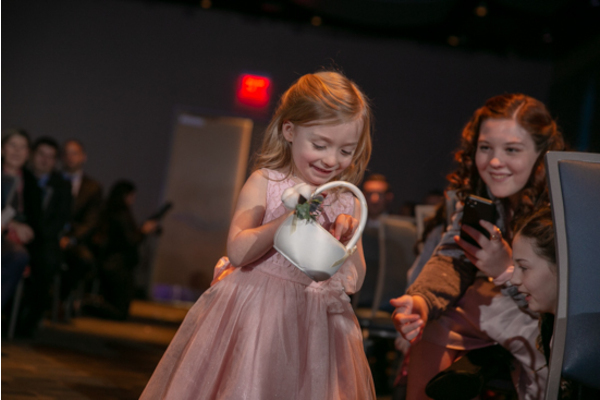 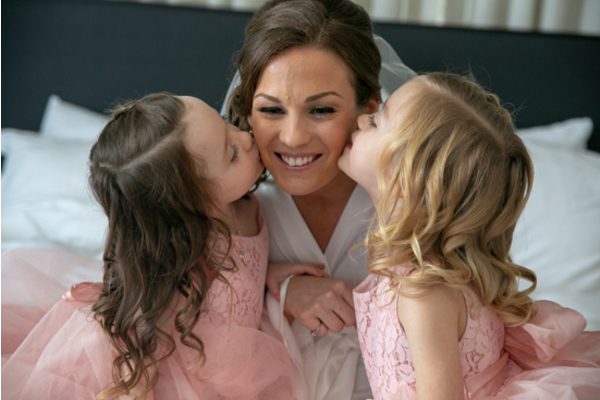 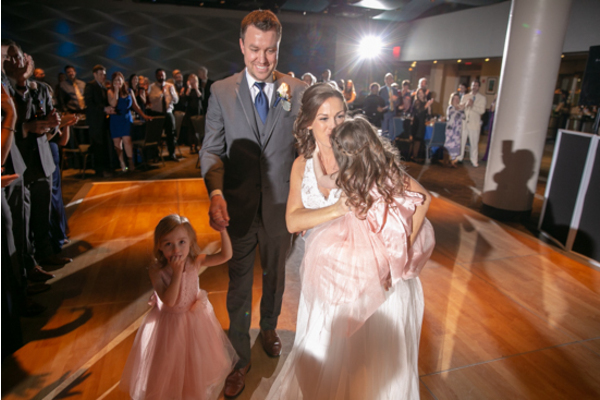 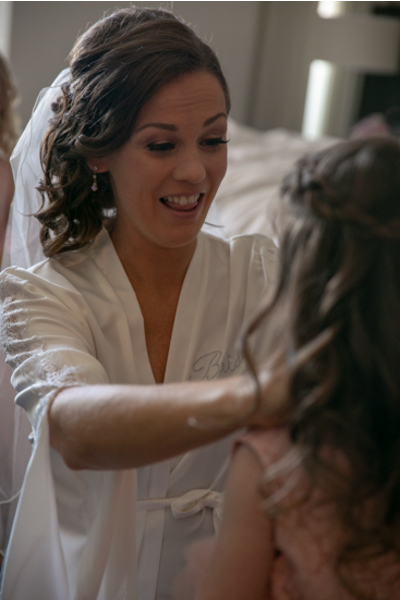 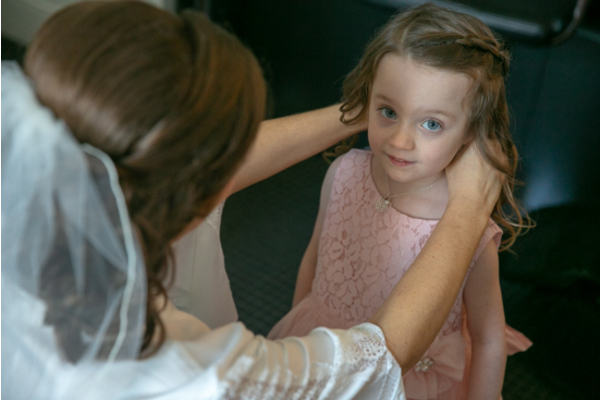 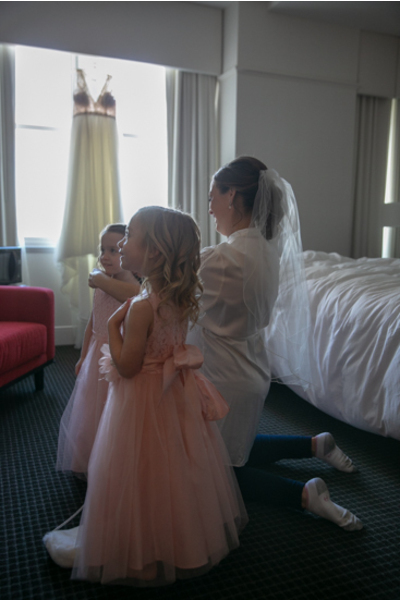 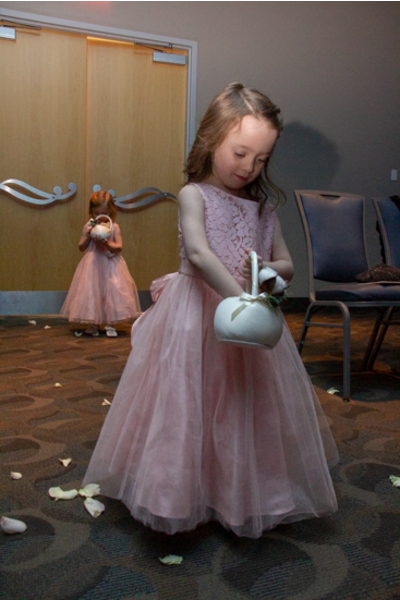 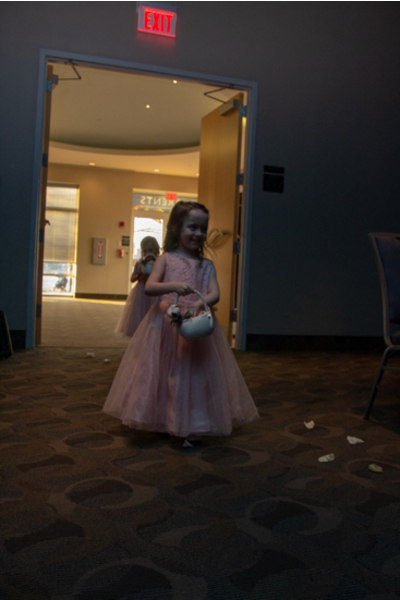 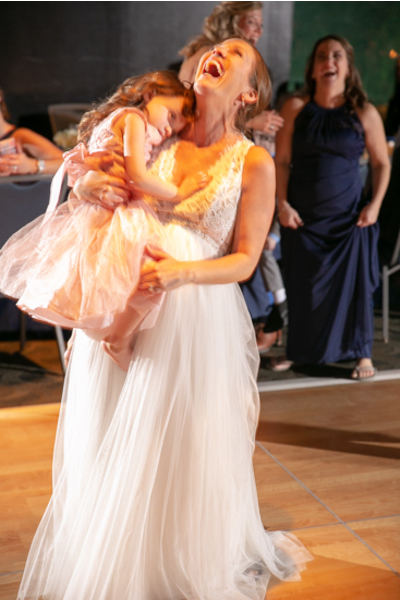 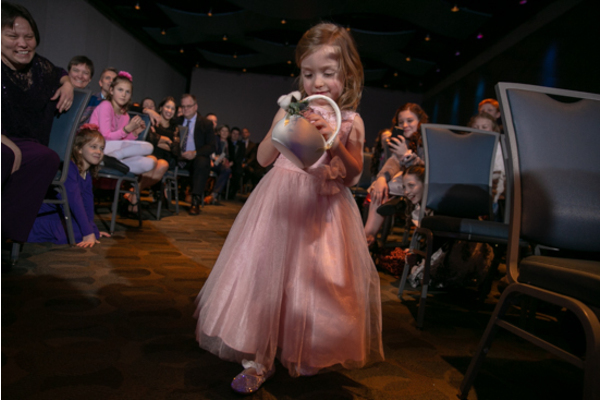 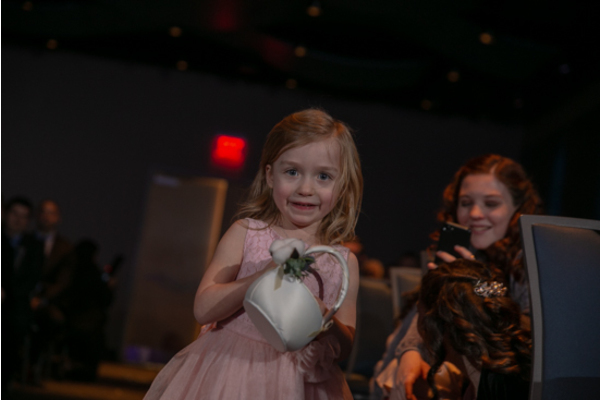 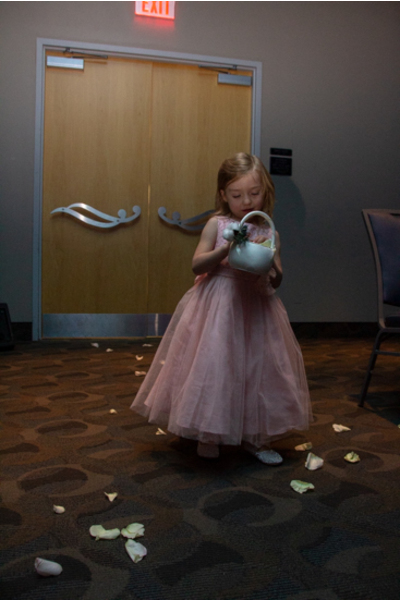 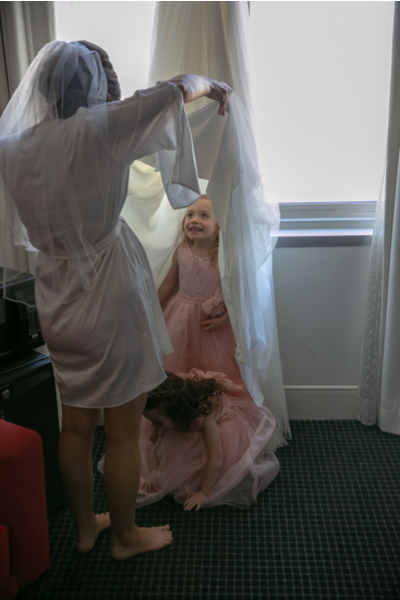 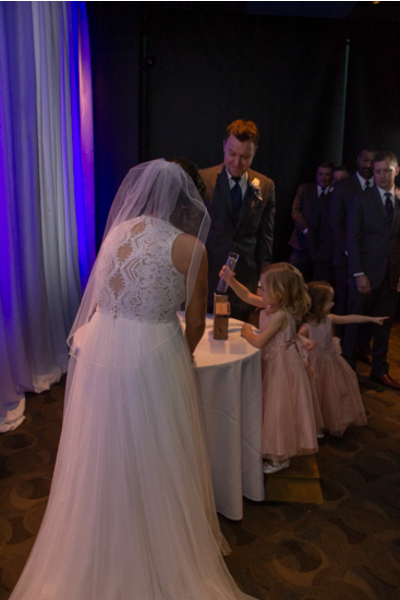 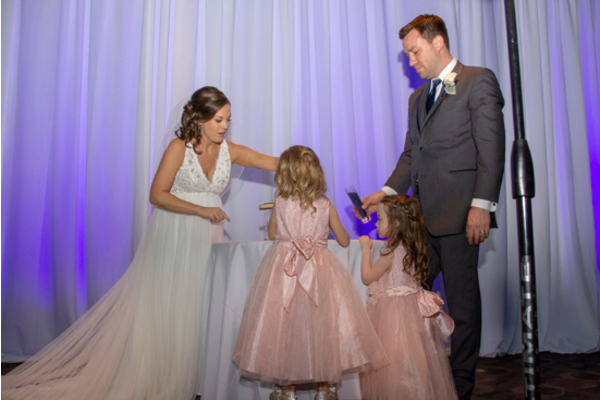 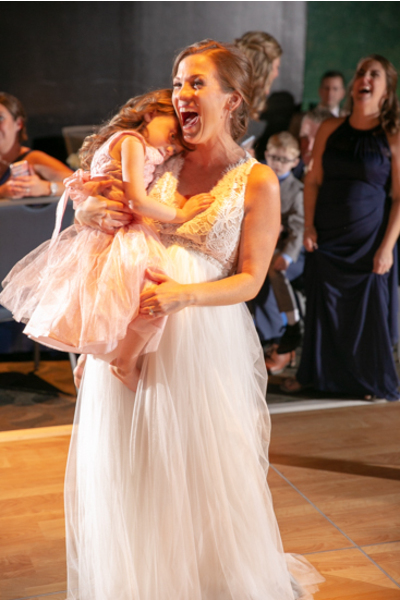 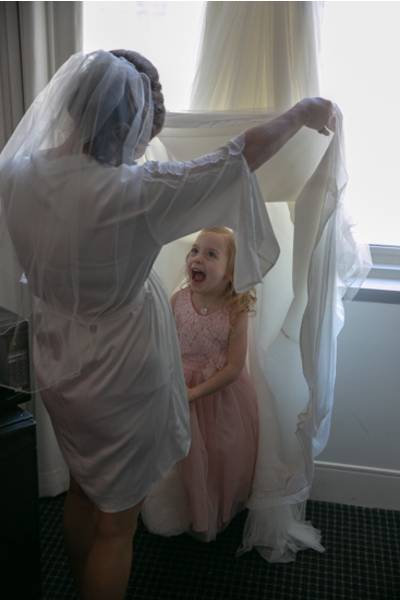 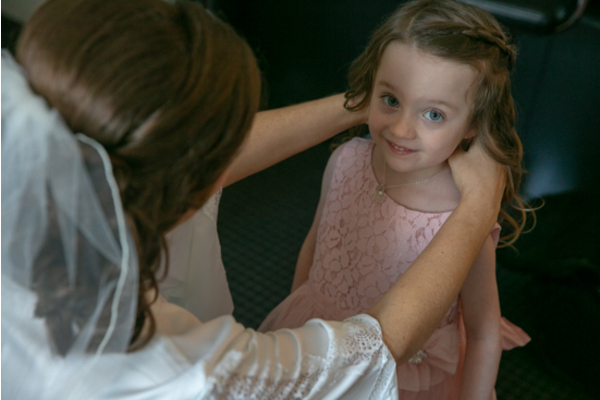 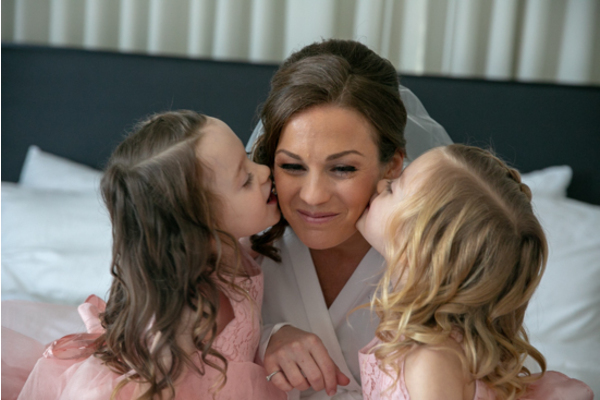 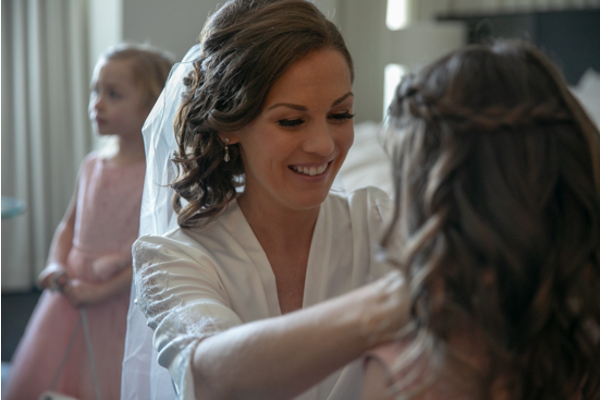 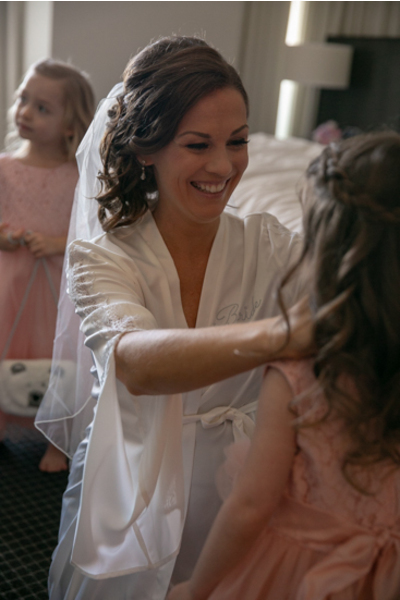 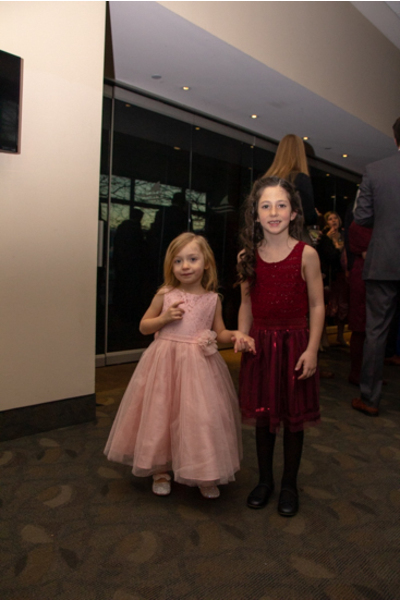 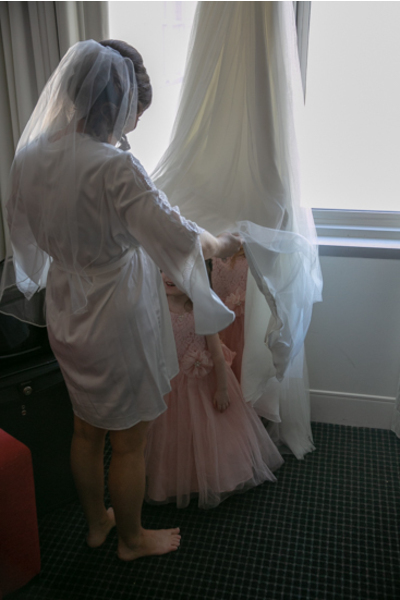 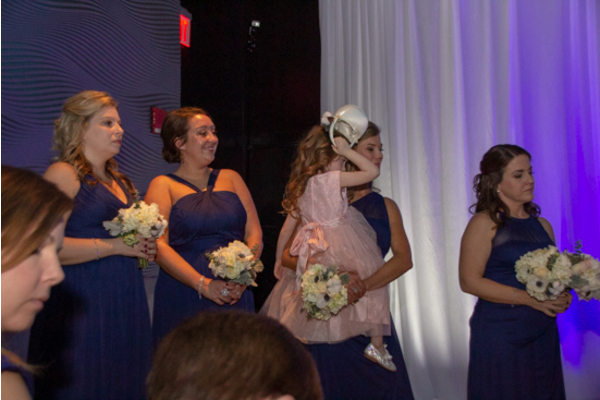 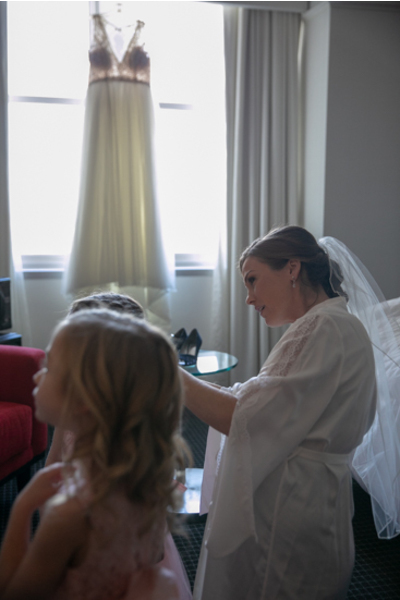 Before heading over to her first look, she took more photos with the adorable flower girls dressed in pale pink. 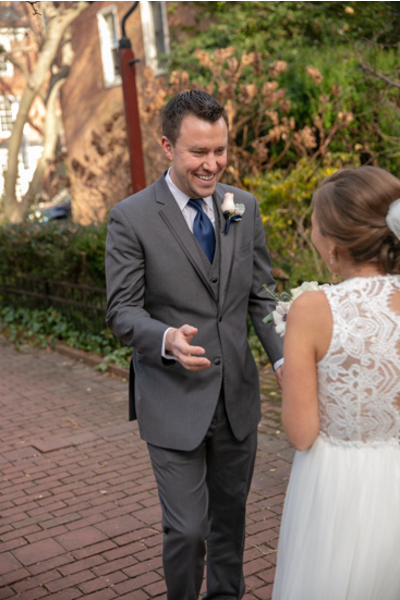 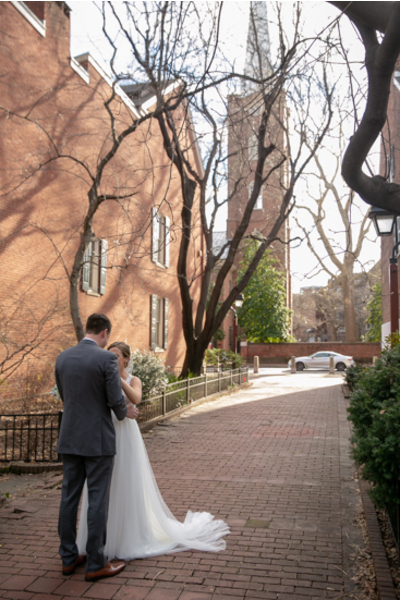 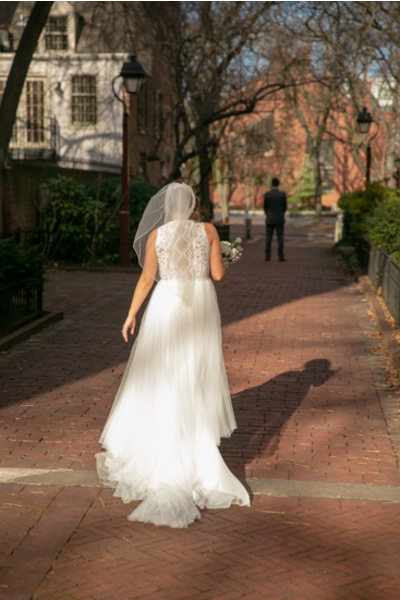 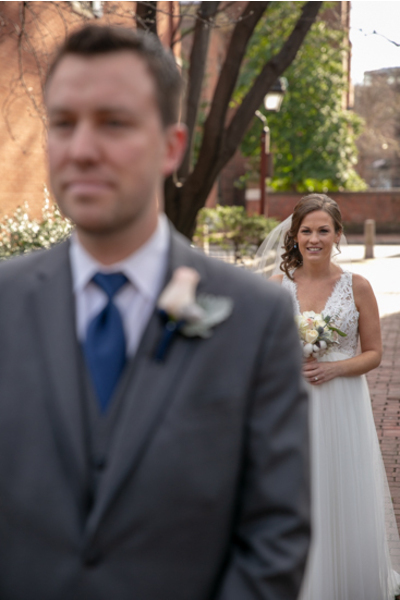 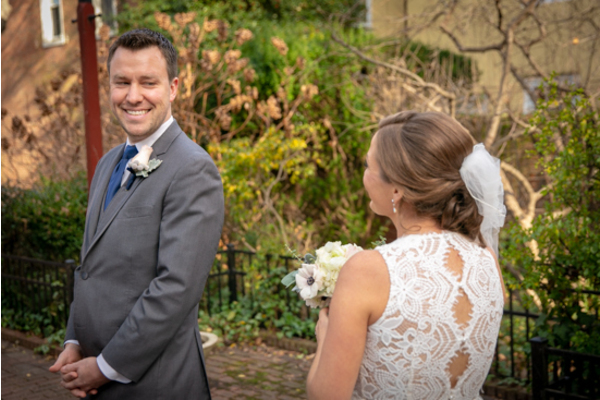 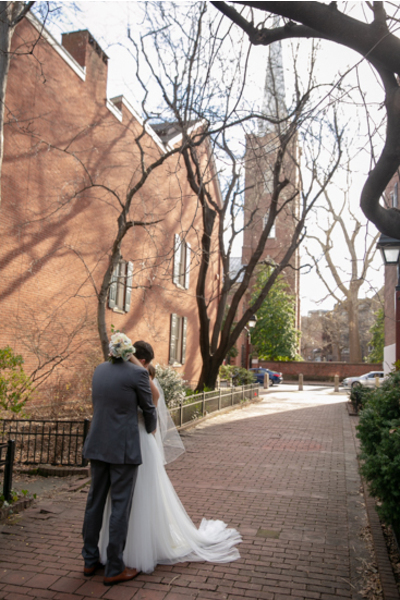 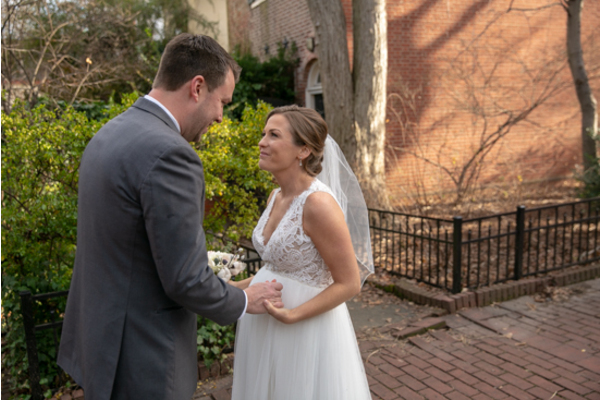 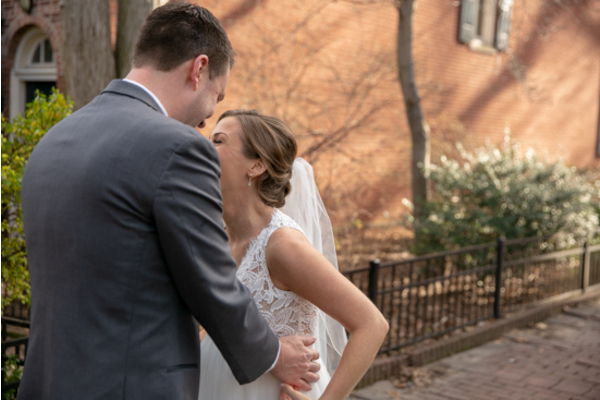 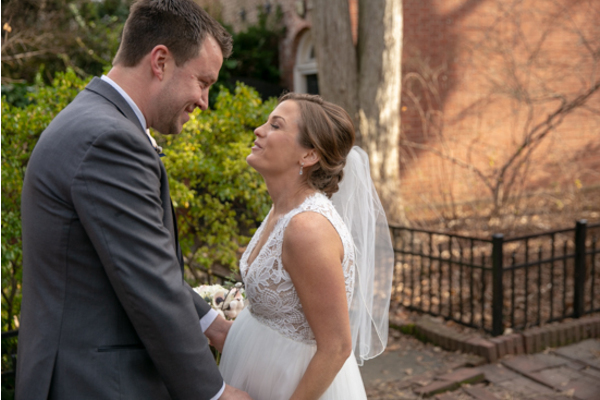 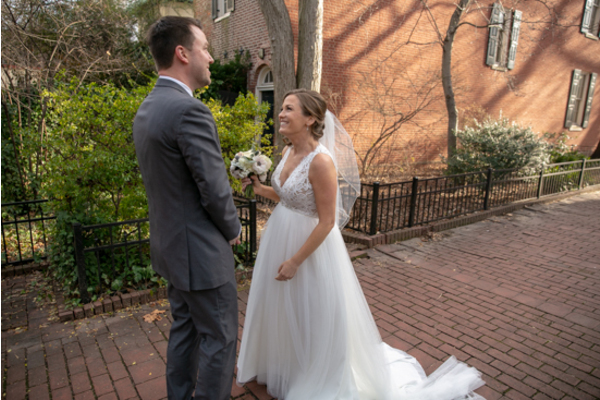 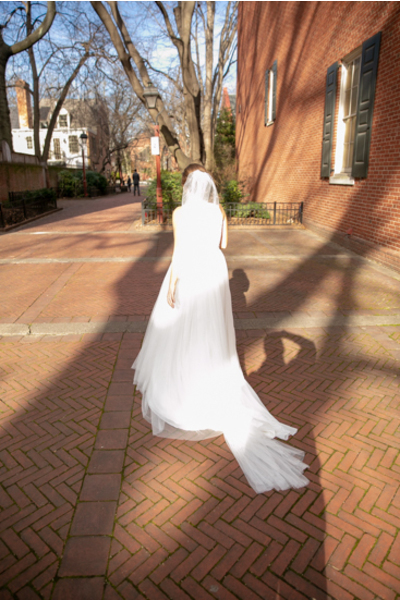 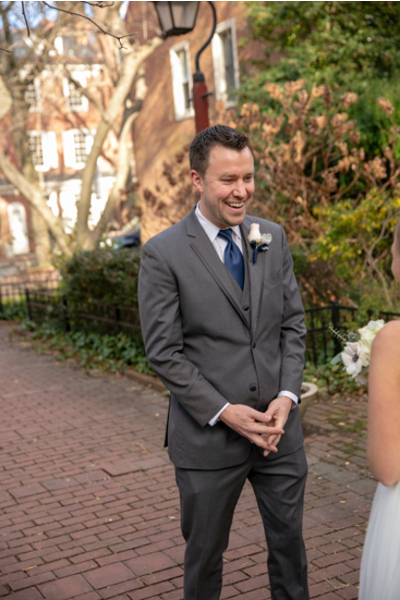 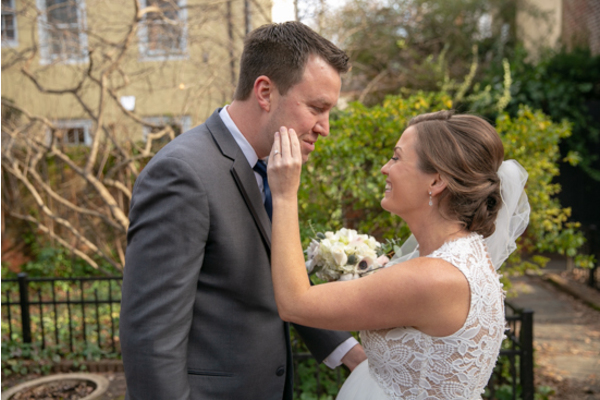 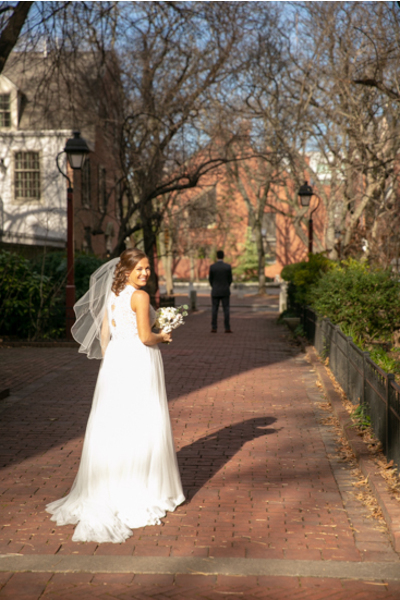 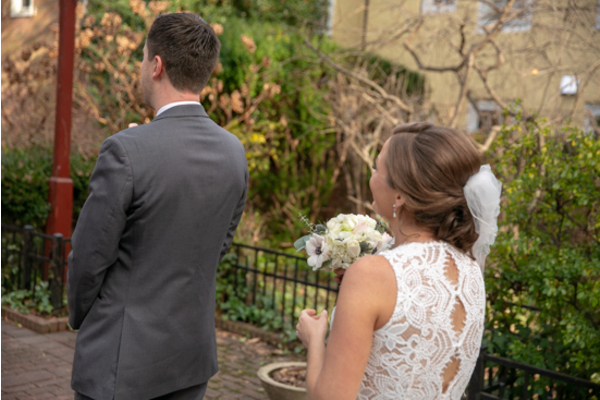 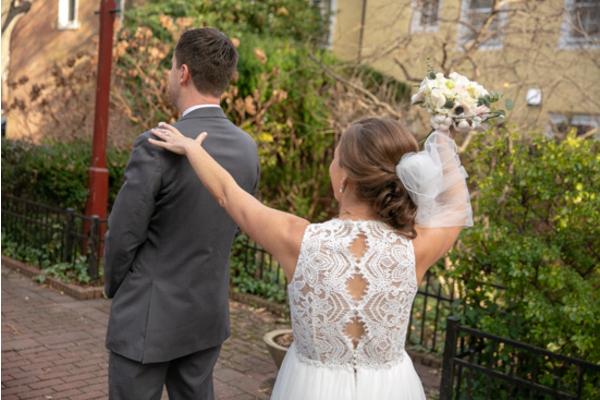 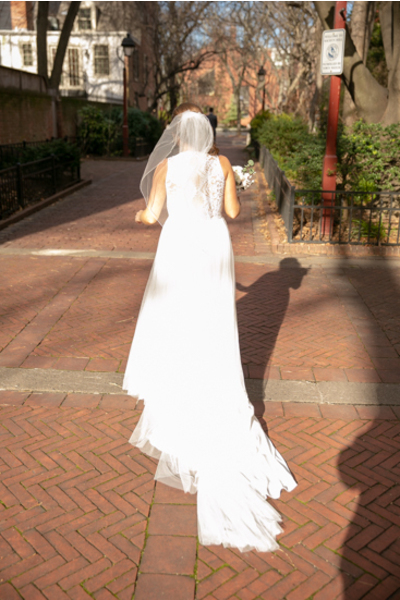 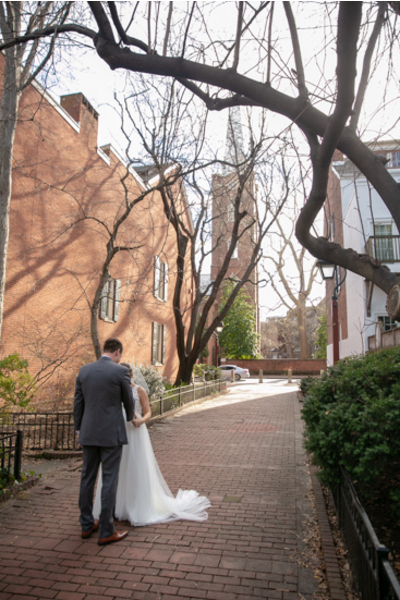 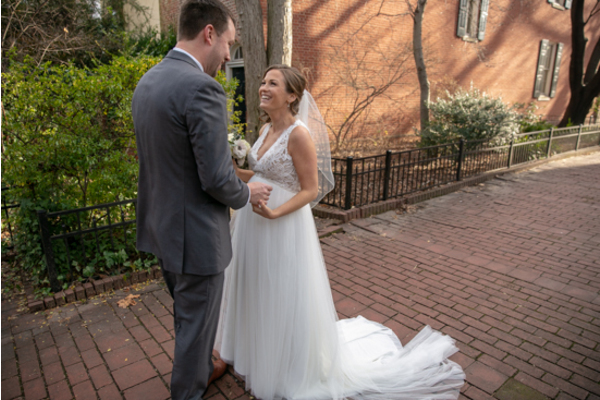 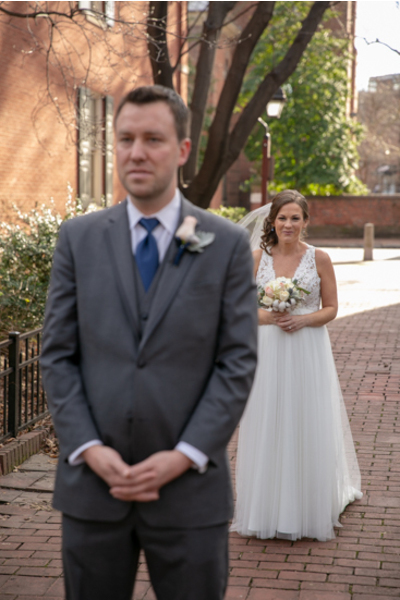 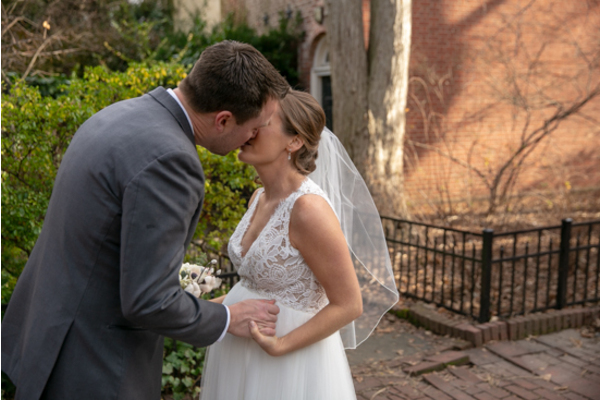 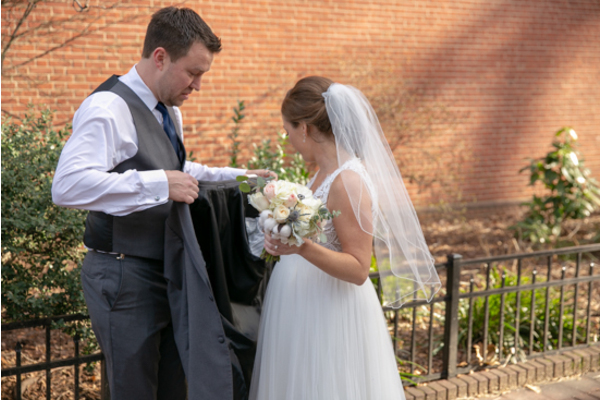 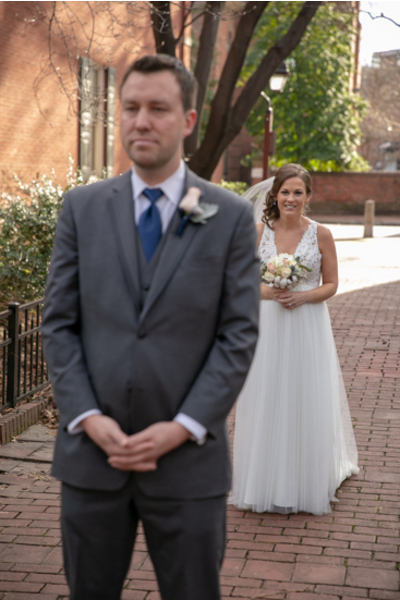 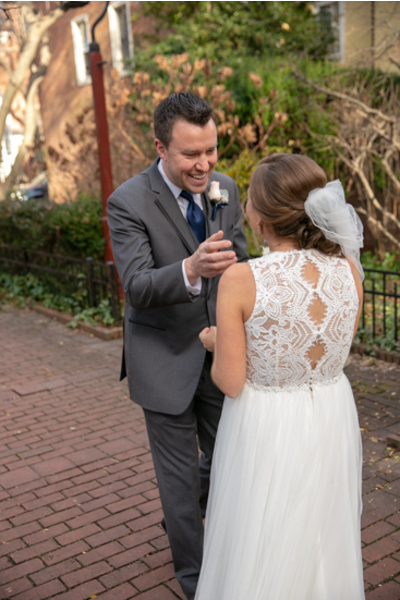 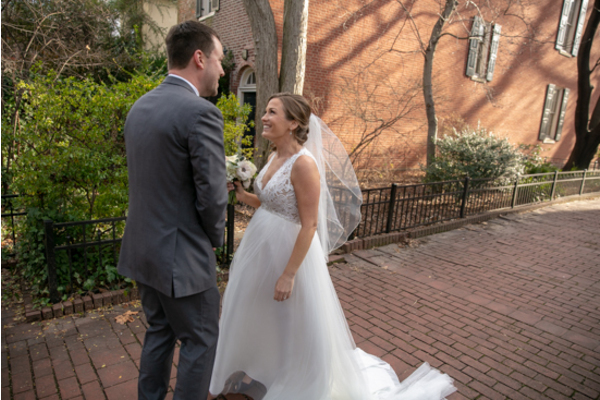 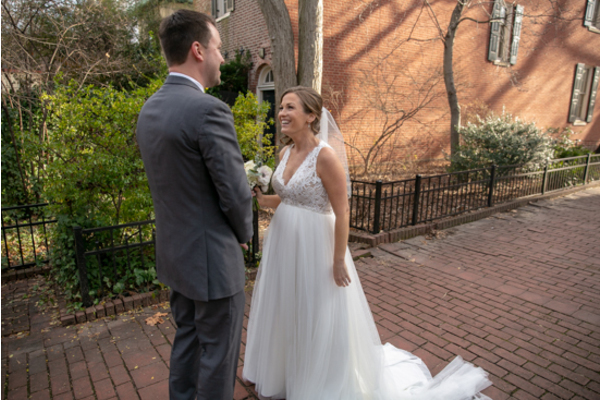 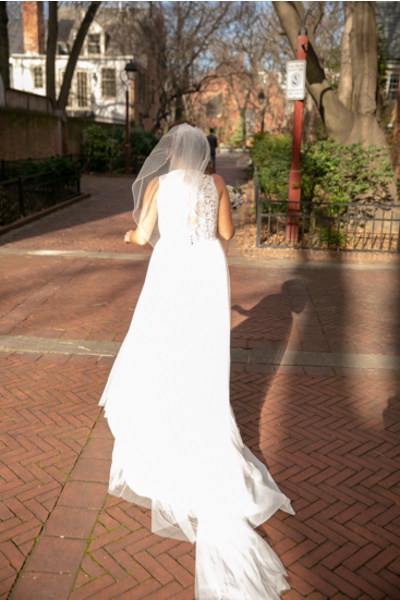 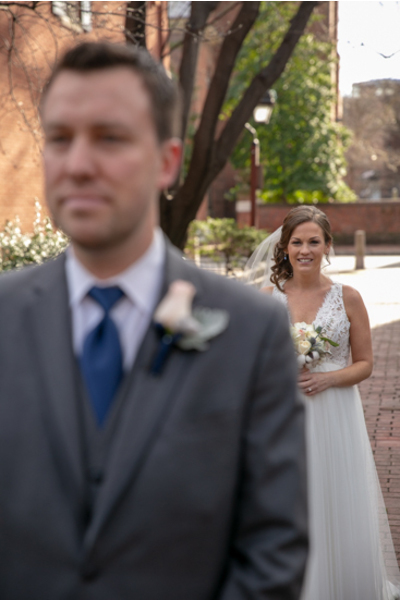 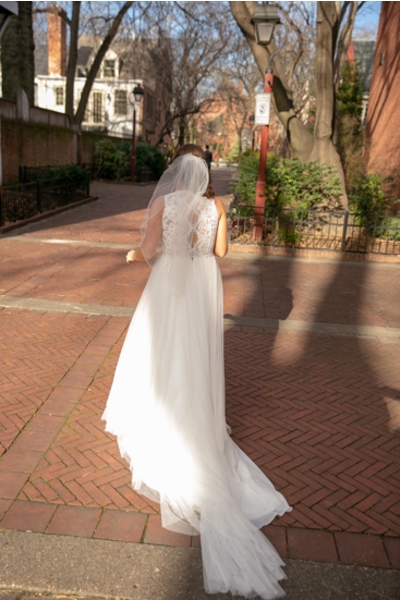 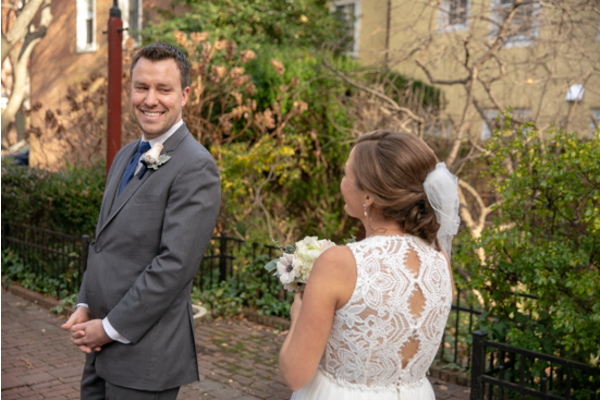 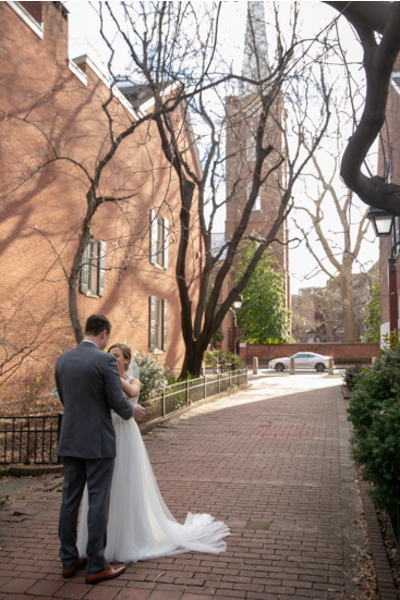 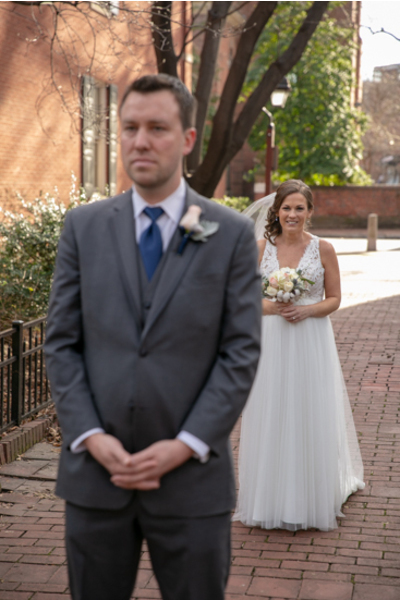 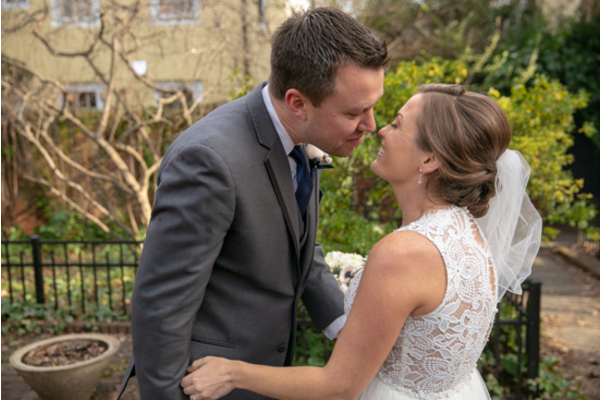 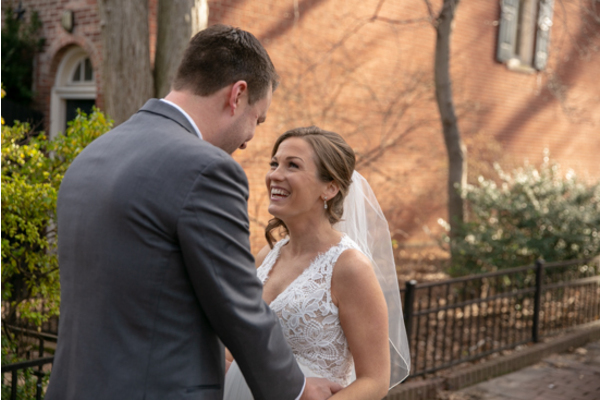 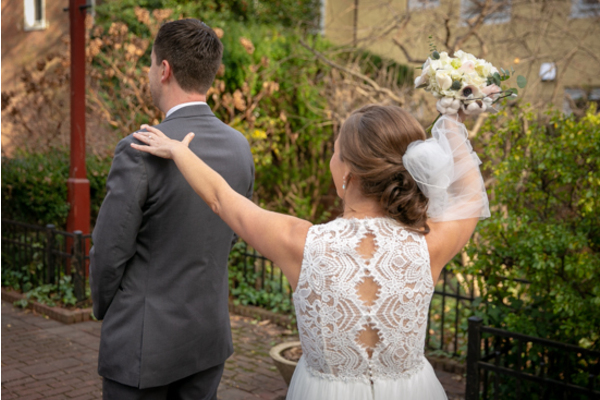 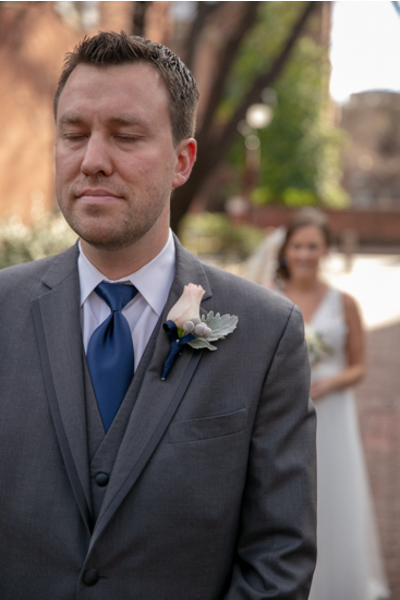 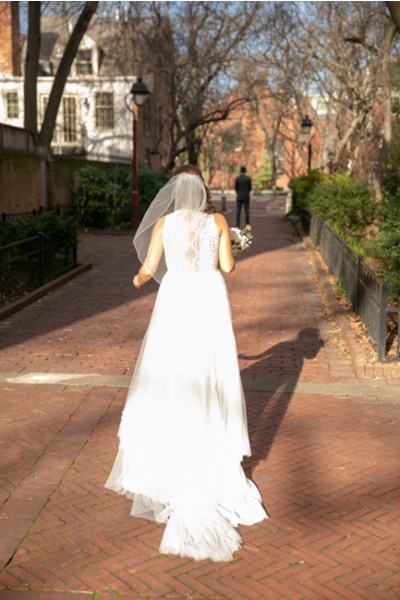 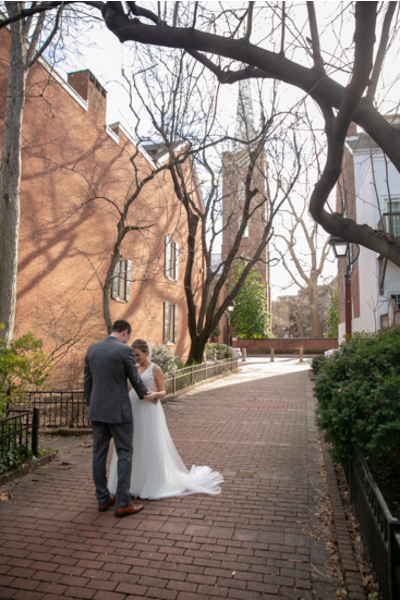 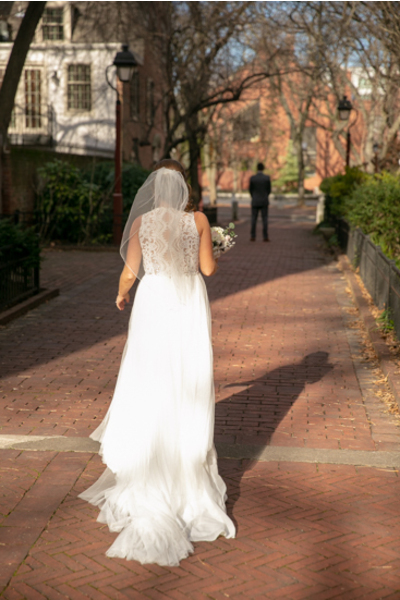 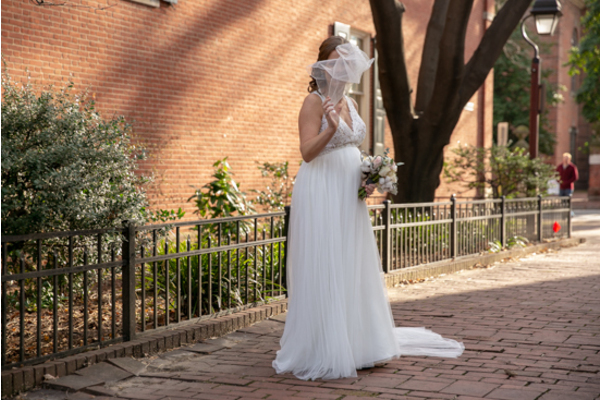 Katie and Dan’s first look was held outside with the sun shining down on them. 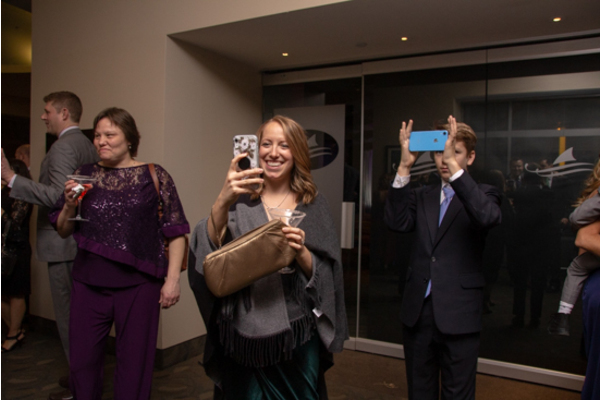 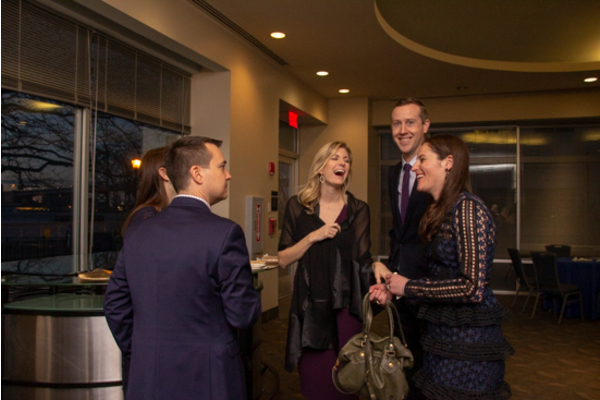 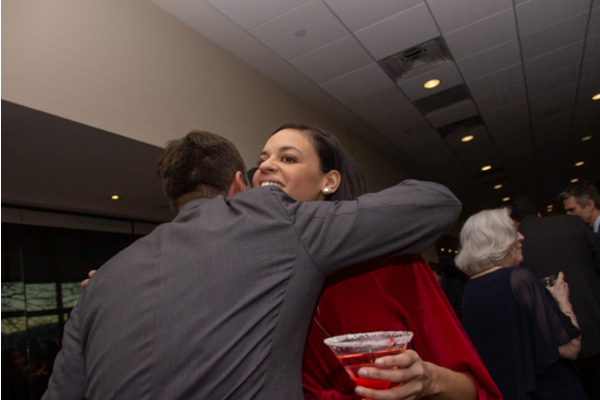 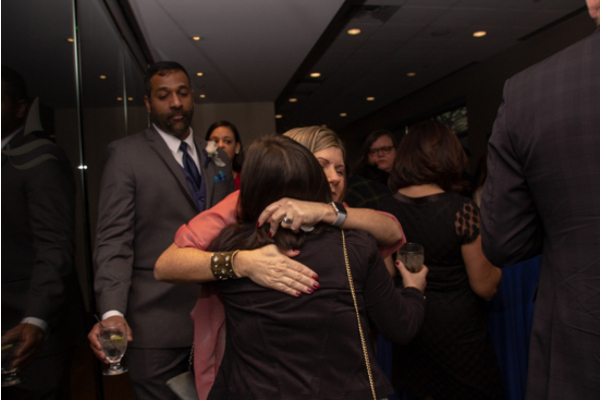 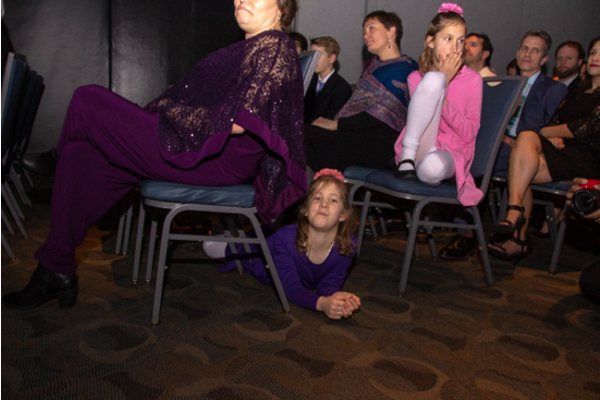 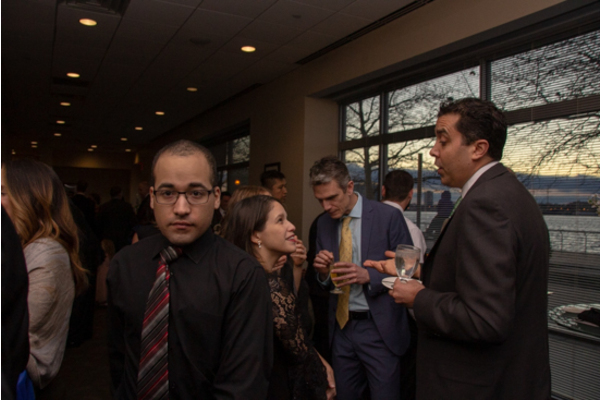 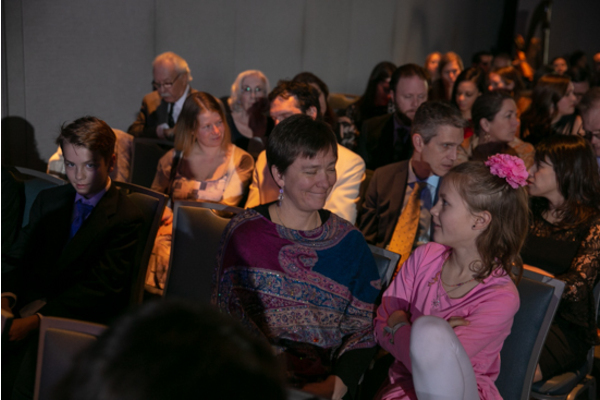 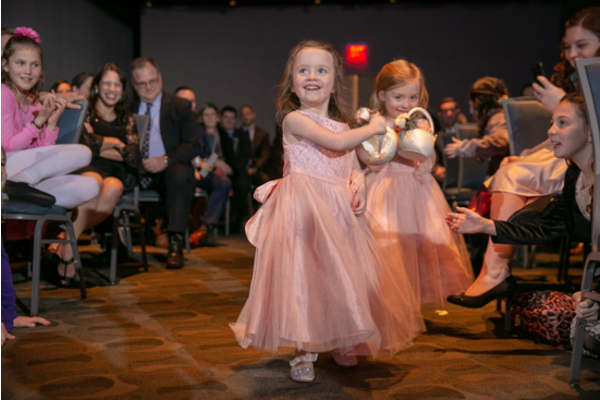 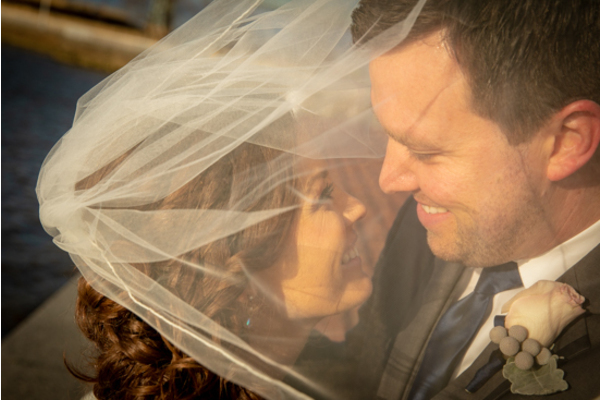 Their overwhelming joy that they were both feeling was carefully portrayed in every photograph. 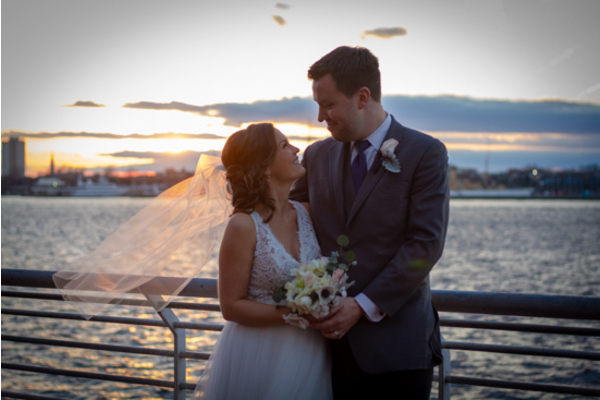 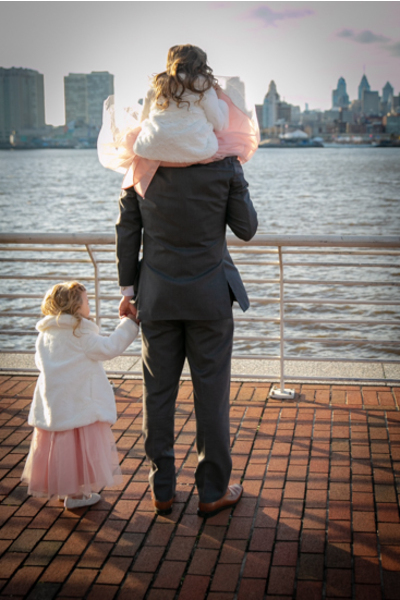 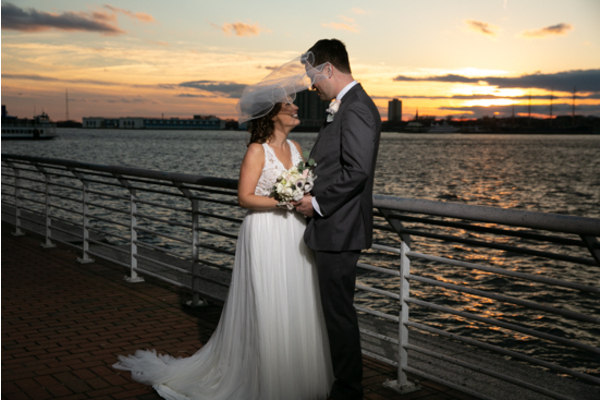 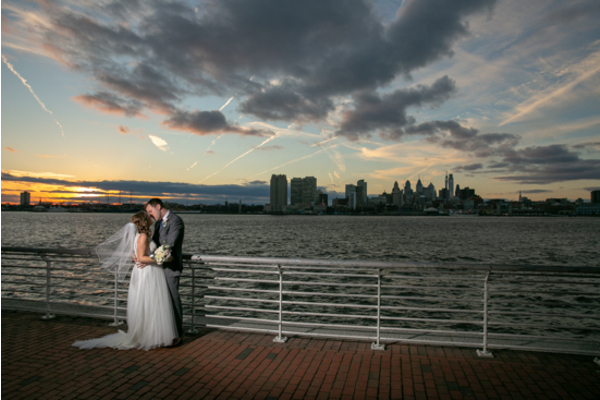 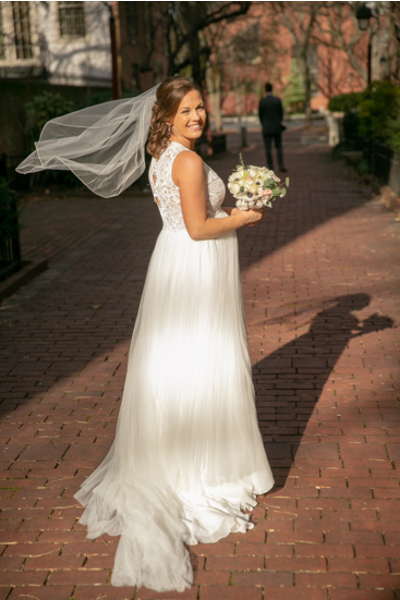 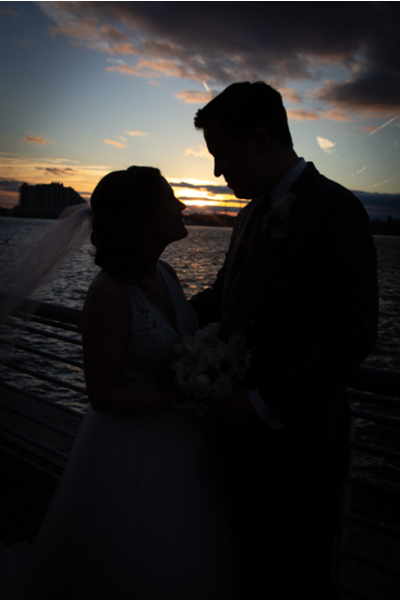 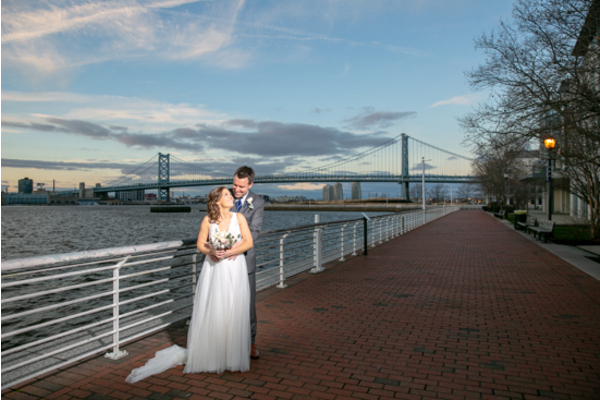 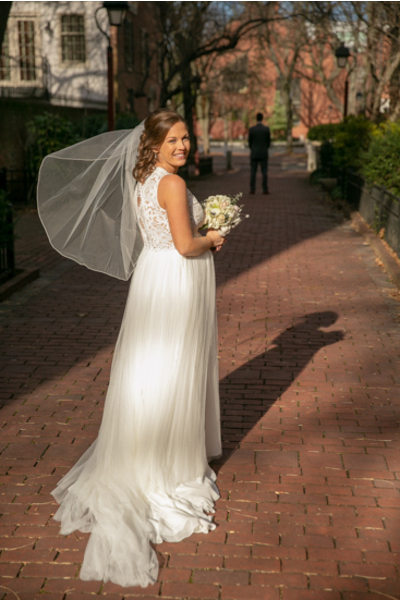 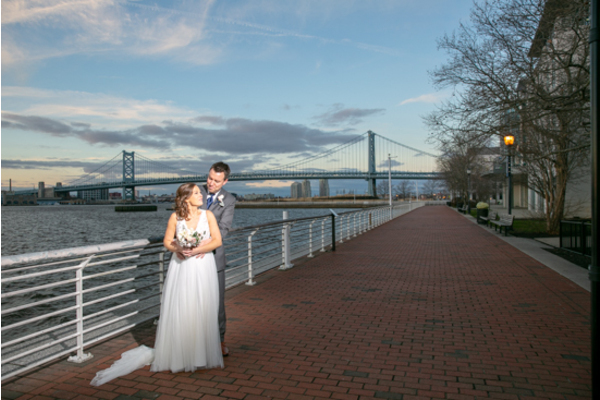 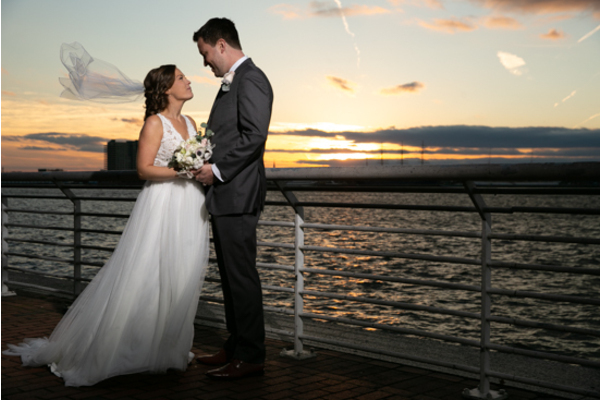 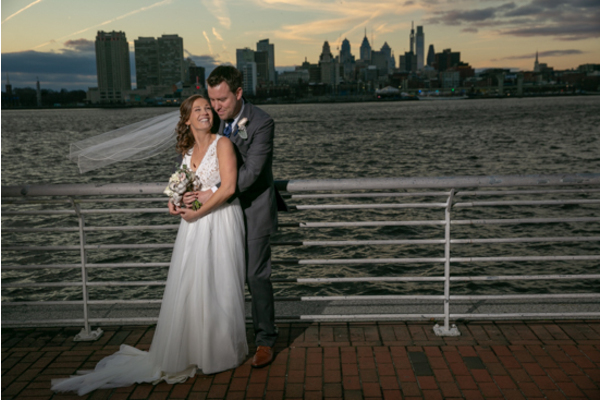 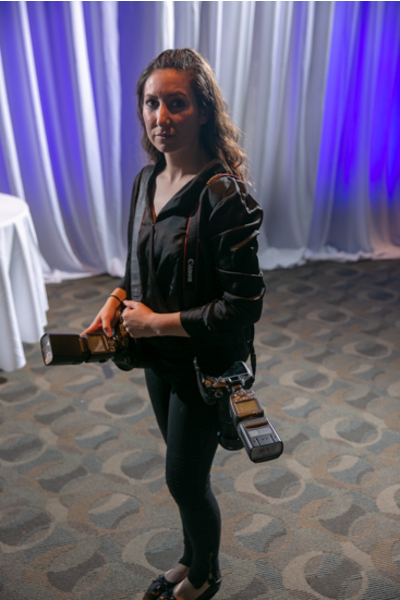 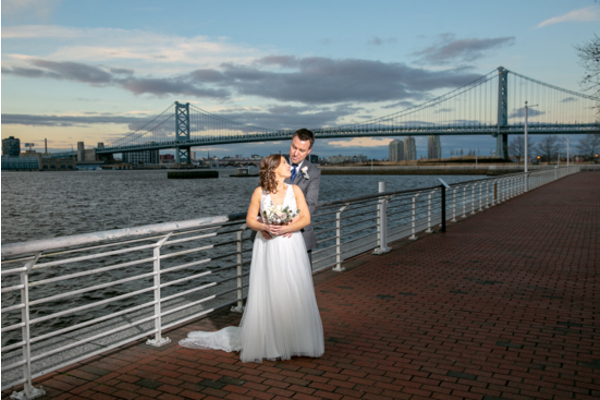 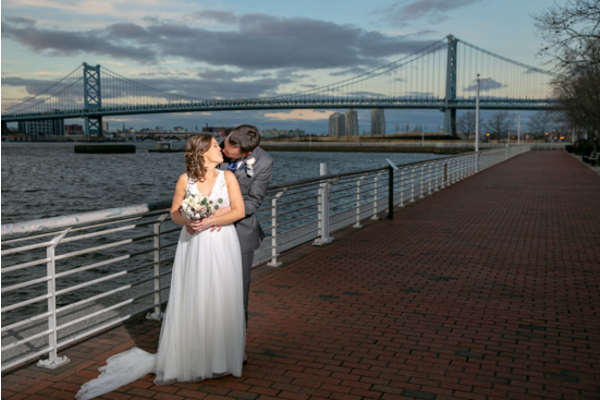 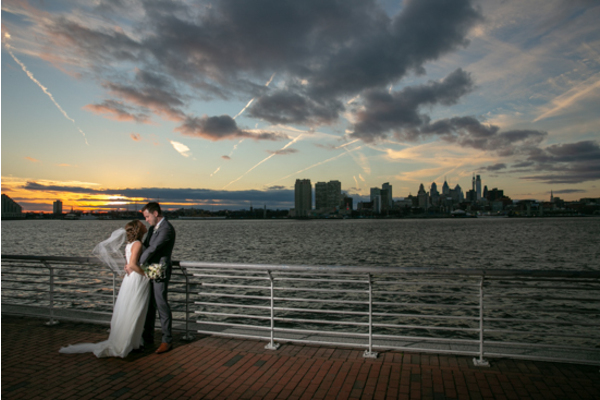 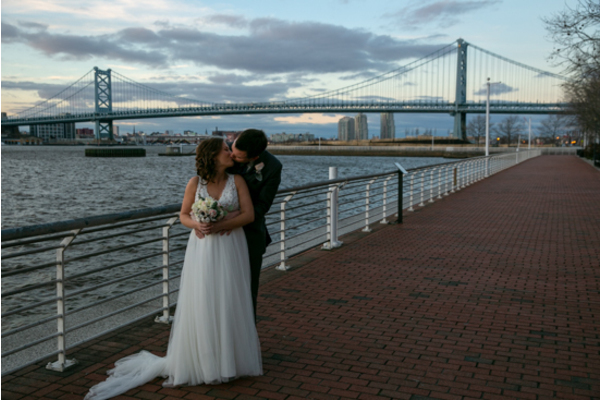 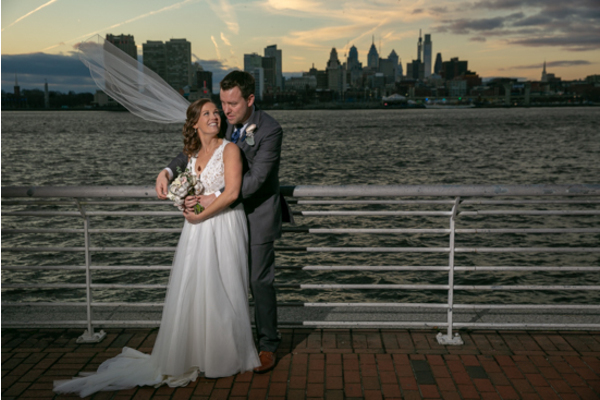 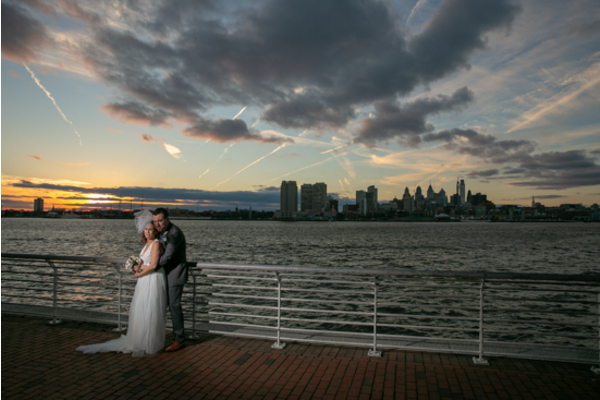 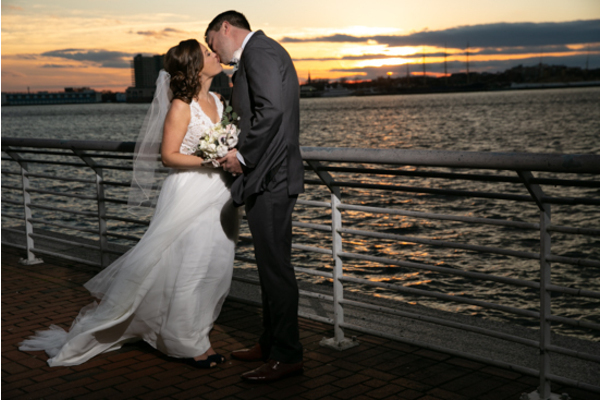 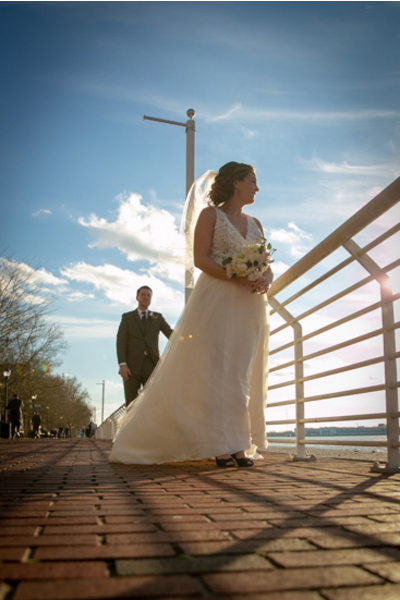 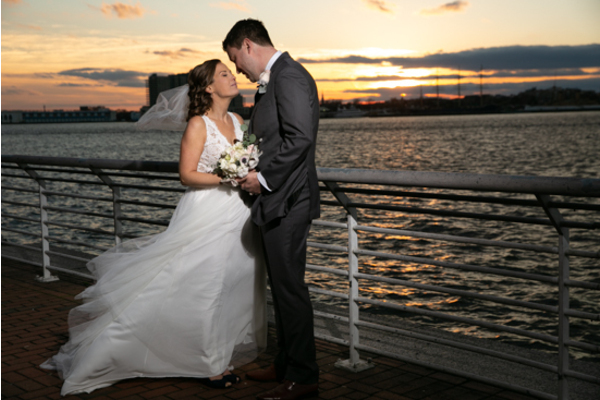 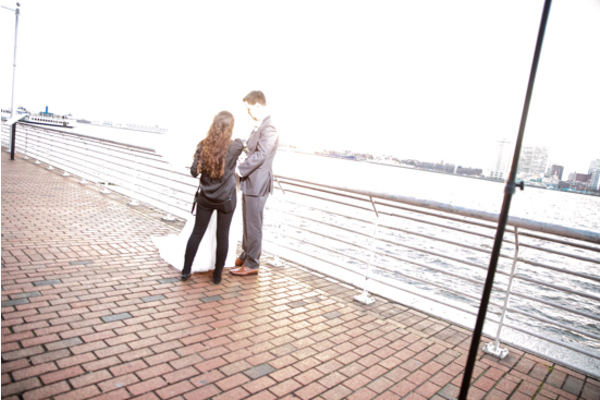 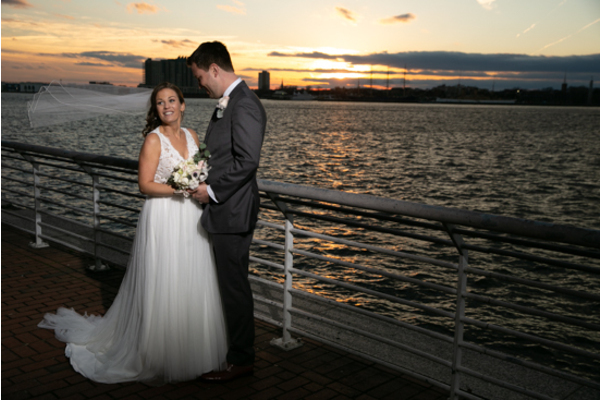 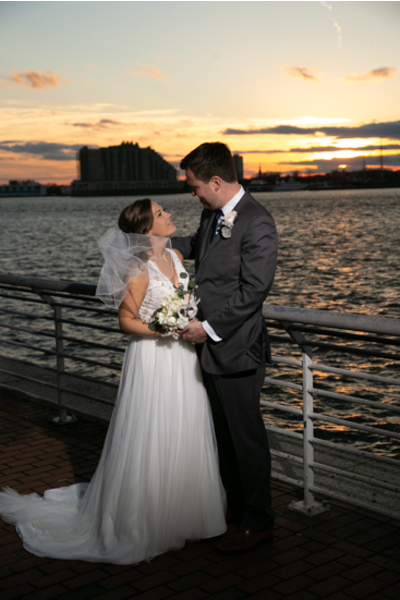 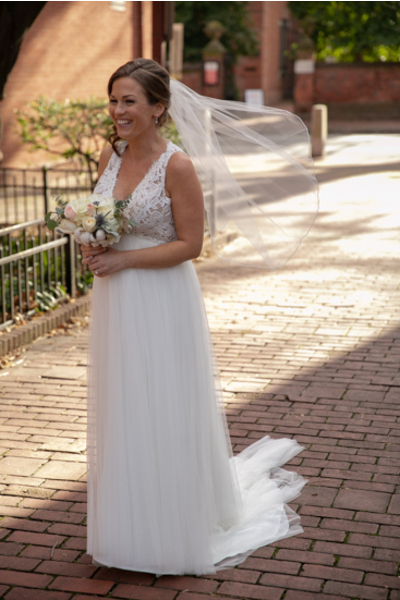 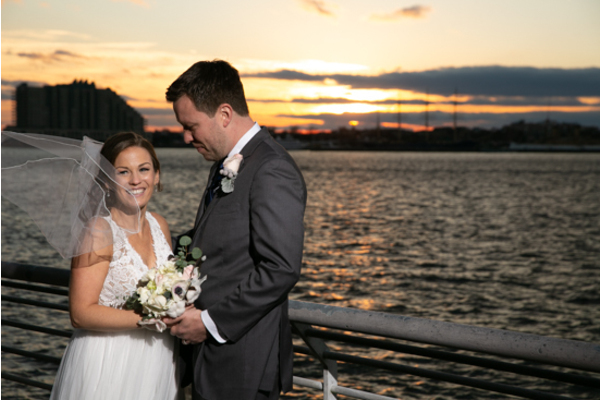 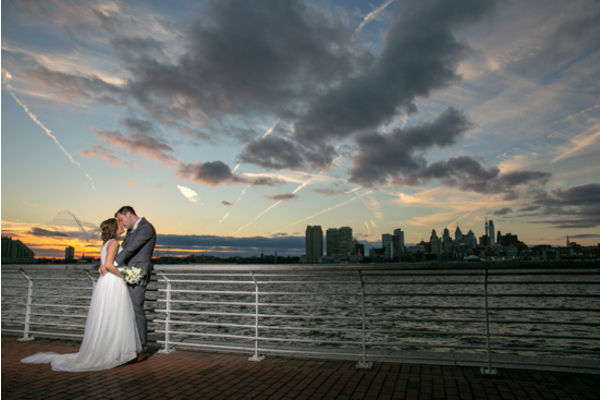 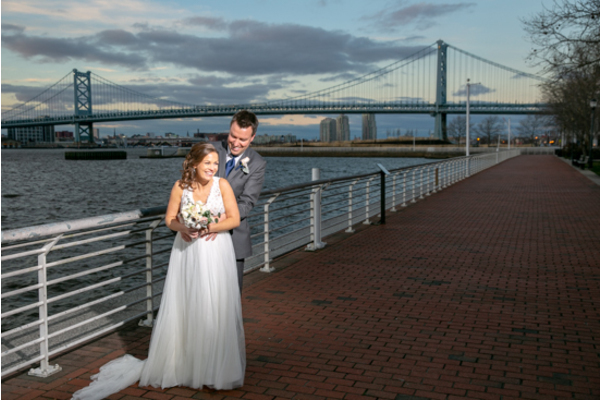 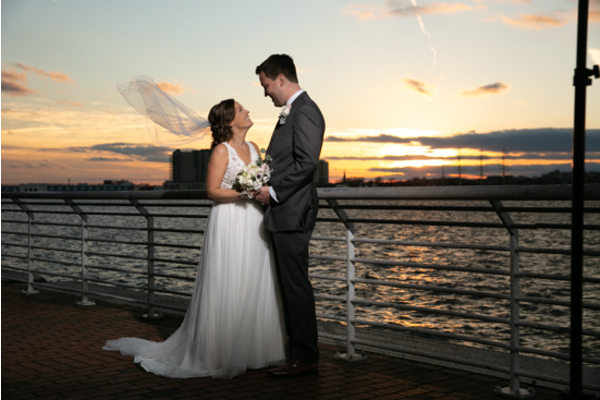 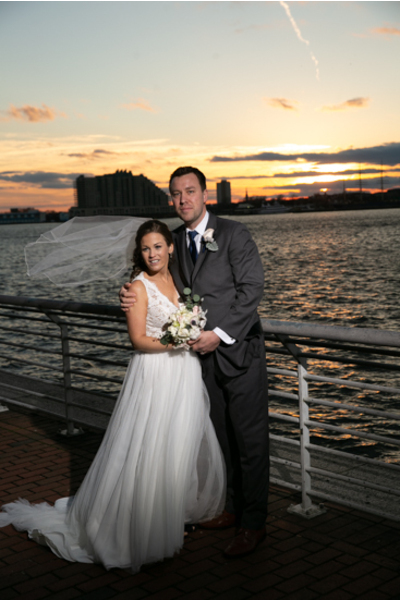 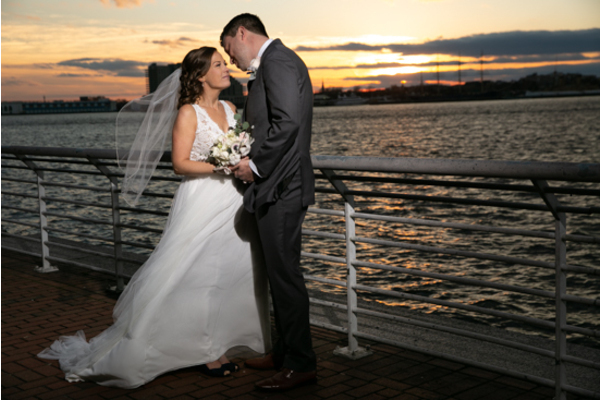 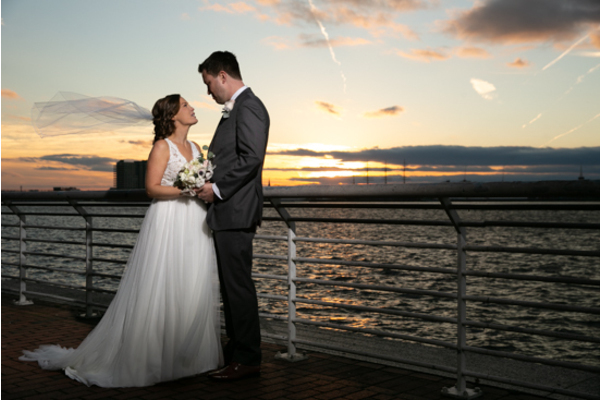 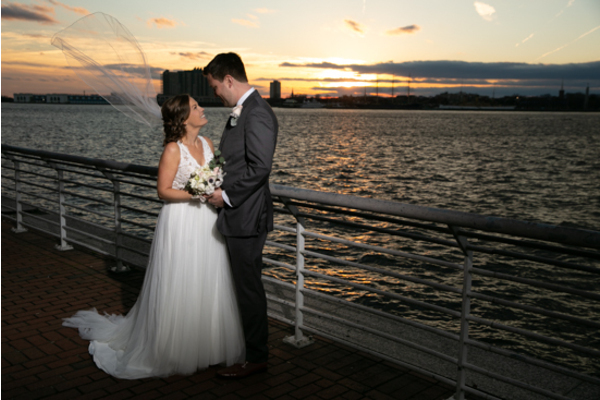 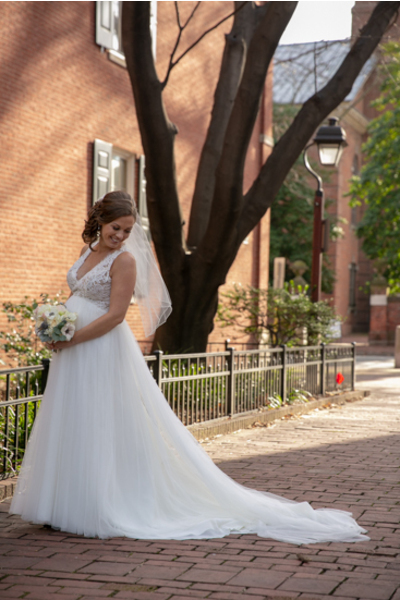 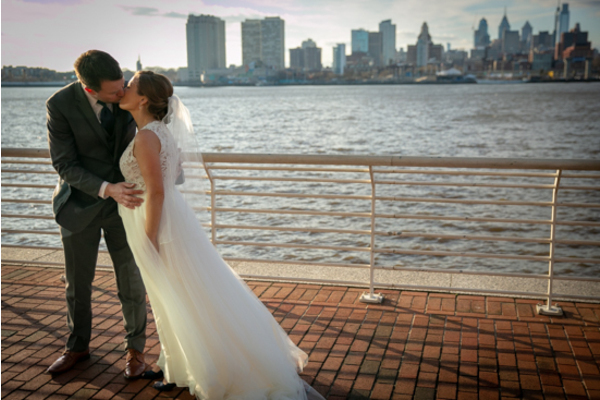 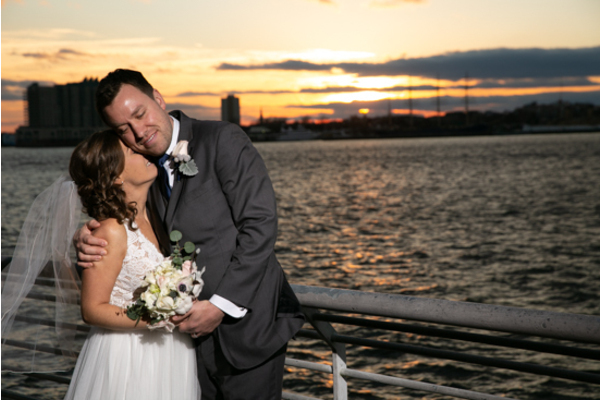 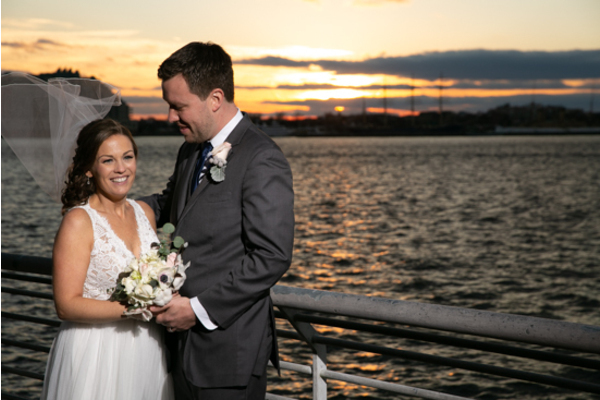 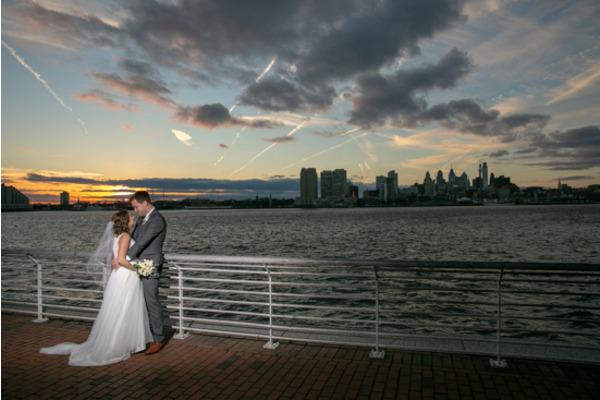 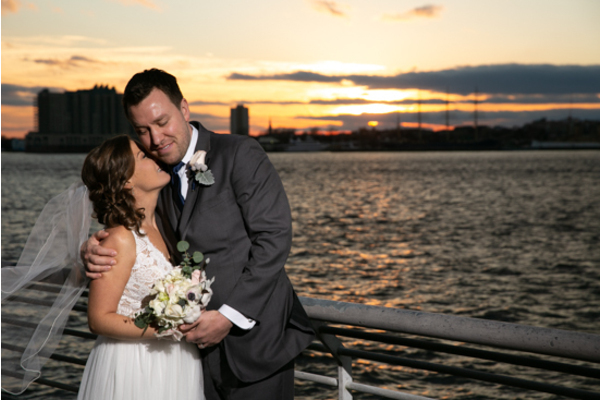 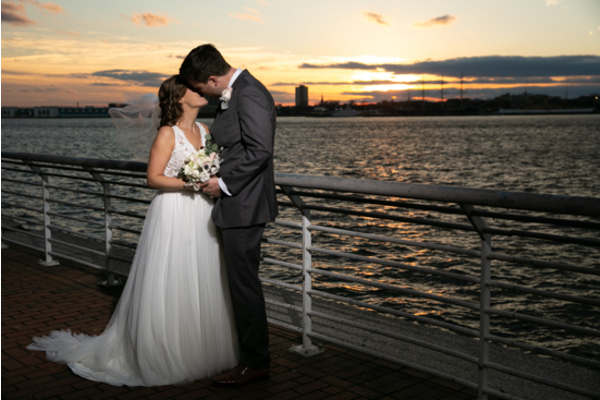 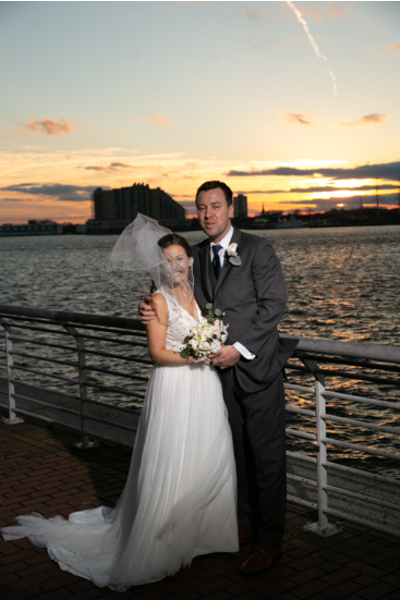 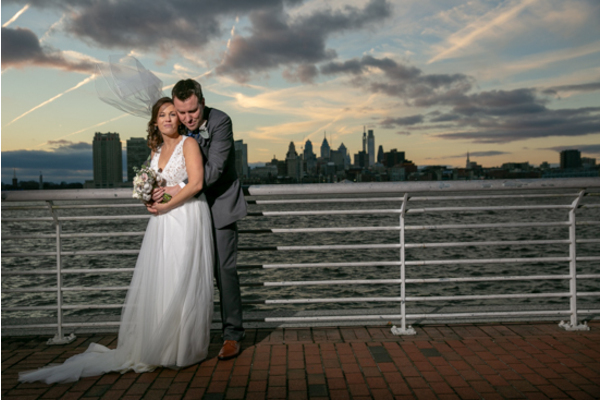 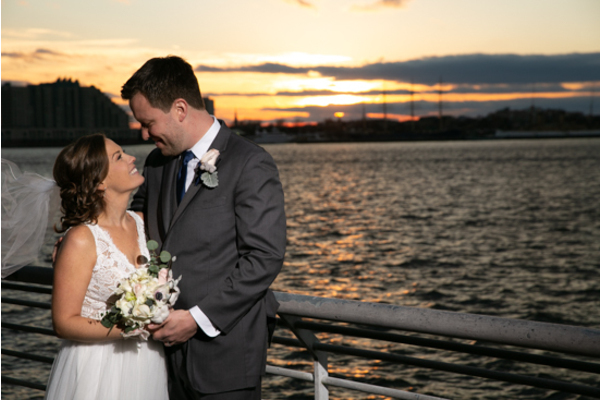 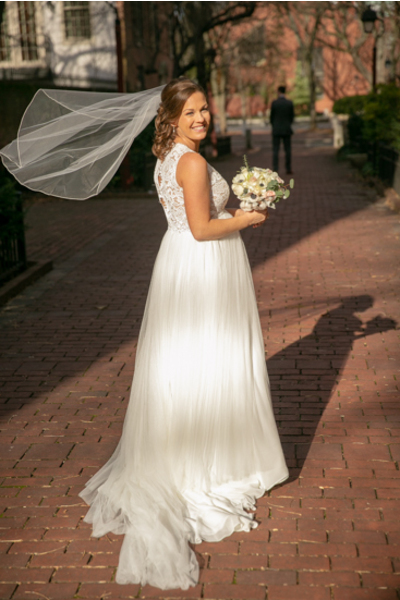 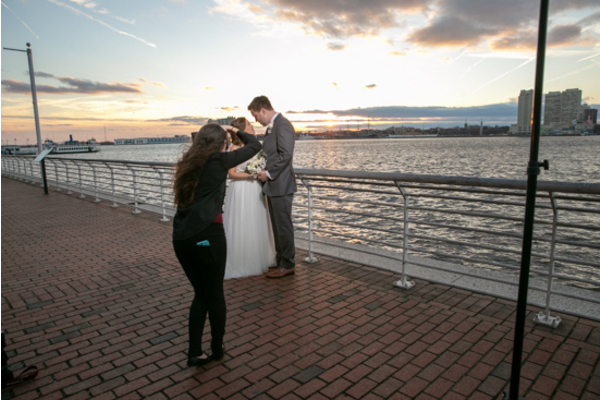 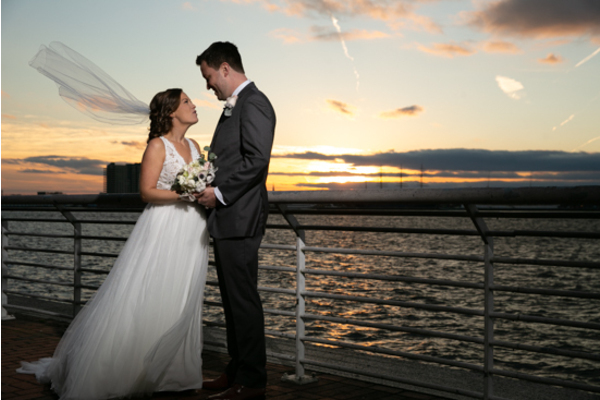 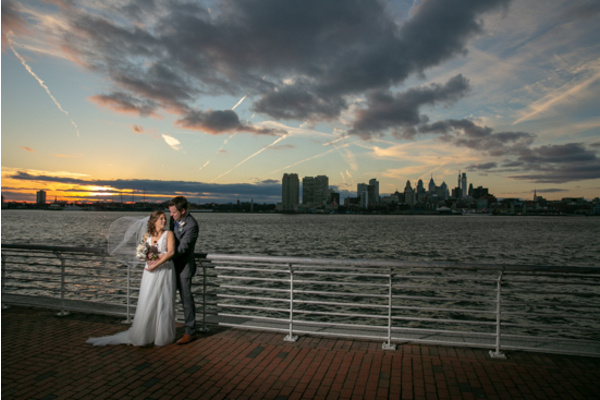 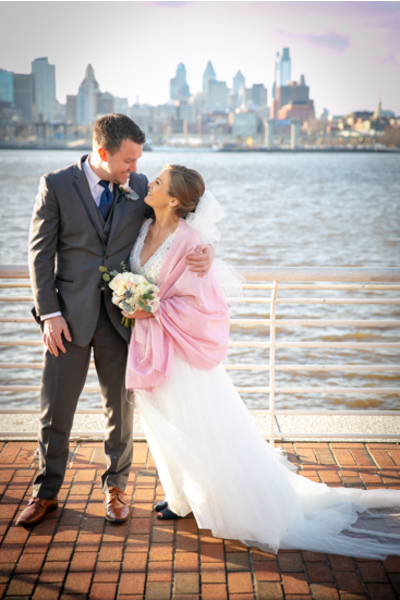 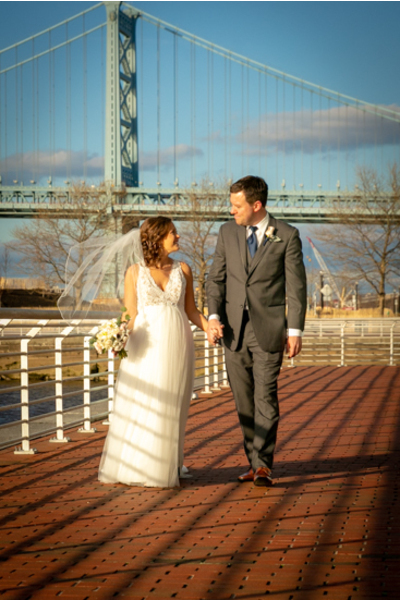 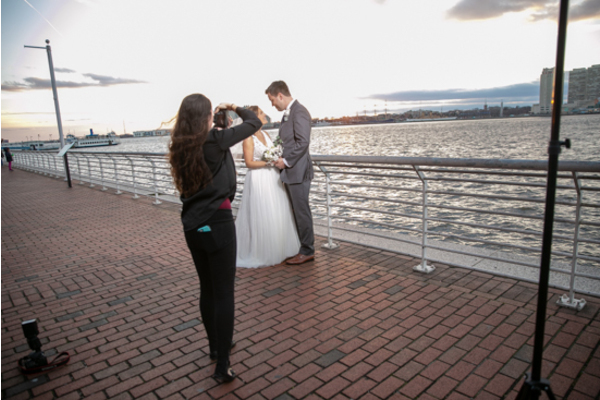 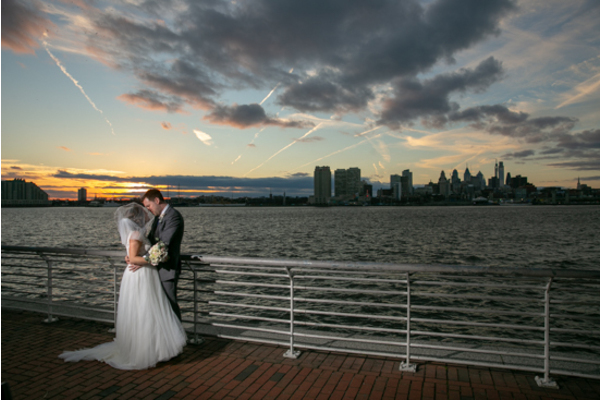 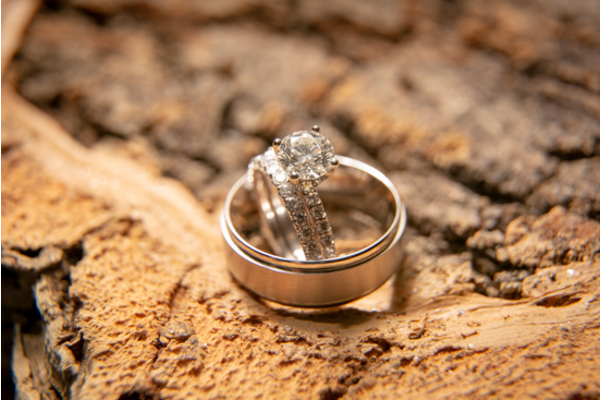 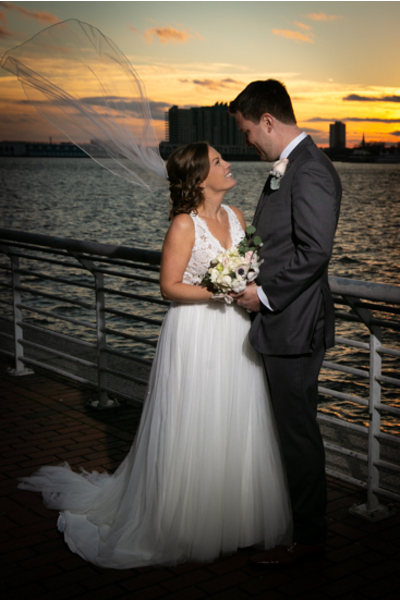 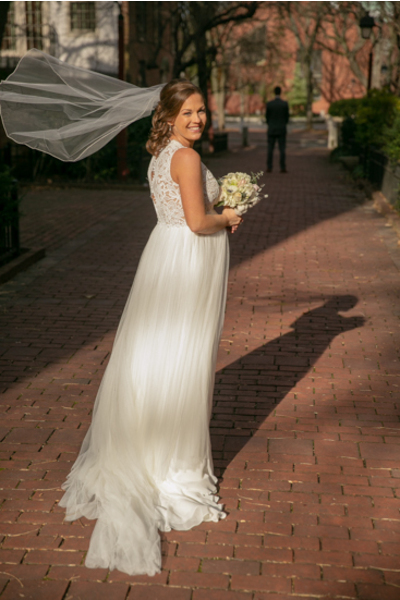 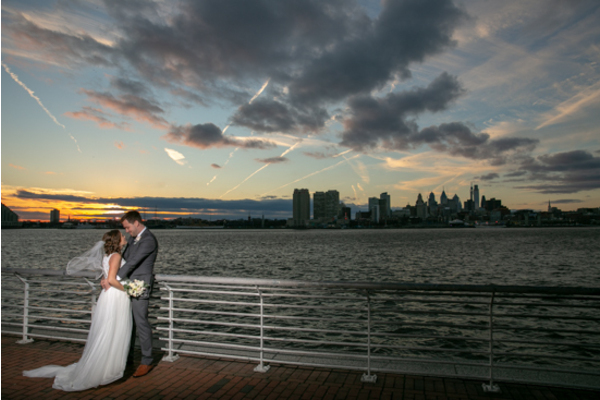 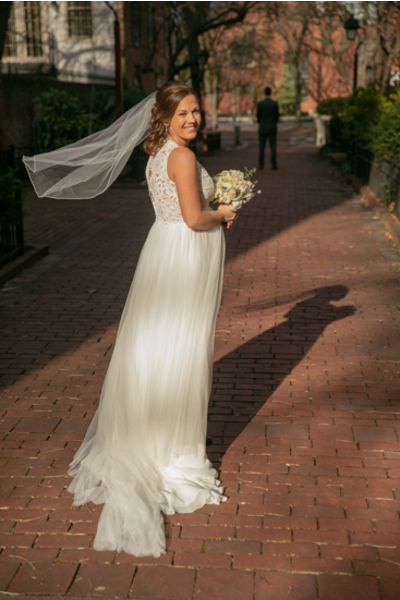 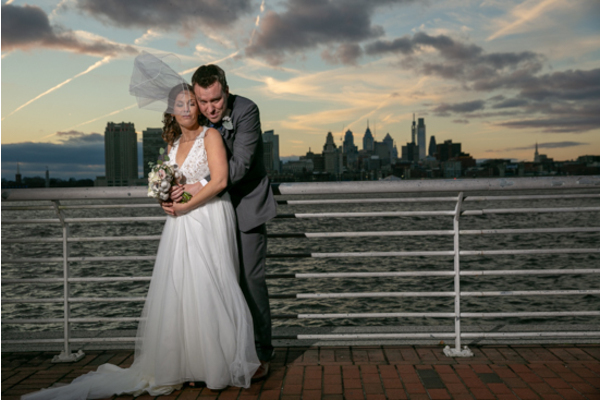 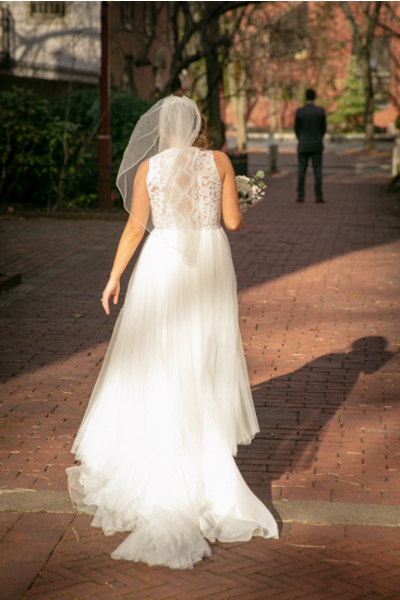 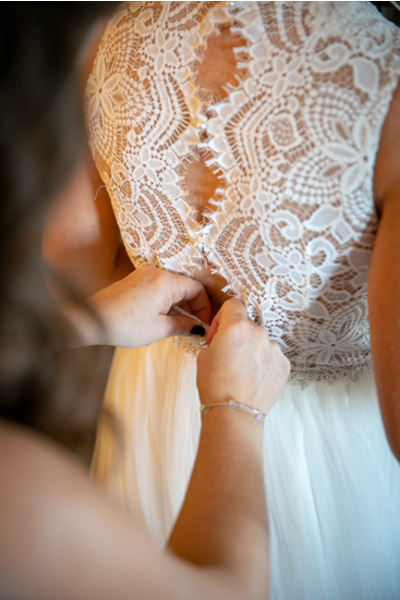 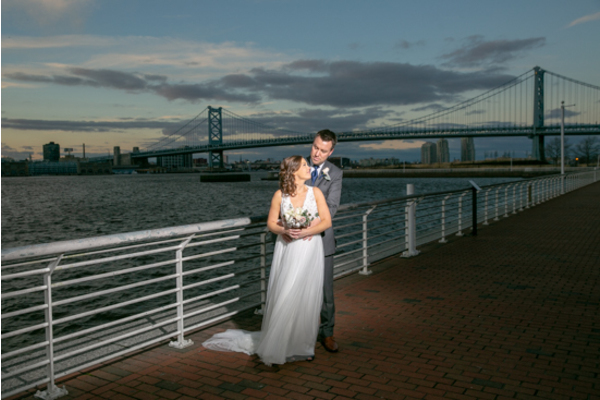 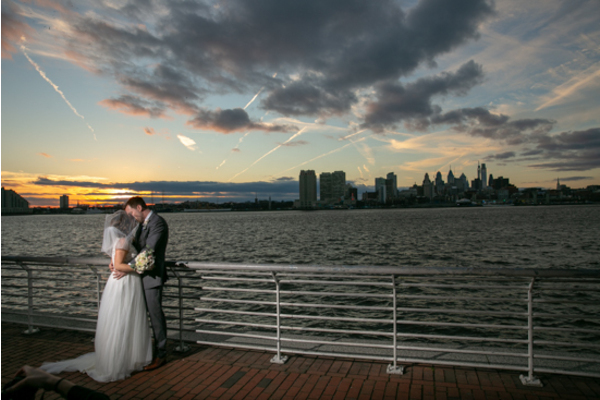 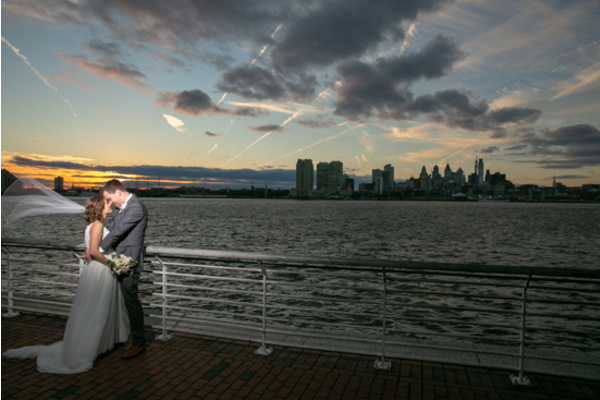 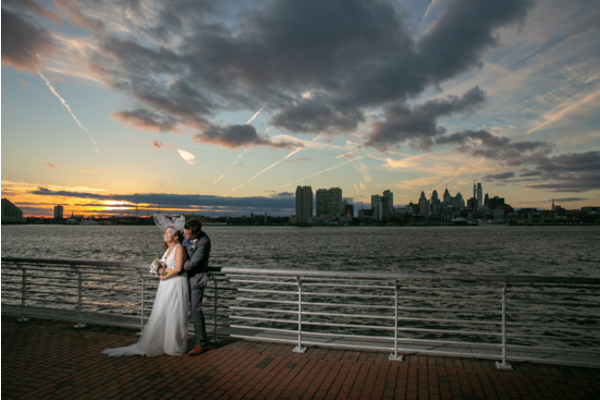 Next, our NJ Wedding Photographer followed the couple over to the riverfront for a breathtaking portrait session! 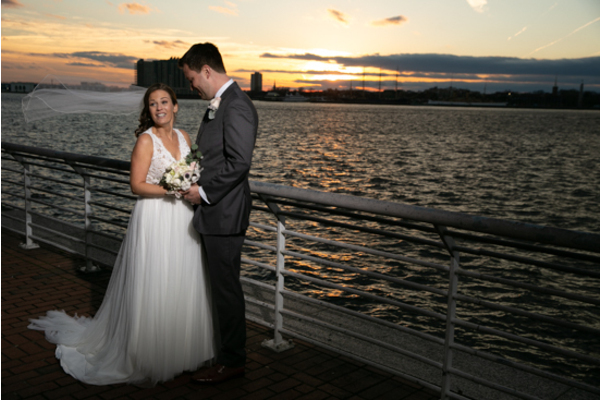 The sun gleamed down on the water and made their bright smiles stand out even more. 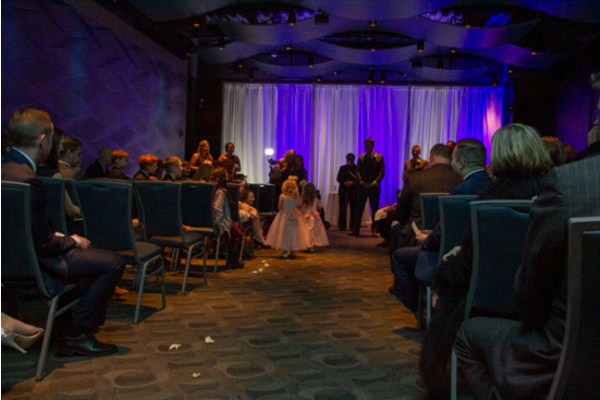 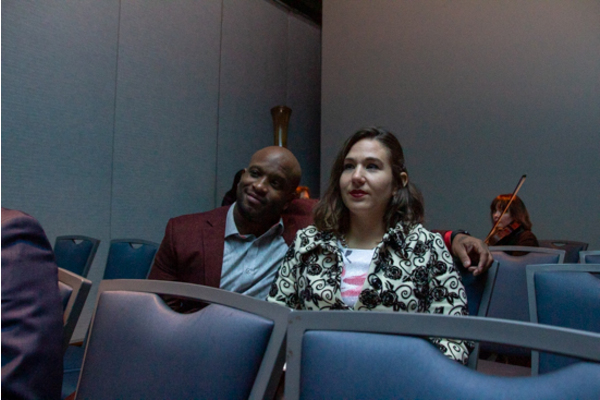 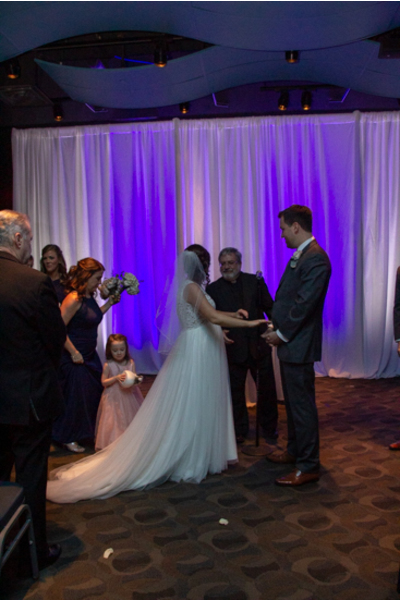 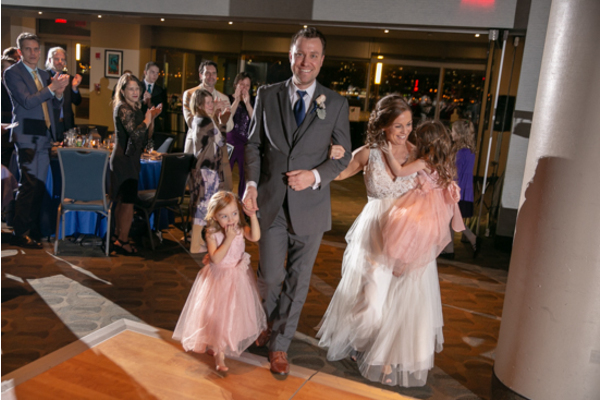 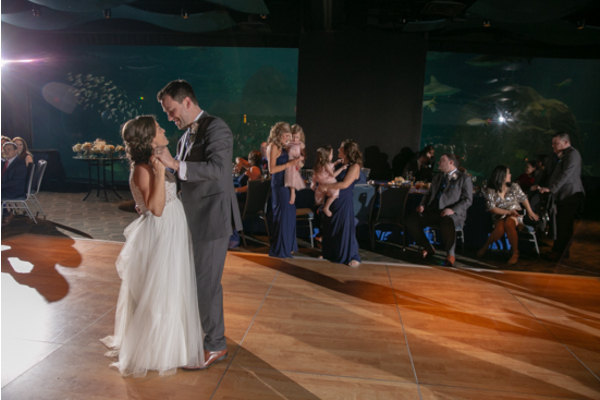 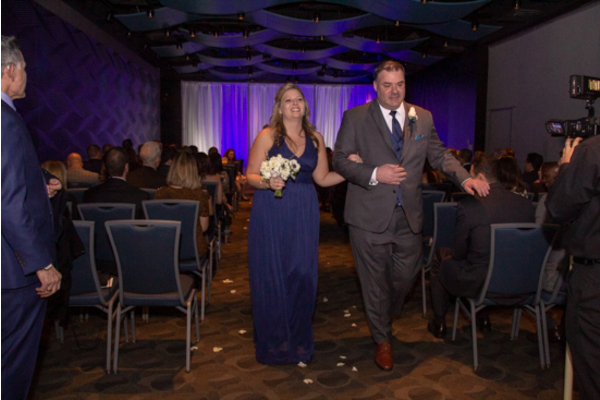 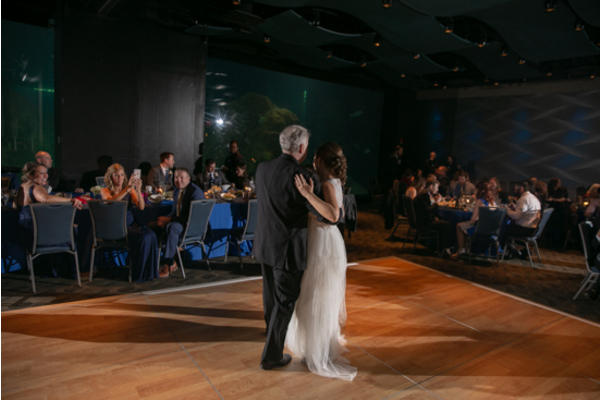 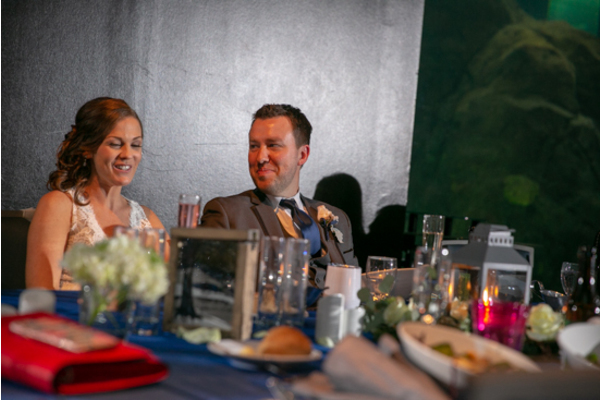 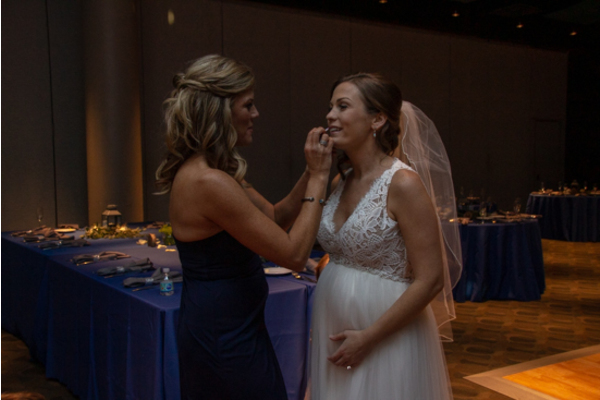 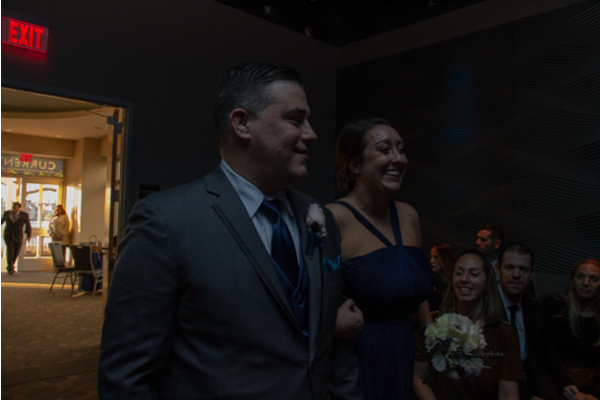 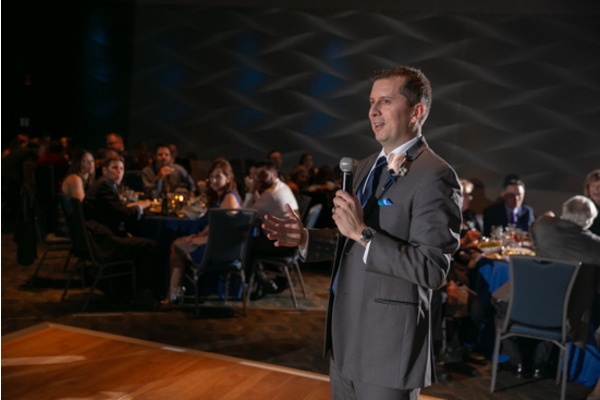 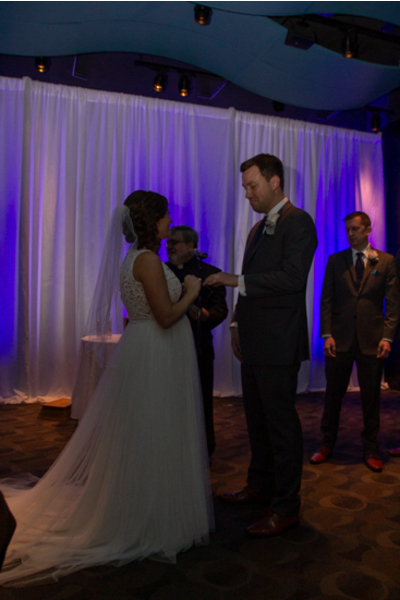 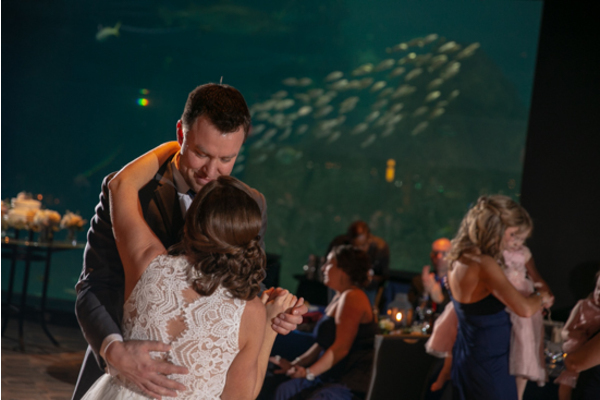 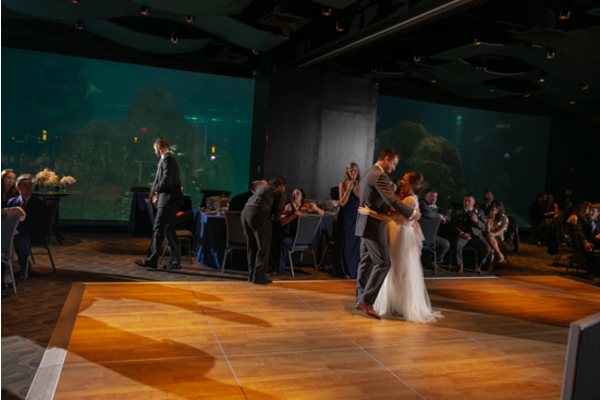 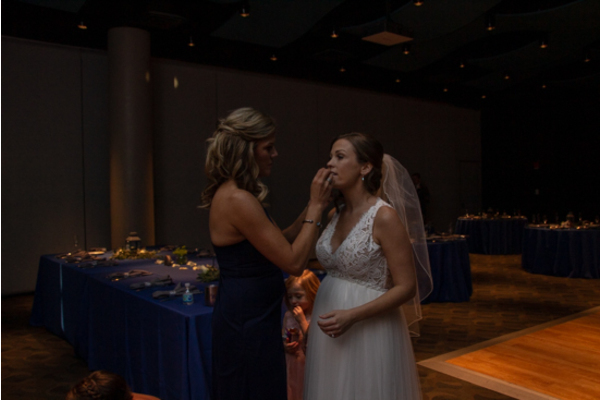 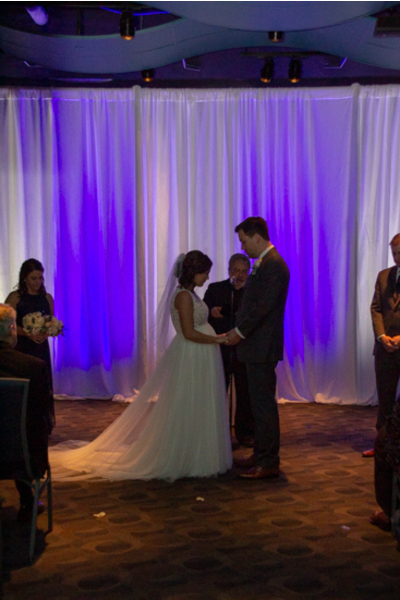 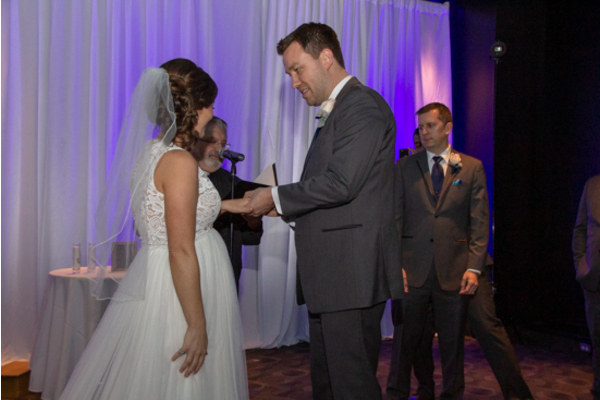 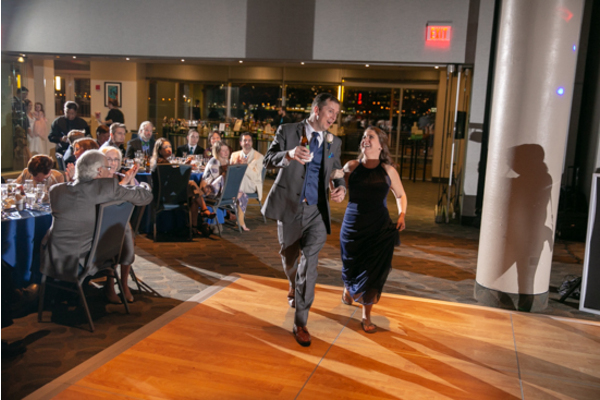 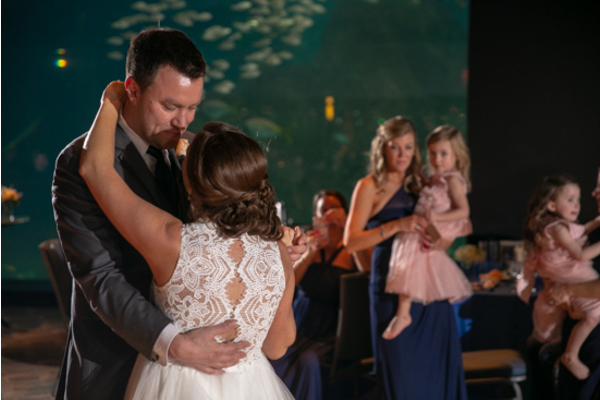 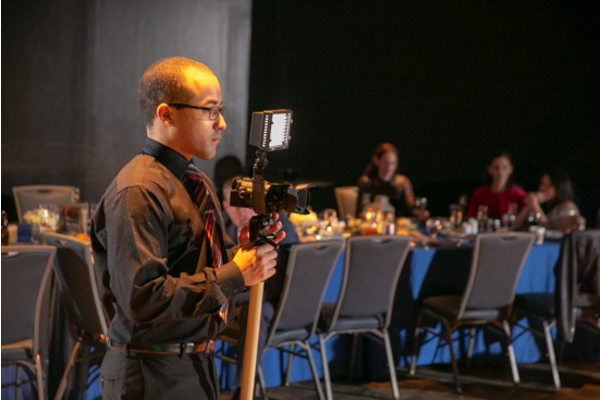 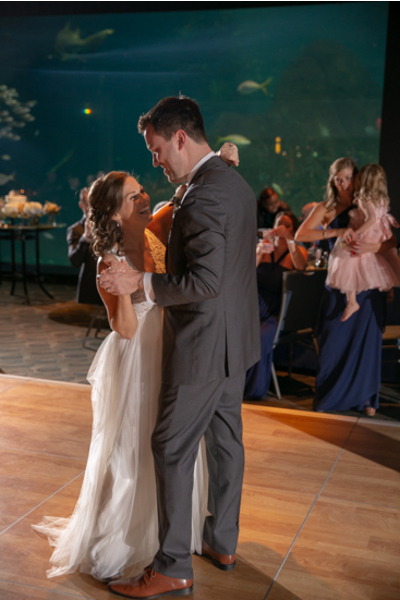 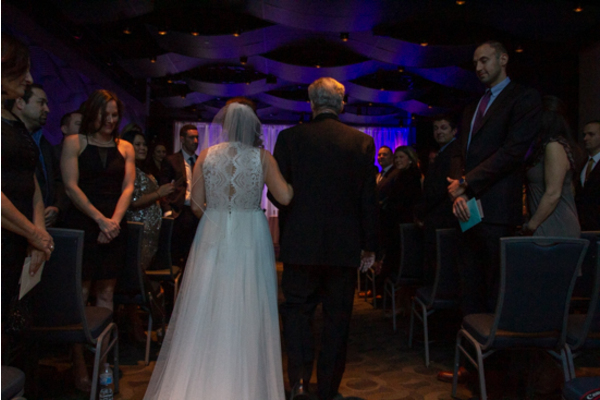 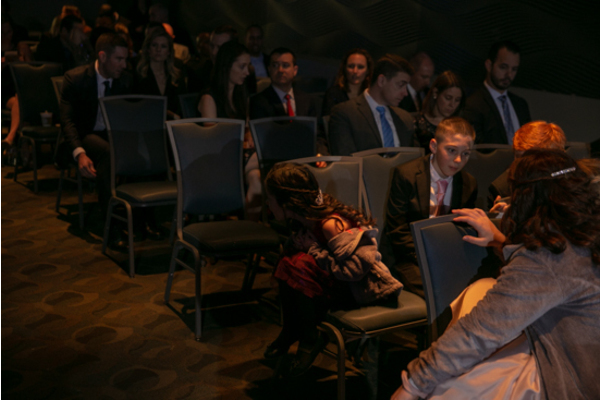 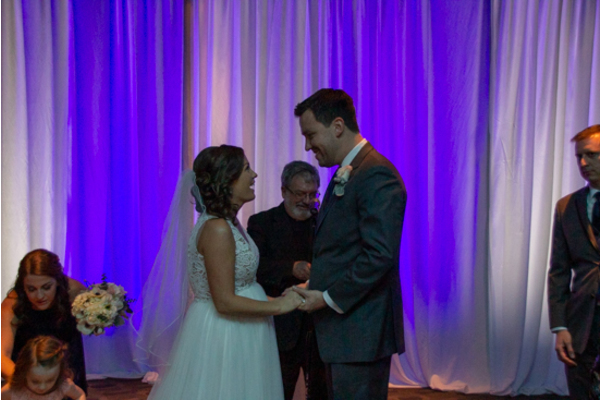 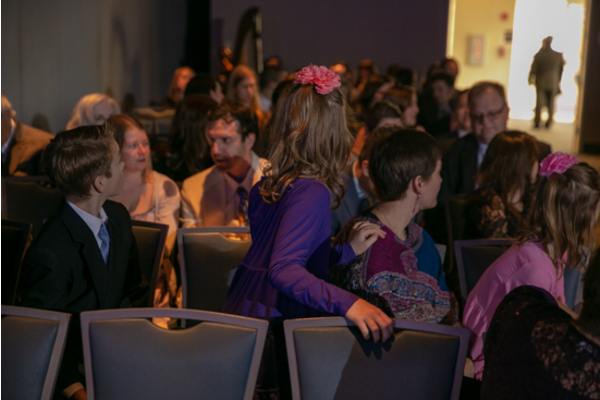 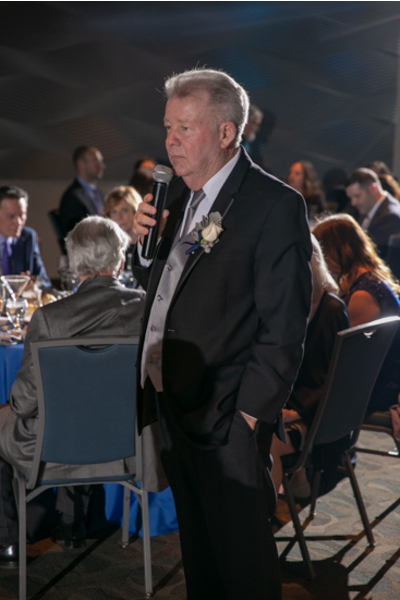 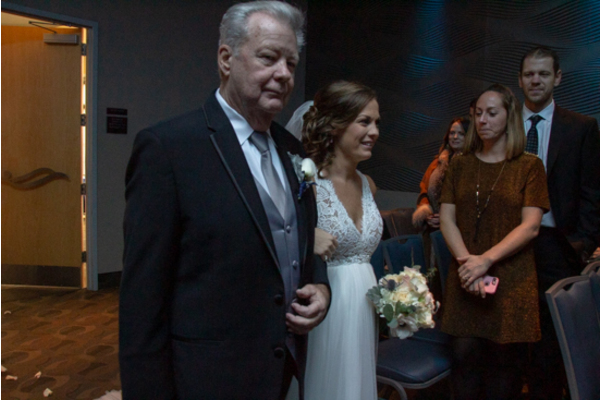 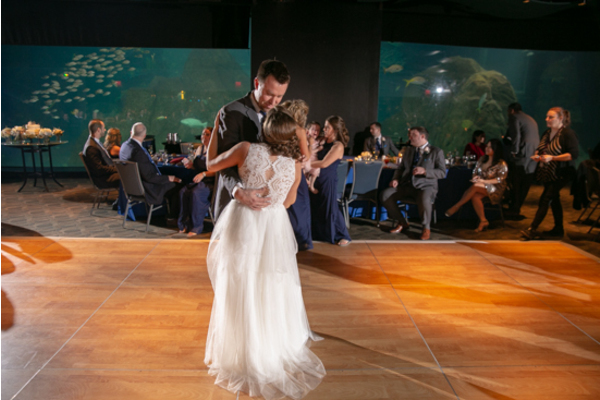 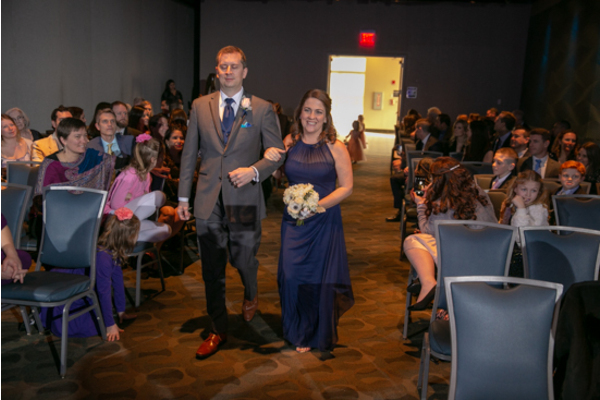 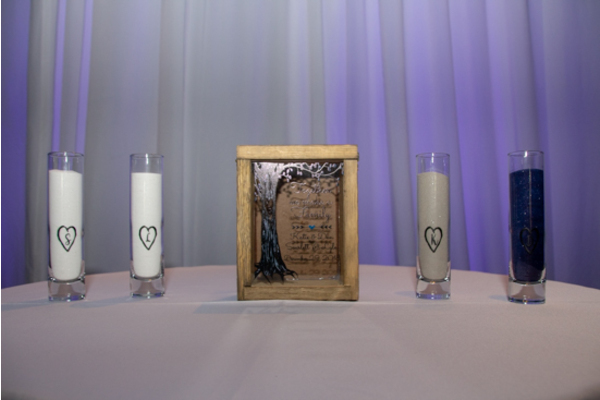 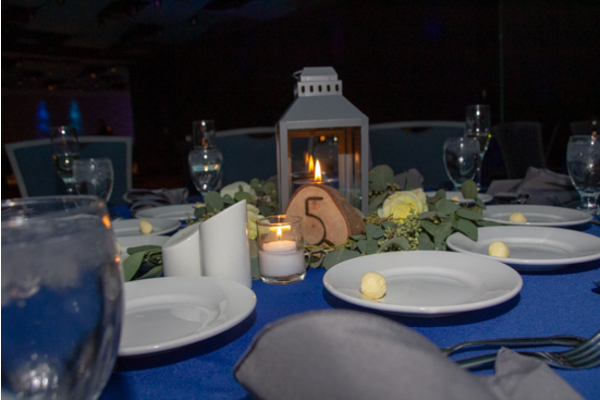 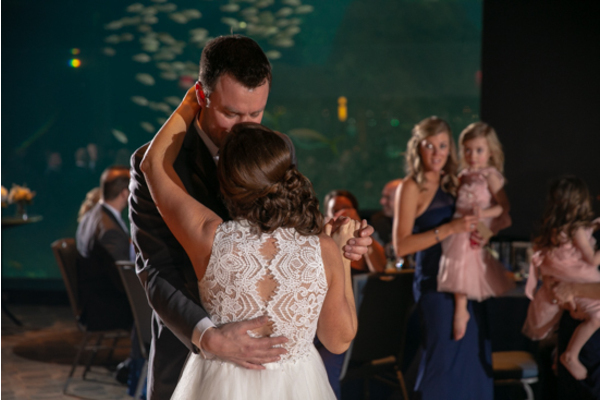 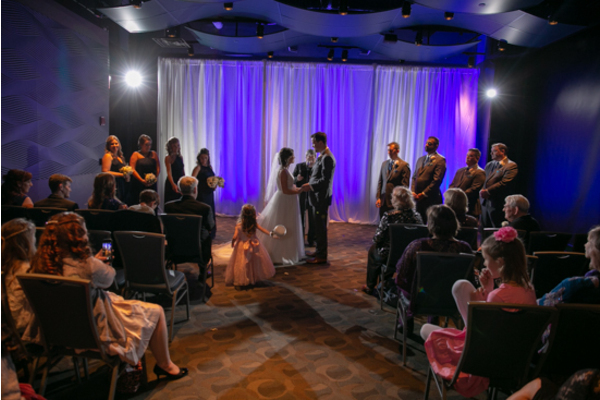 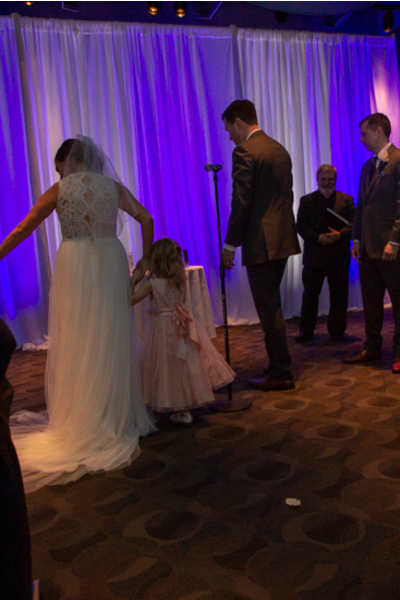 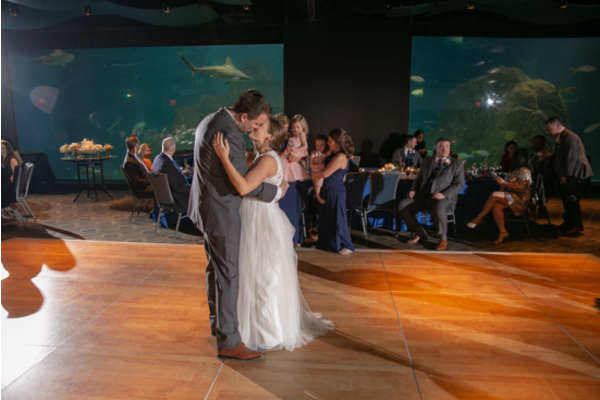 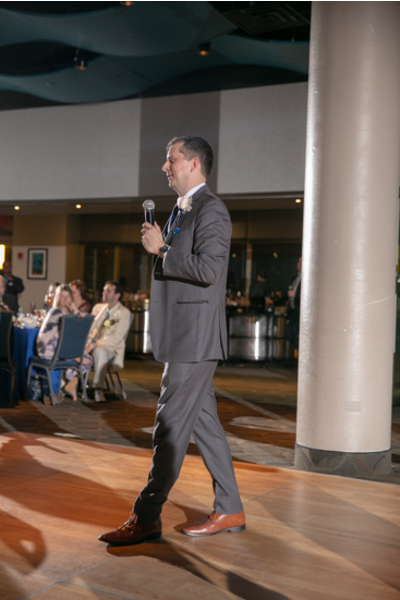 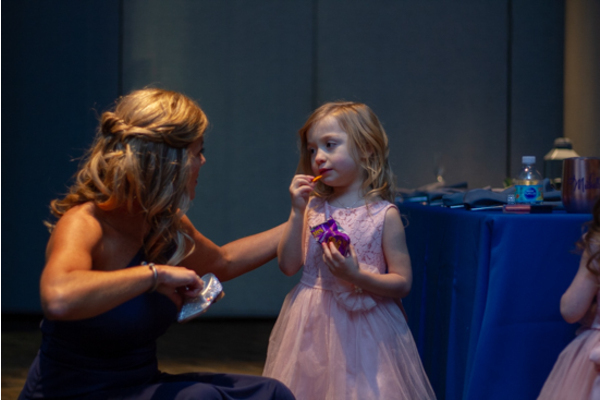 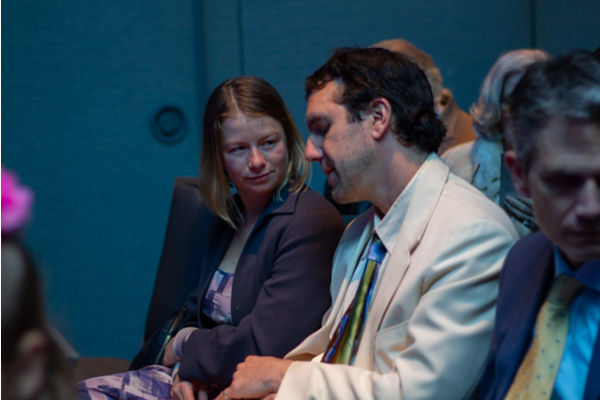 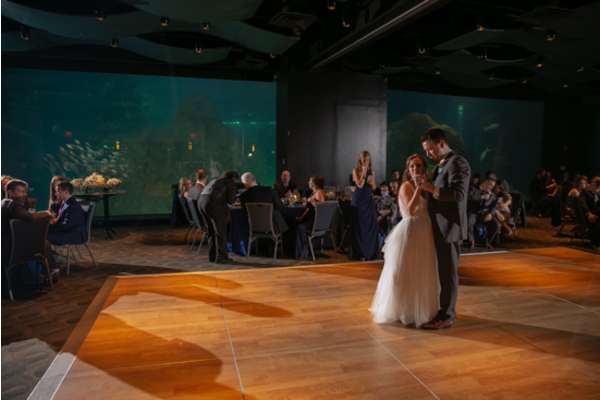 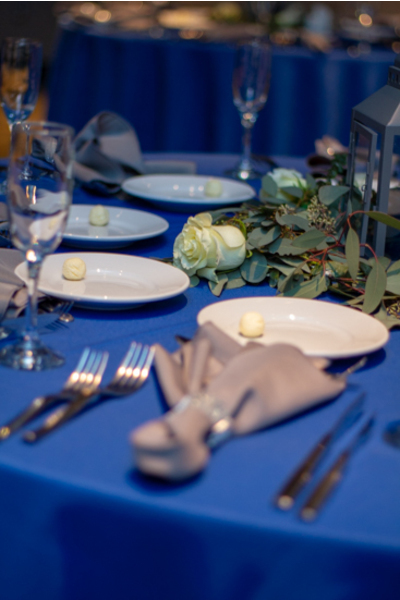 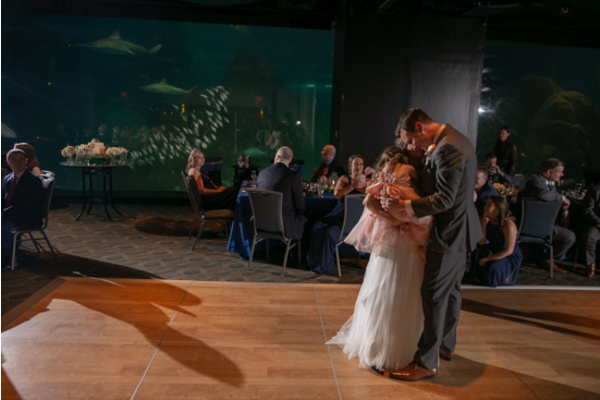 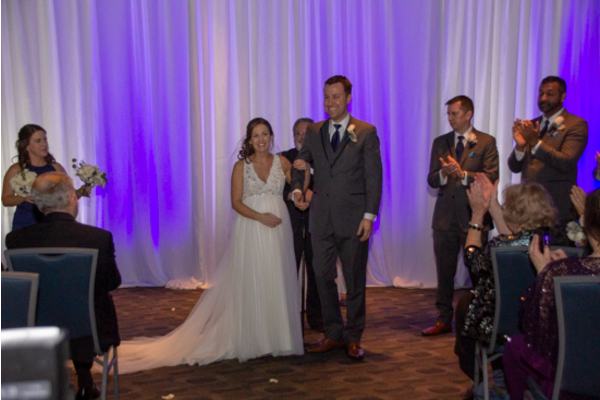 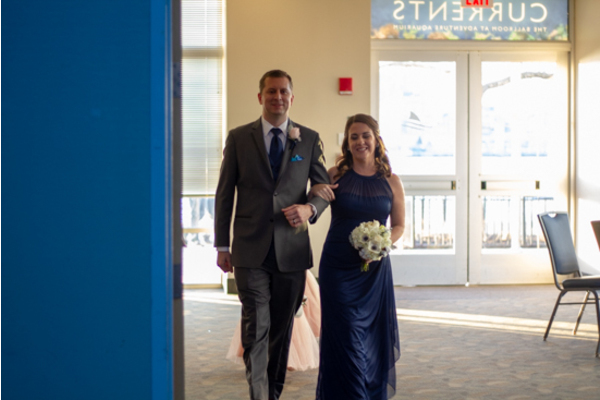 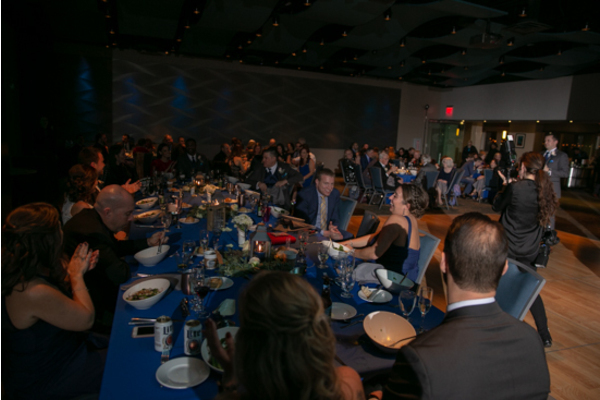 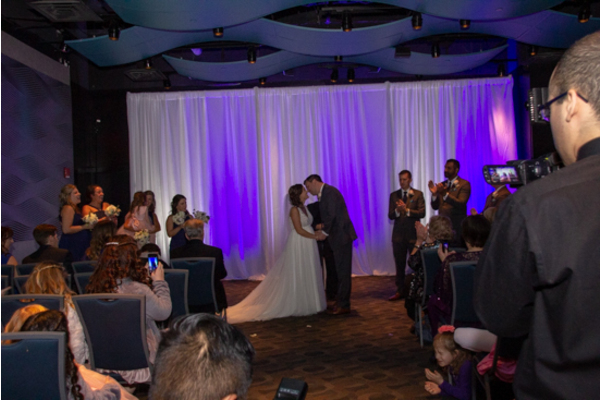 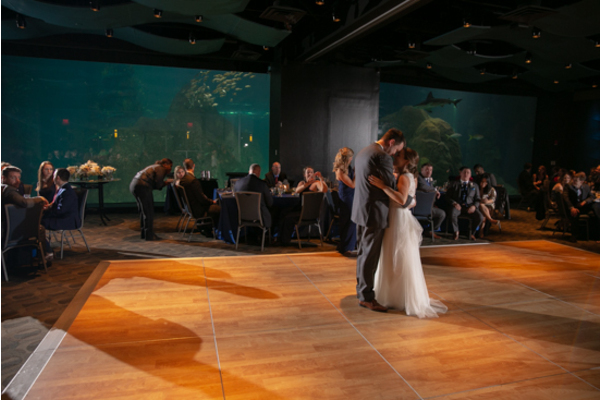 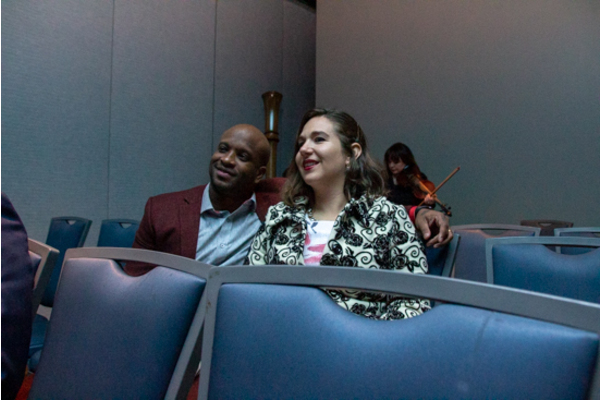 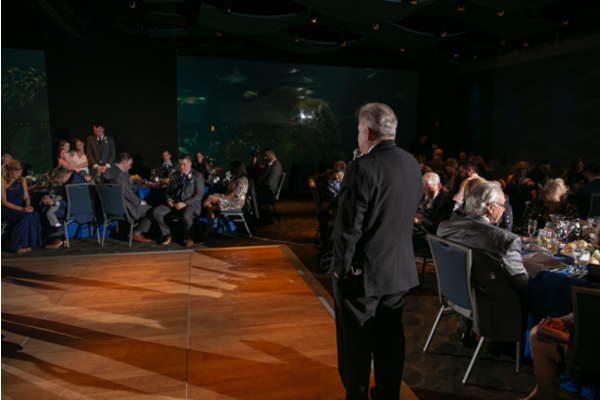 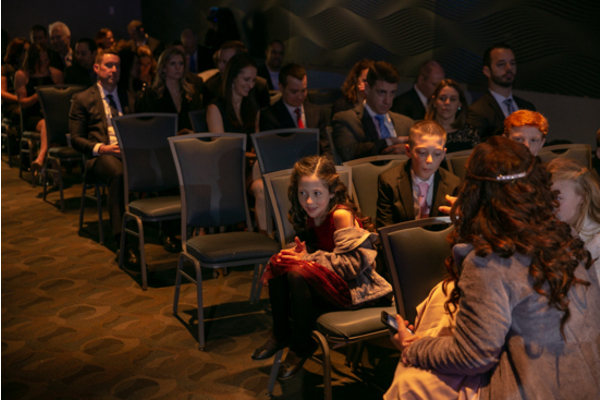 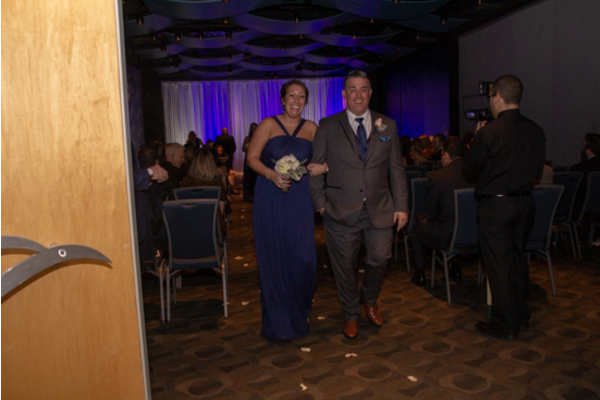 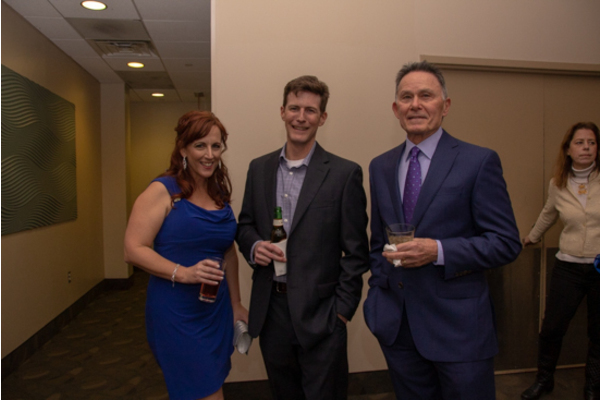 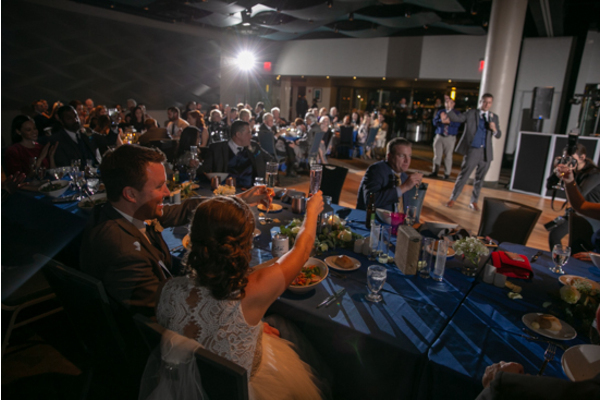 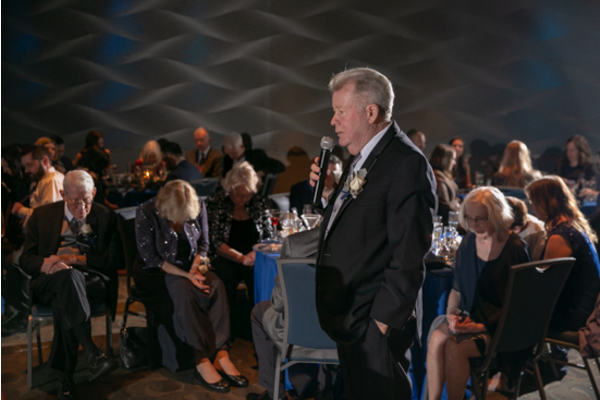 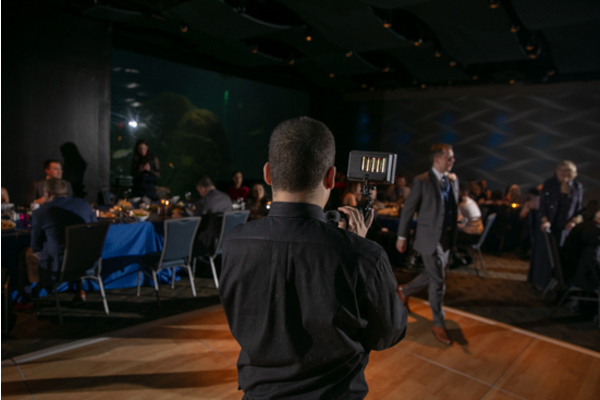 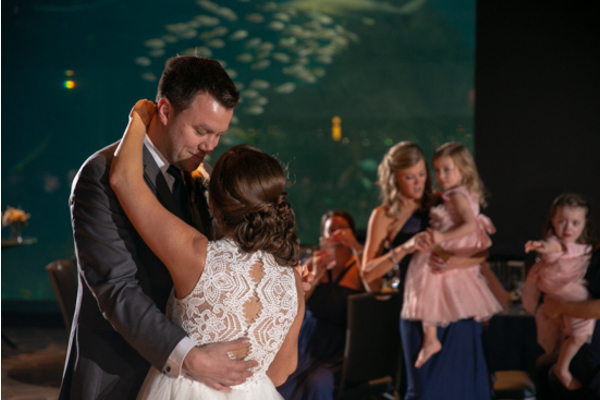 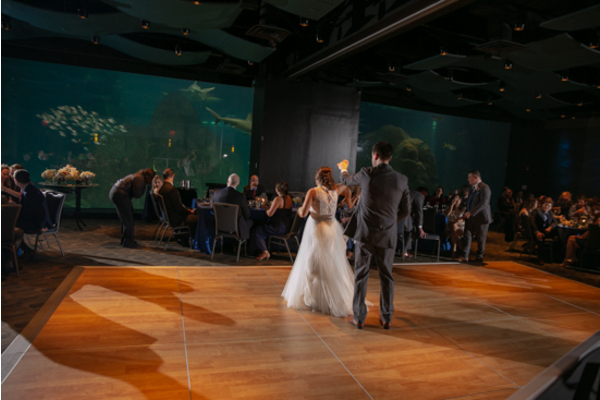 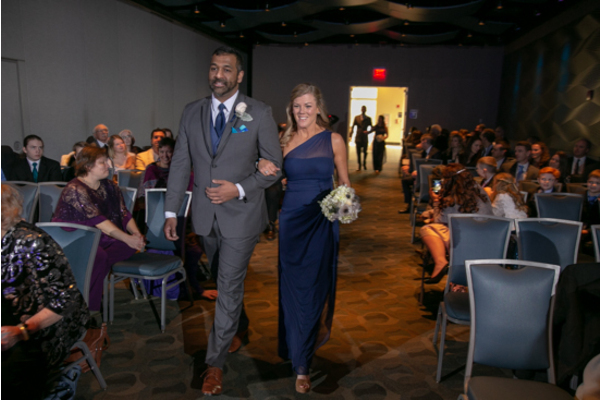 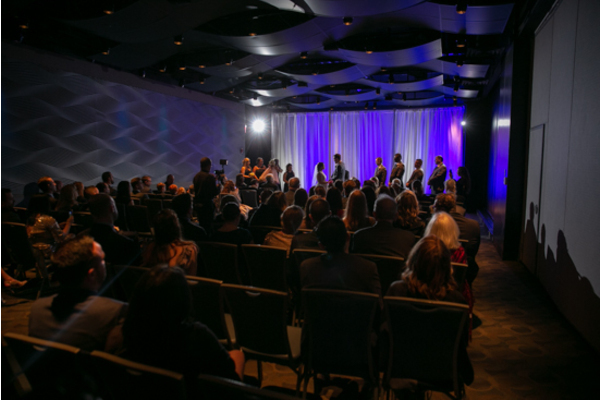 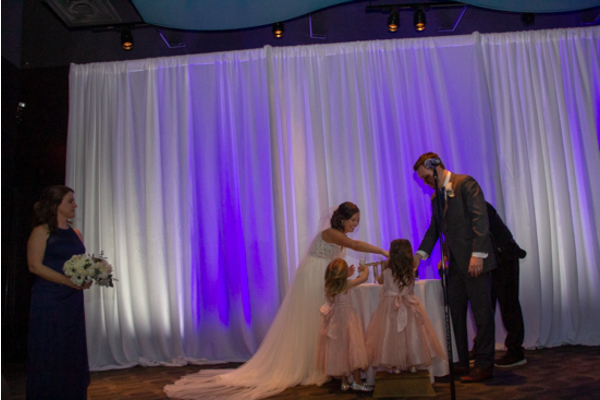 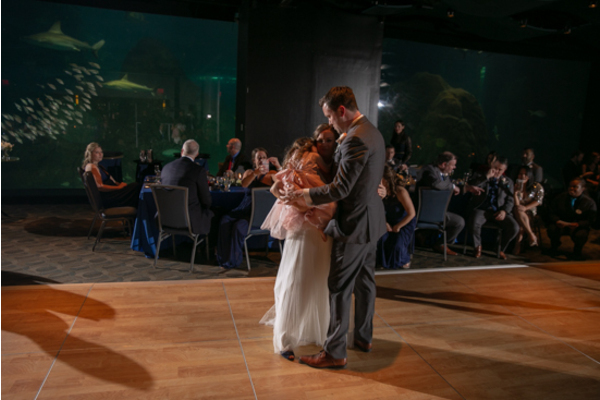 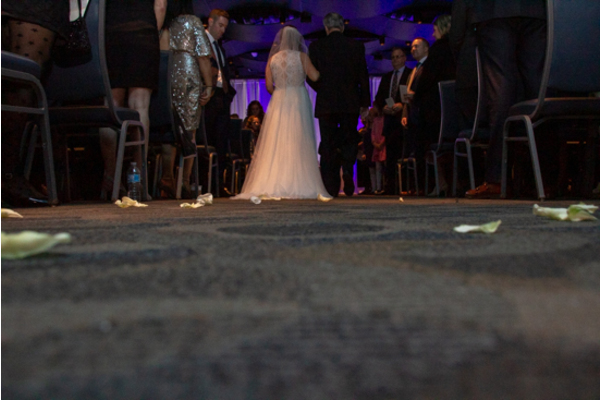 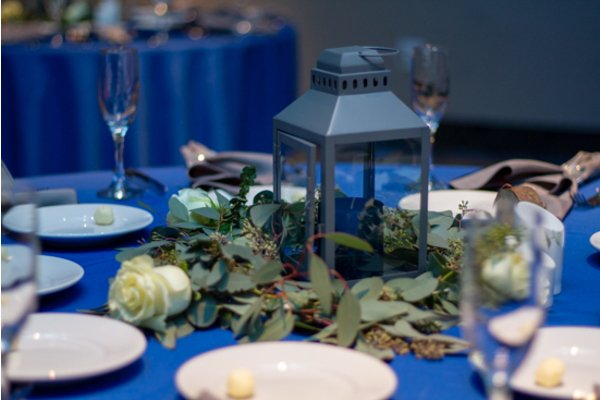 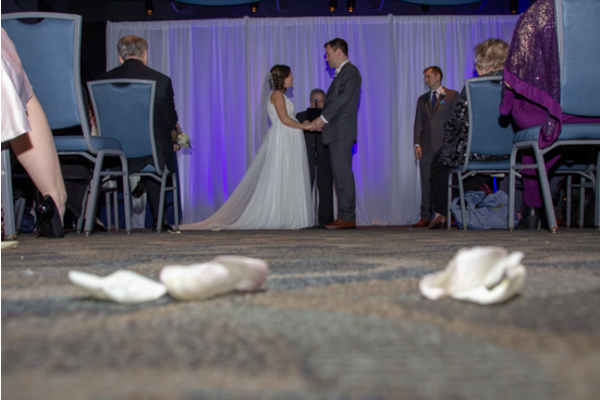 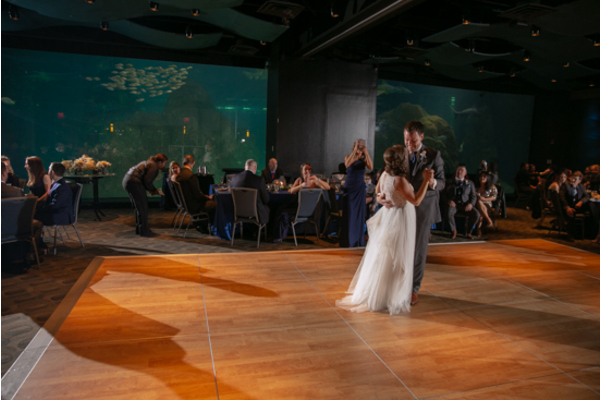 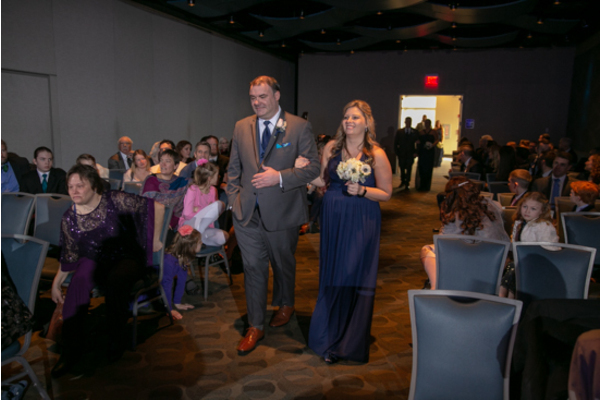 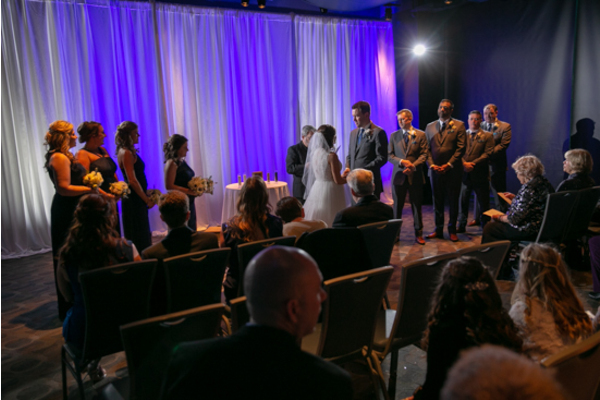 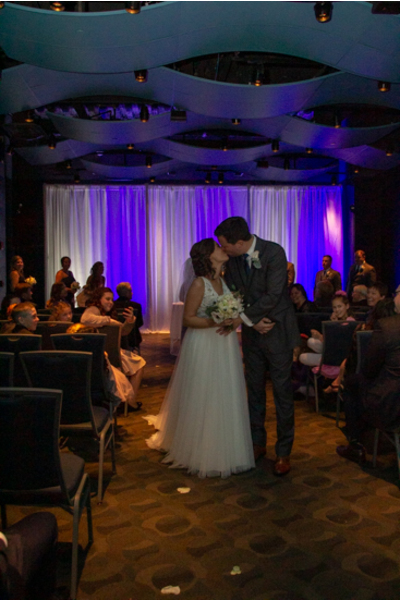 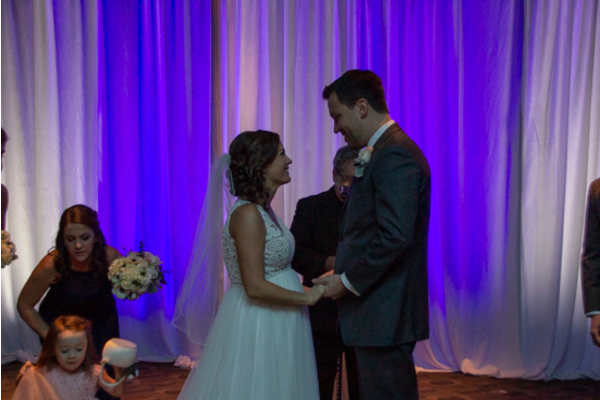 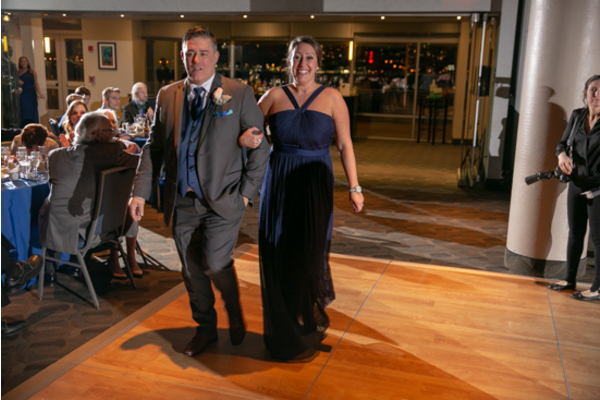 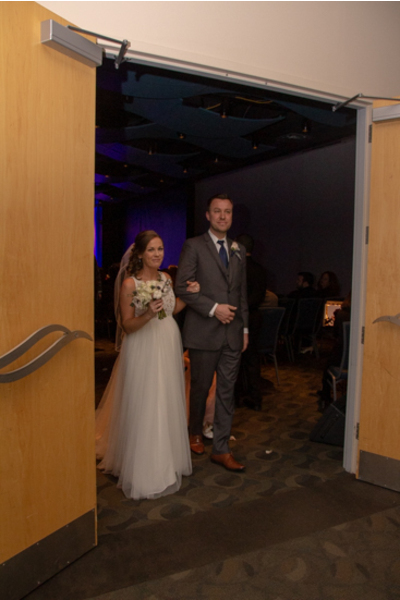 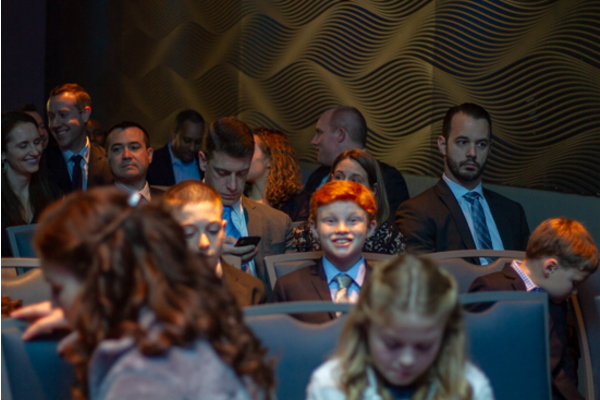 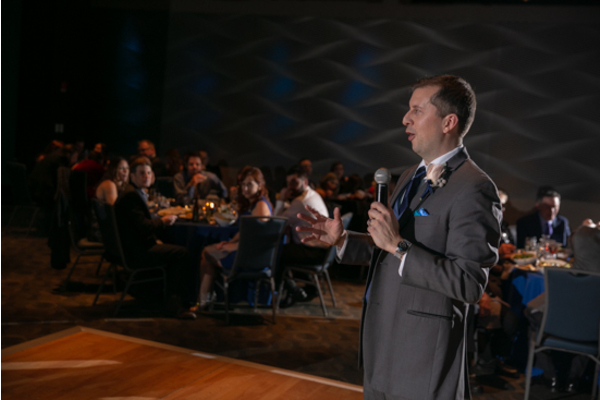 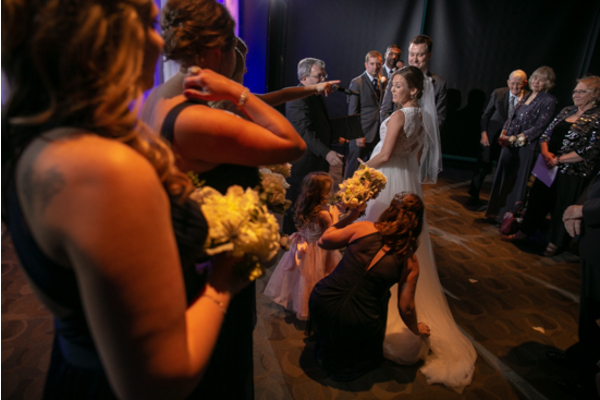 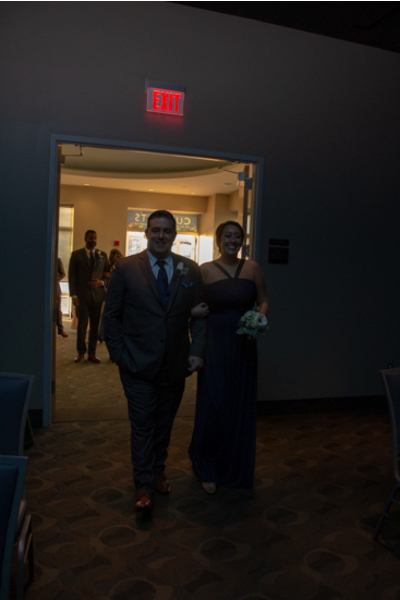 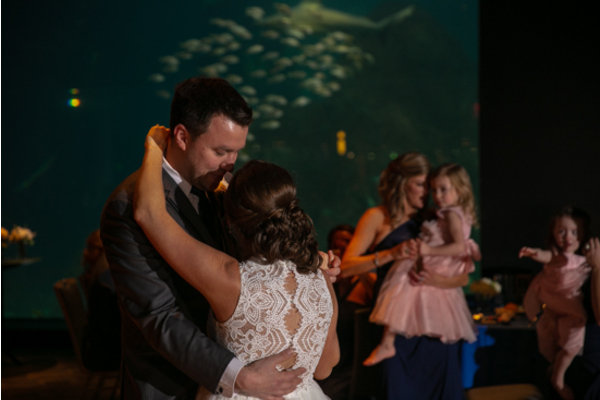 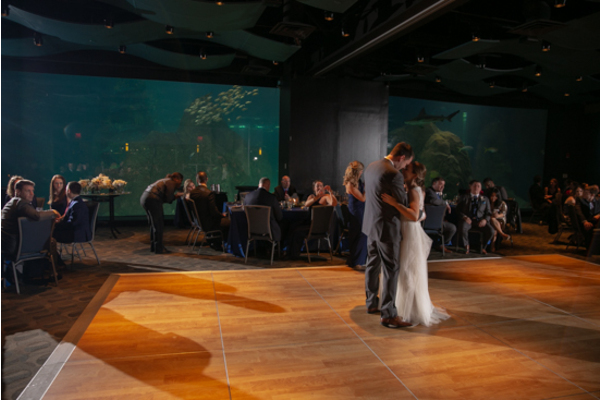 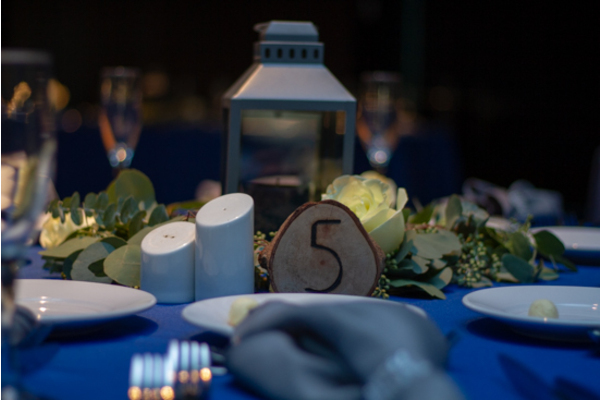 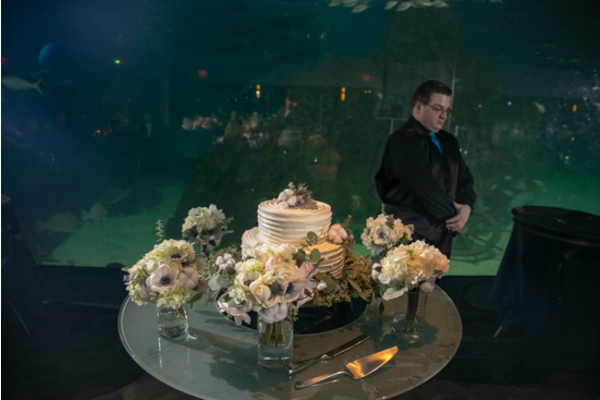 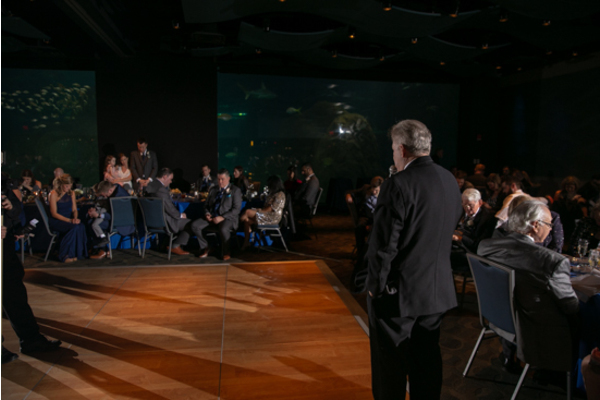 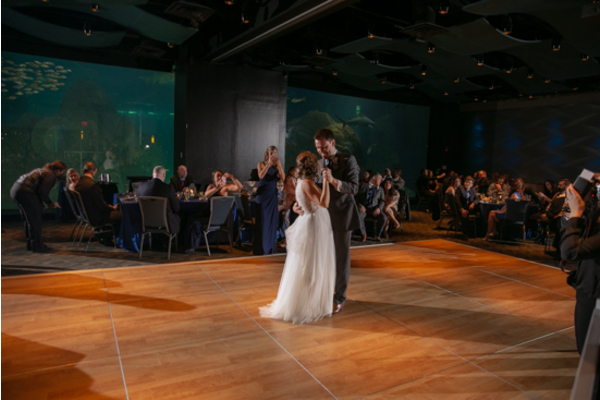 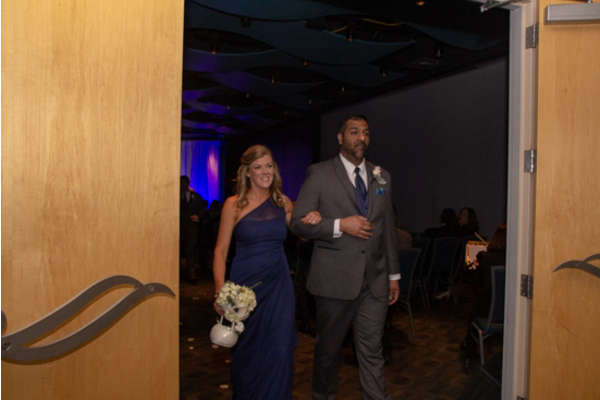 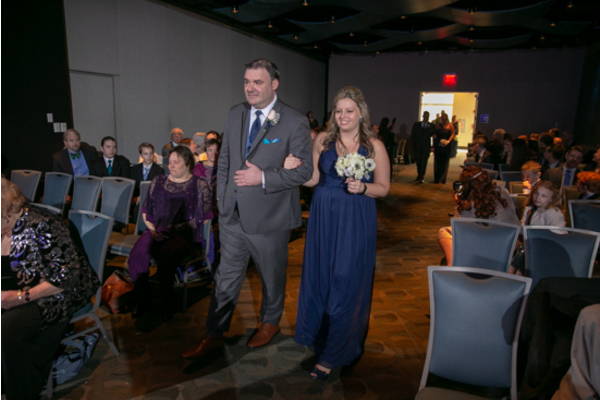 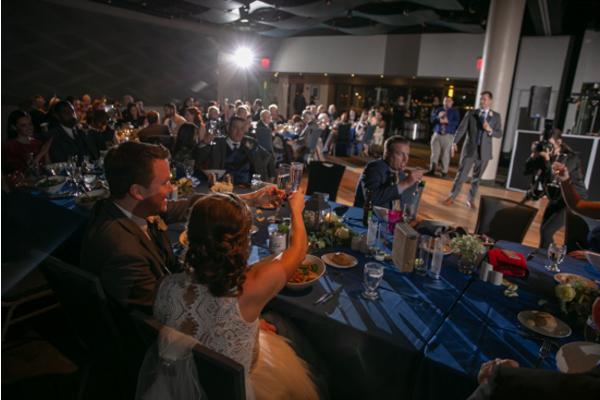 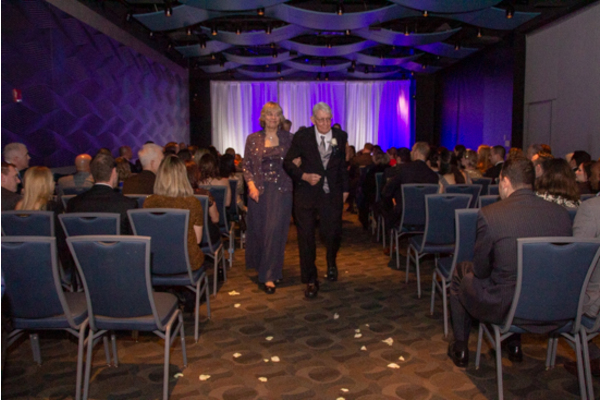 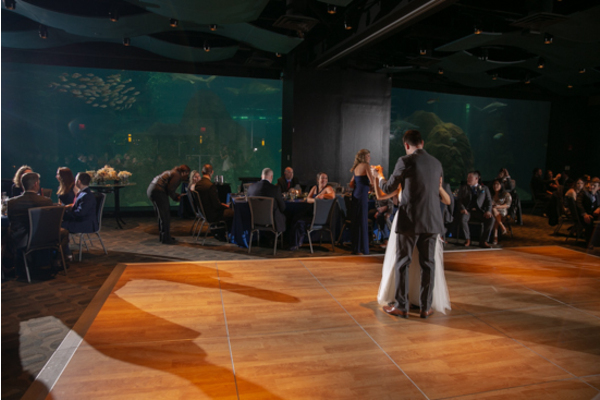 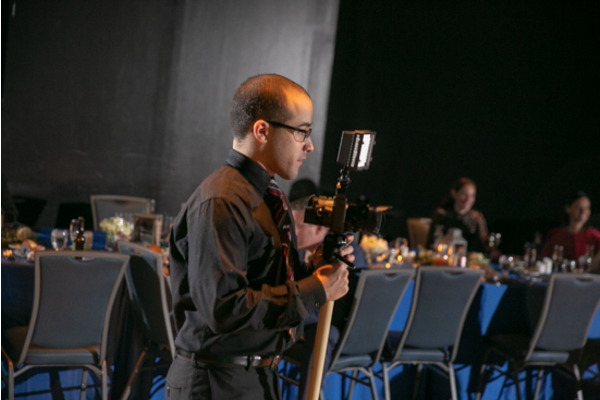 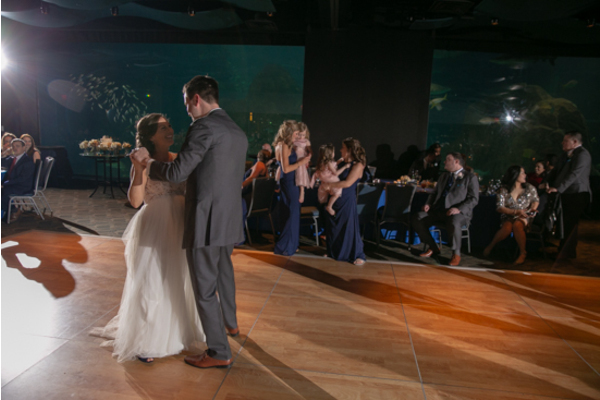 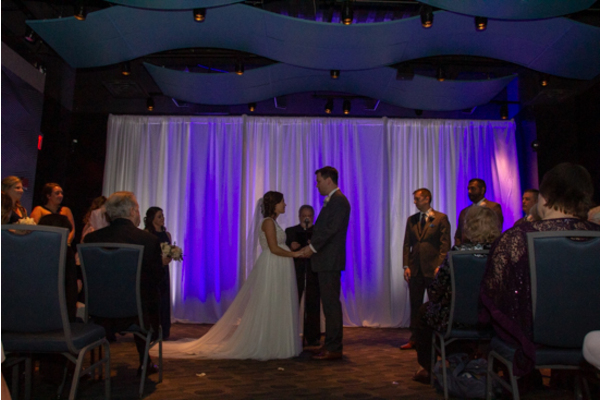 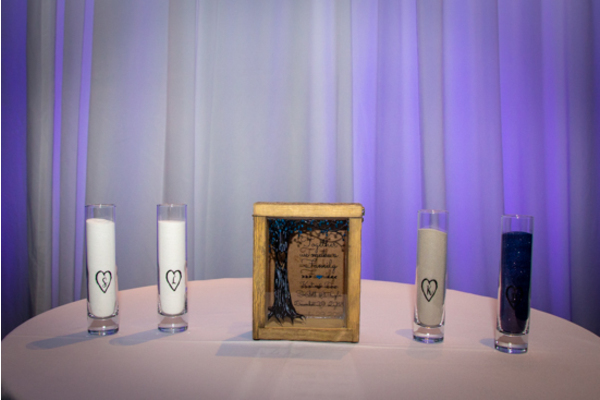 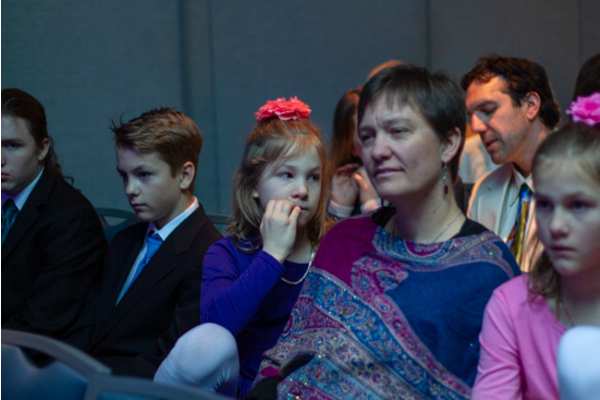 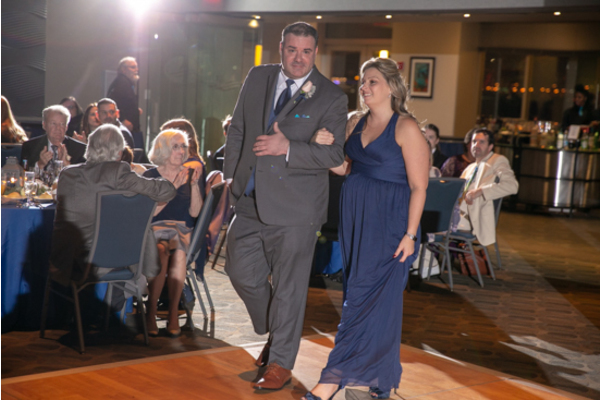 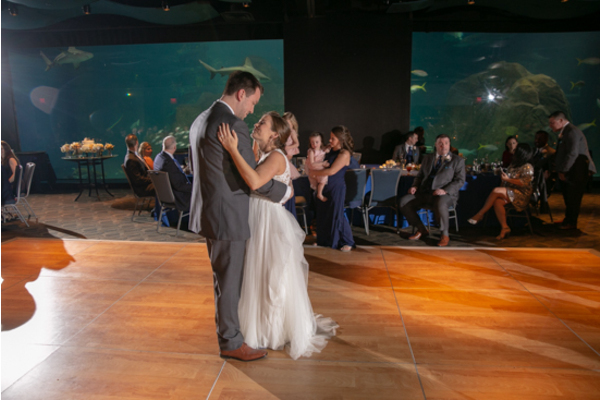 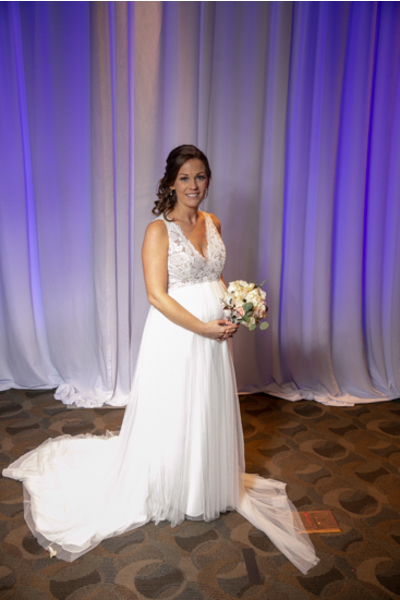 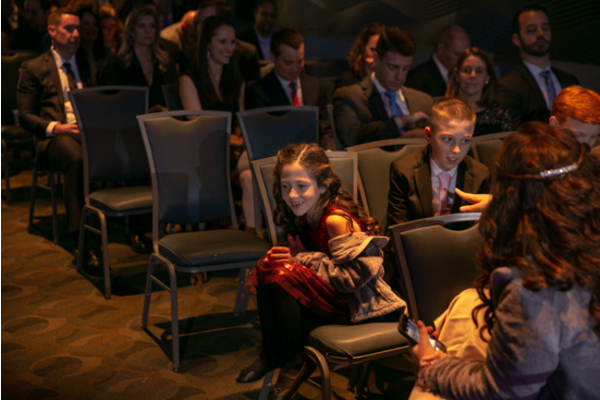 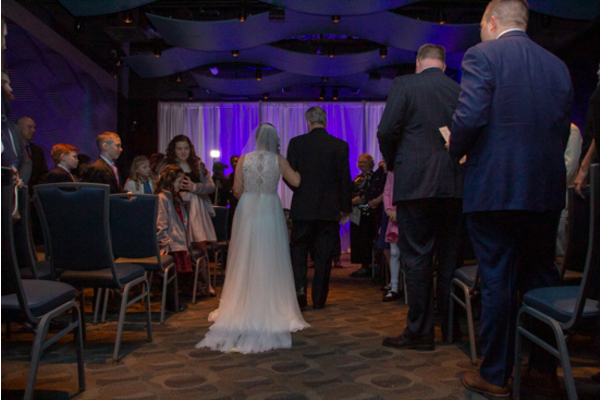 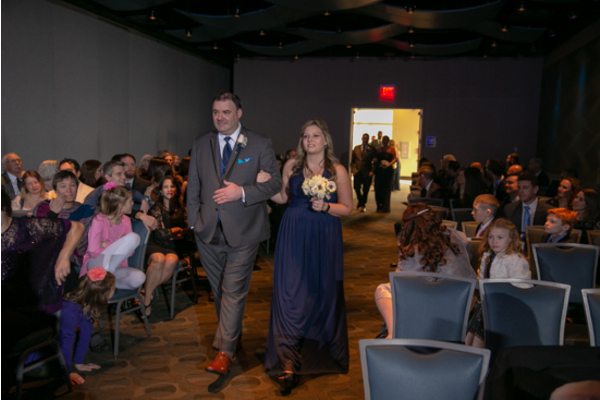 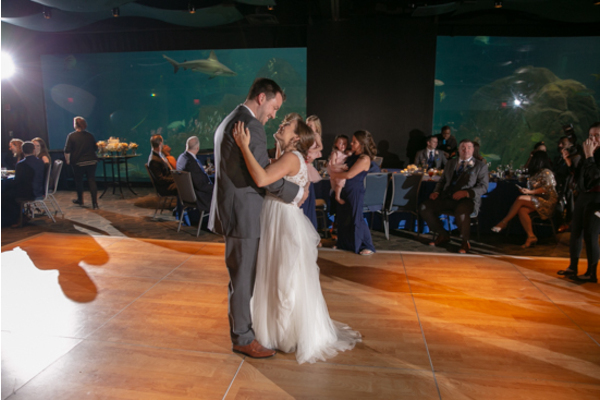 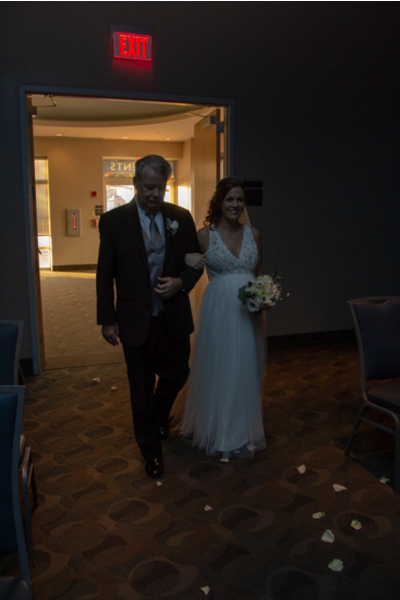 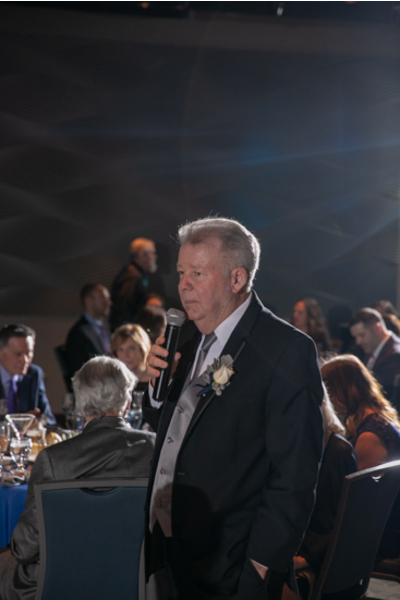 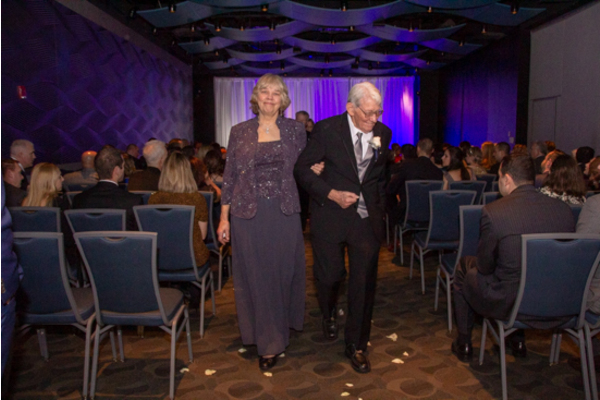 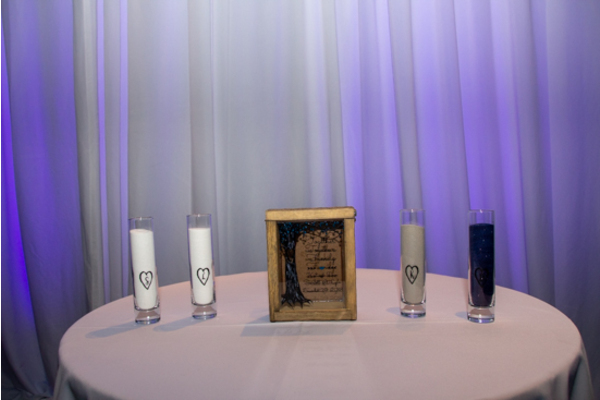 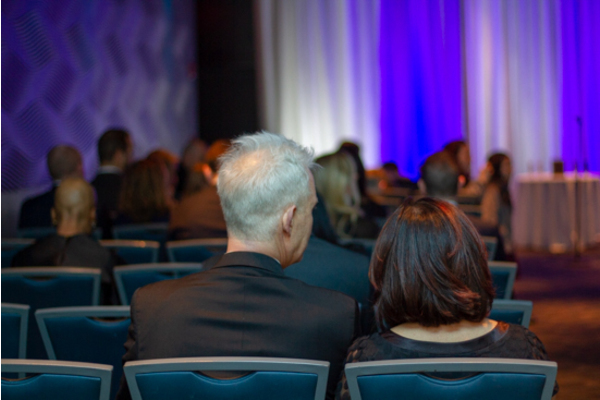 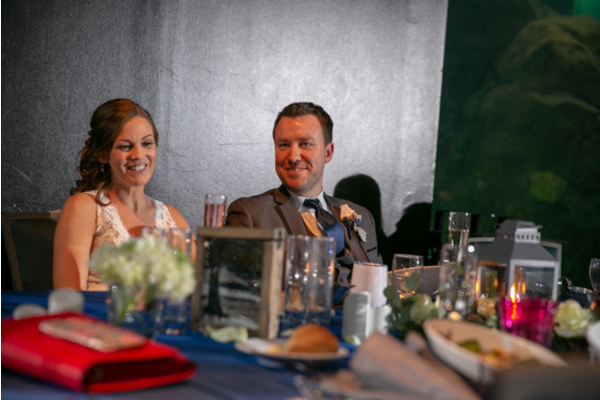 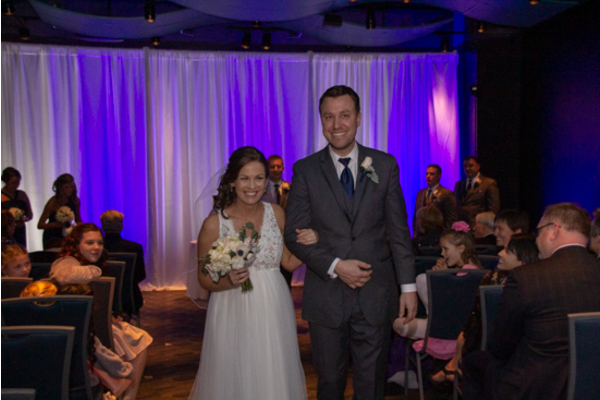 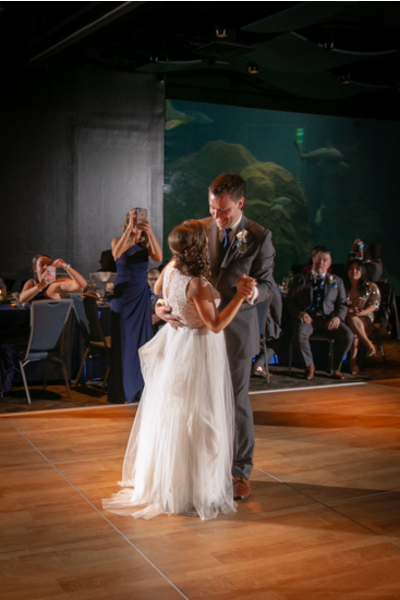 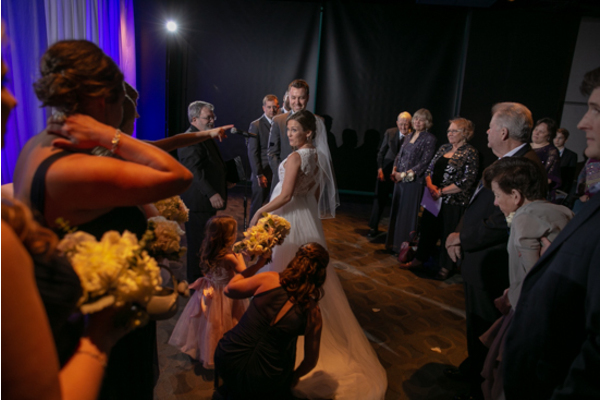 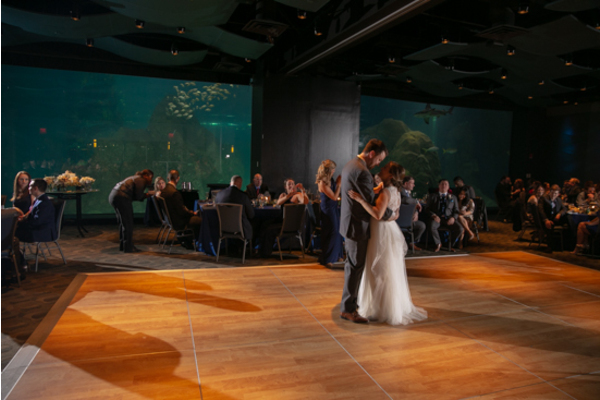 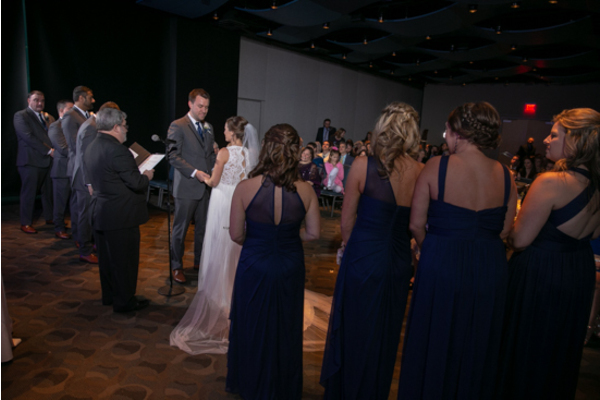 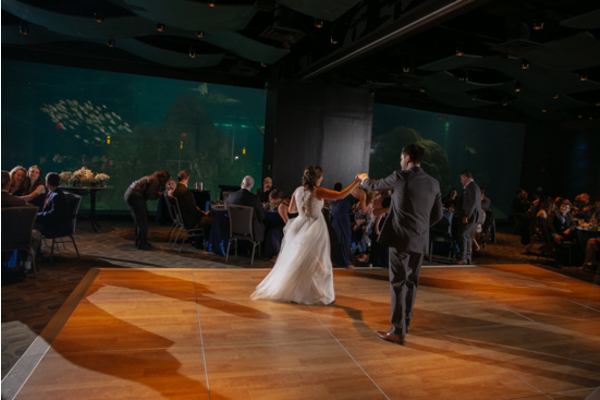 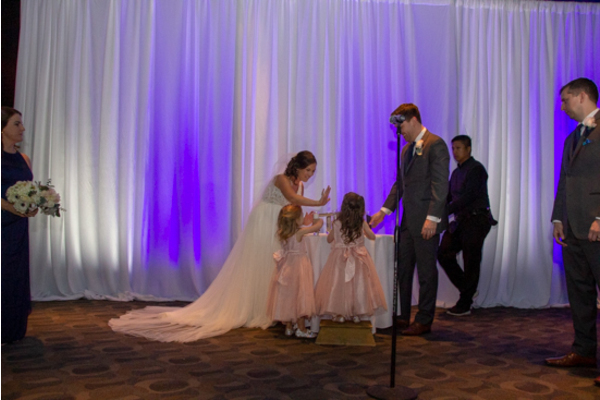 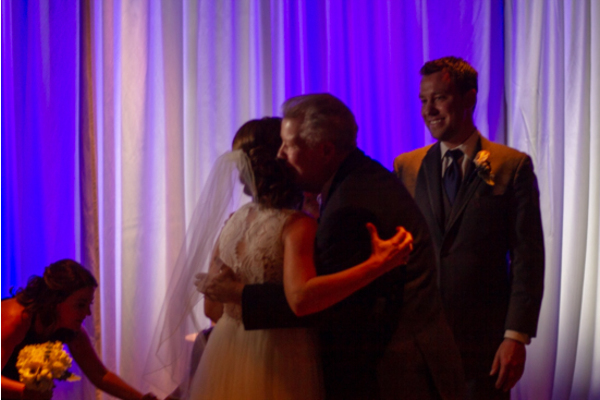 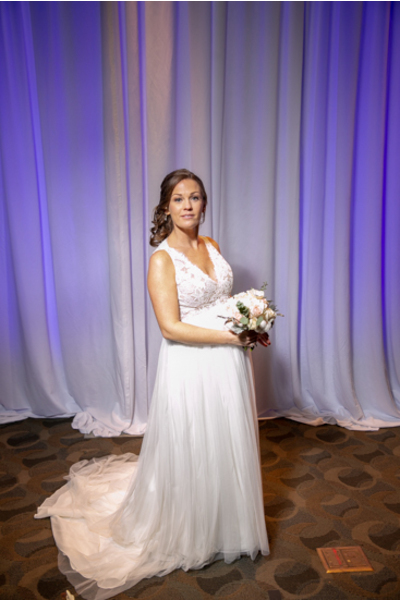 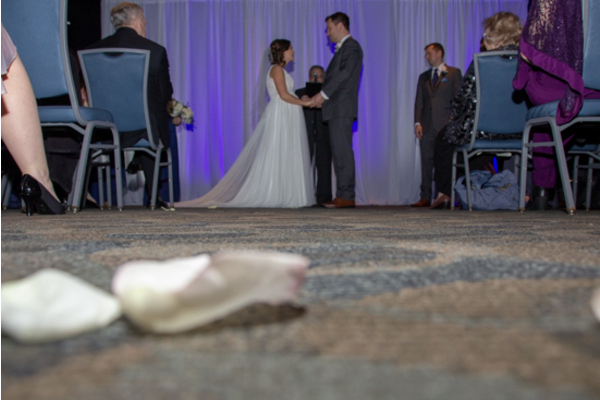 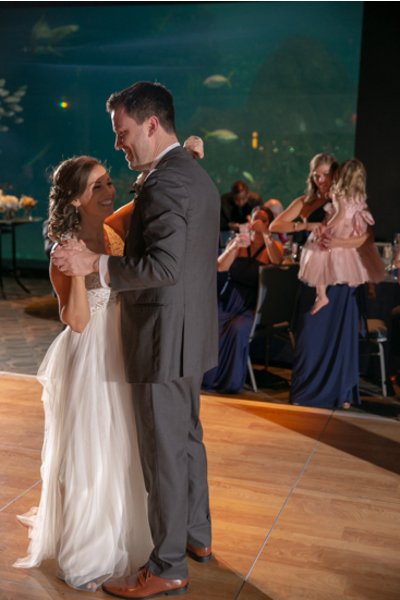 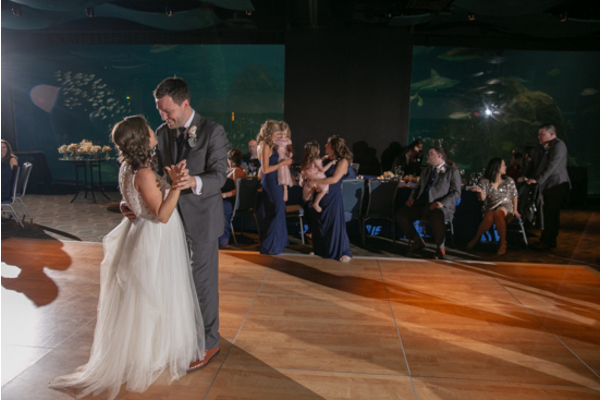 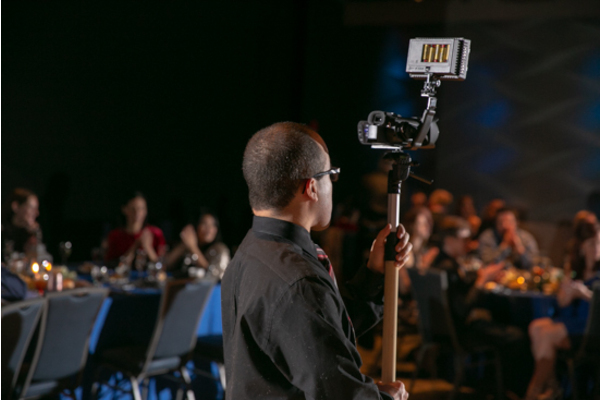 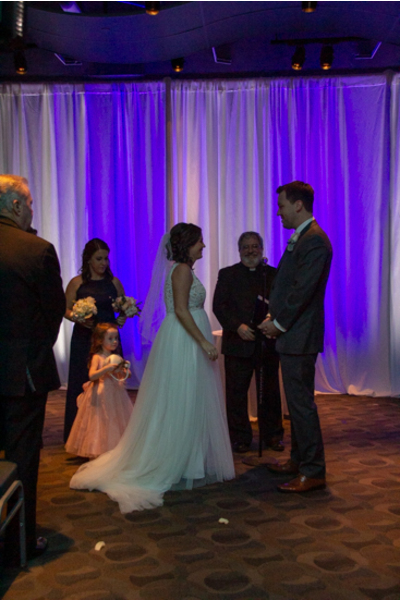 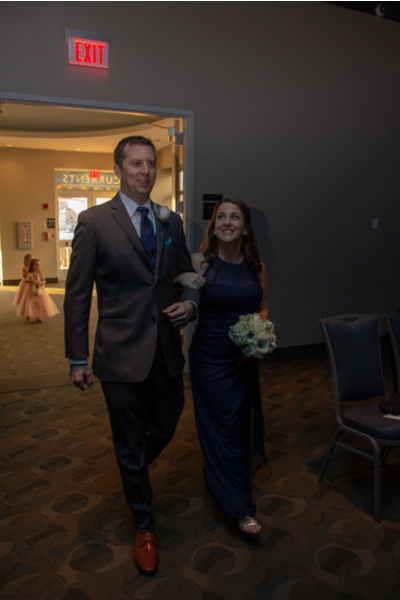 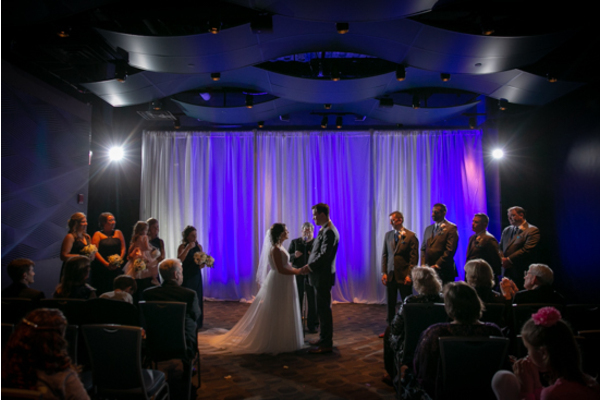 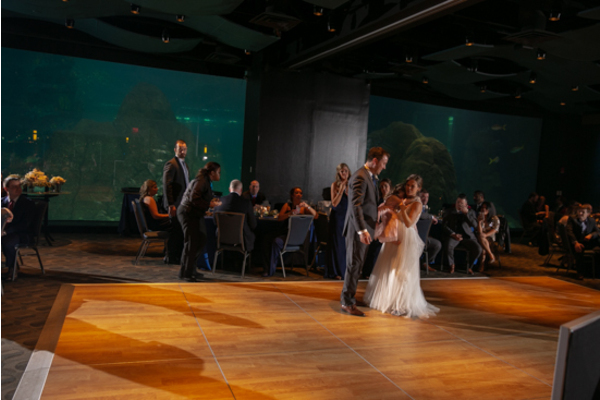 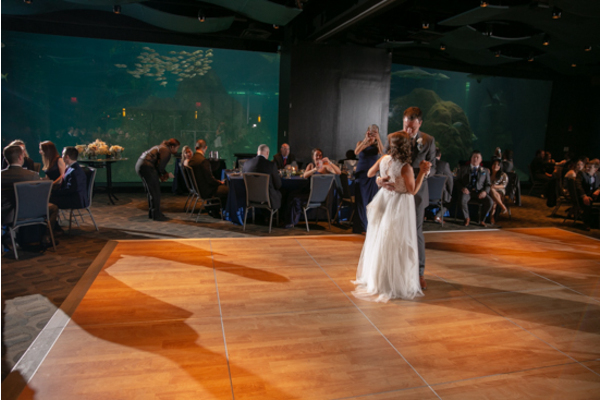 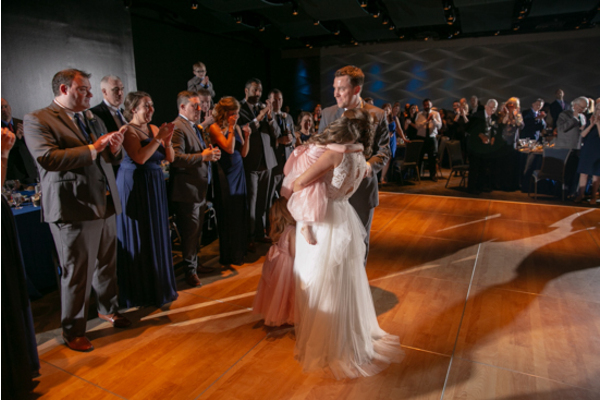 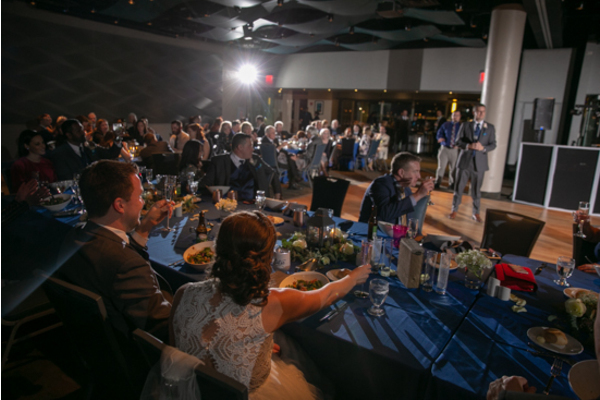 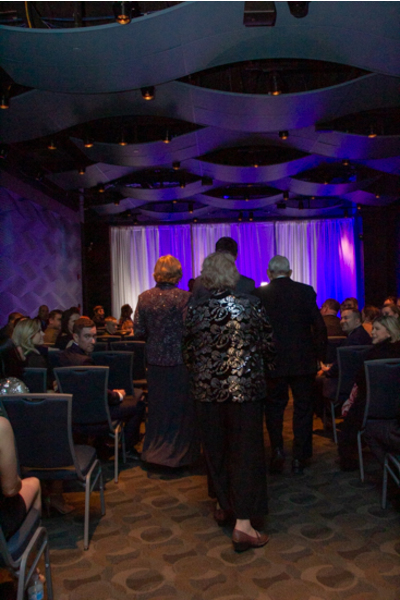 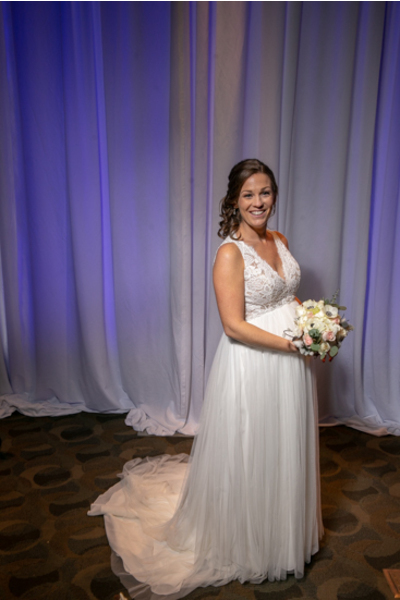 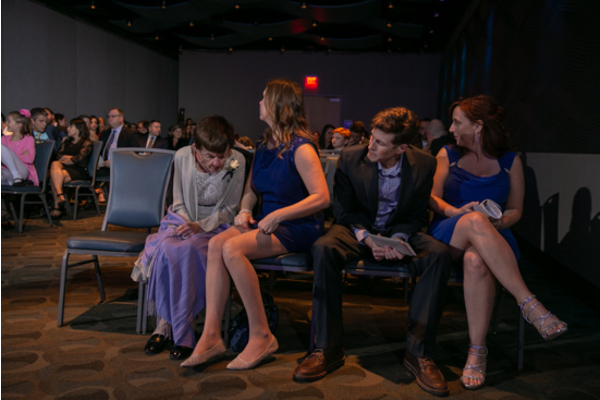 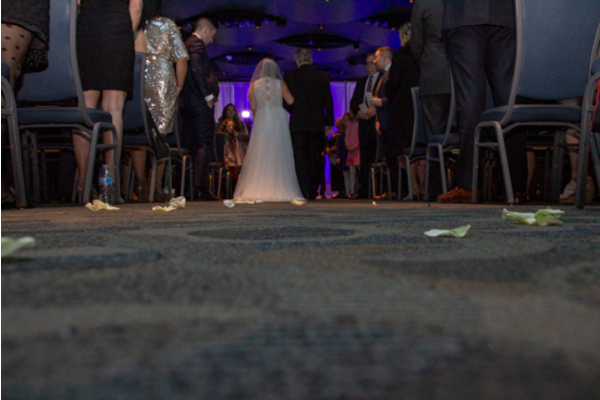 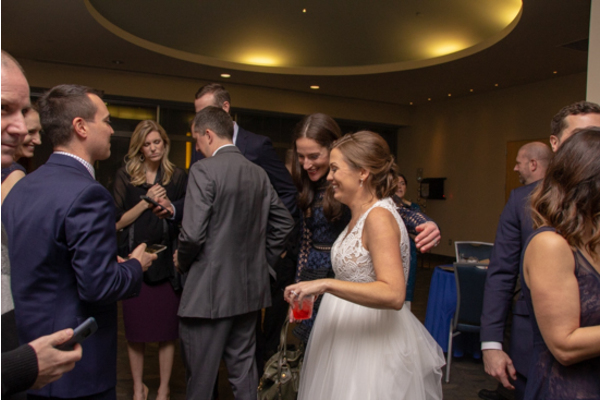 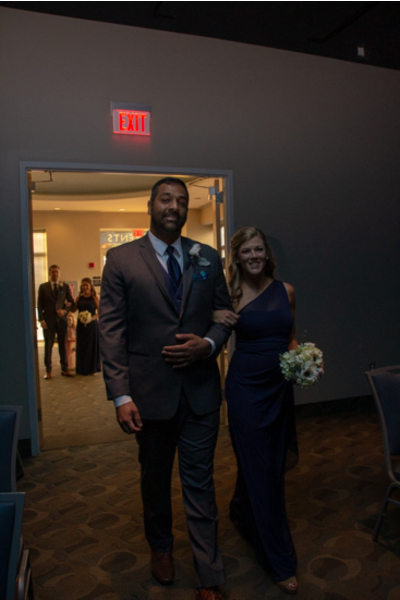 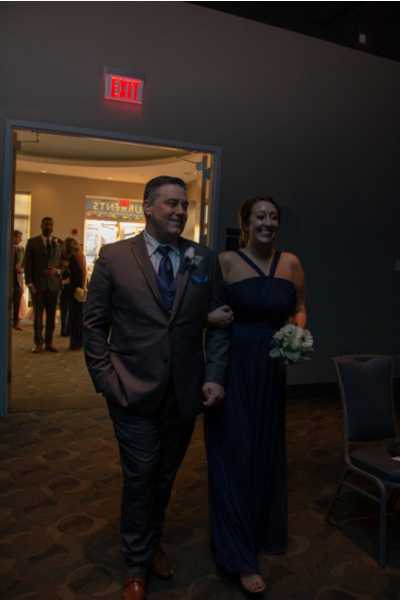 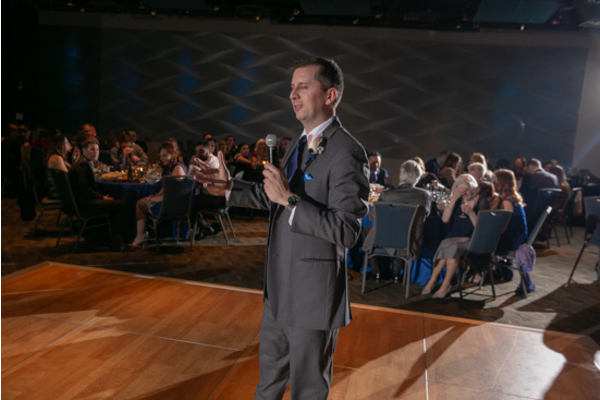 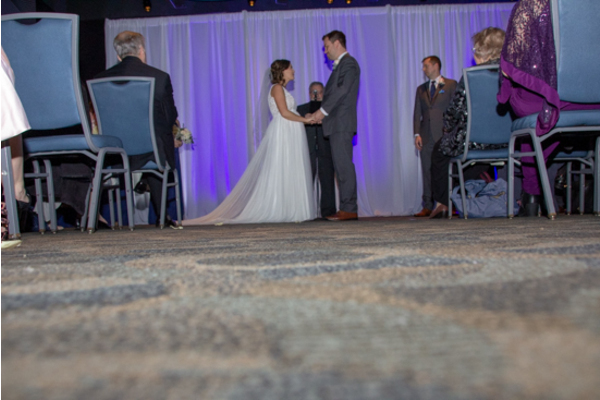 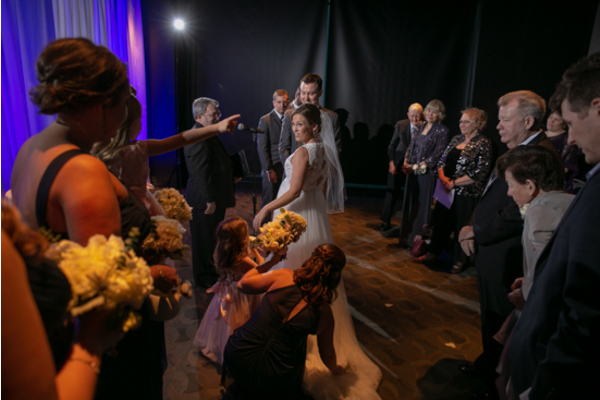 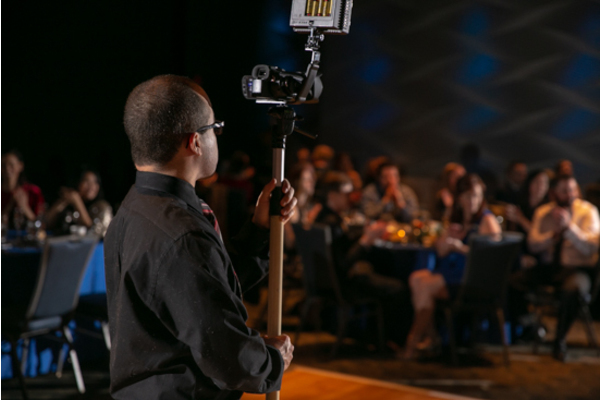 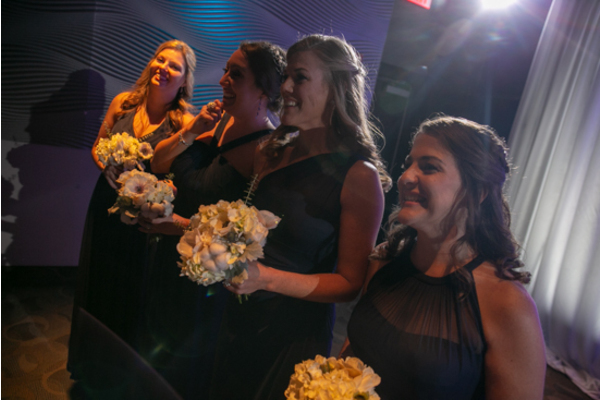 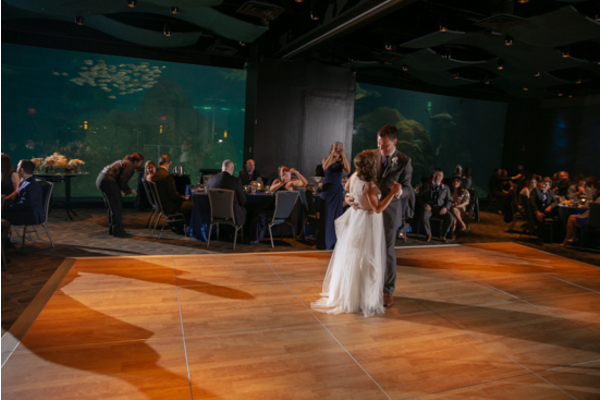 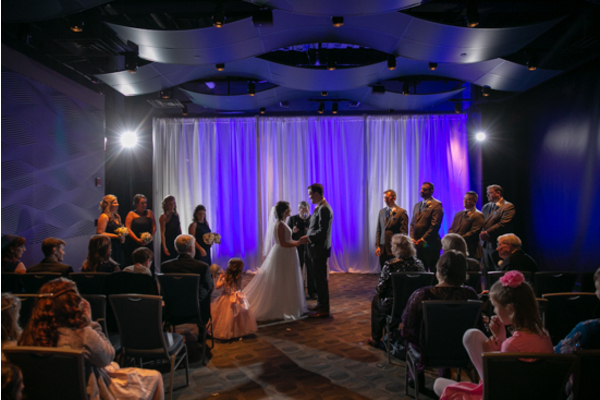 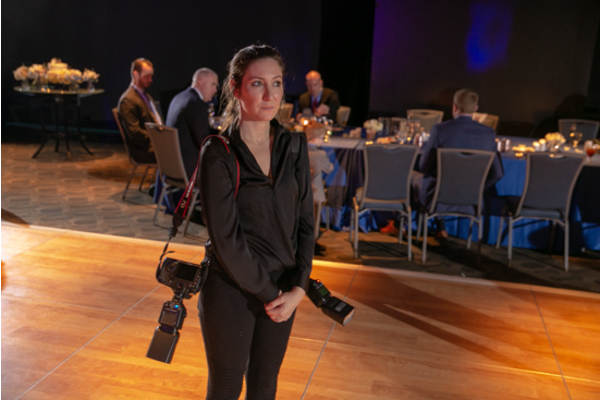 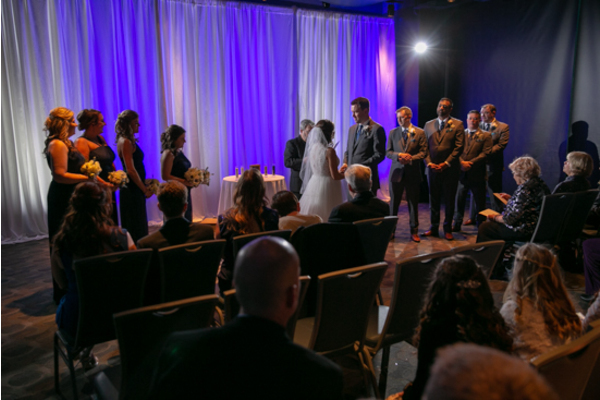 Later, the ceremony room was decorated with beautiful blue ambient lighting, which went perfectly with the aquarium theme. 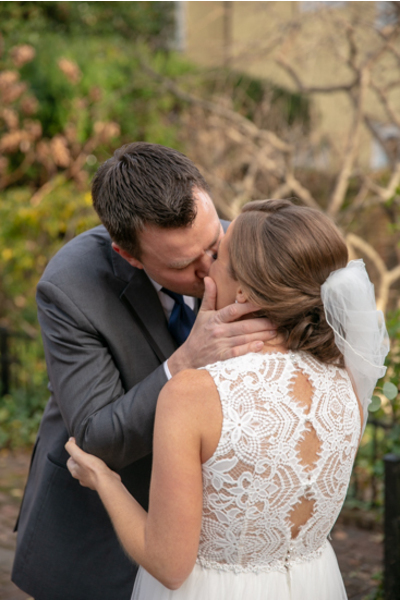 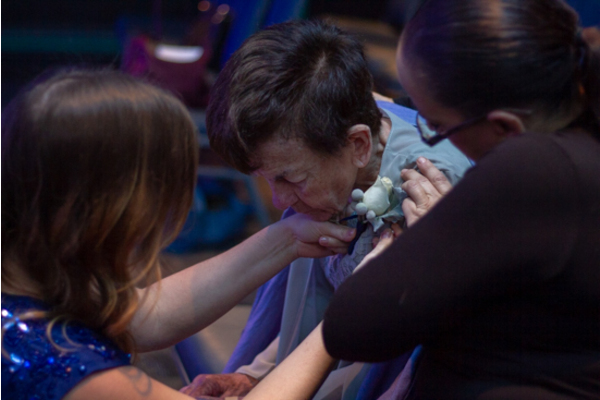 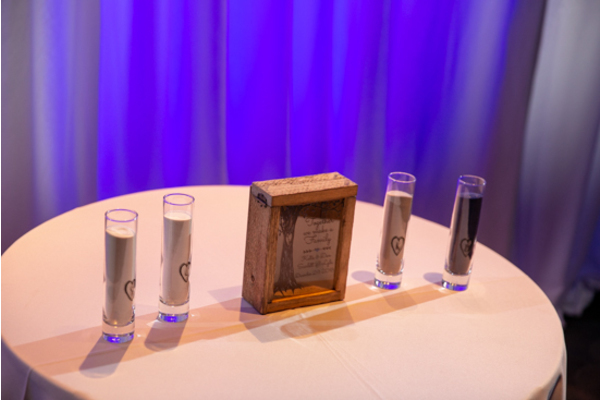 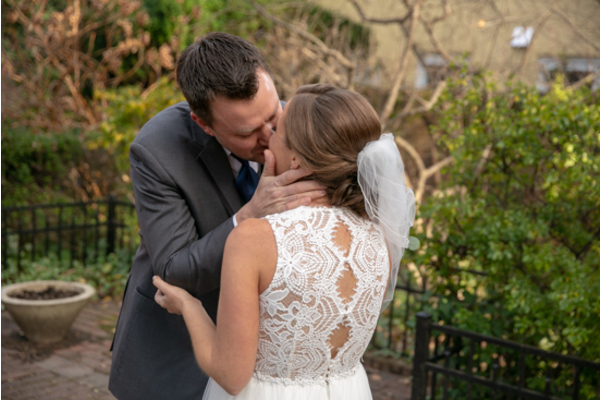 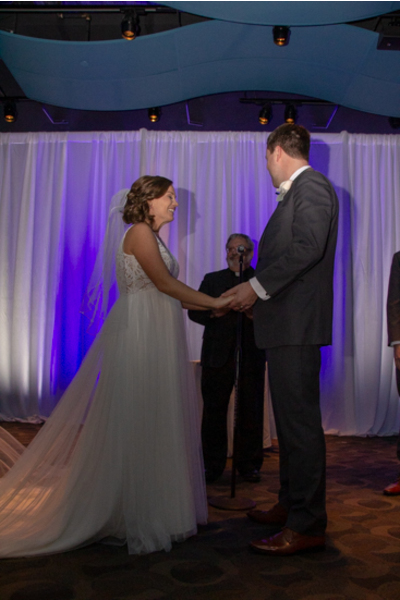 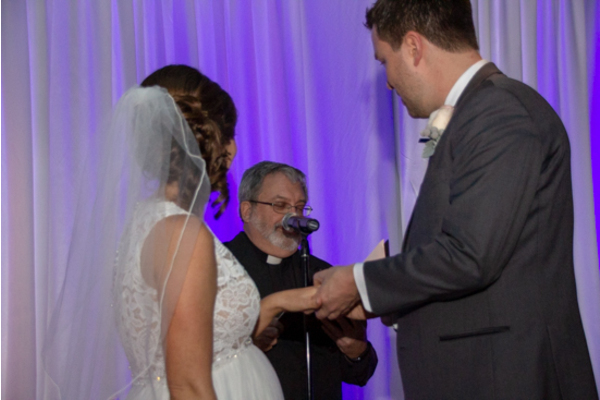 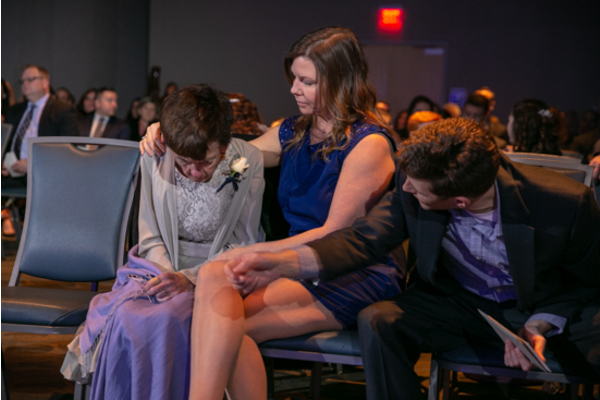 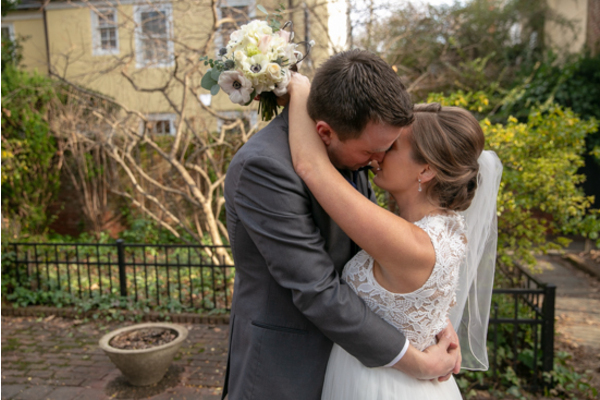 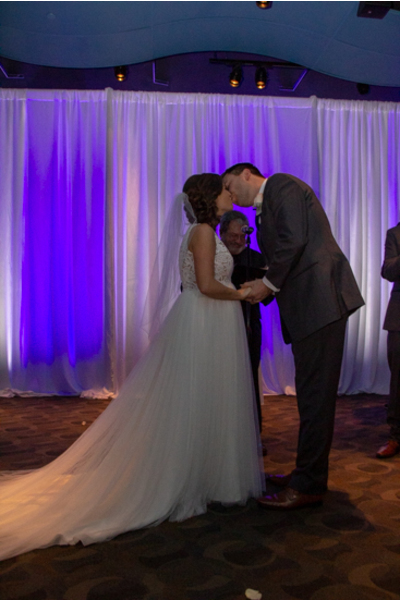 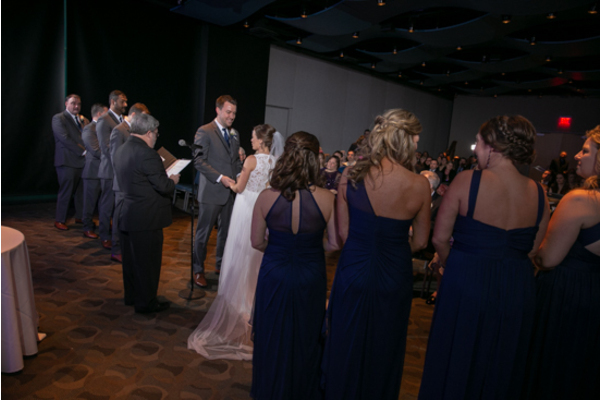 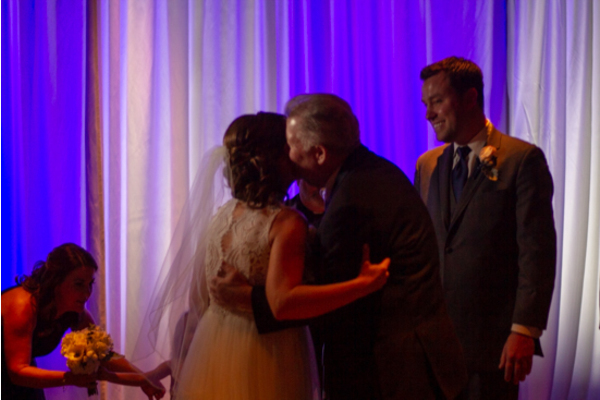 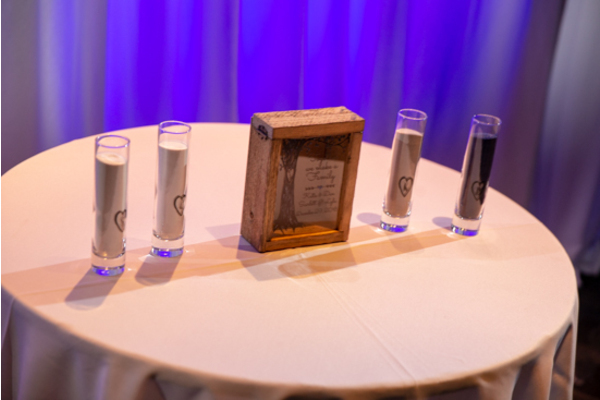 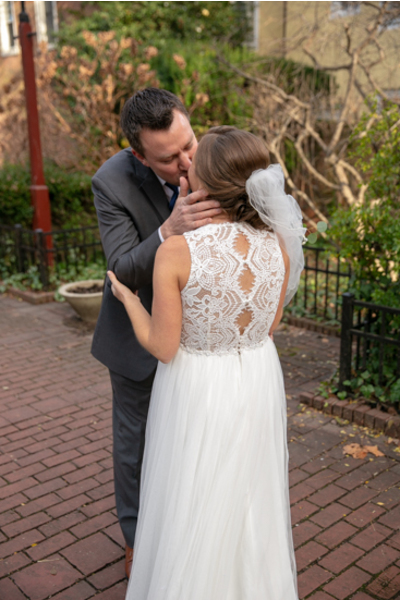 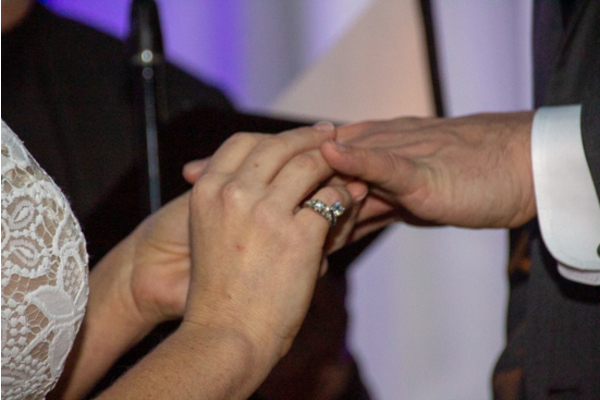 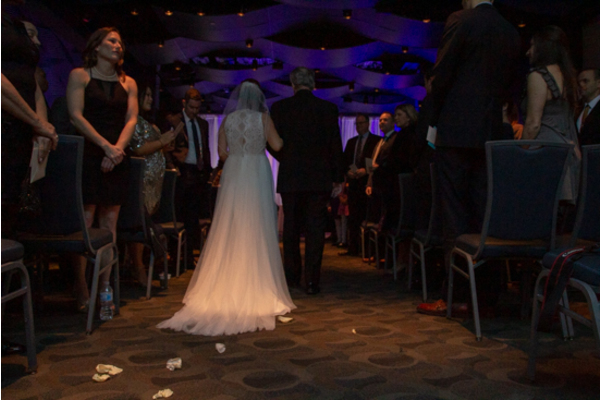 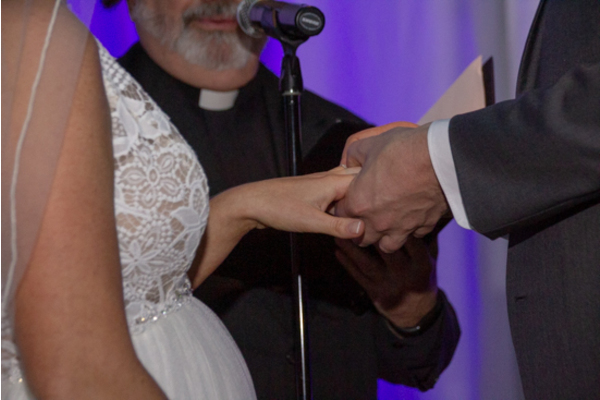 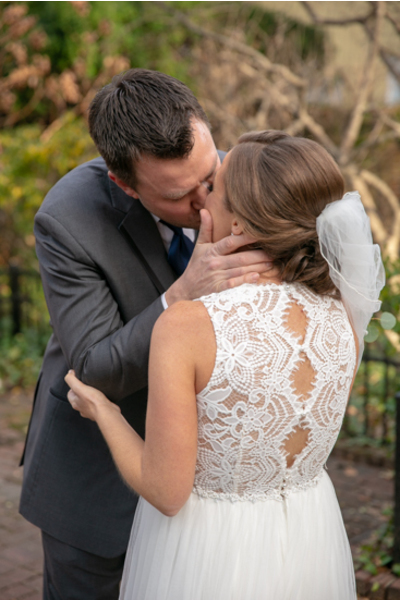 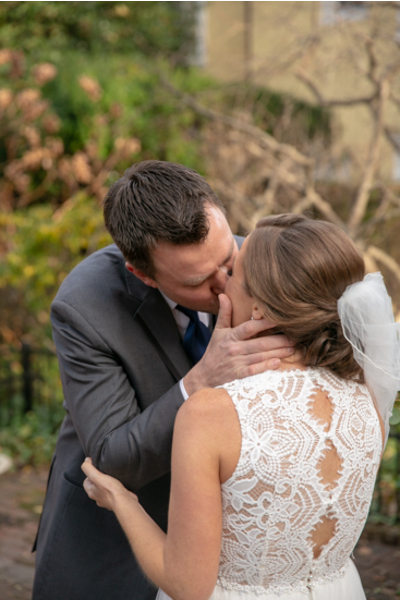 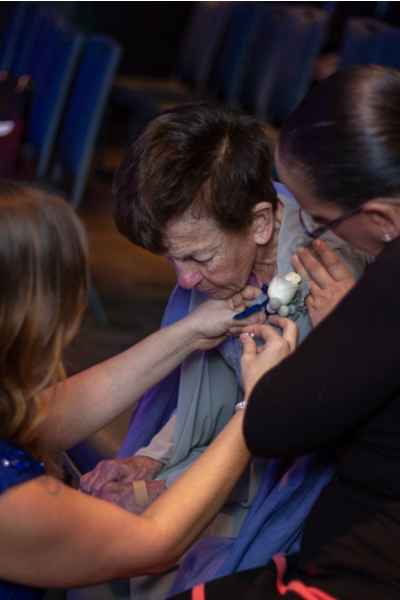 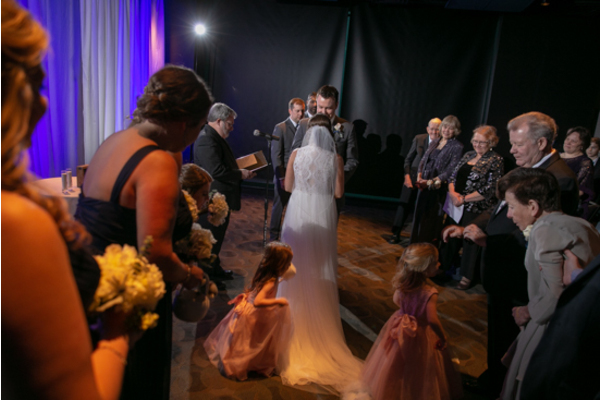 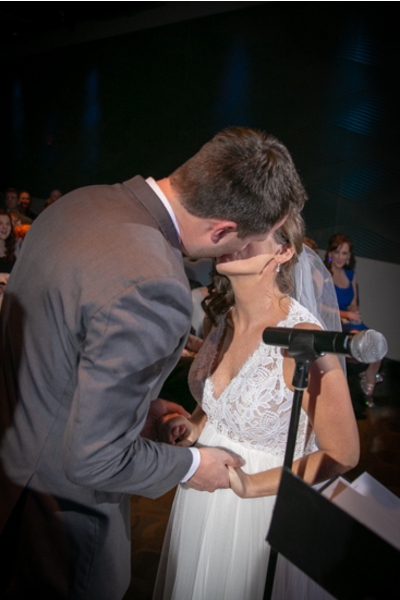 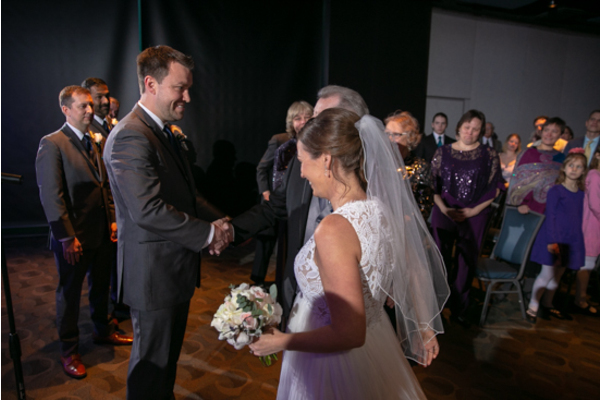 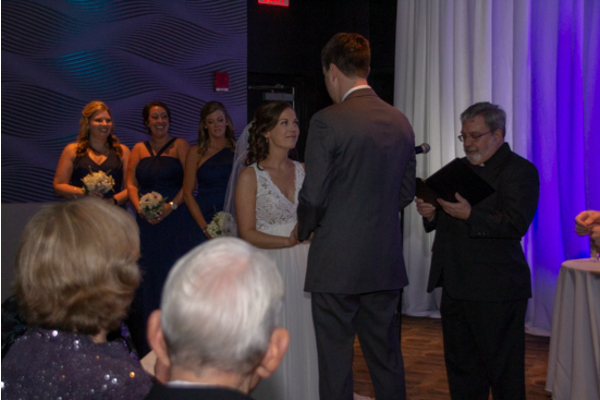 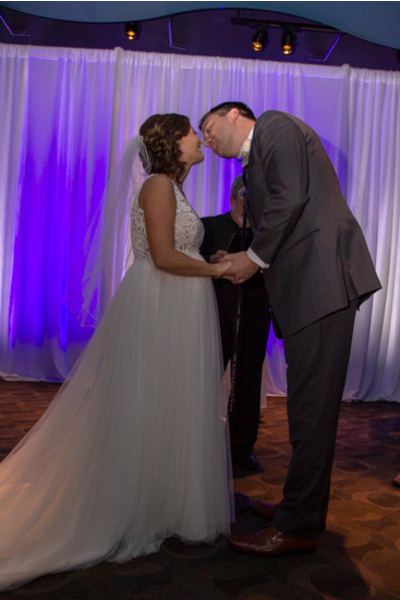 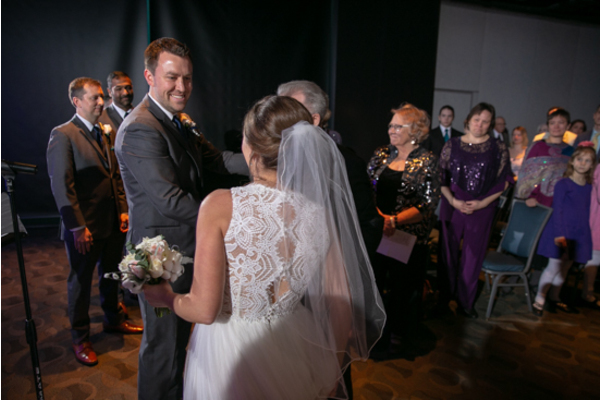 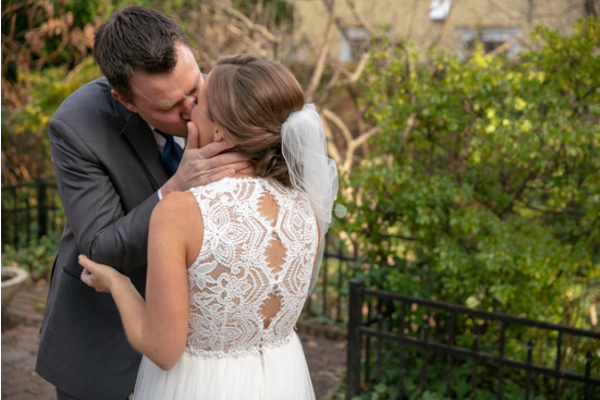 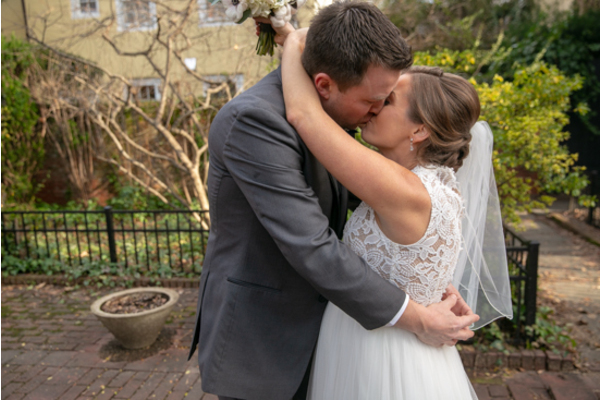 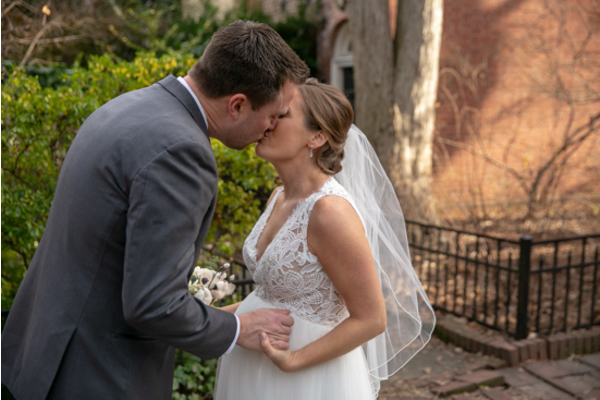 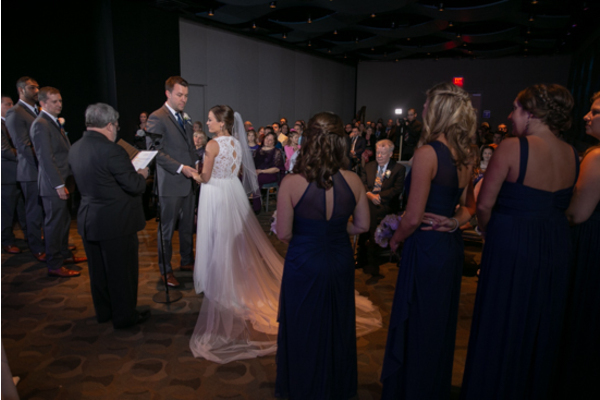 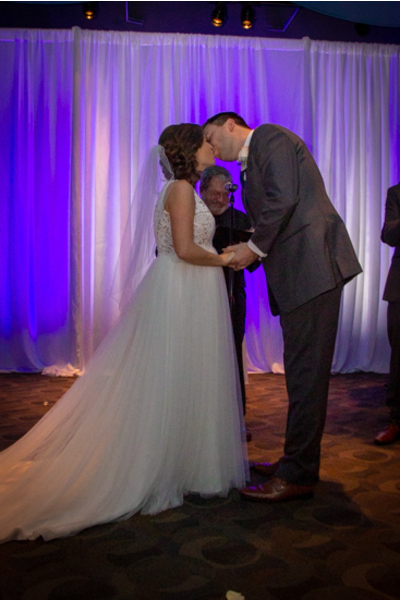 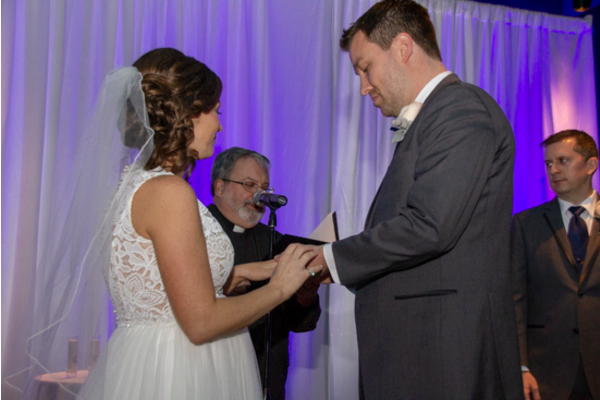 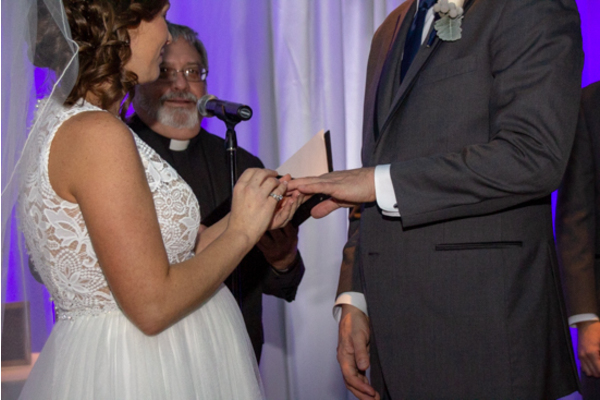 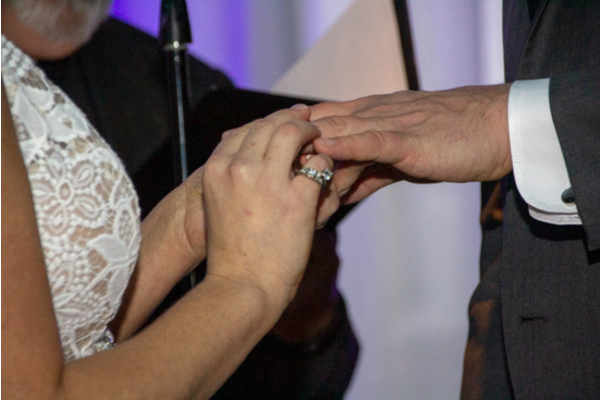 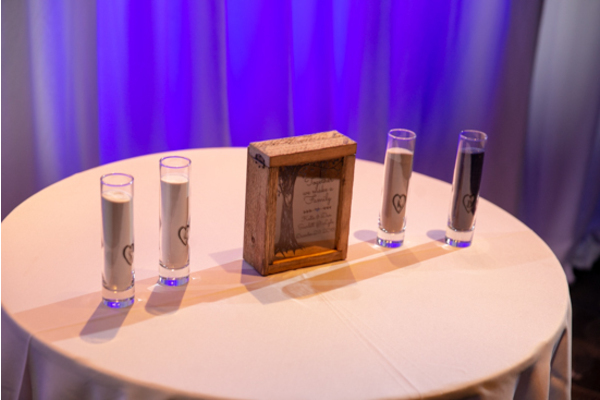 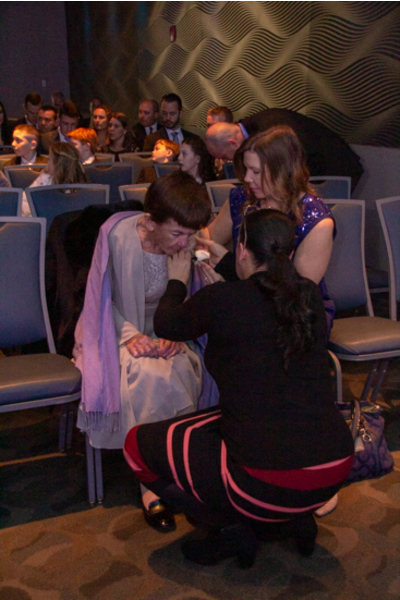 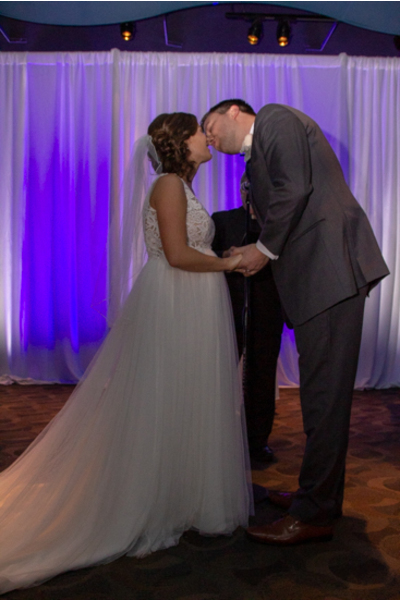 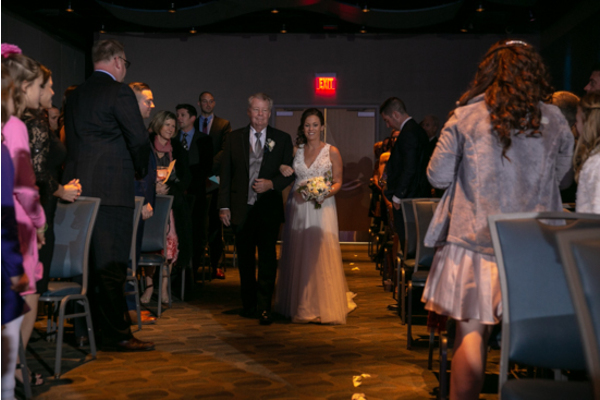 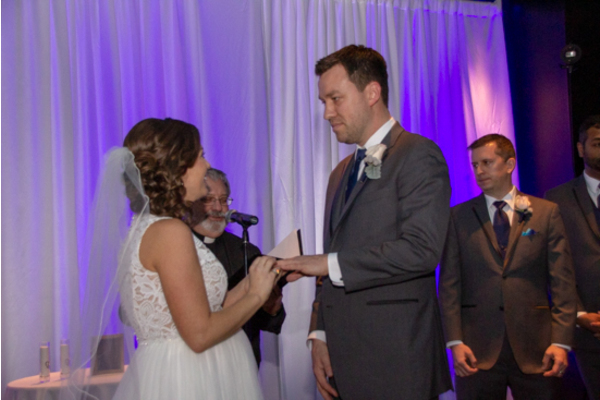 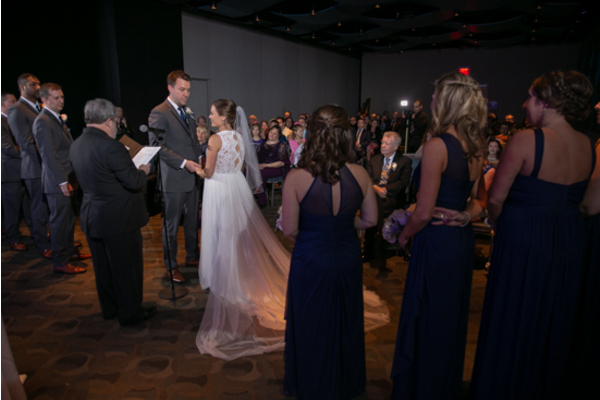 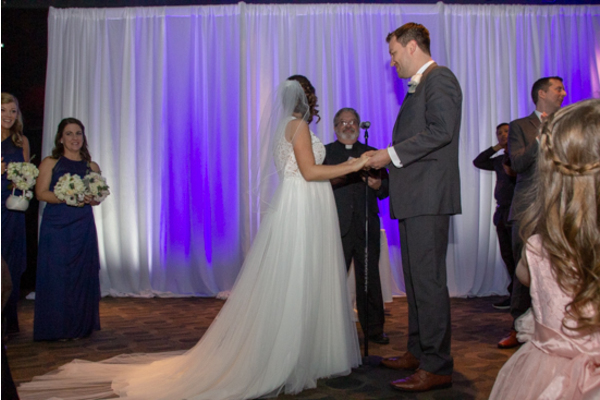 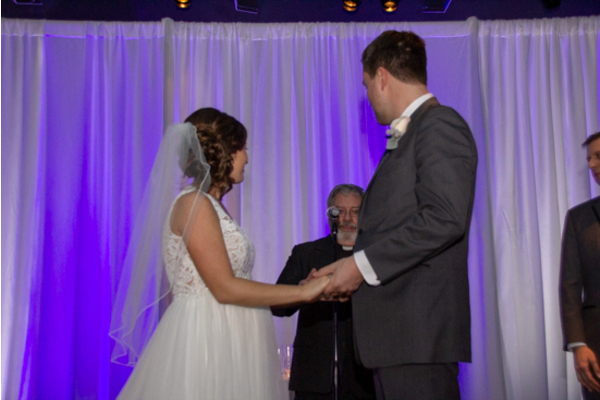 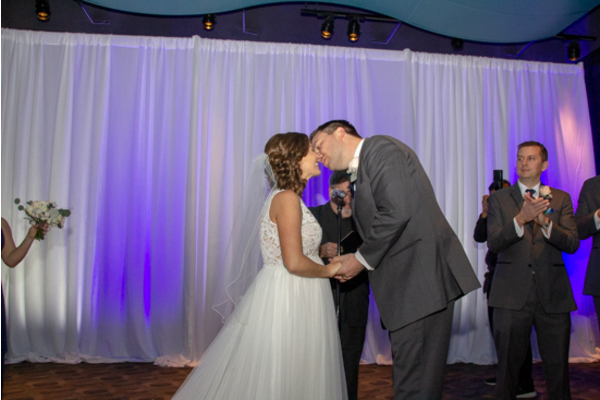 The couple exchanged their vows, sealed the deal with a special kiss. 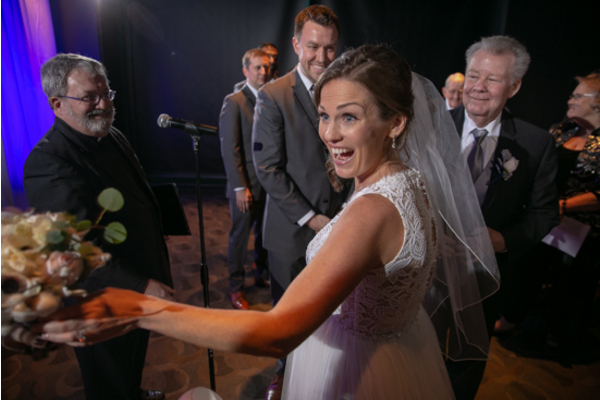 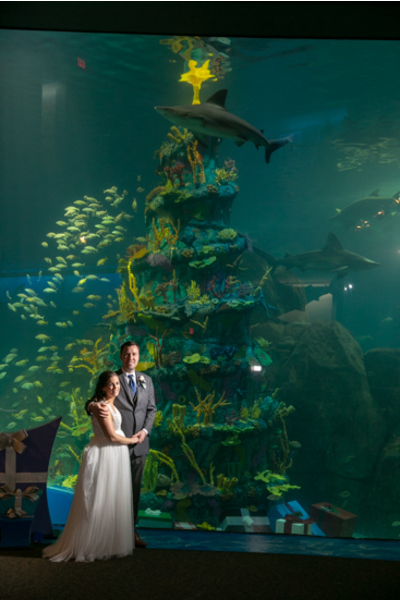 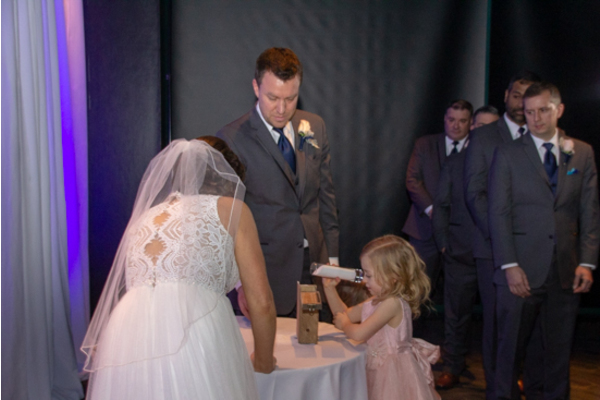 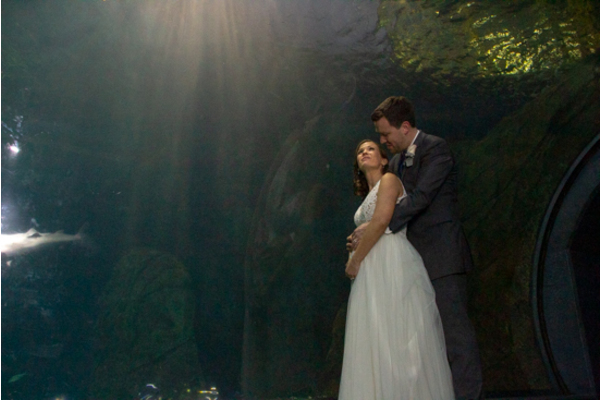 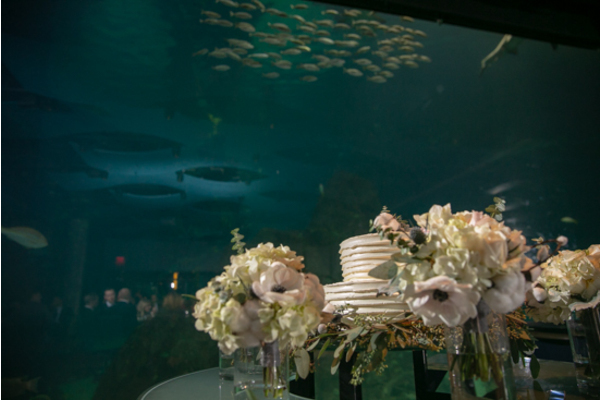 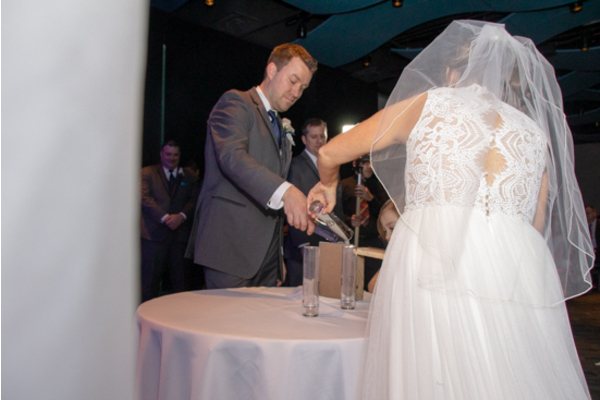 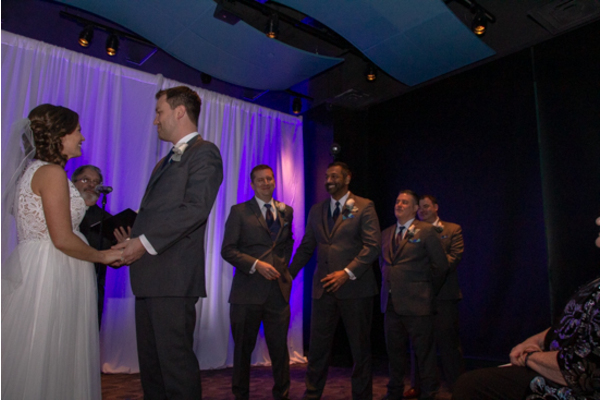 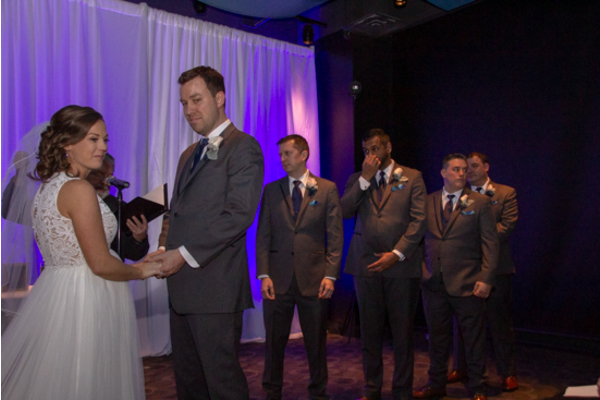 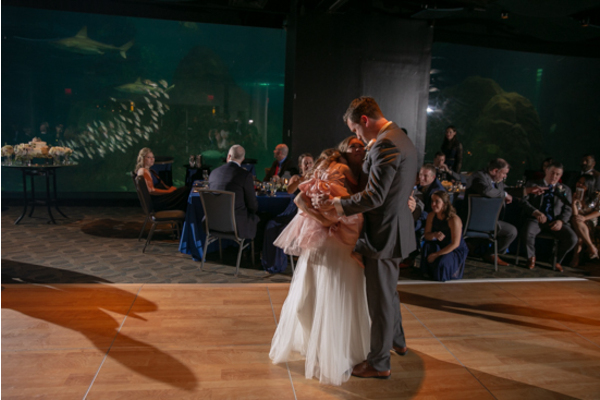 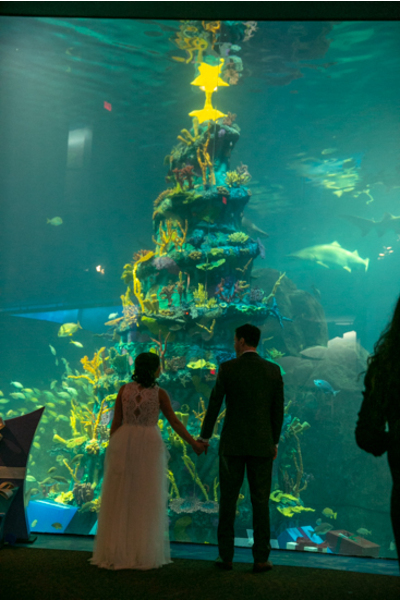 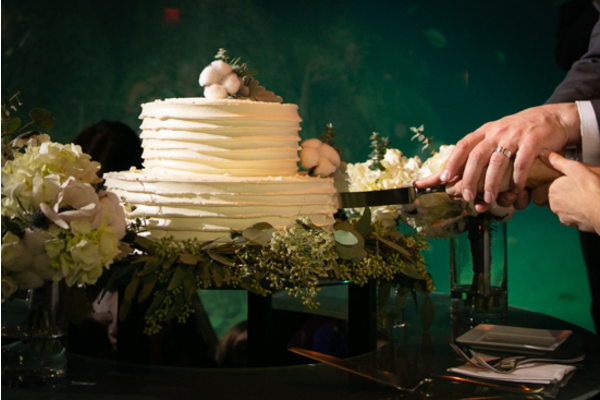 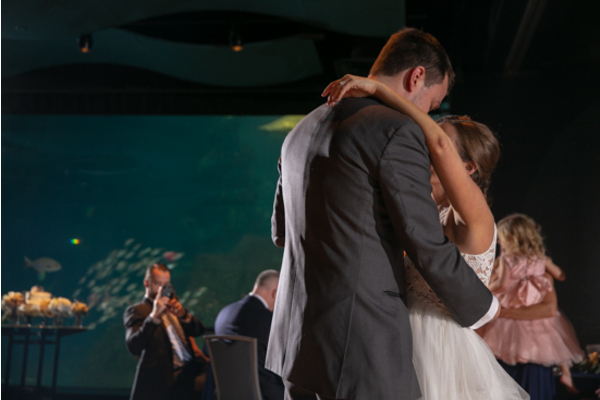 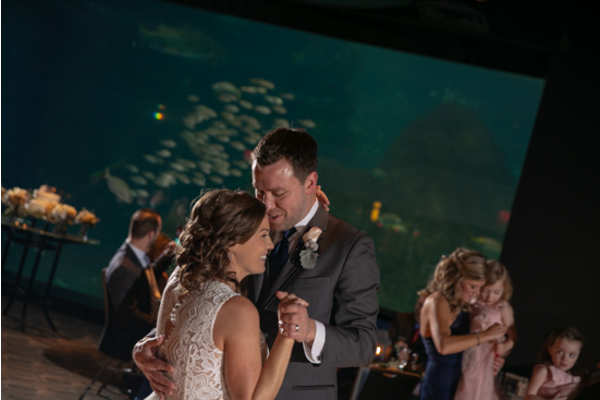 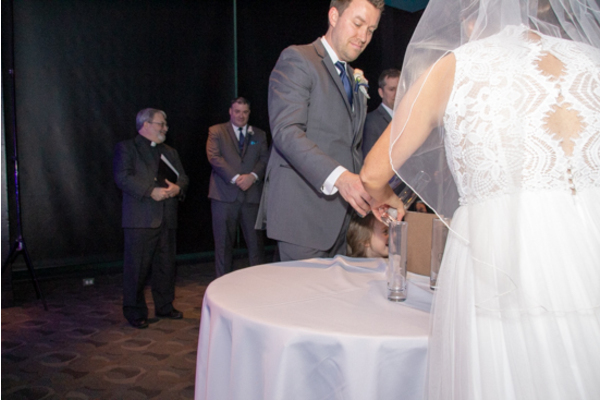 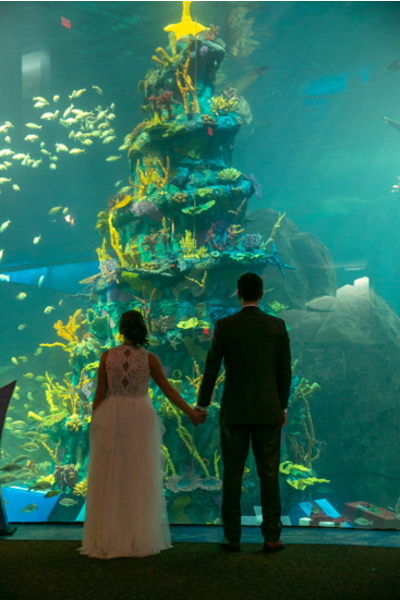 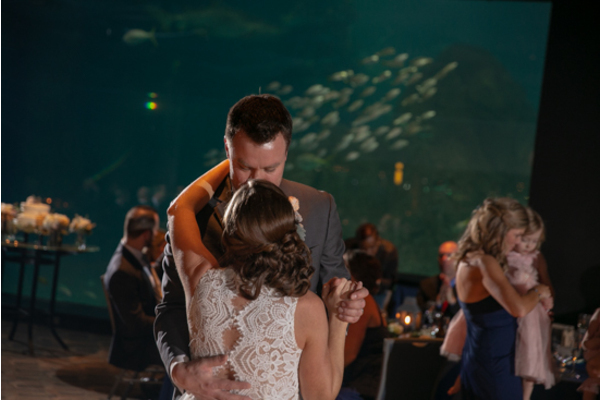 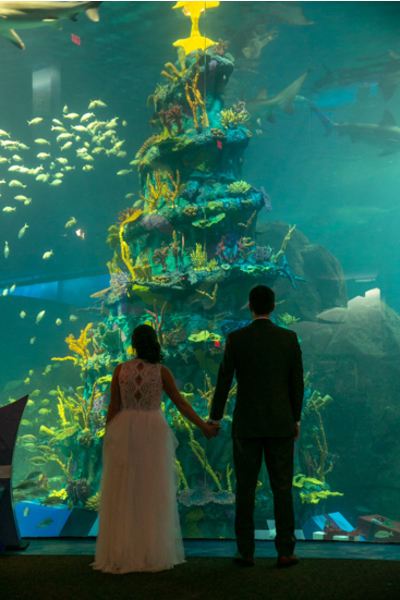 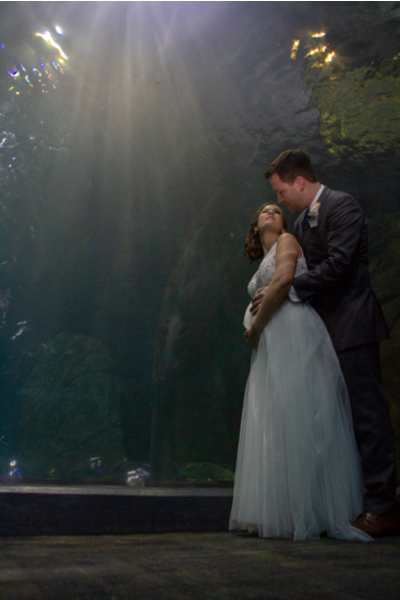 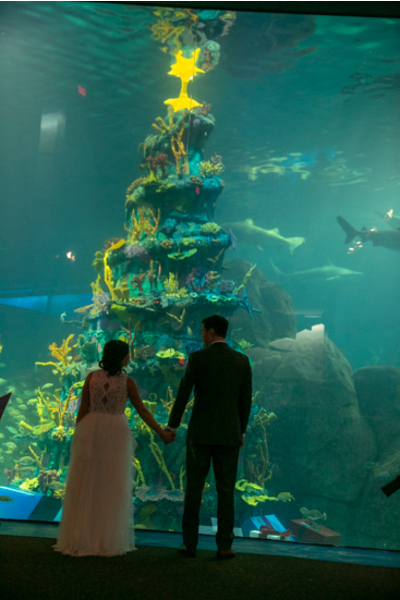 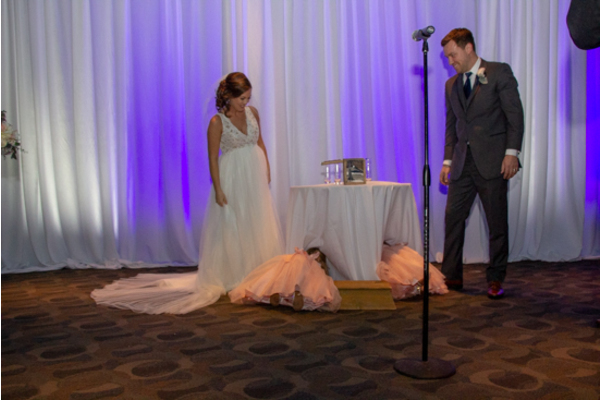 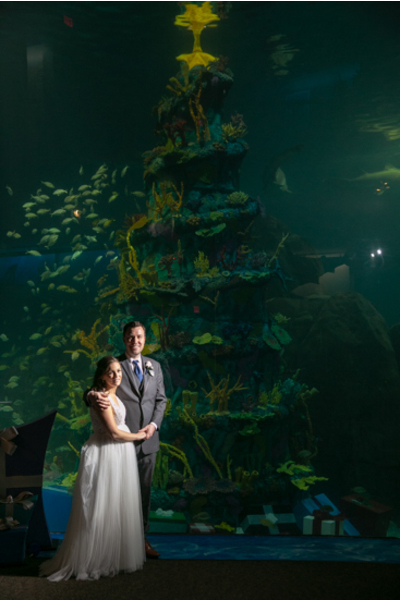 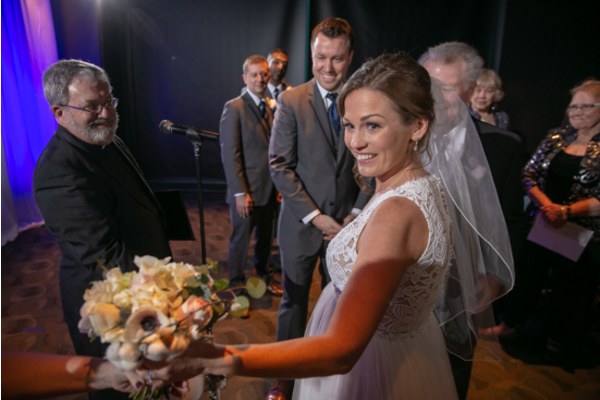 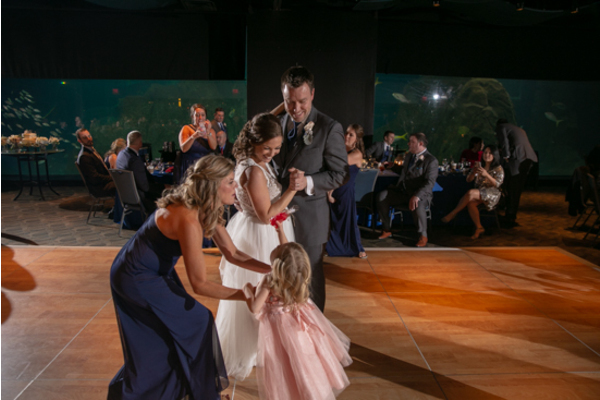 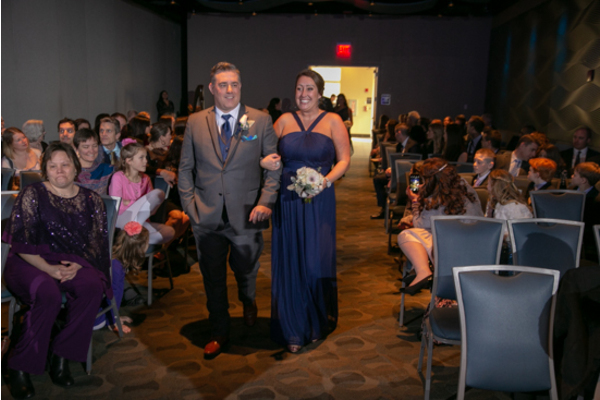 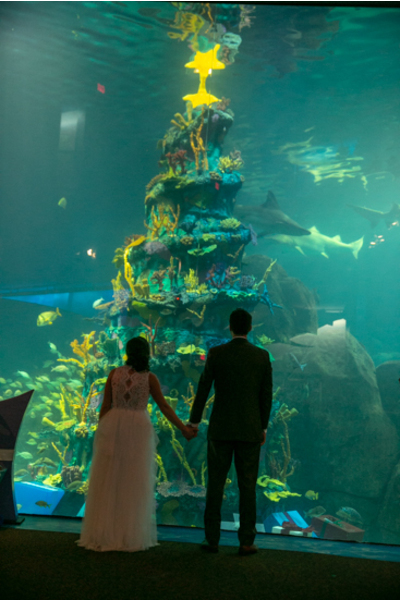 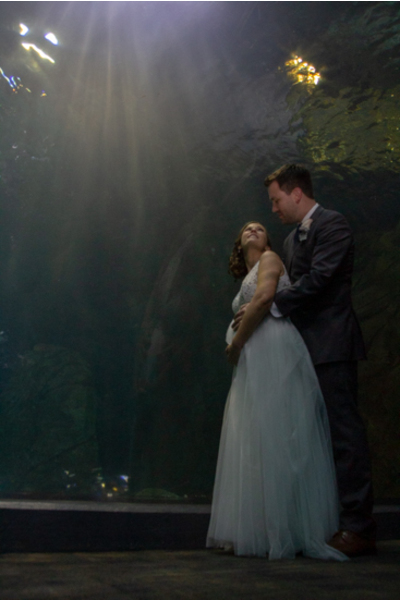 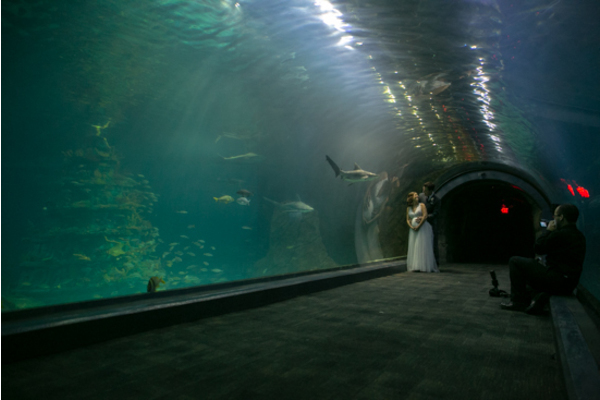 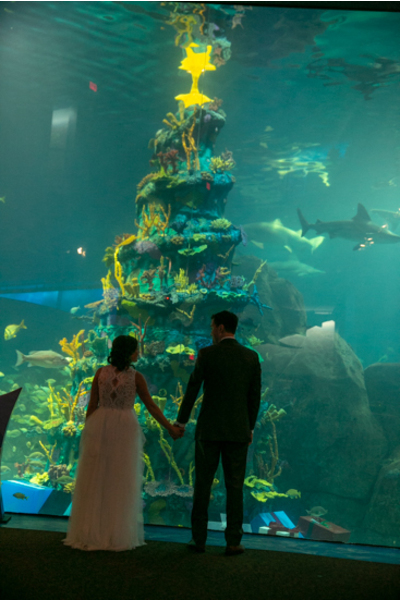 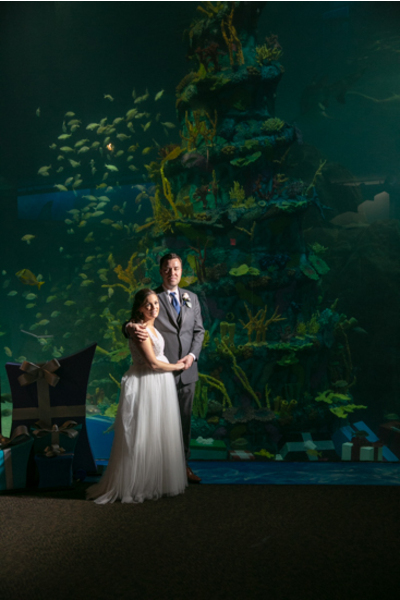 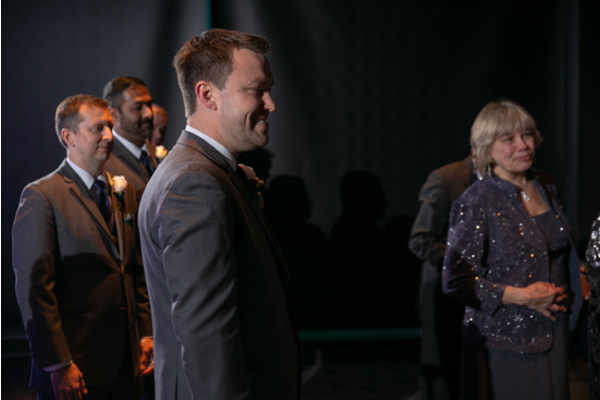 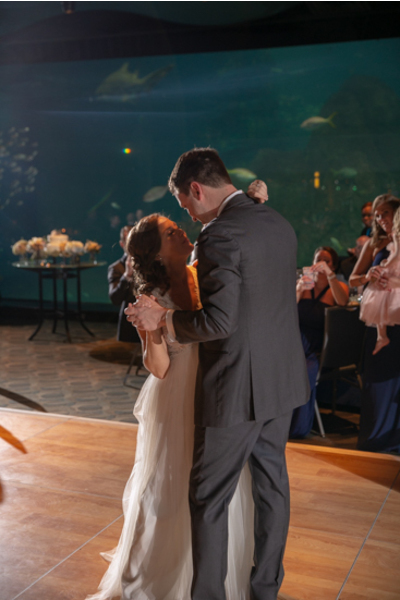 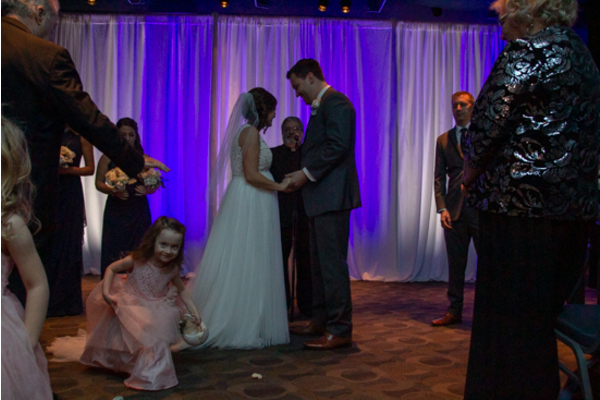 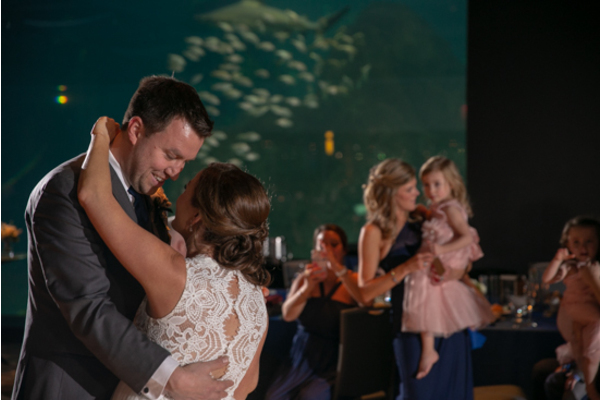 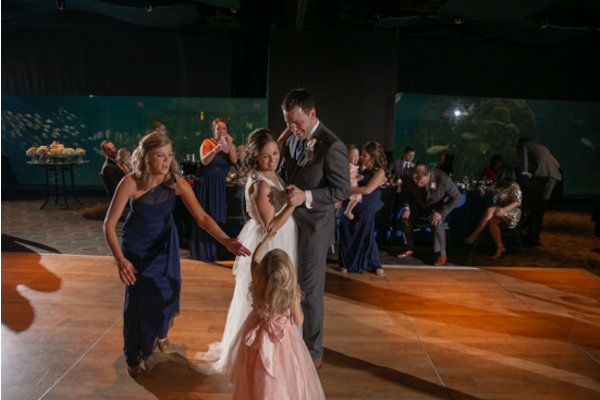 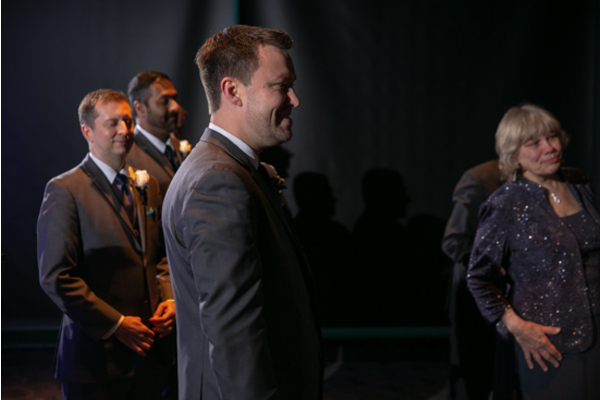 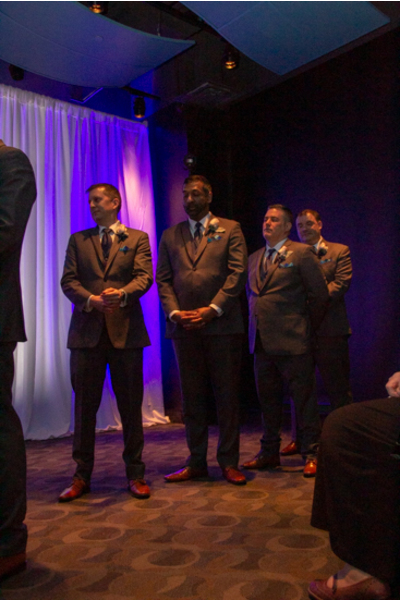 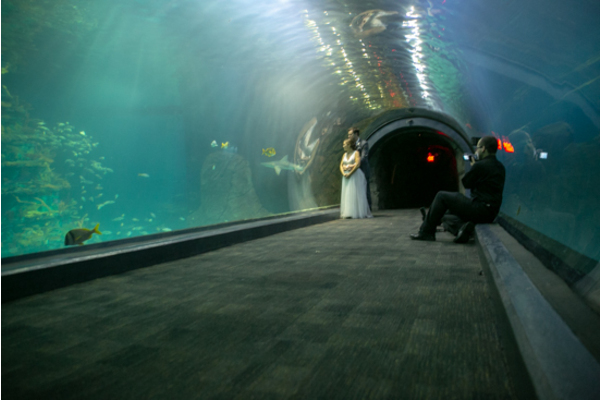 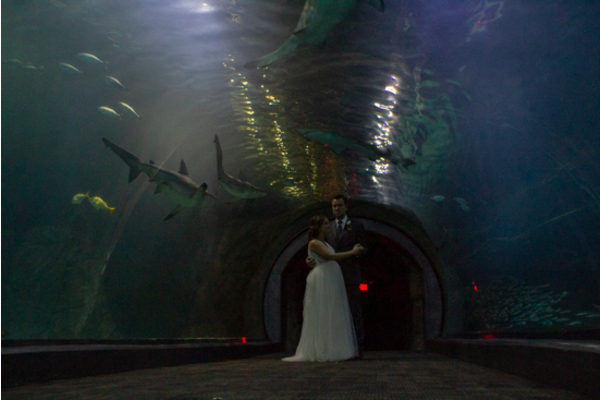 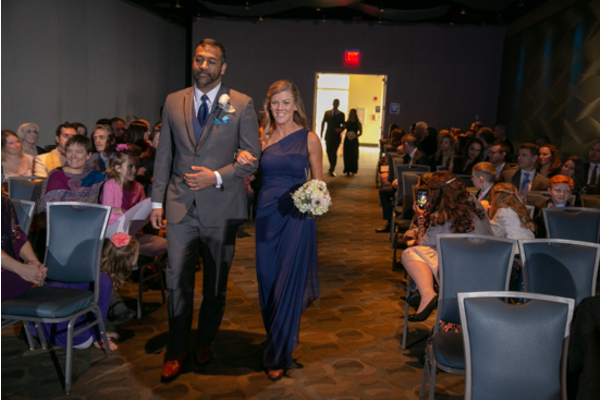 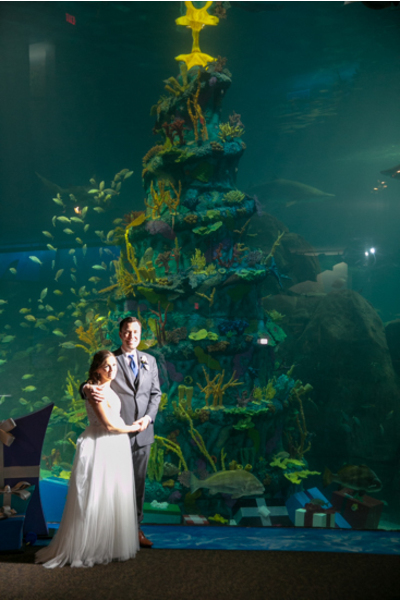 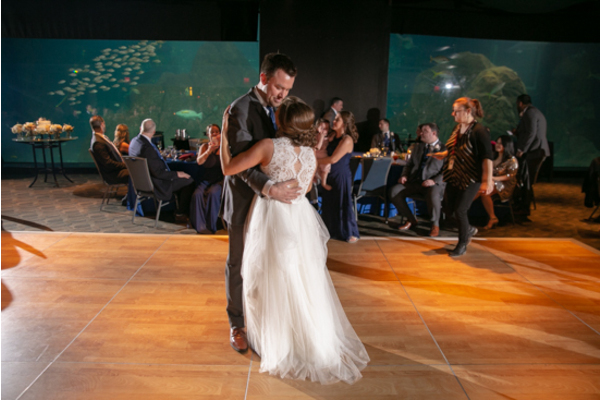 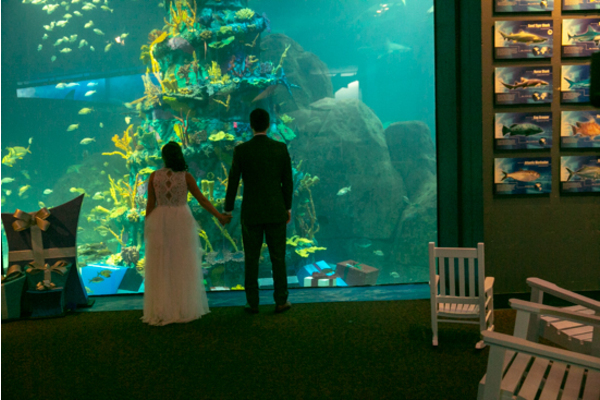 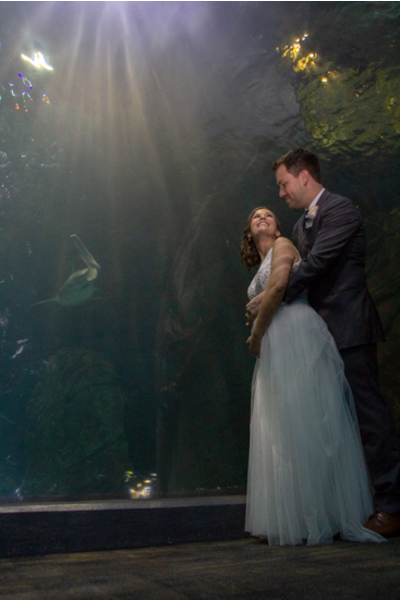 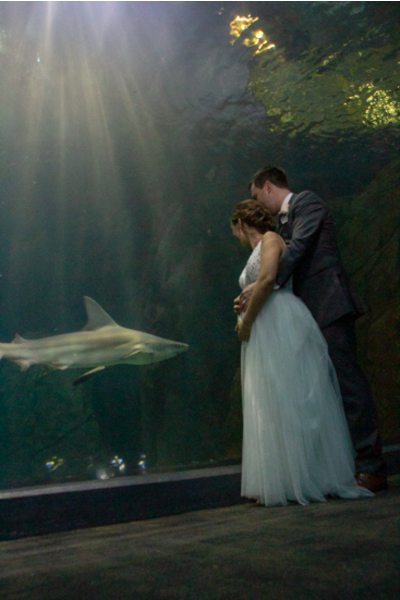 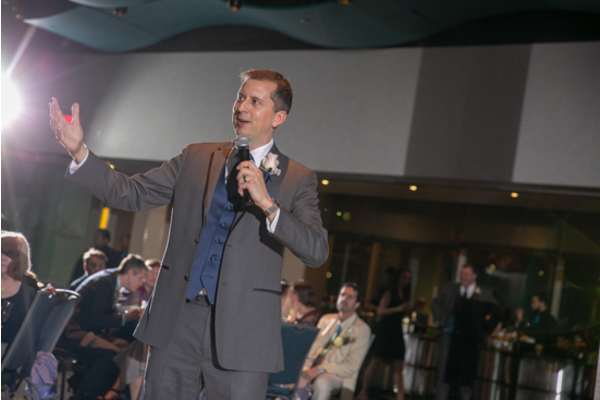 At this aquarium wedding, they were o-FISH-ally Mr. and Mrs! 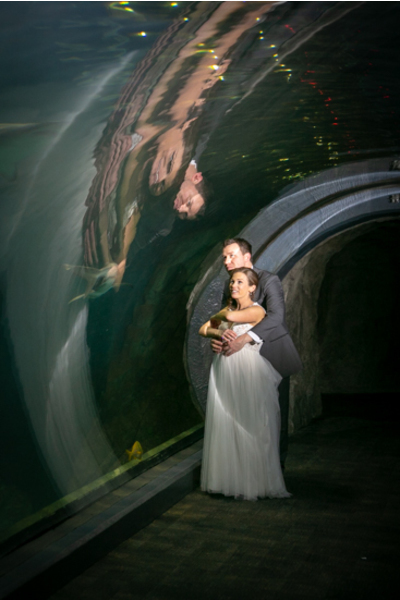 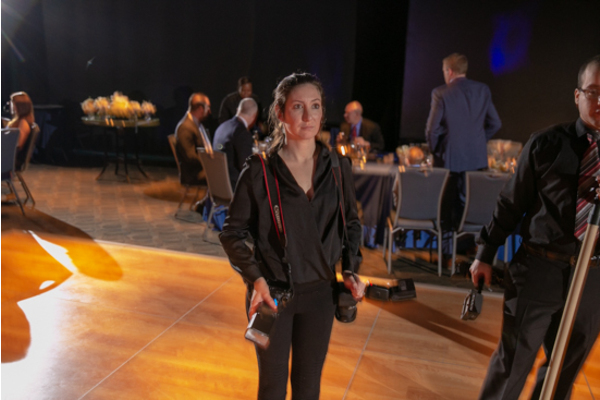 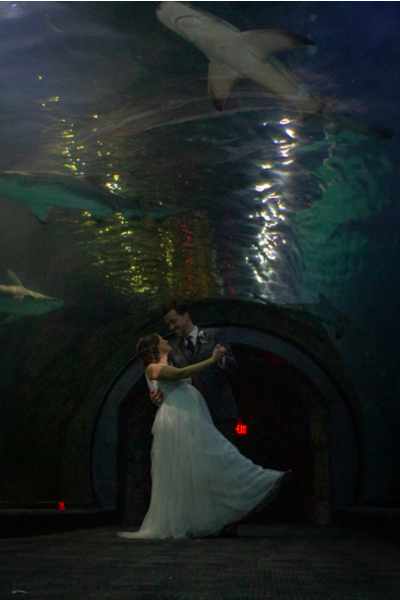 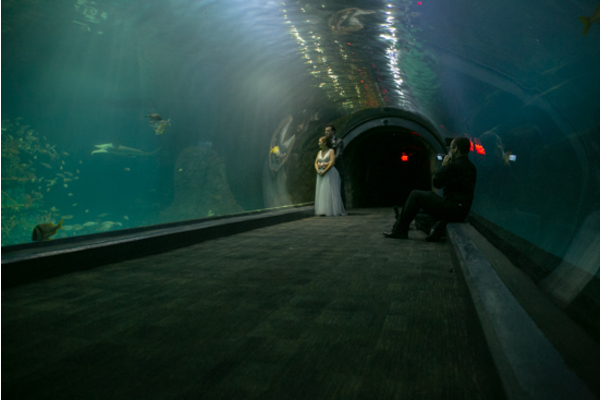 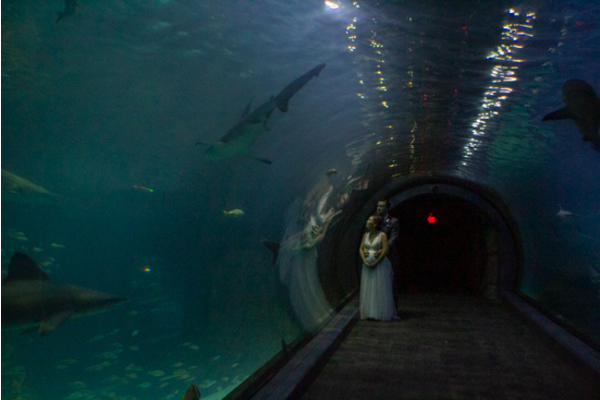 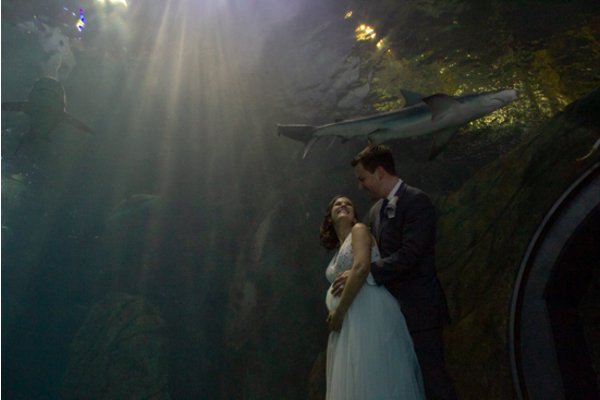 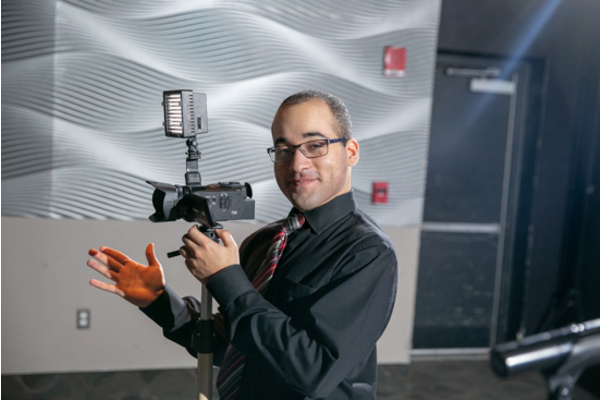 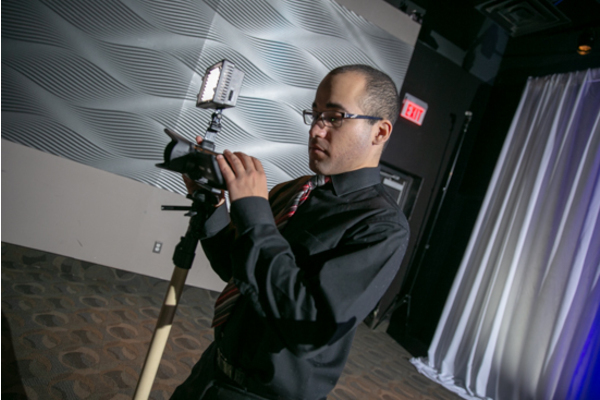 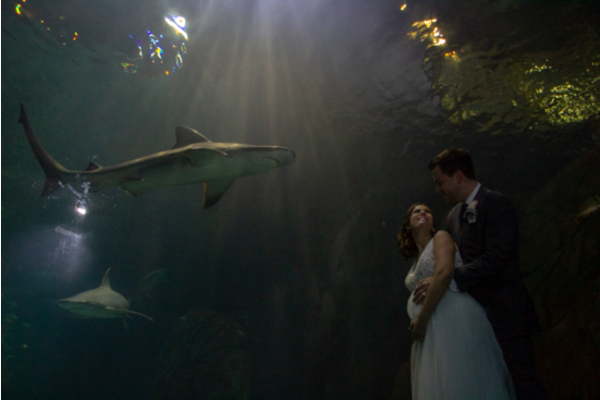 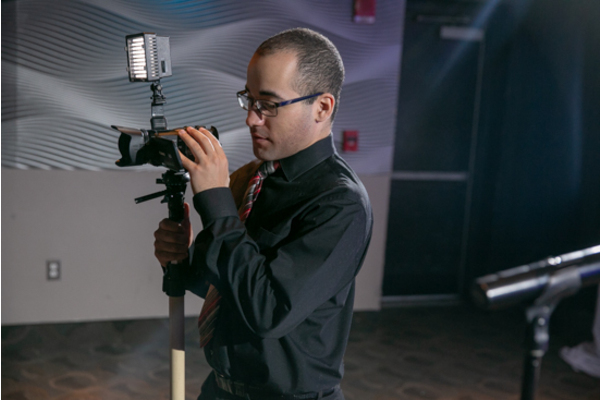 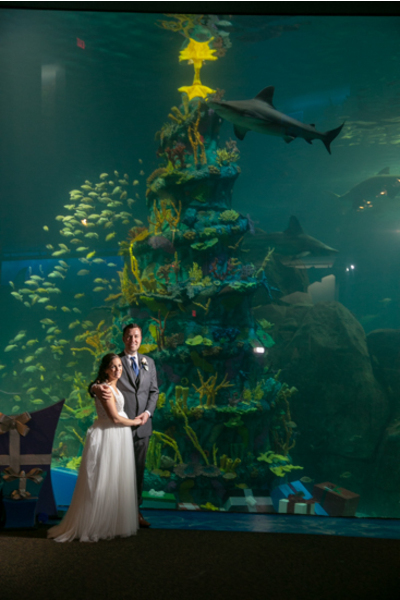 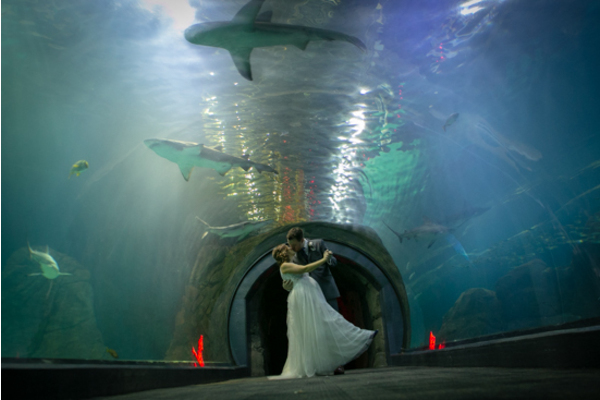 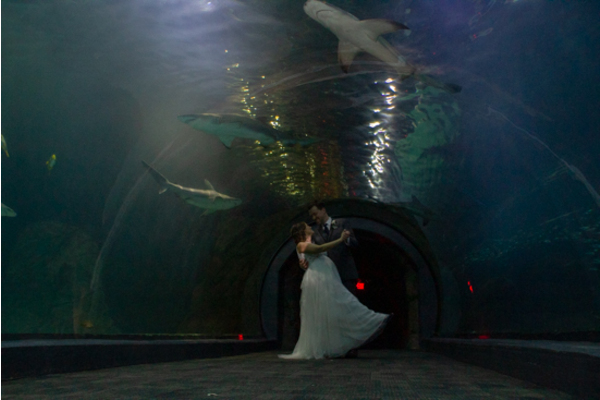 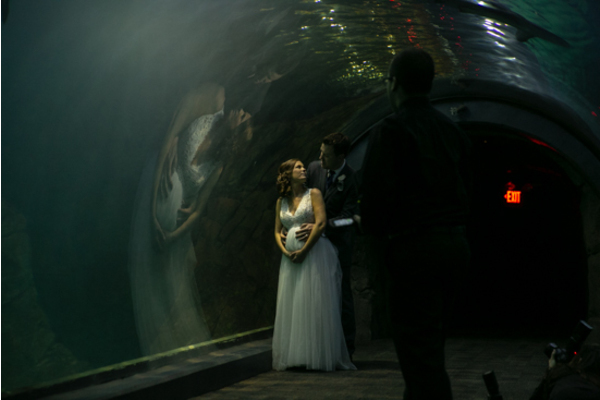 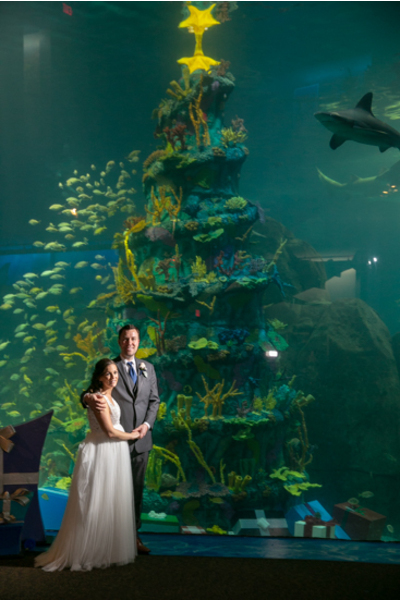 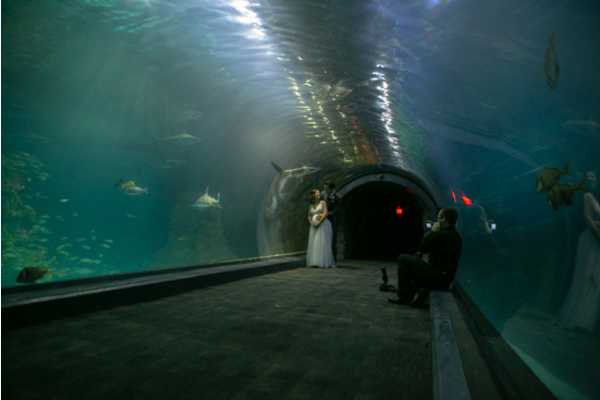 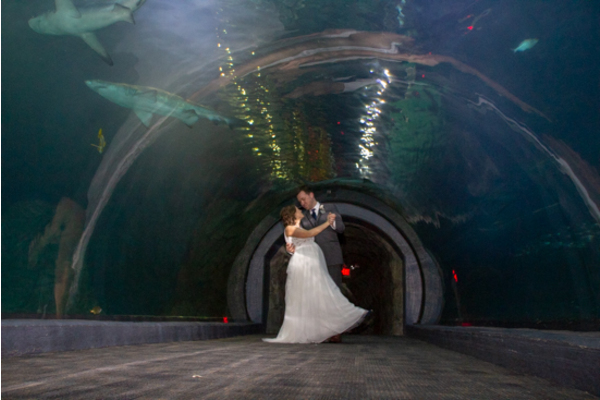 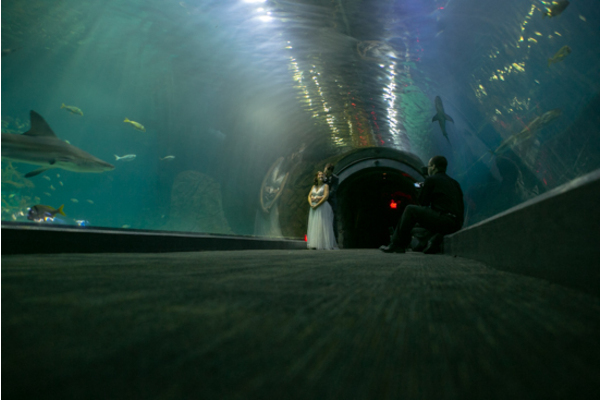 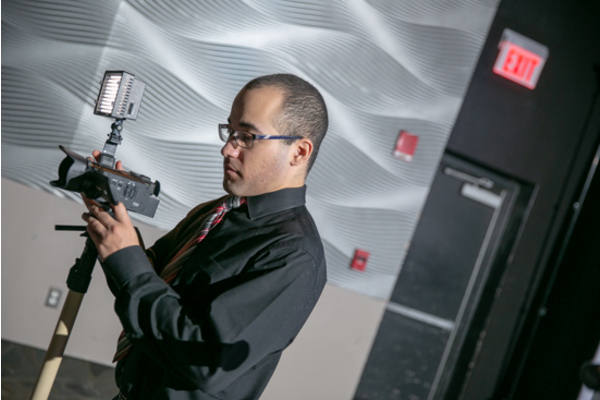 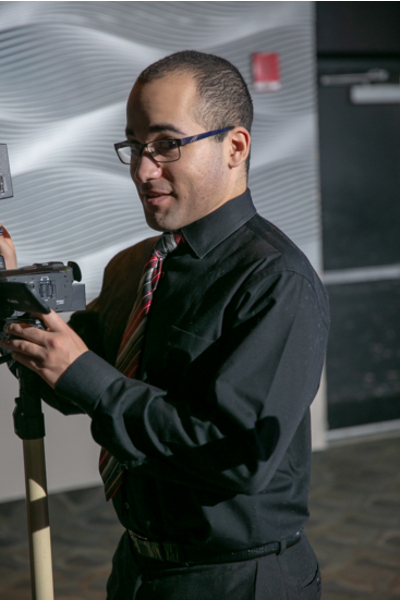 Prior to the reception, they took more photos with our NJ Wedding Photographer underneath a cool shark tank. 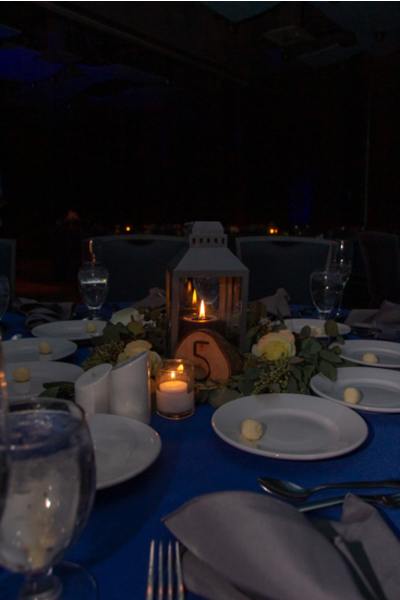 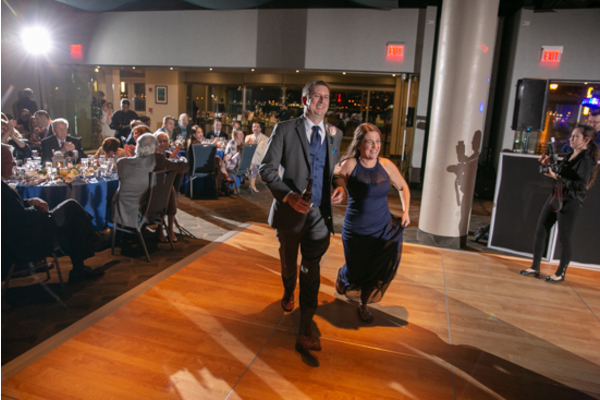 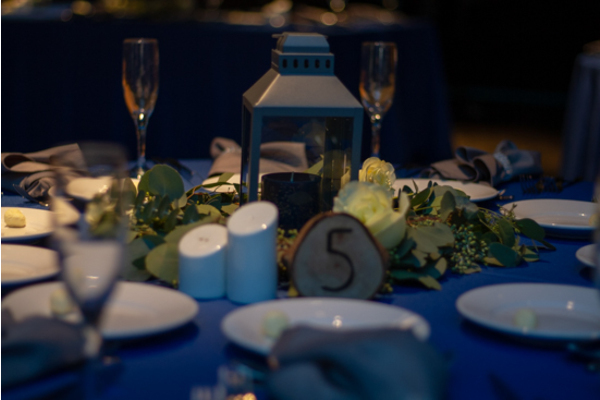 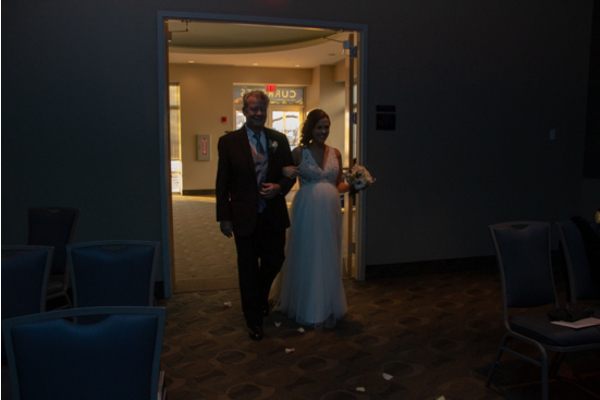 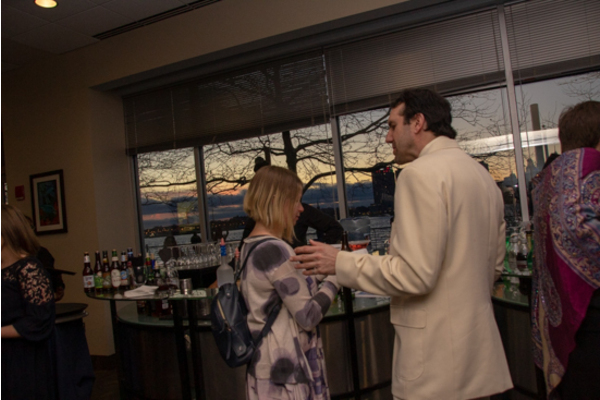 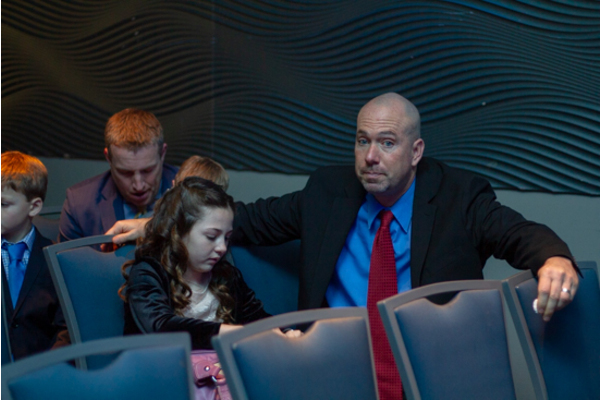 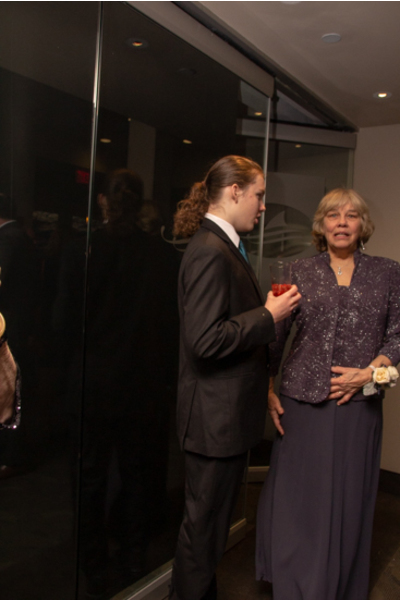 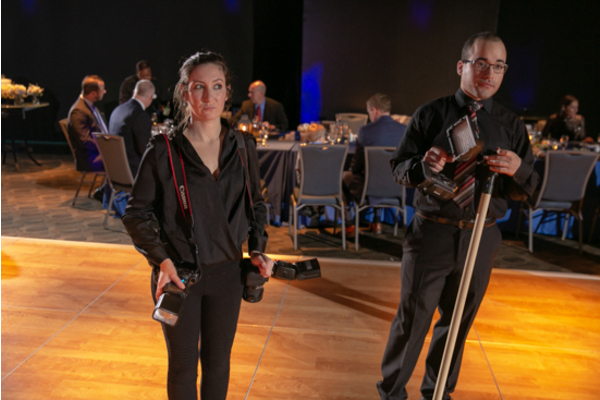 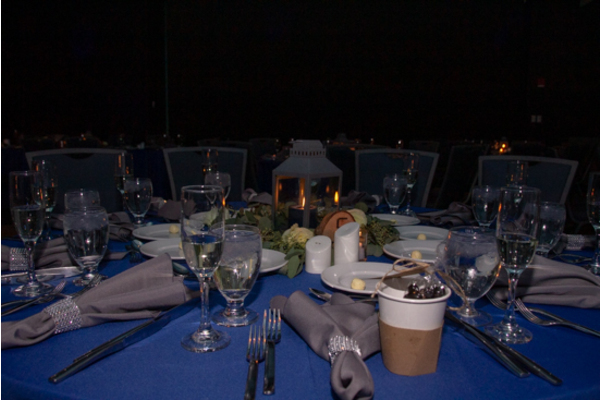 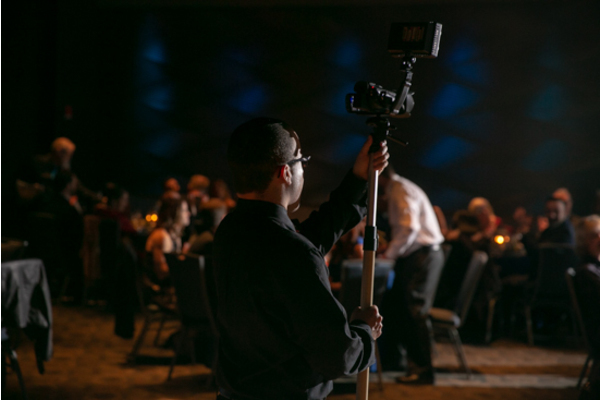 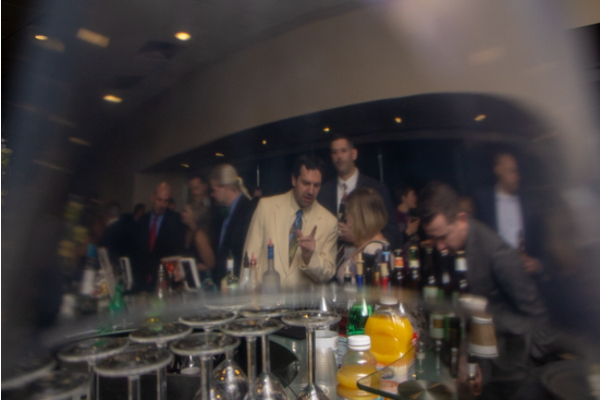 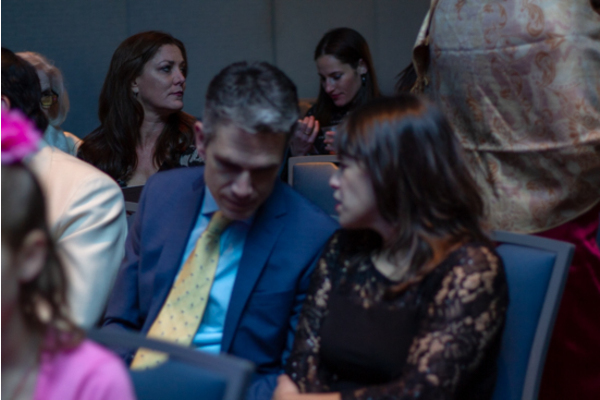 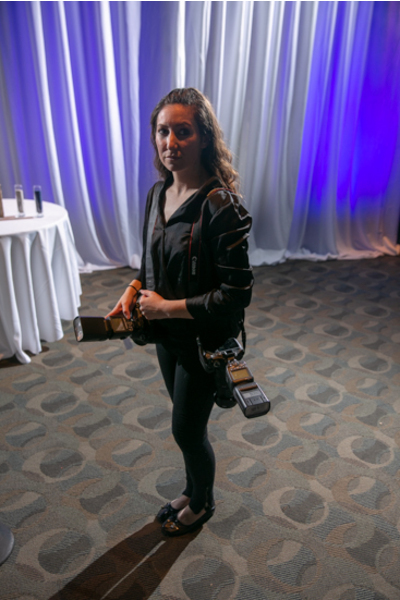 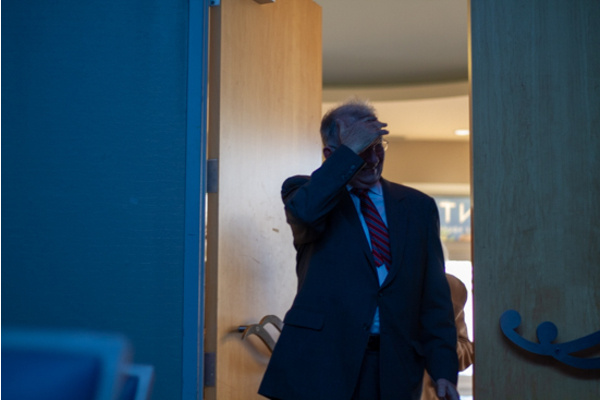 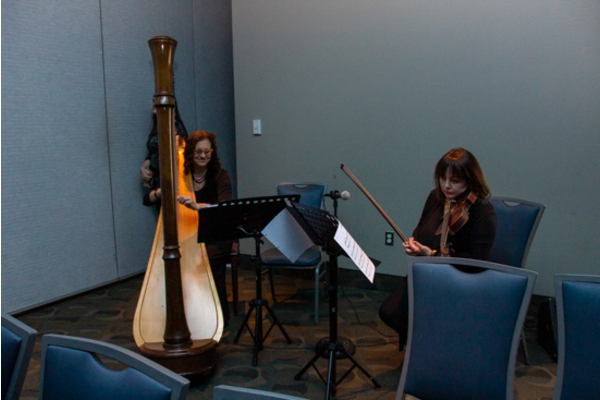 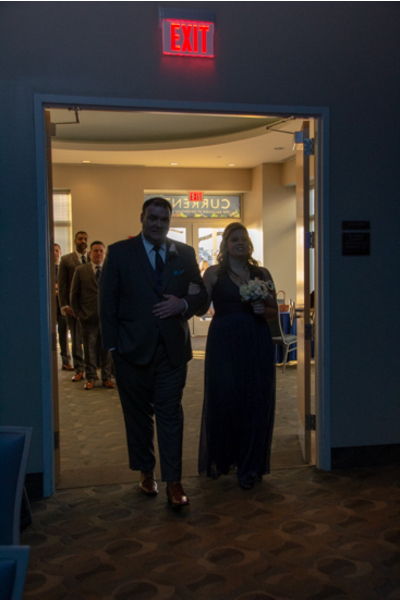 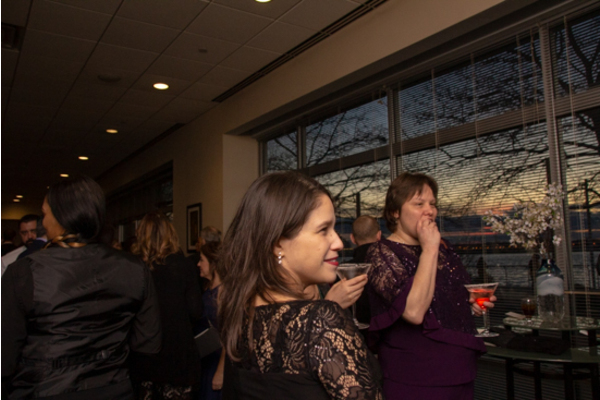 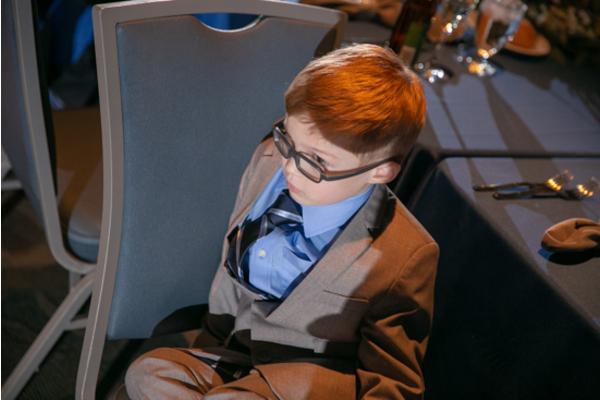 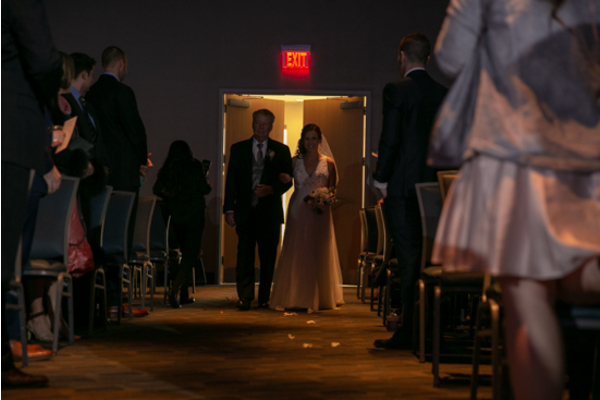 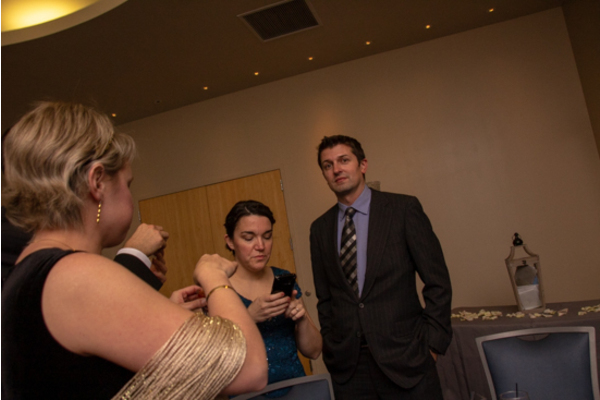 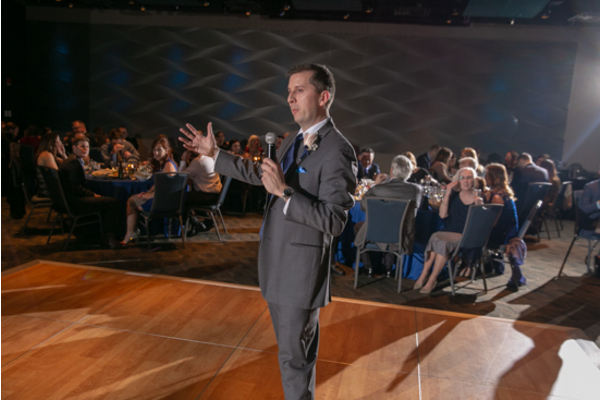 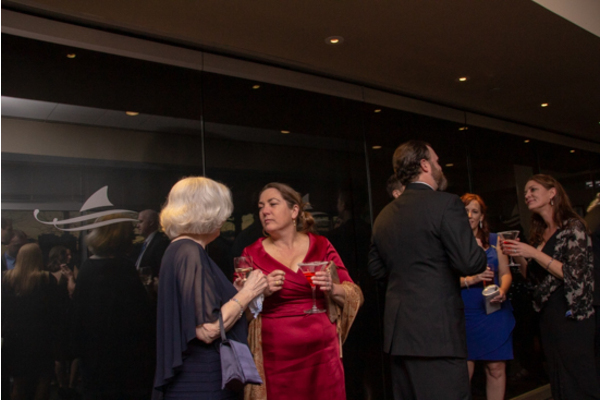 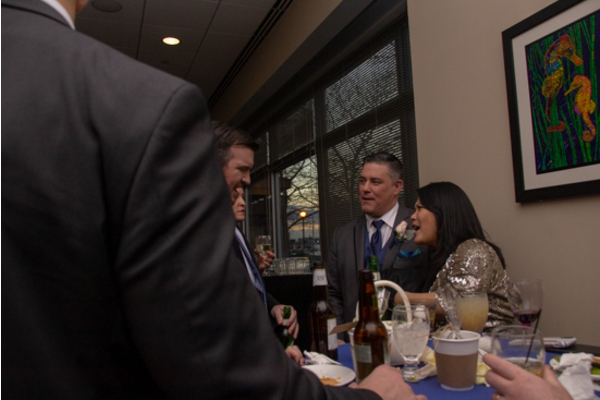 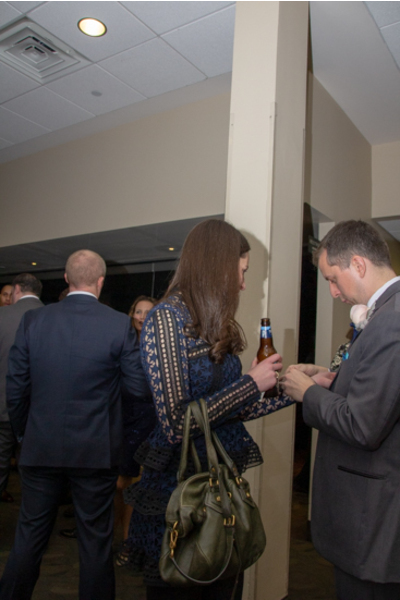 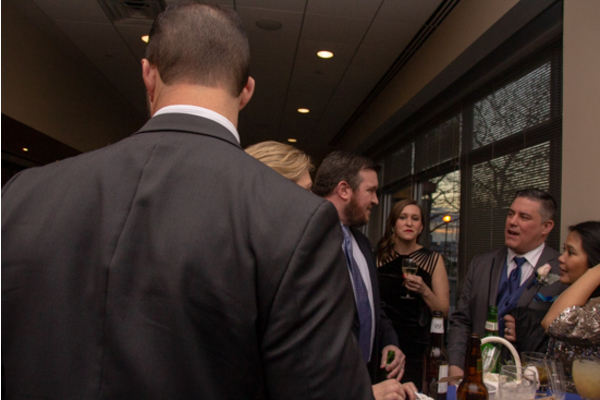 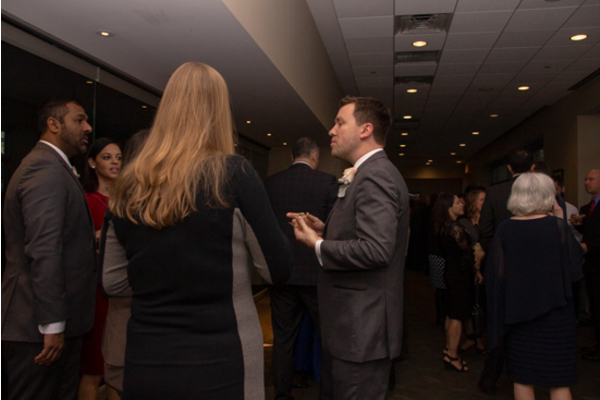 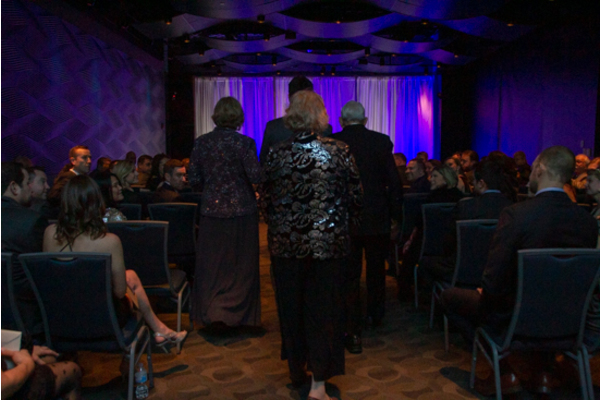 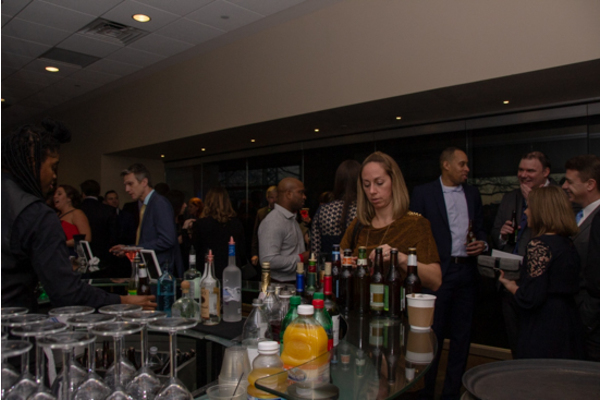 The reception room was also decorated with the same blue lighting throughout the room. 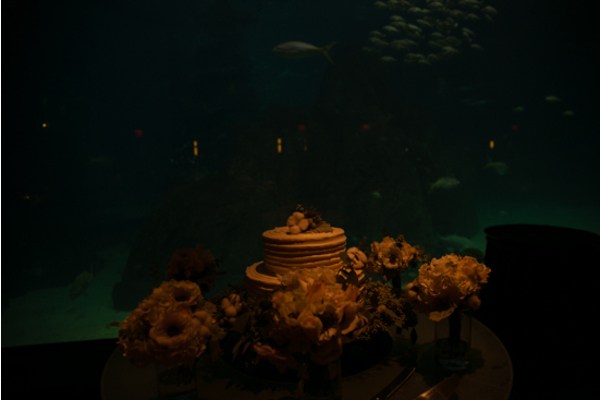 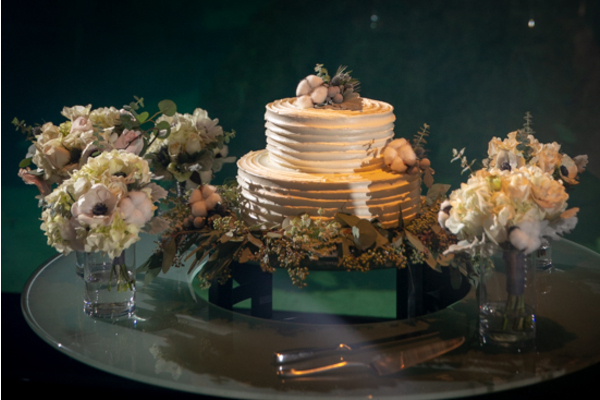 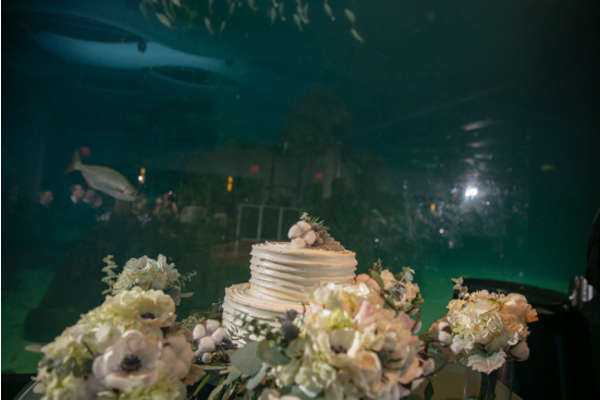 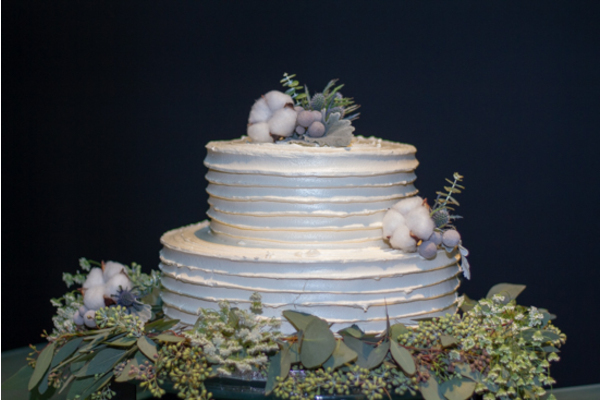 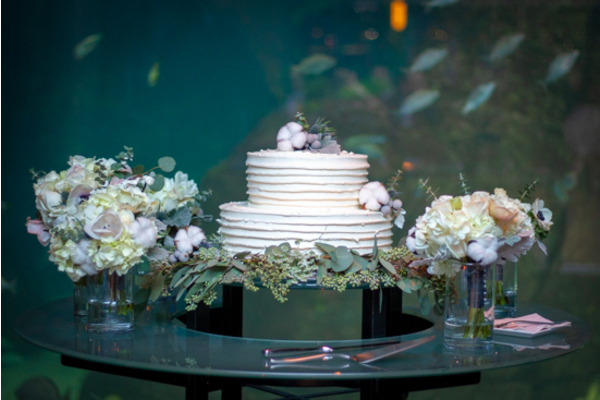 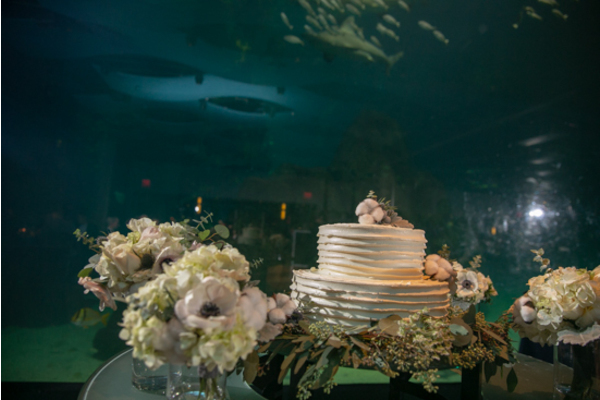 Their simple white floral wedding cake display looked beautiful in front of the fish tank. 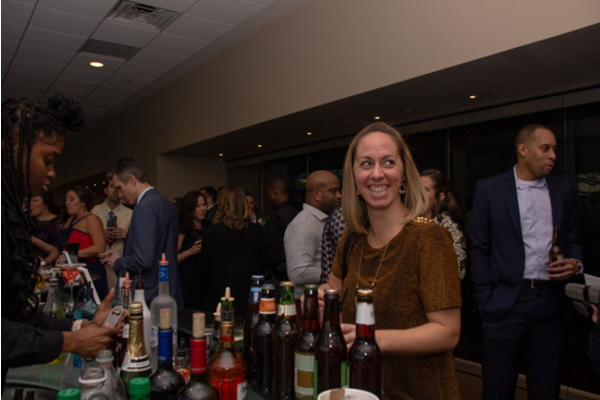 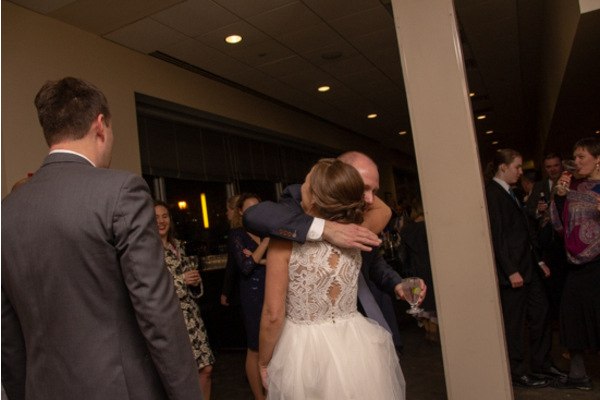 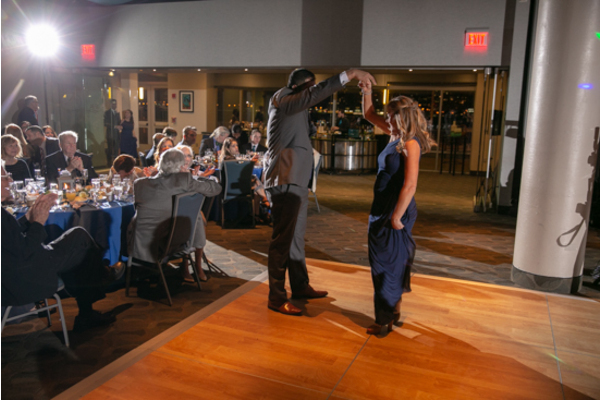 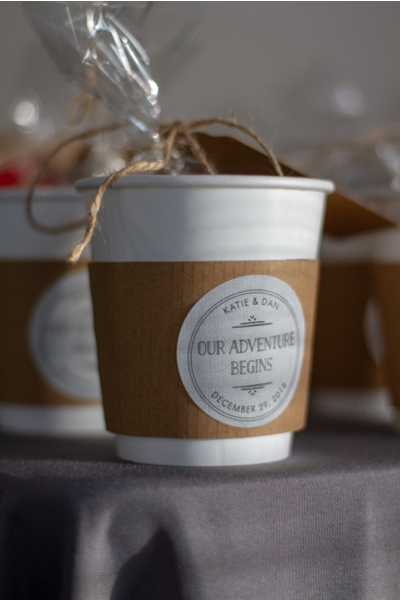 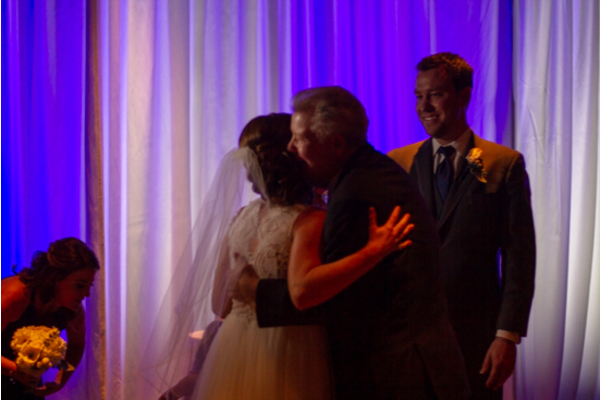 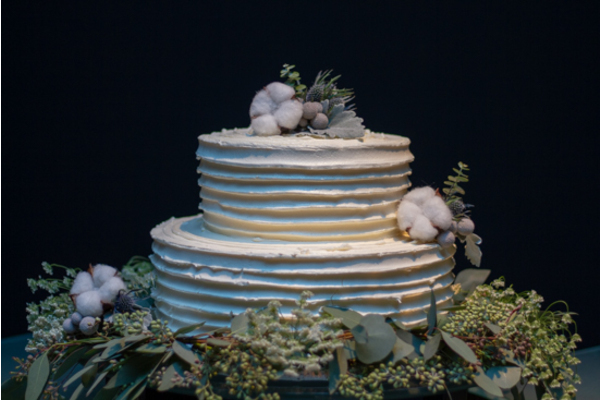 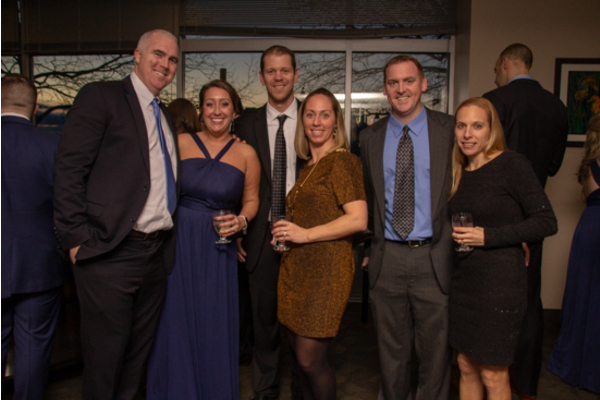 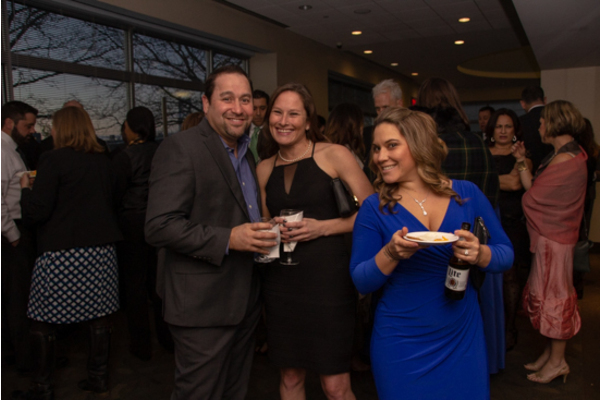 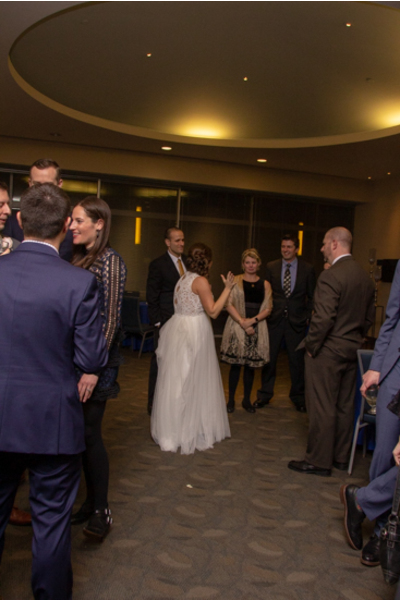 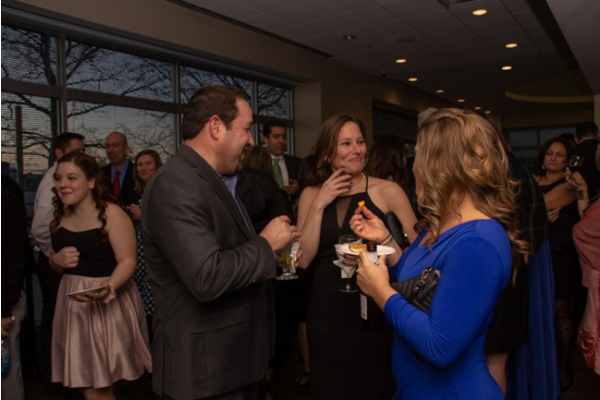 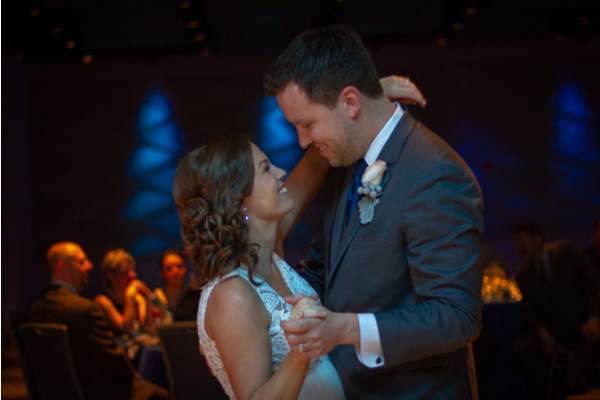 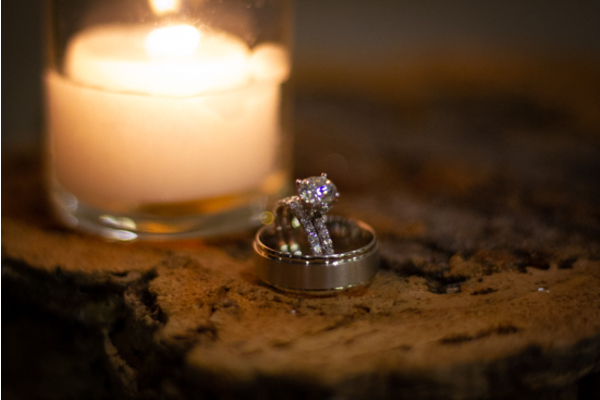 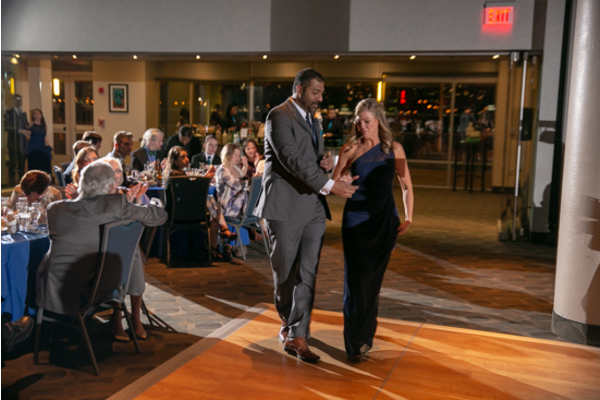 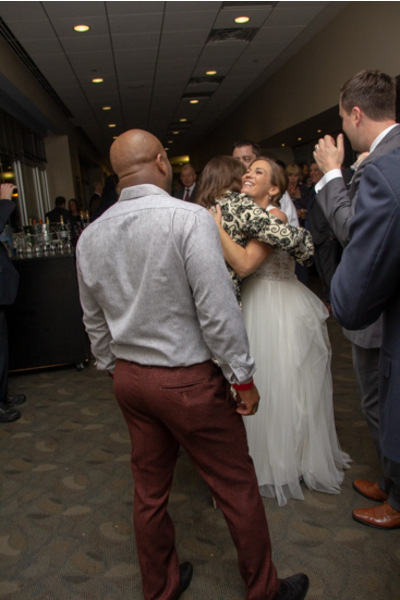 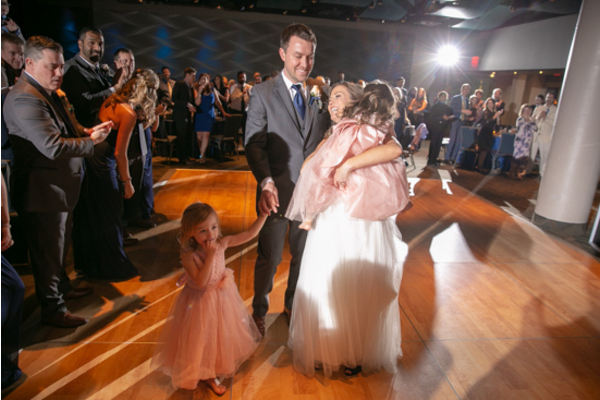 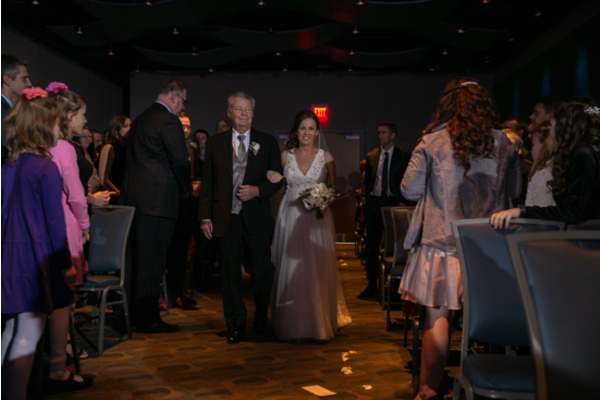 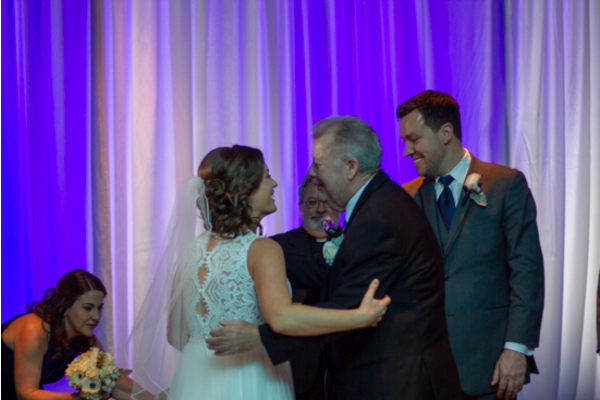 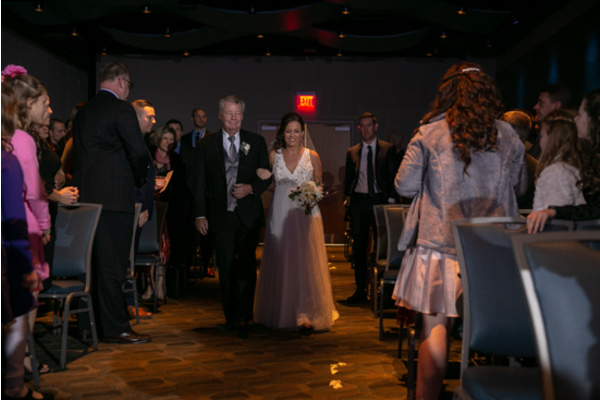 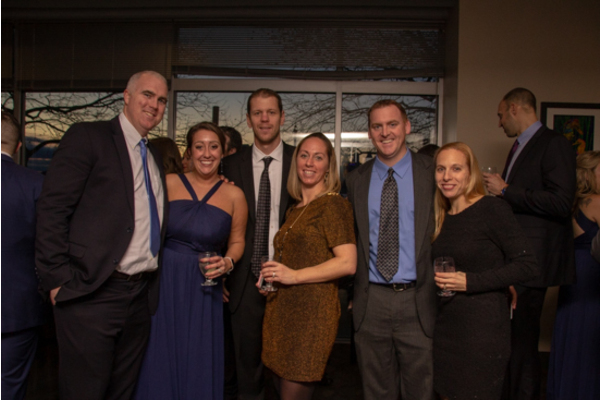 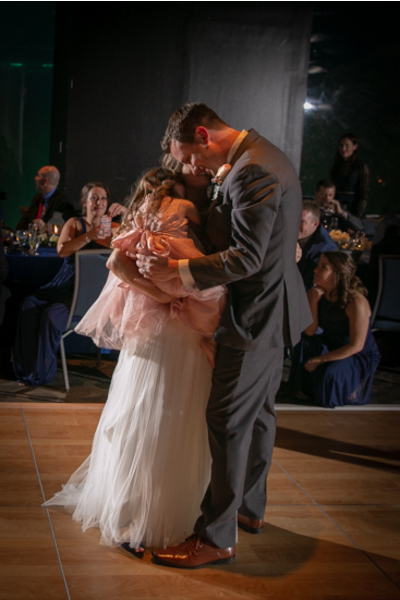 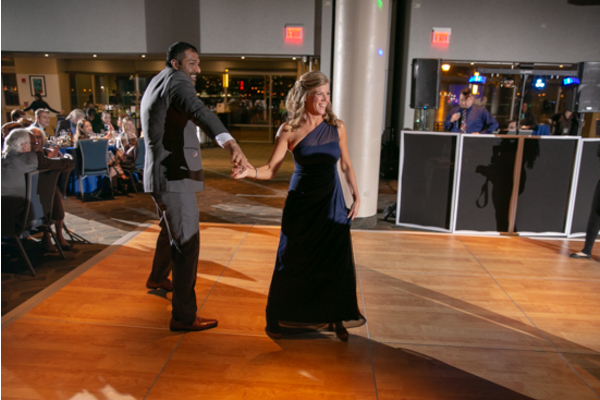 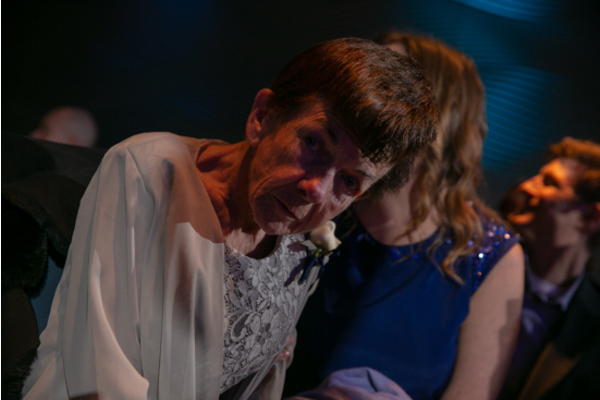 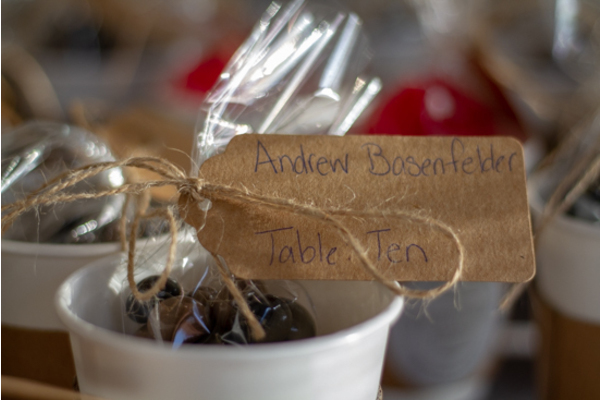 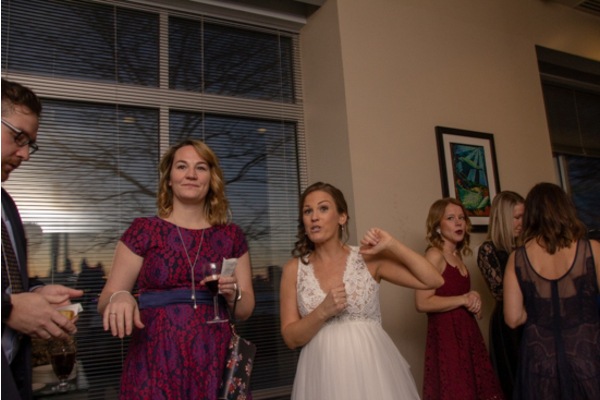 Loved ones spent the evening dancing, eating delicious treats, and celebrating the beautiful couple all night long! 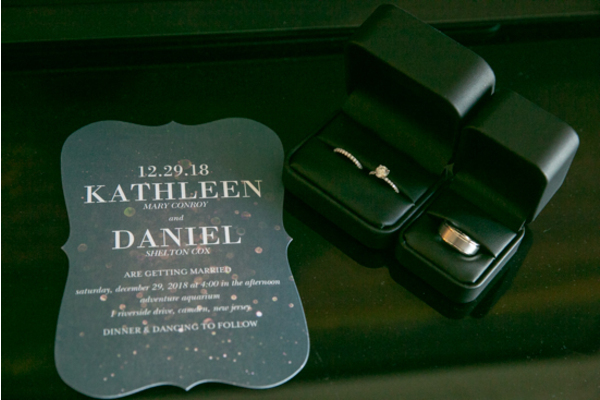 Congratulations once again to Katie and Dan. 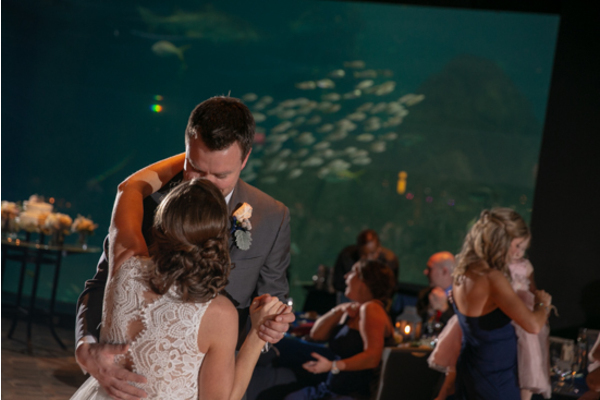 We are so happy that you two lucky fish found each other in the sea!